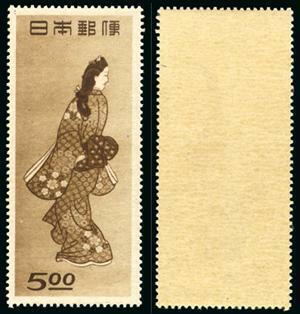 Click on the category below that you wish to see or scroll down the entire list. 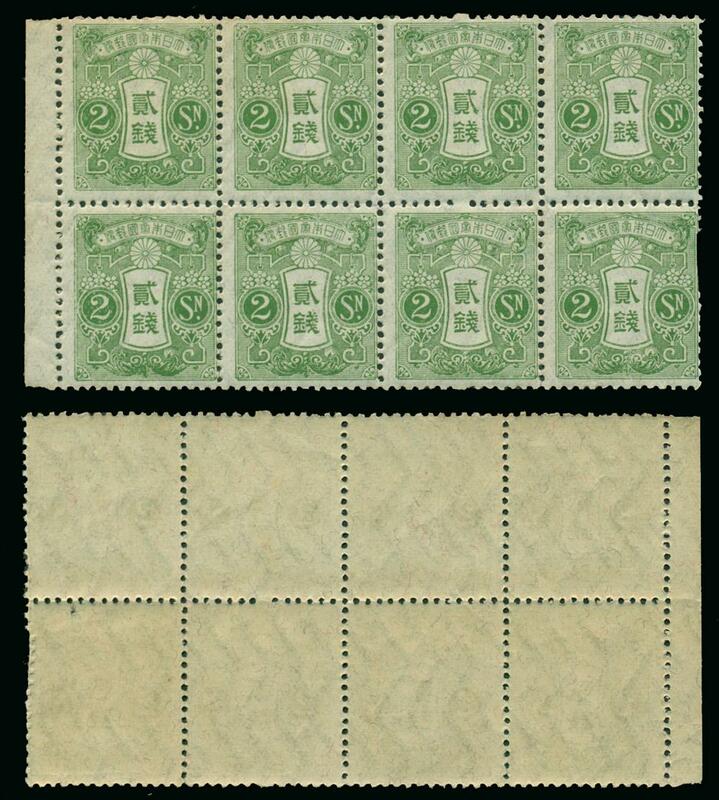 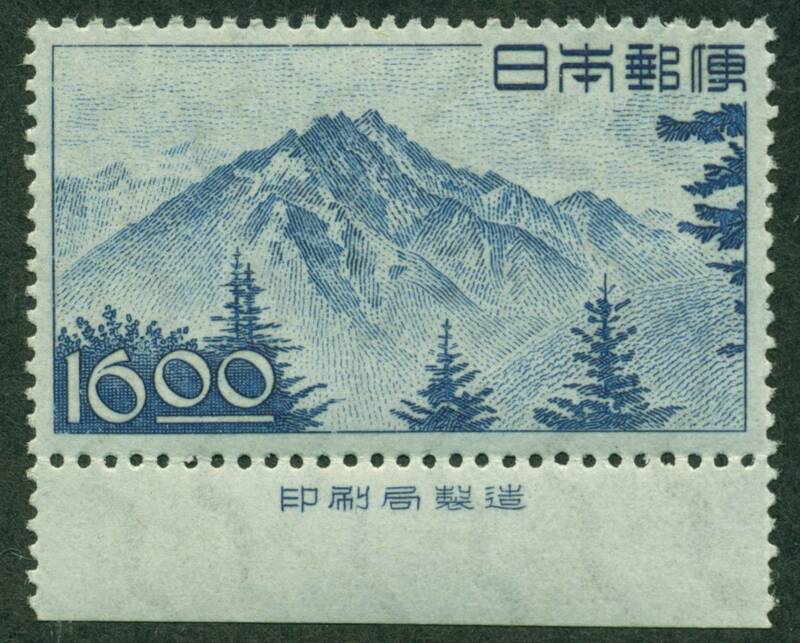 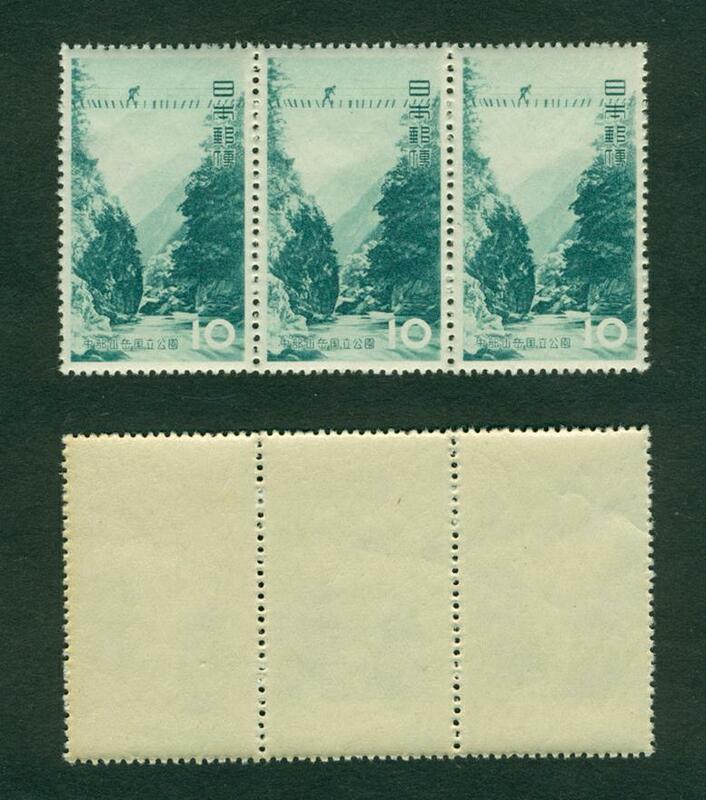 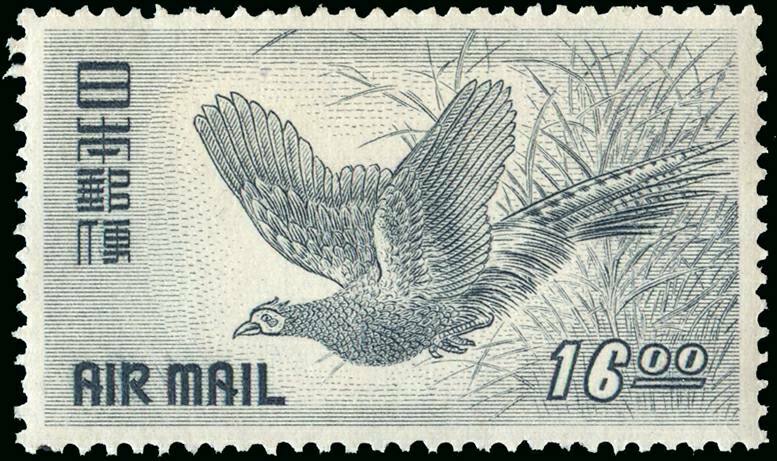 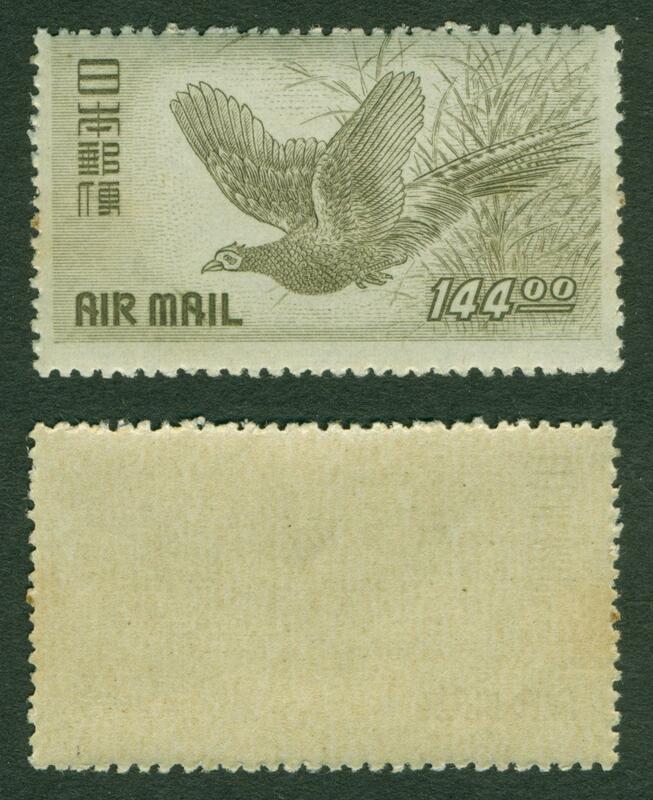 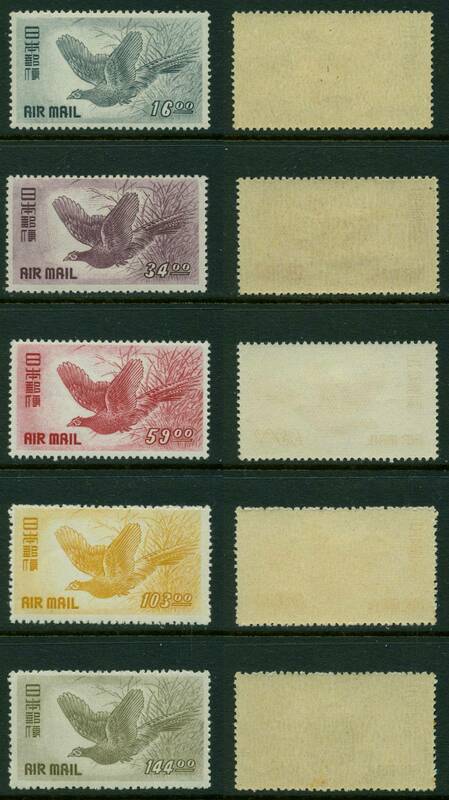 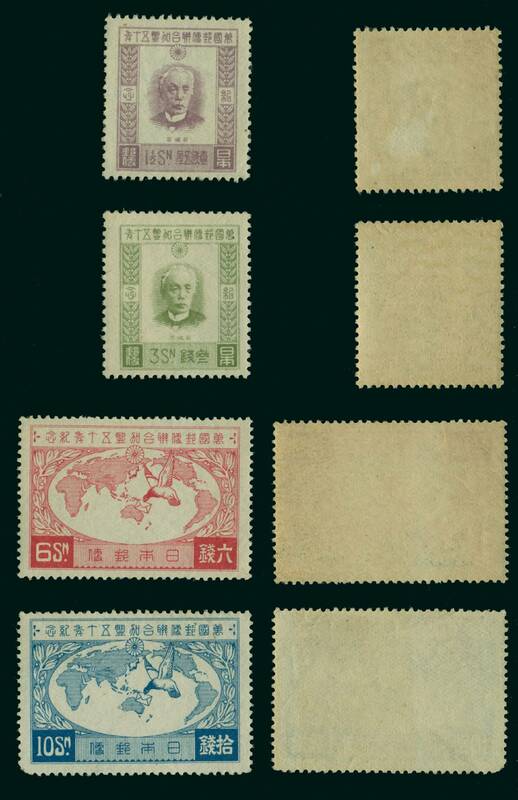 All Stamps are MNH, F-VF Minimum, Unless Otherwise Noted. 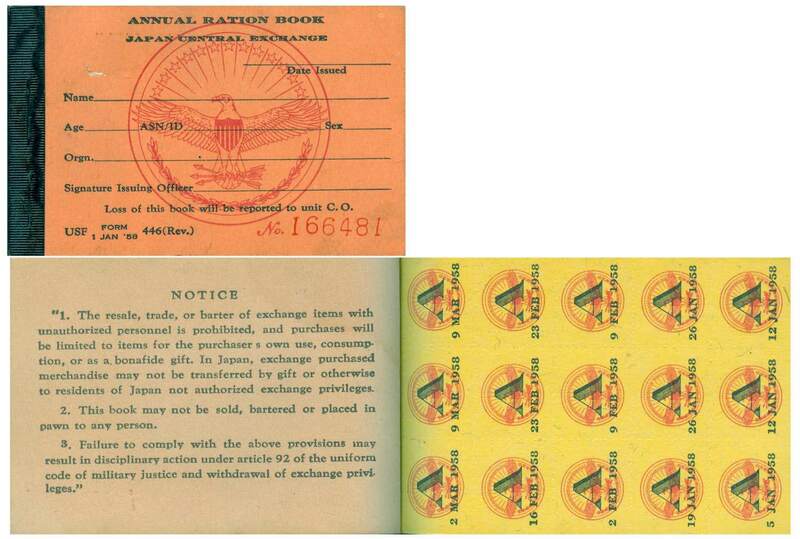 Prices are in whole dollars. 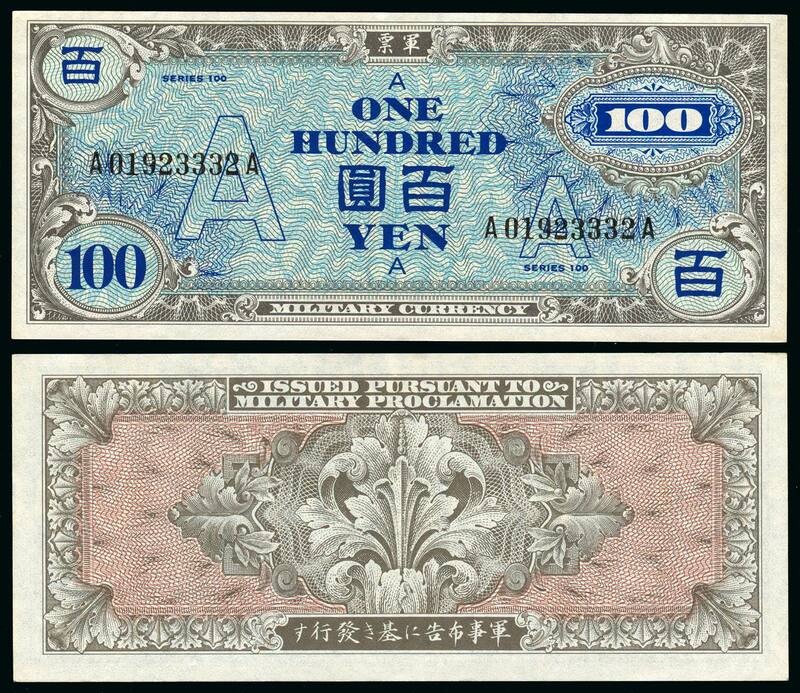 For example 10 means $10.00 US. 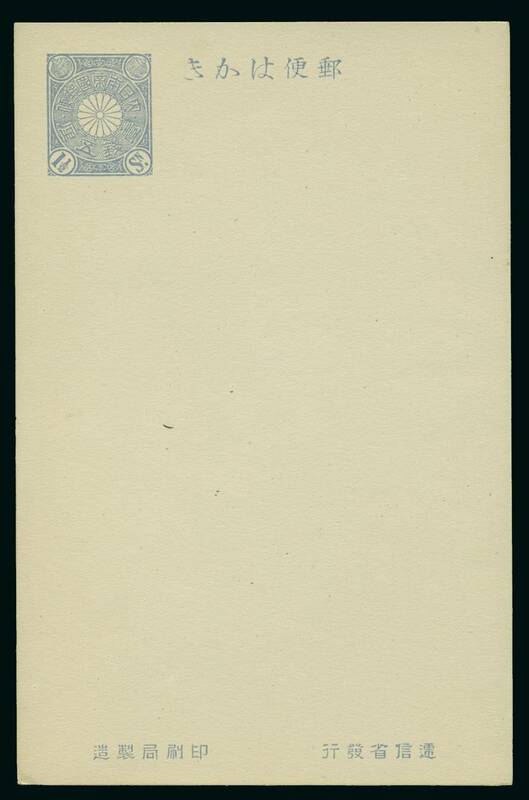 noted as "Net." However, they do figure into the total in determing the discount that will apply on other material ordered at the same time. 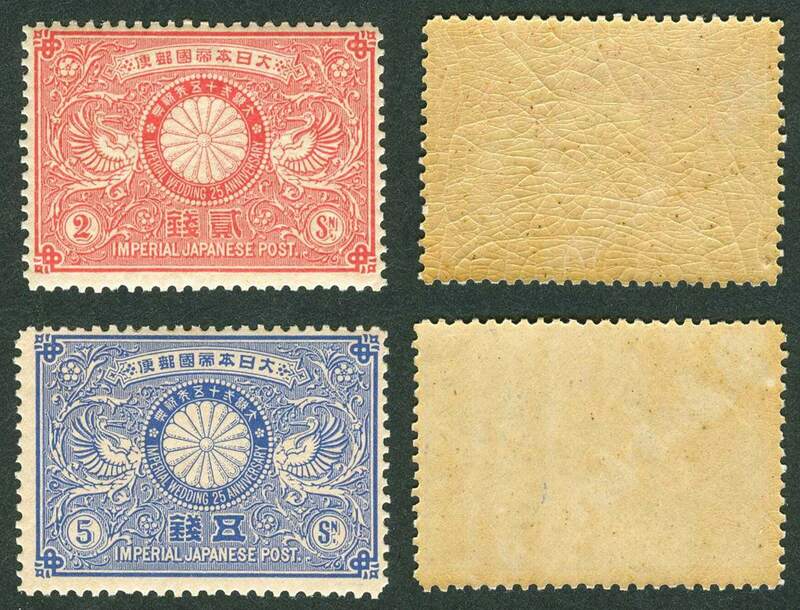 with date inverted, reads "86" but is actually "98"
432 & 442             For information on these two very similar stamps, click here. 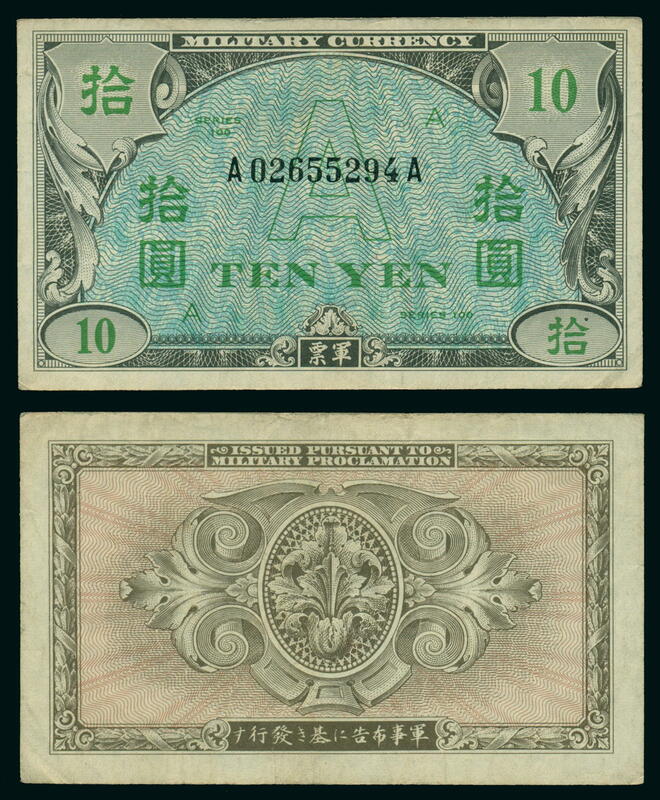 10 times higher than type I. 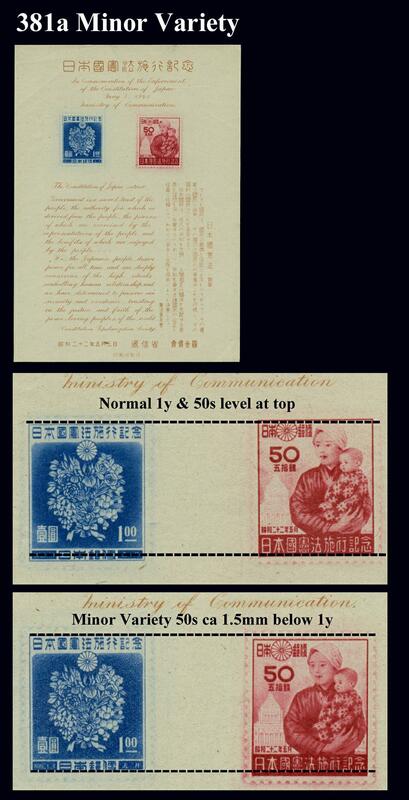 To see the differences, click here. 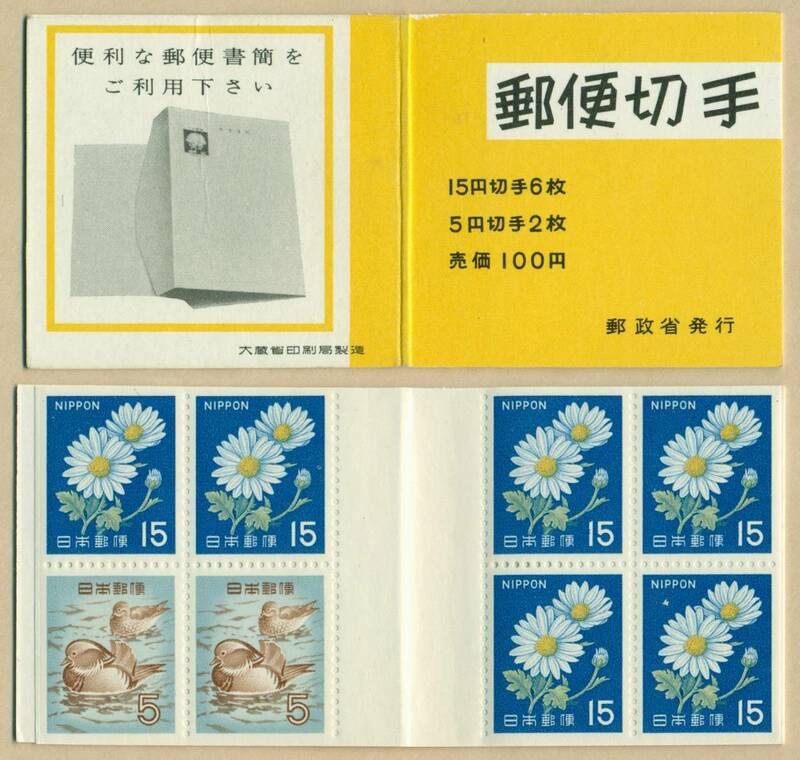 881d  Bklt             $10     B31     1967    Flowers with blue numerial "15"
914e   Bklt            $40     B33     1967    Flowers with white numerial "15"
Printing Bureau of the Japanese Ministry of Finance." 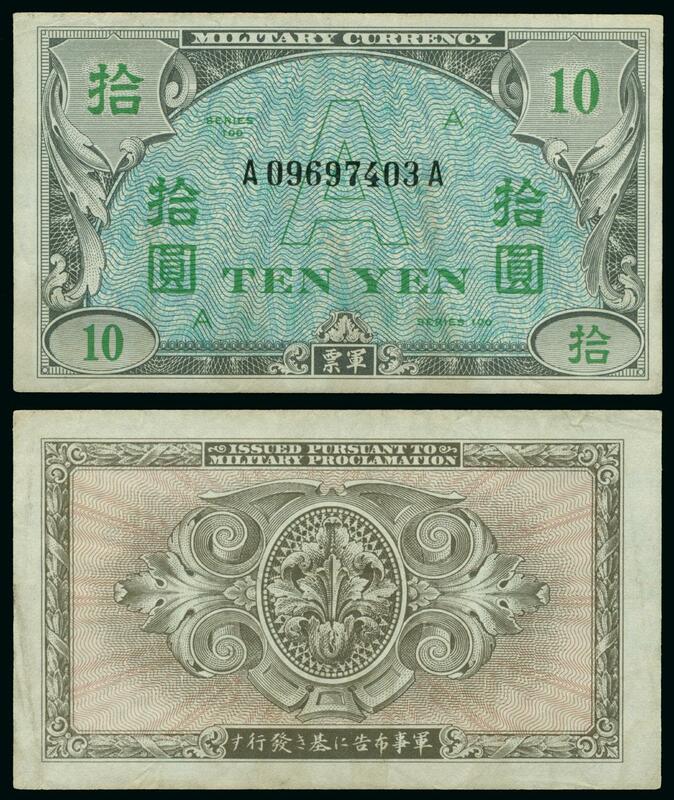 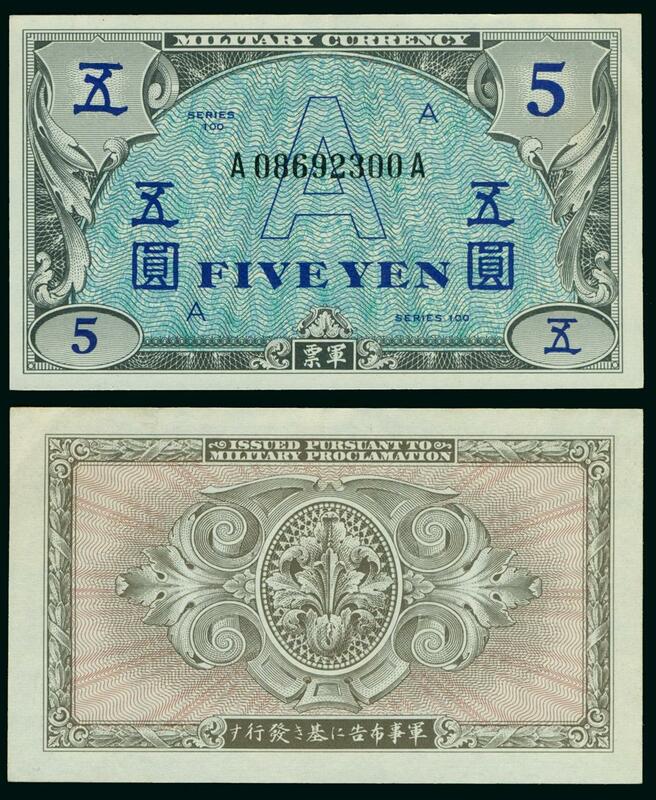 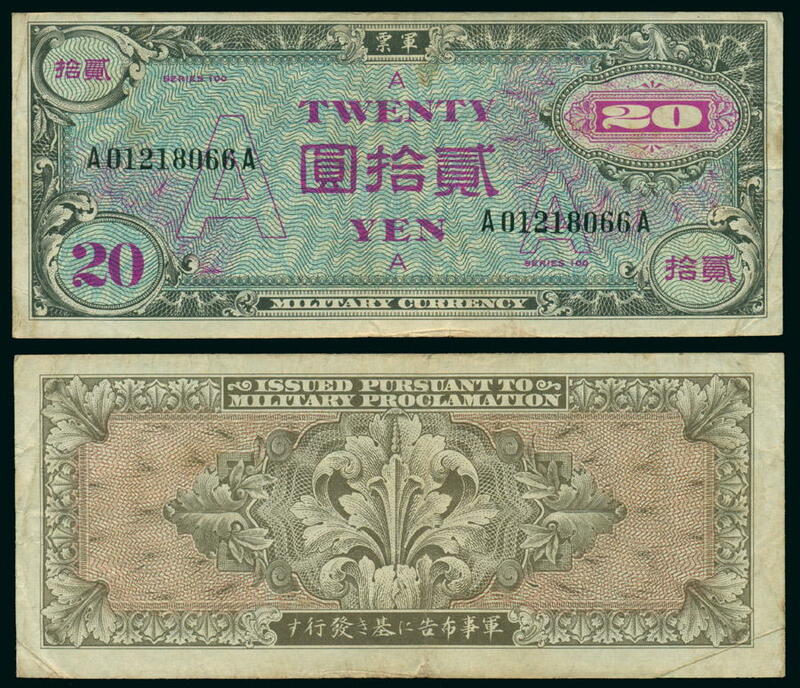 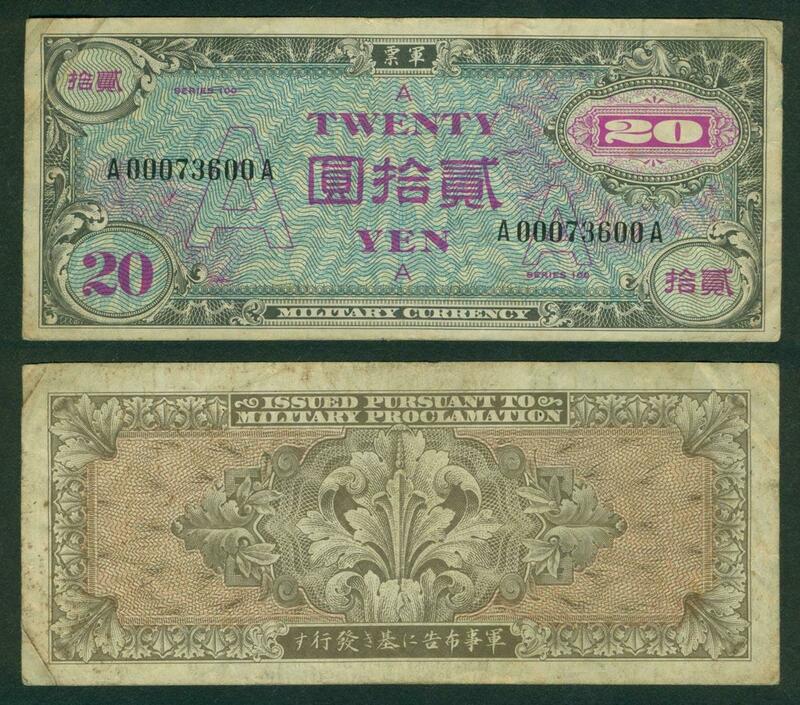 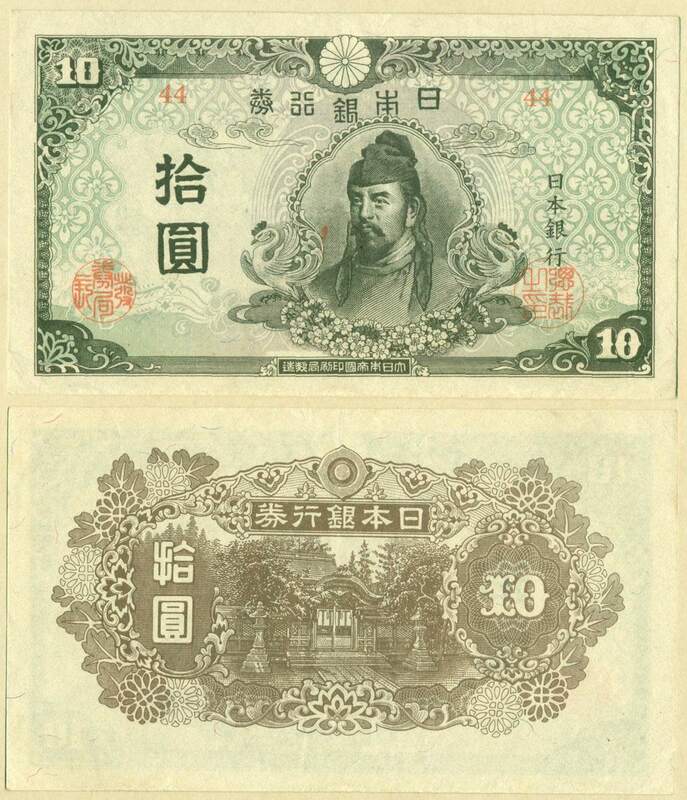 Japanese Mihons Priced Under $10, click here. 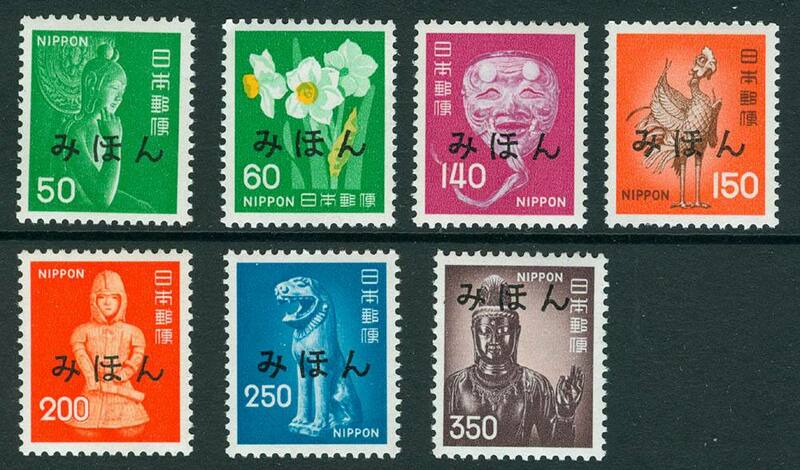 685s B/4               $12   N26       1959    NY - Rat, block/4, "Ozaki"
712-23s B/4            $60   S328-339  1961    Flowers, blocks/4, "Ozaki"
768s Inscp B/4         $10   S382-339  1961    Wakato Bridge, inscription block/4, "
JPS = Japan Philatelic Society, "Sakura Catalogue"
More Japanese Occupation of Burma postal cards below (here). 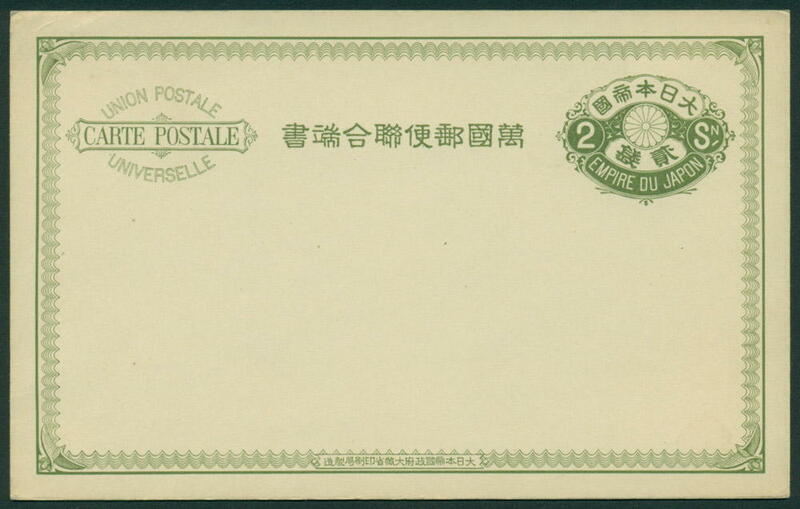 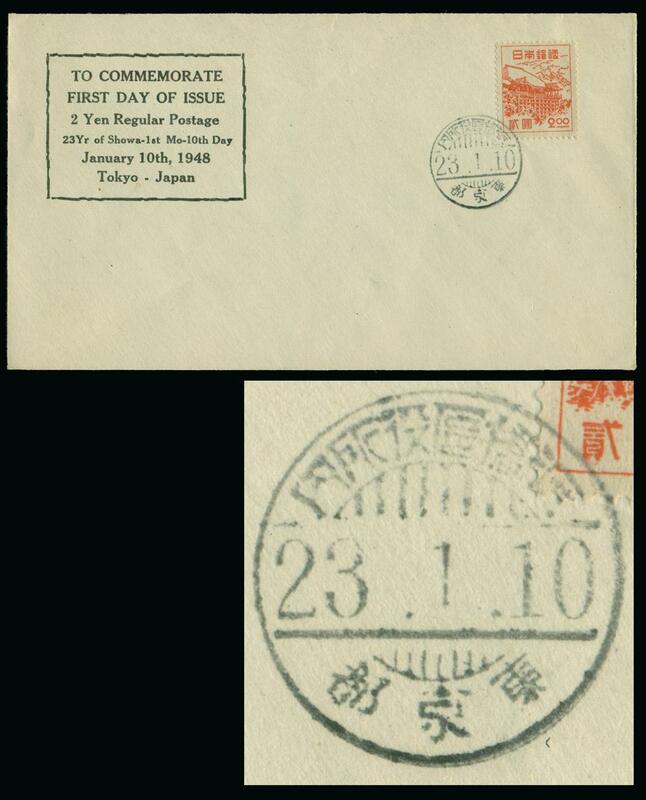 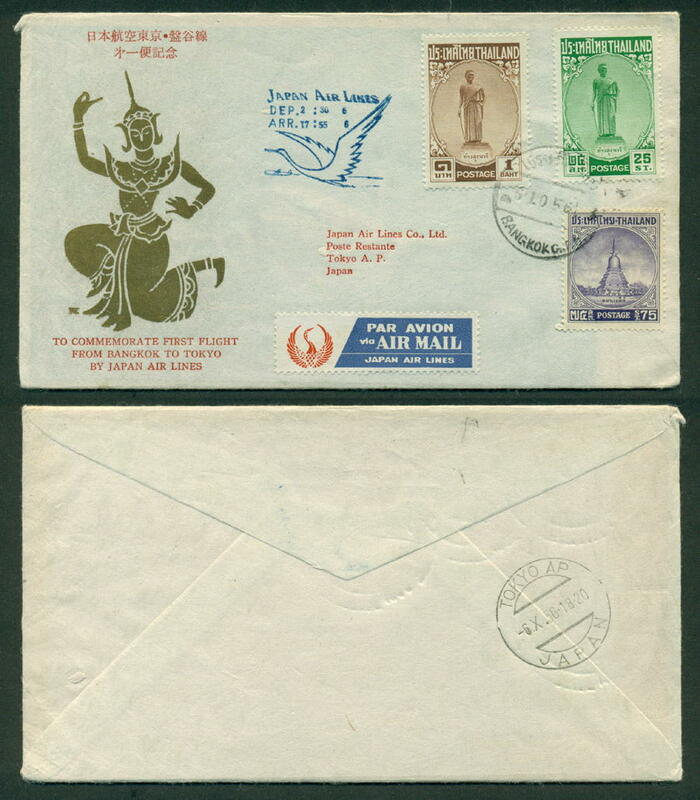 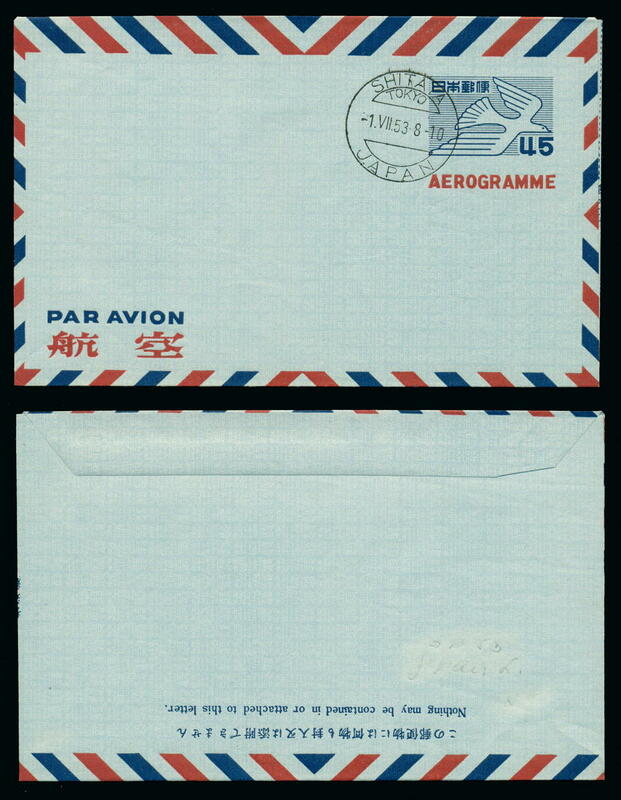 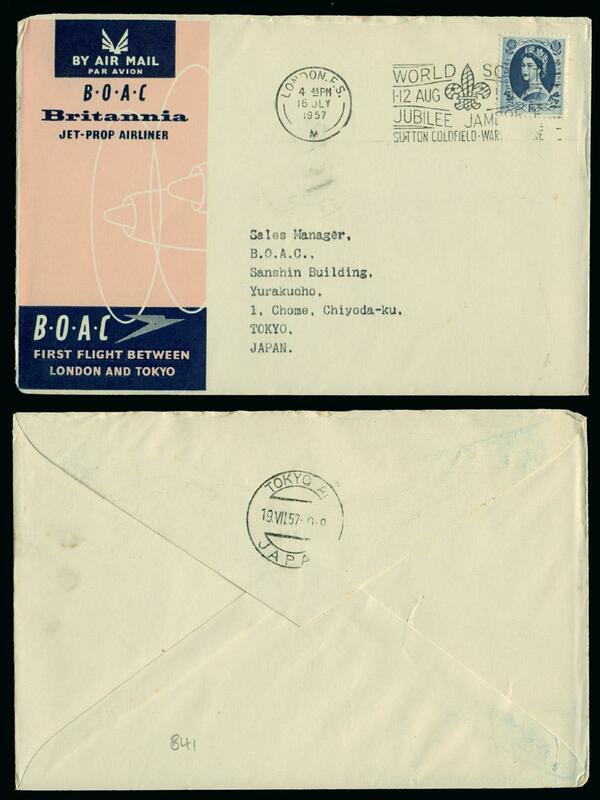 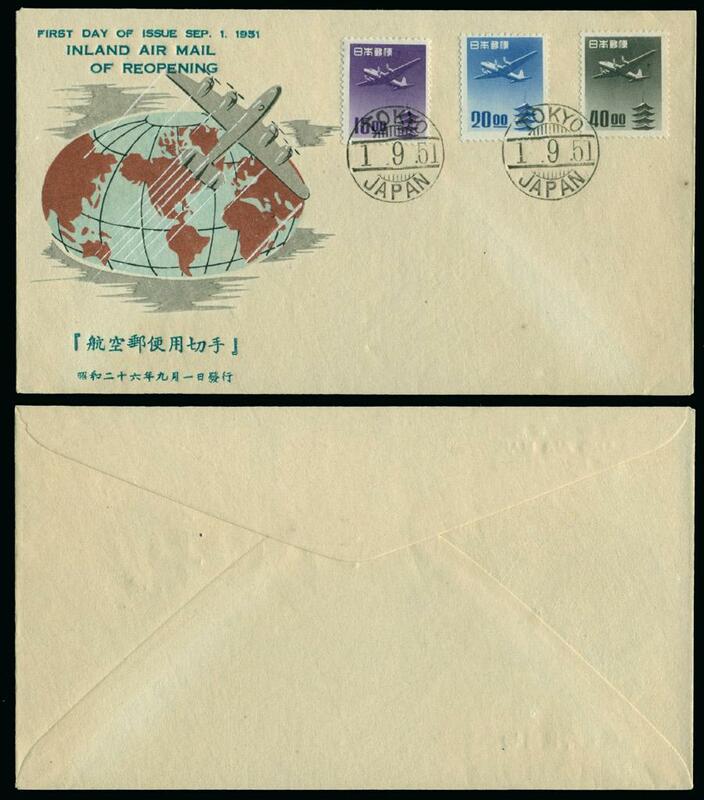 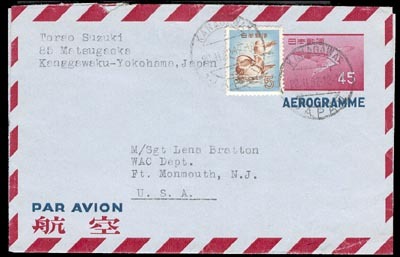 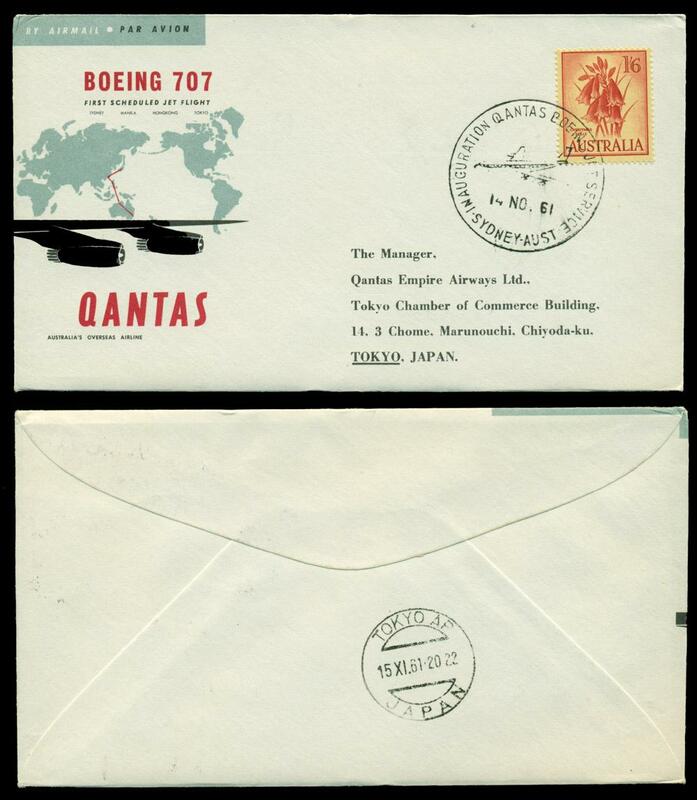 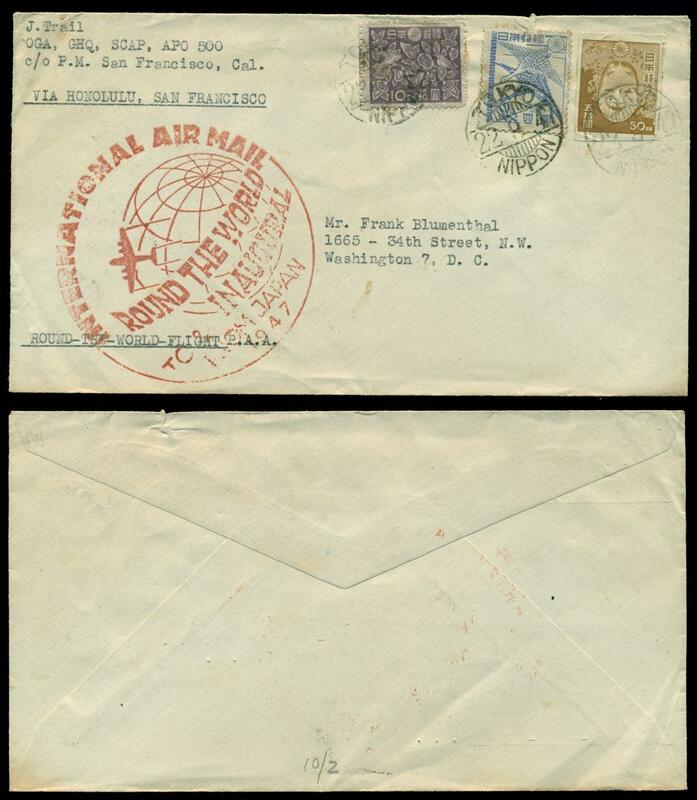 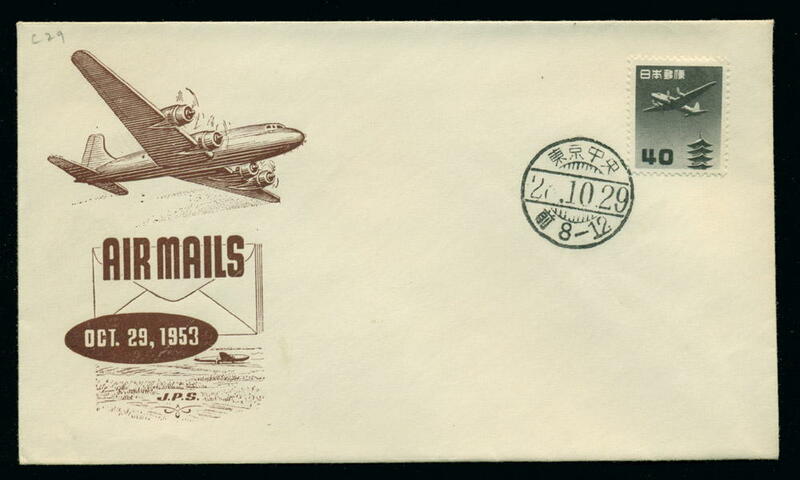 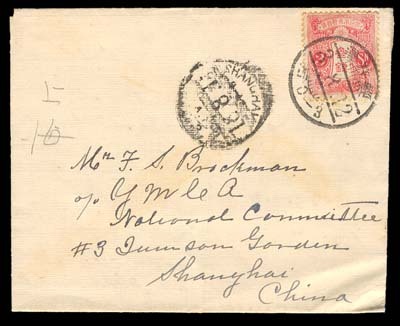 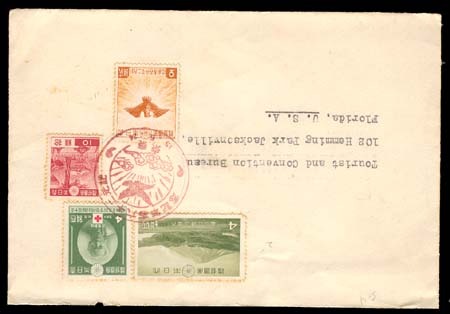 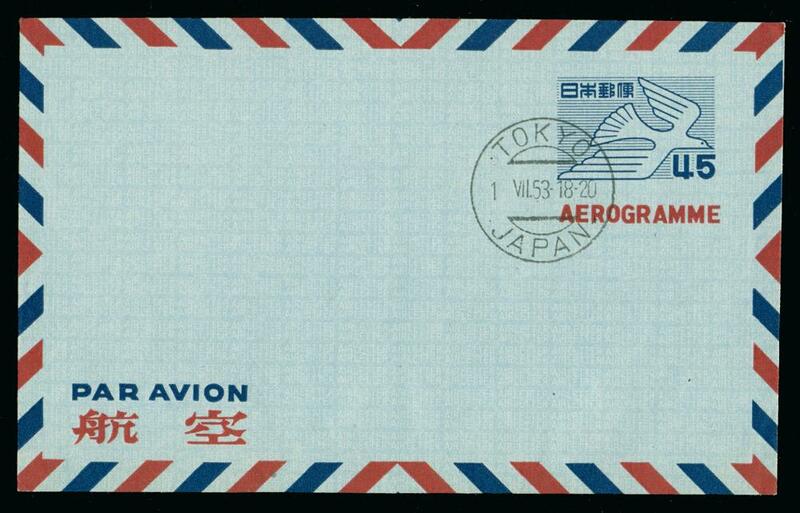 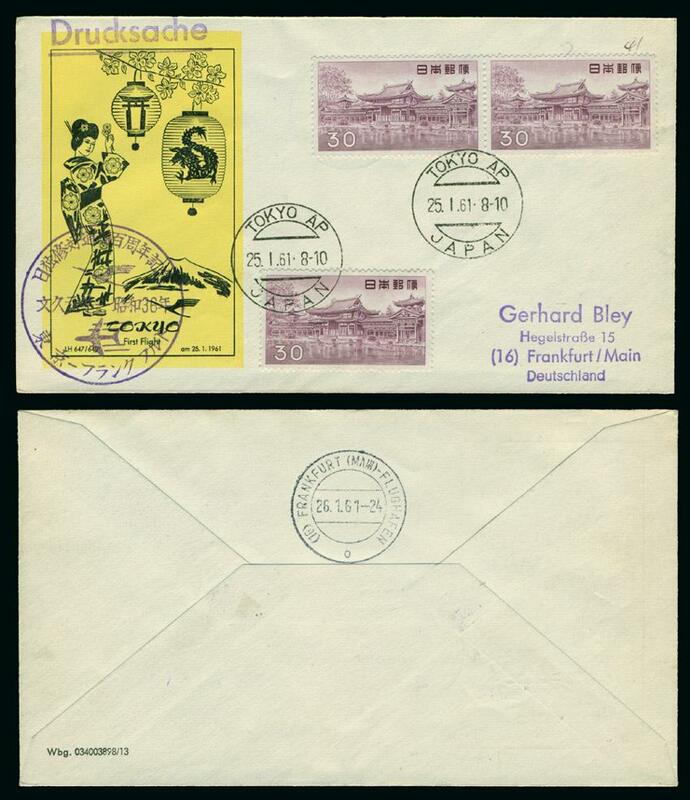 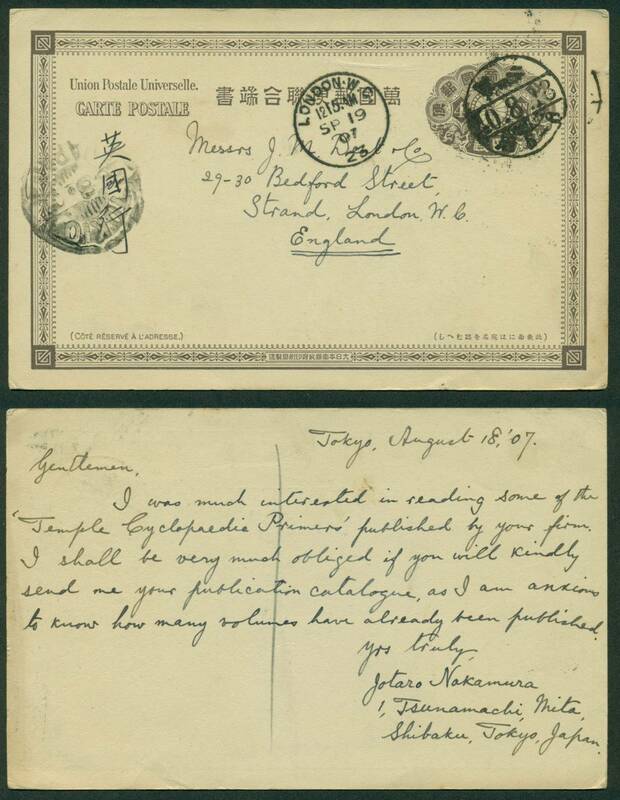 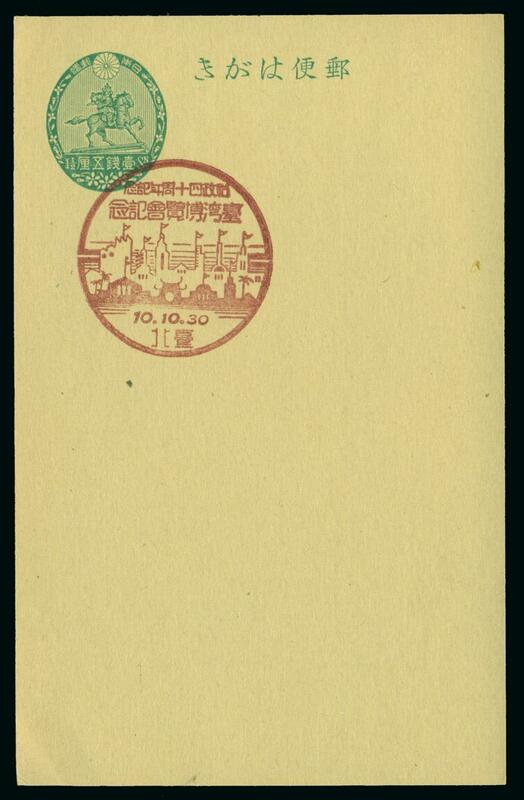 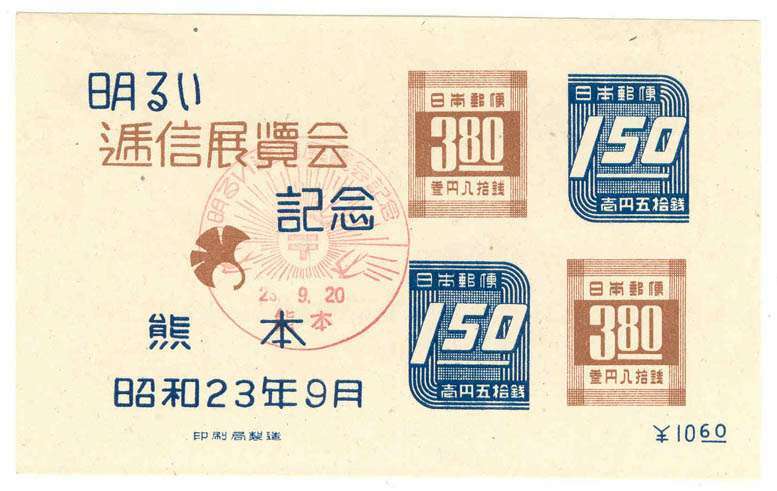 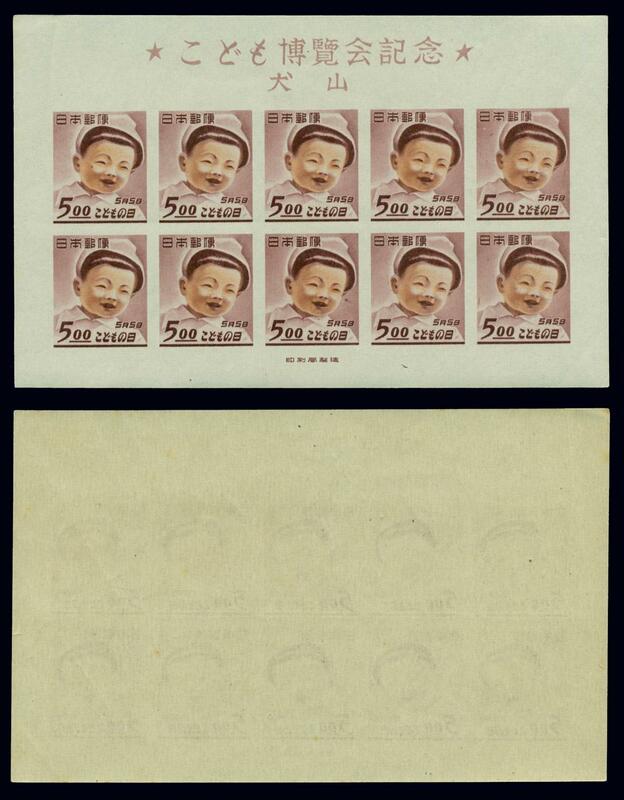 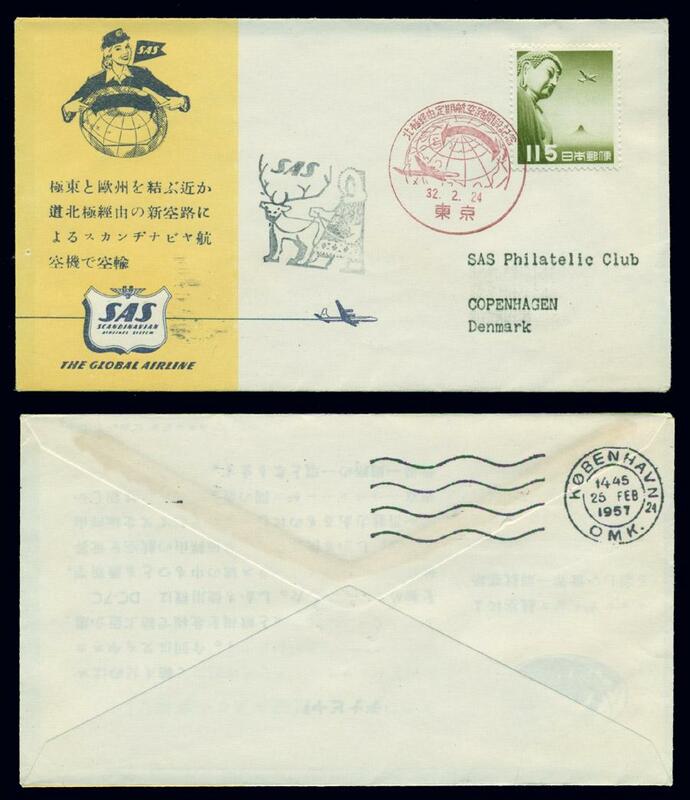 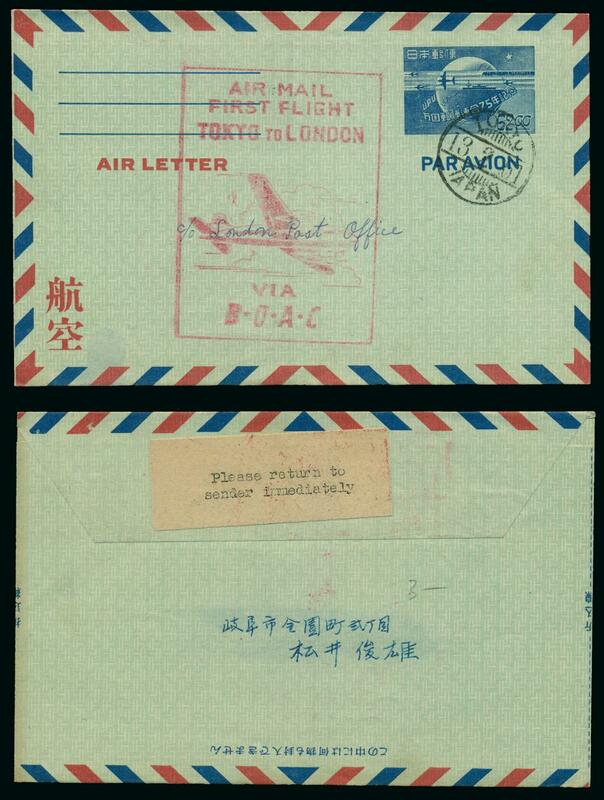 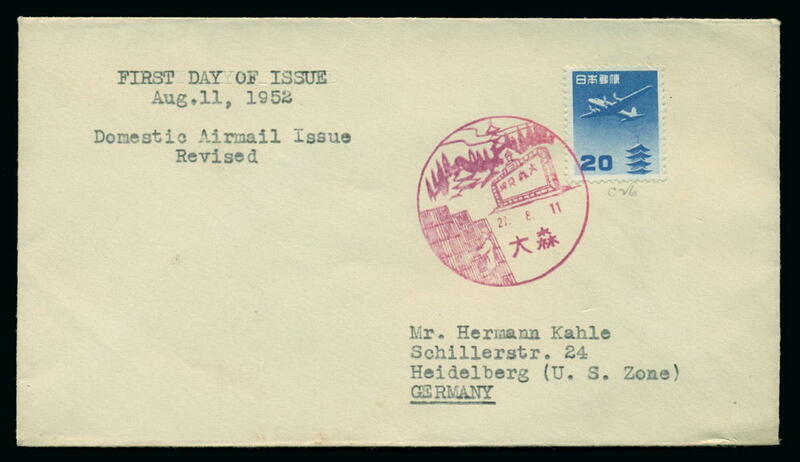 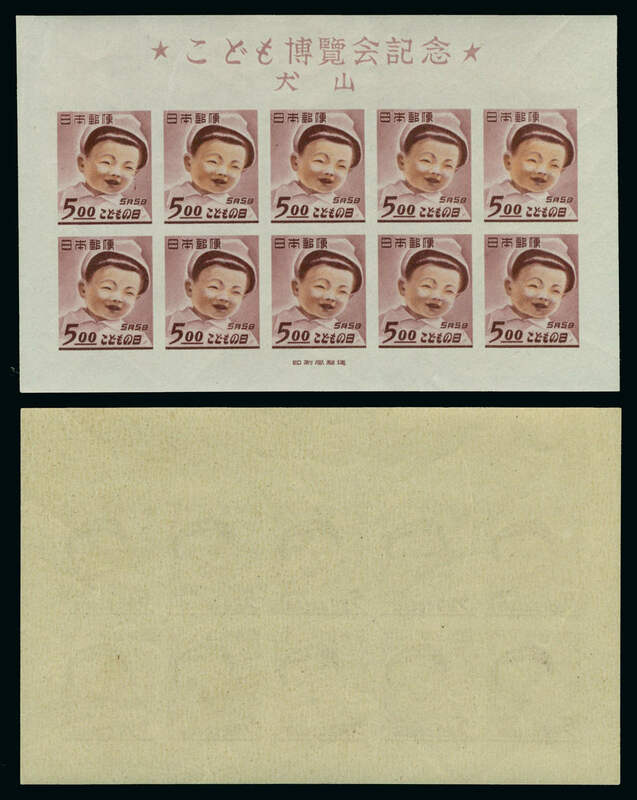 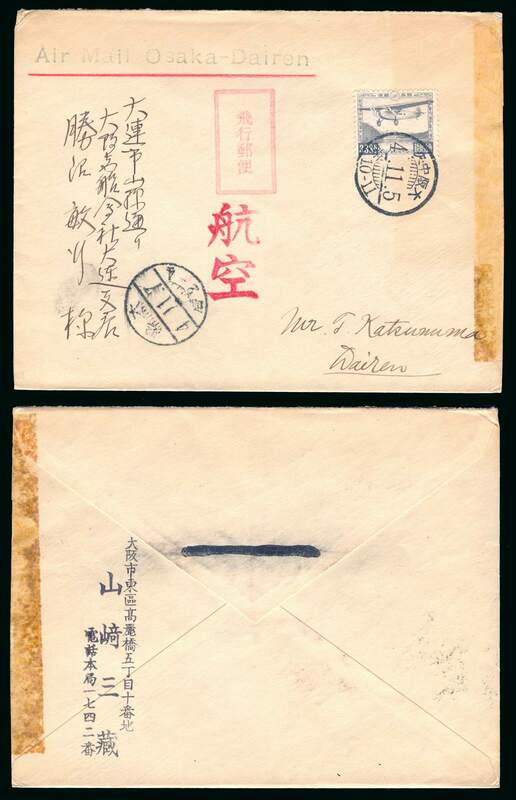 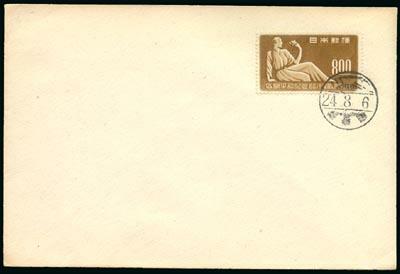 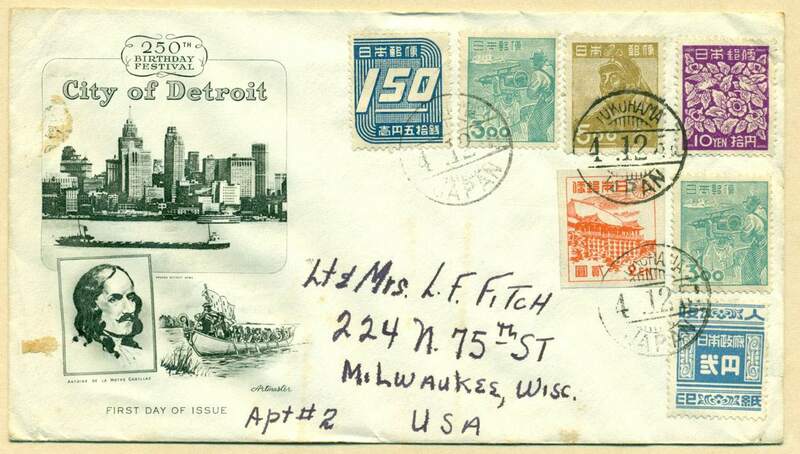 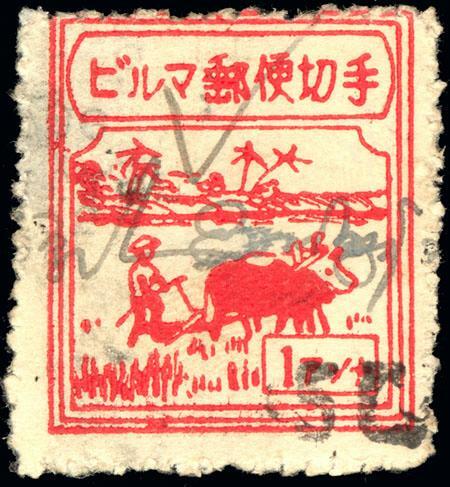 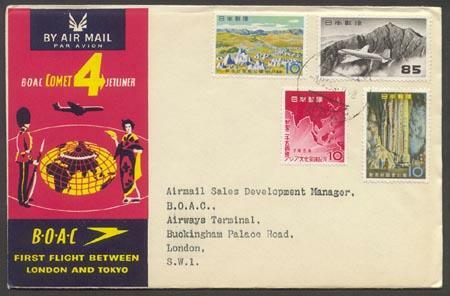 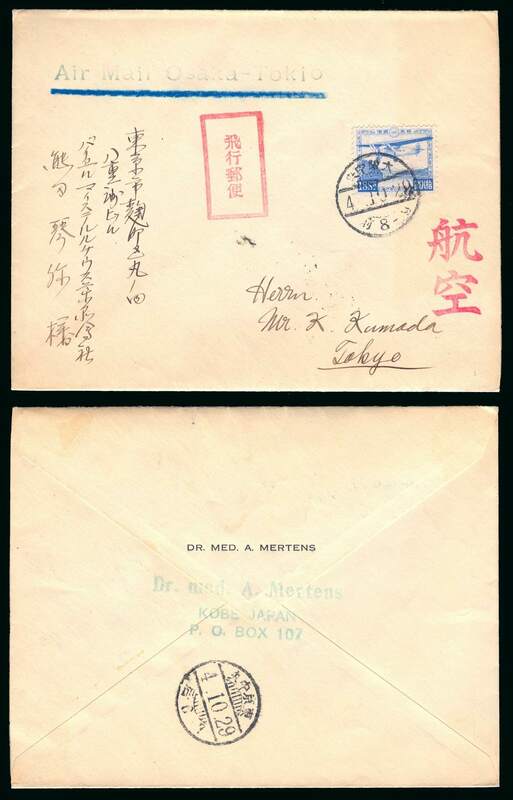 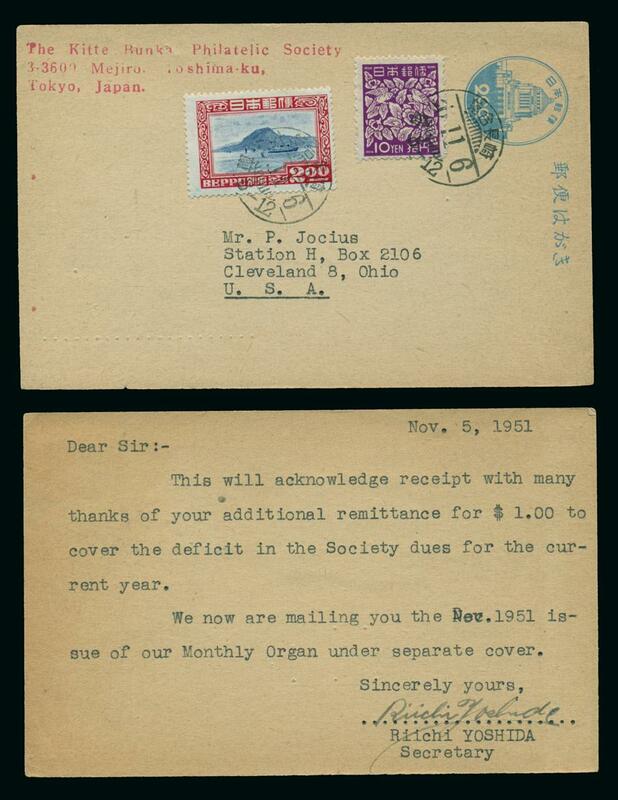 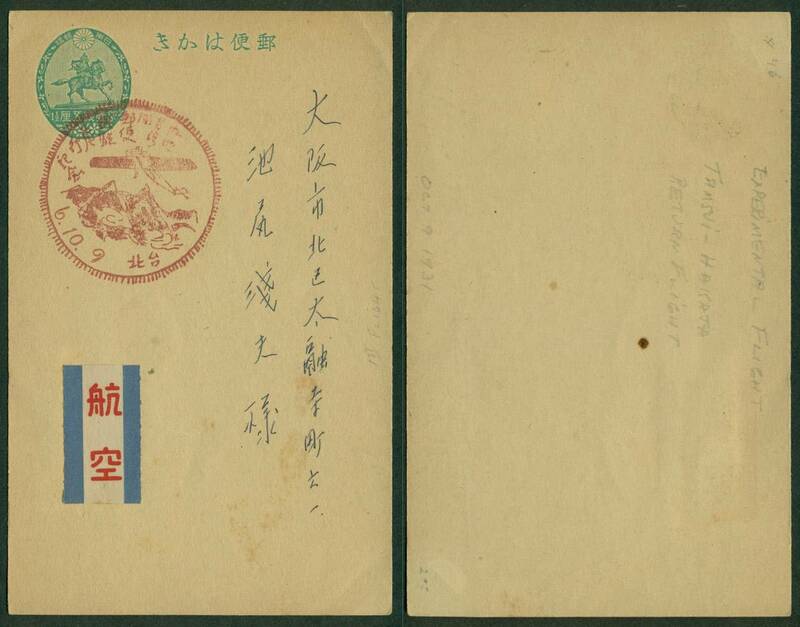 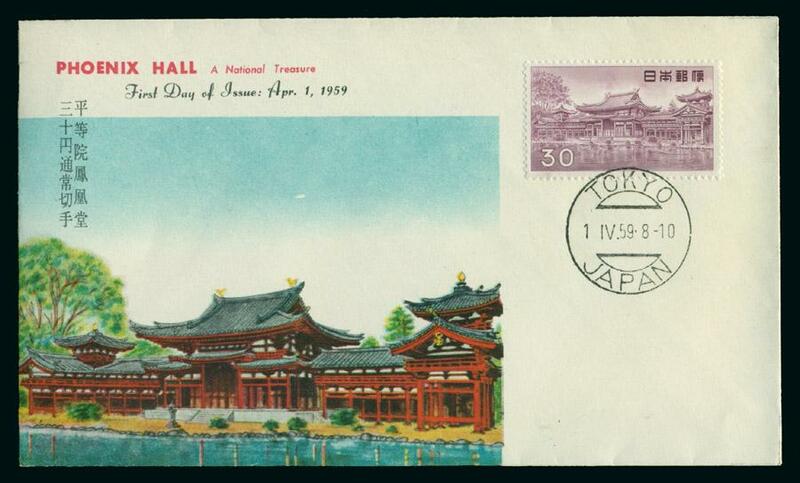 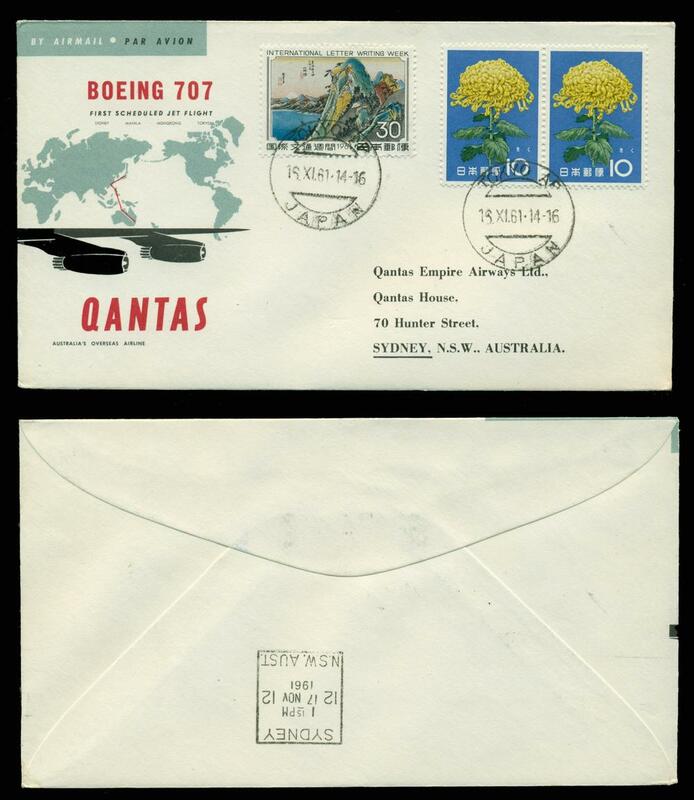 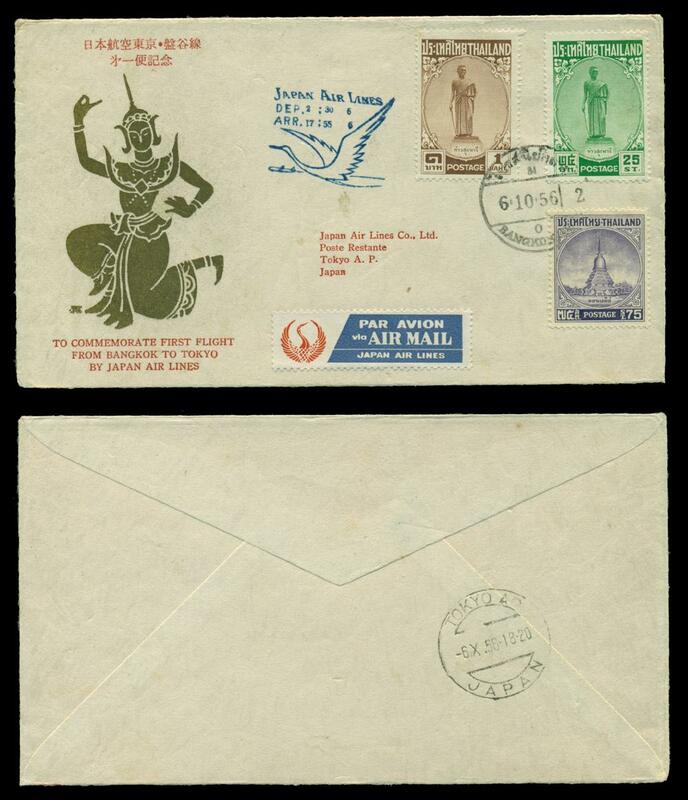 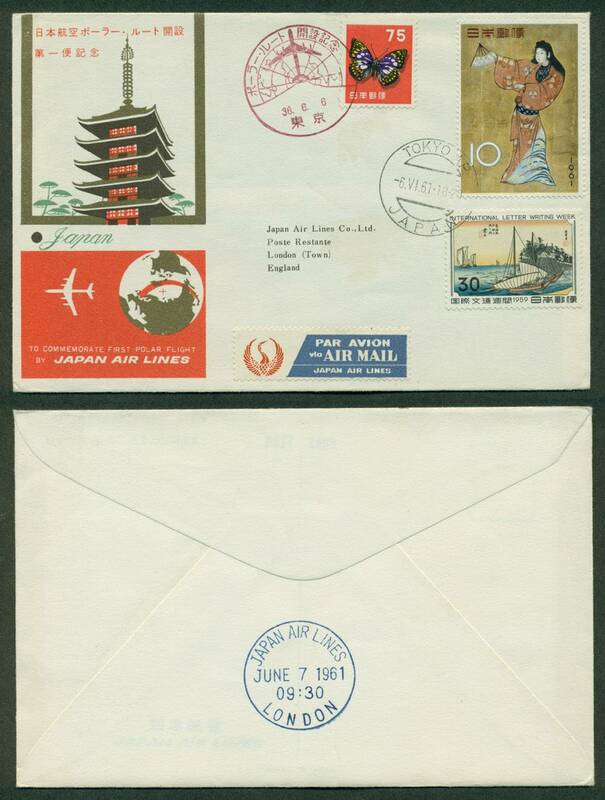 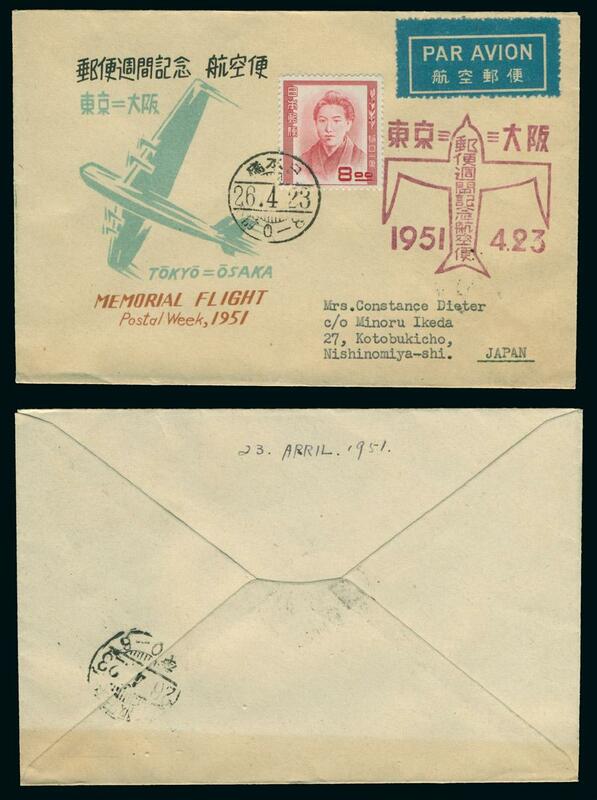 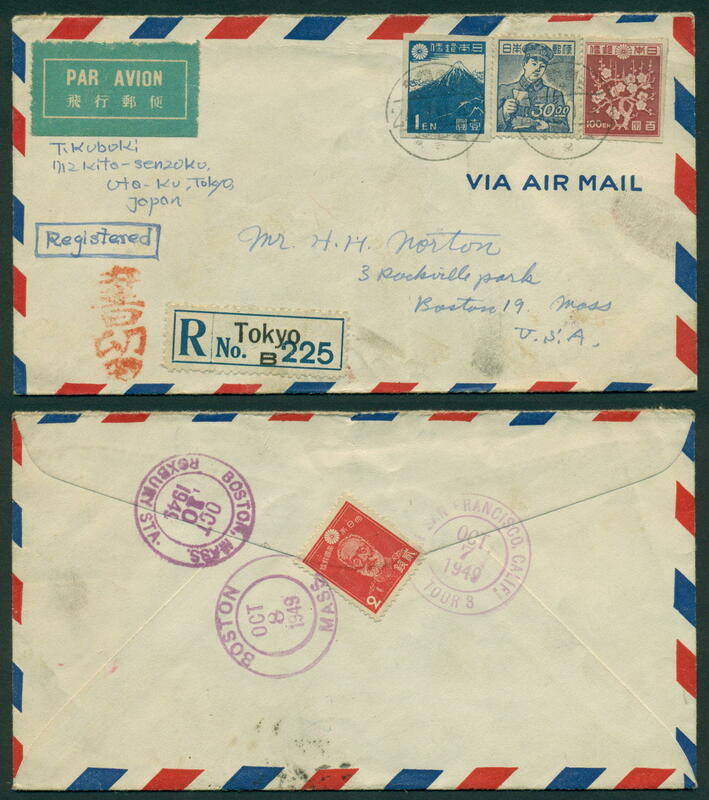 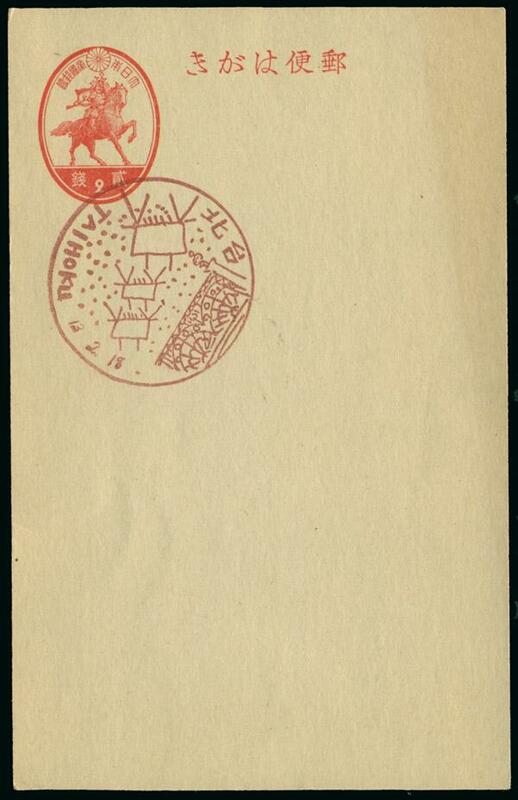 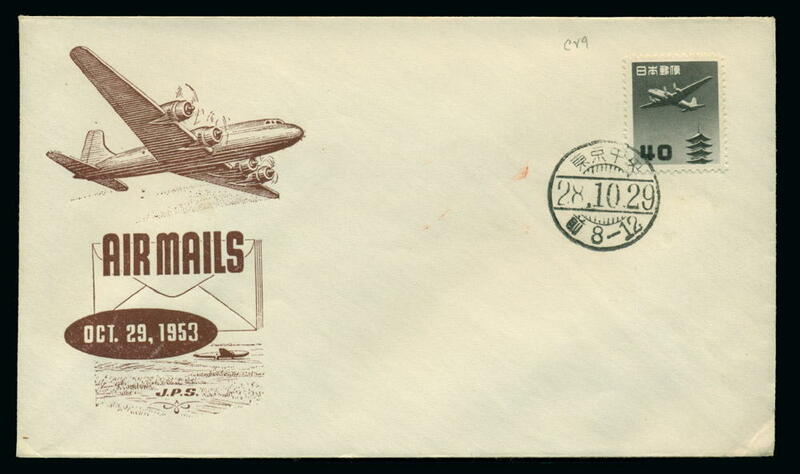 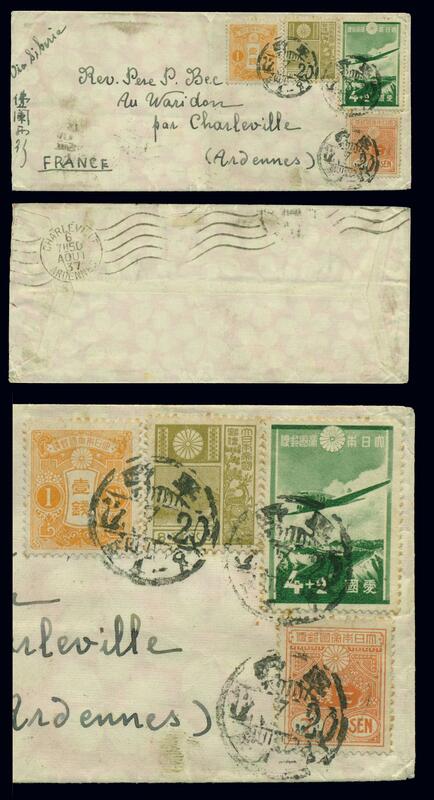 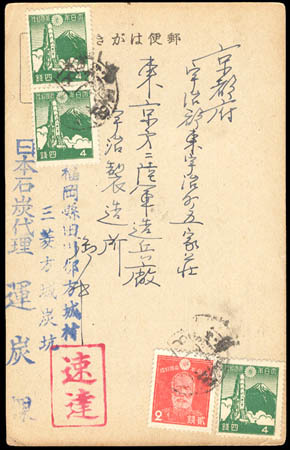 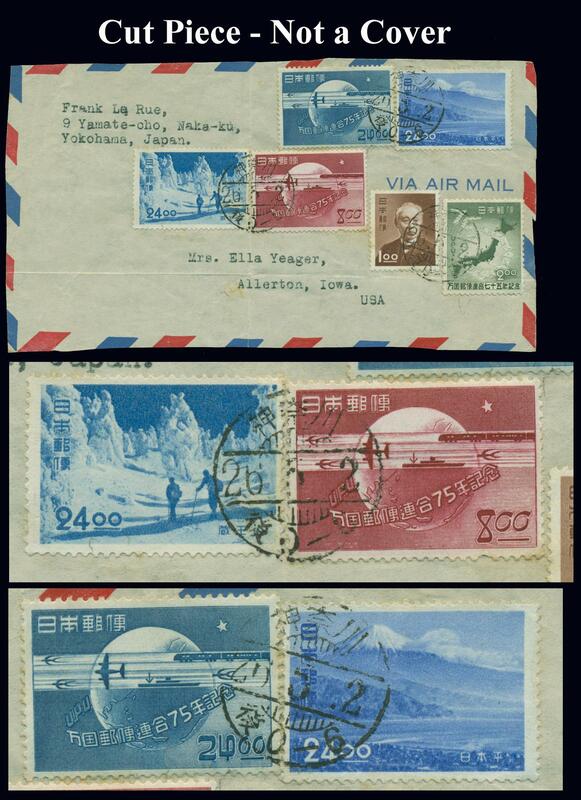 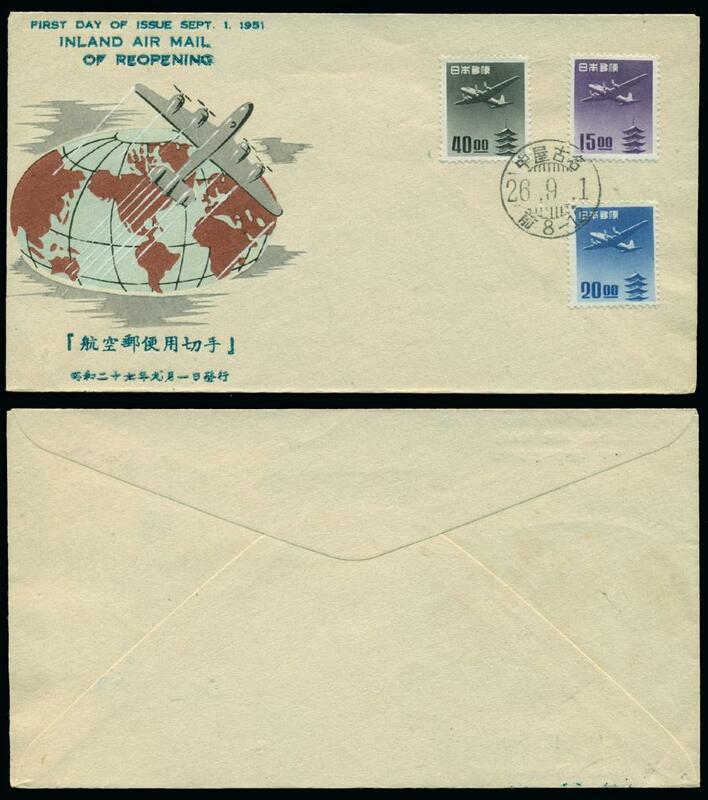 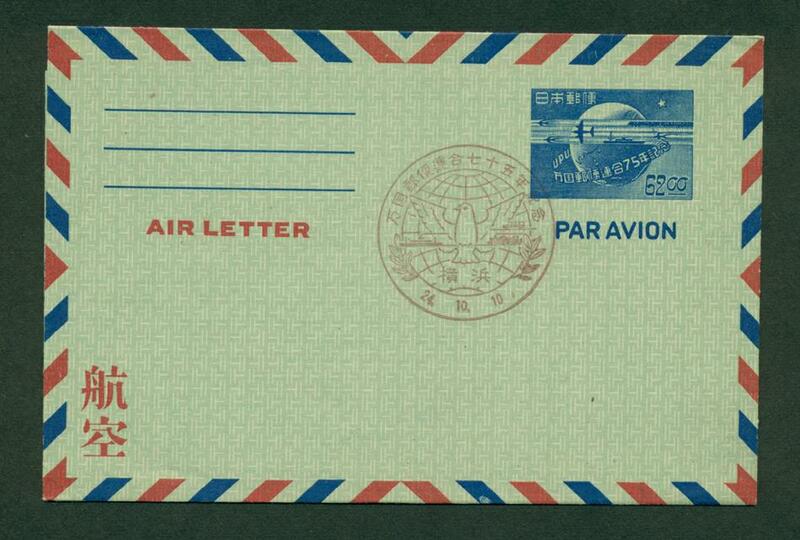 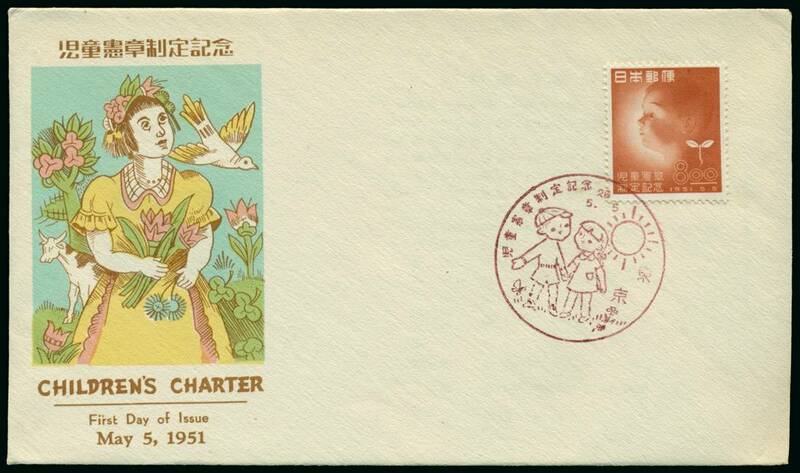 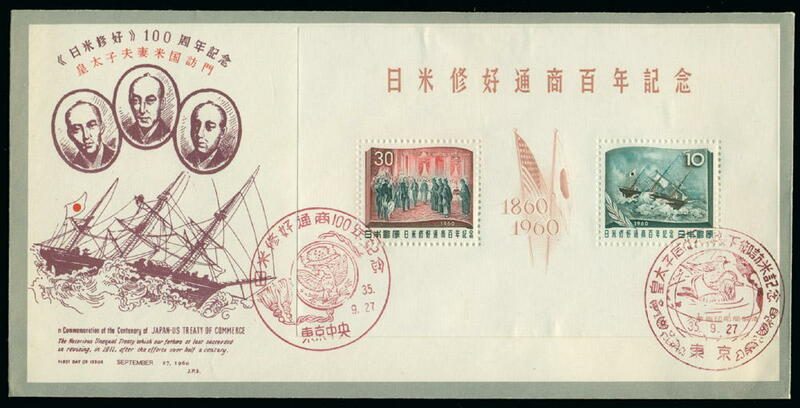 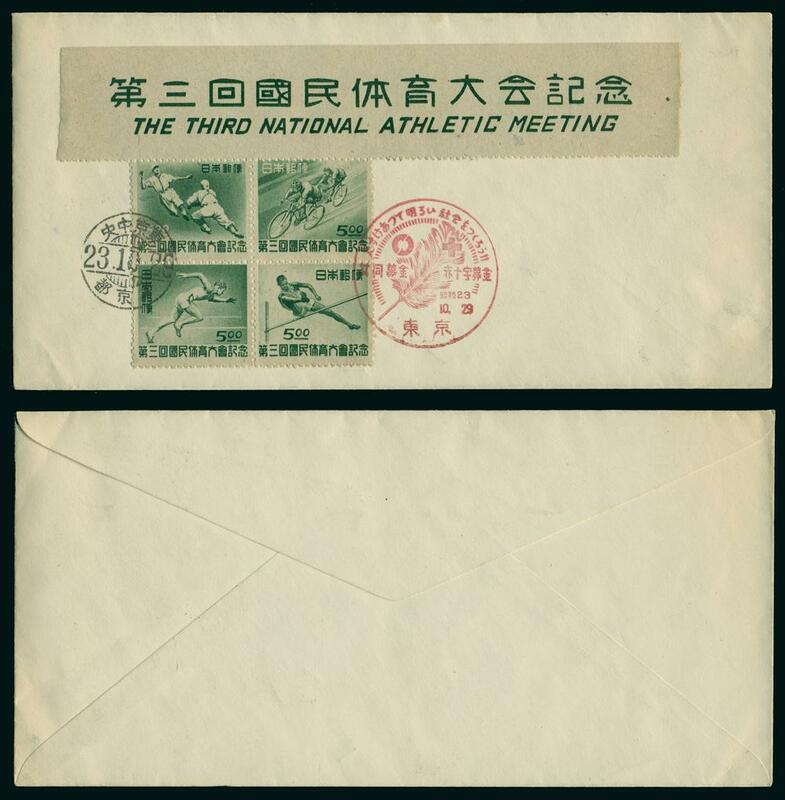 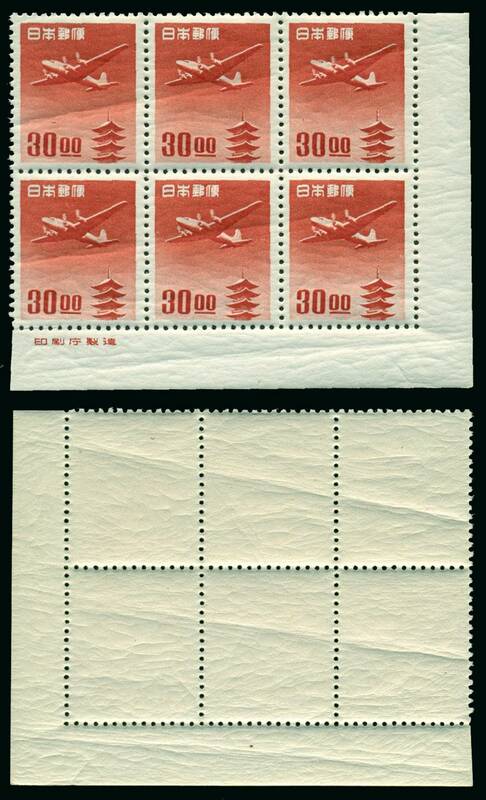 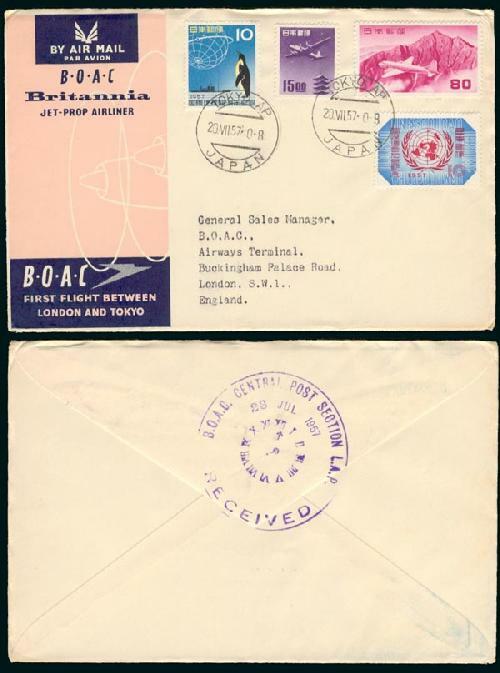 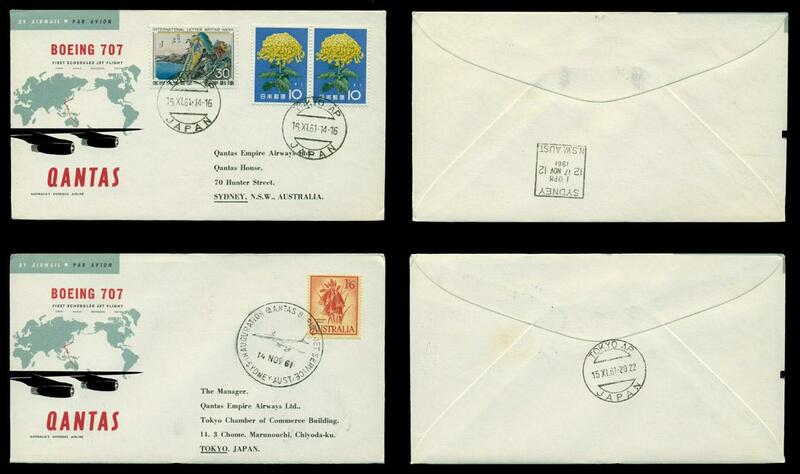 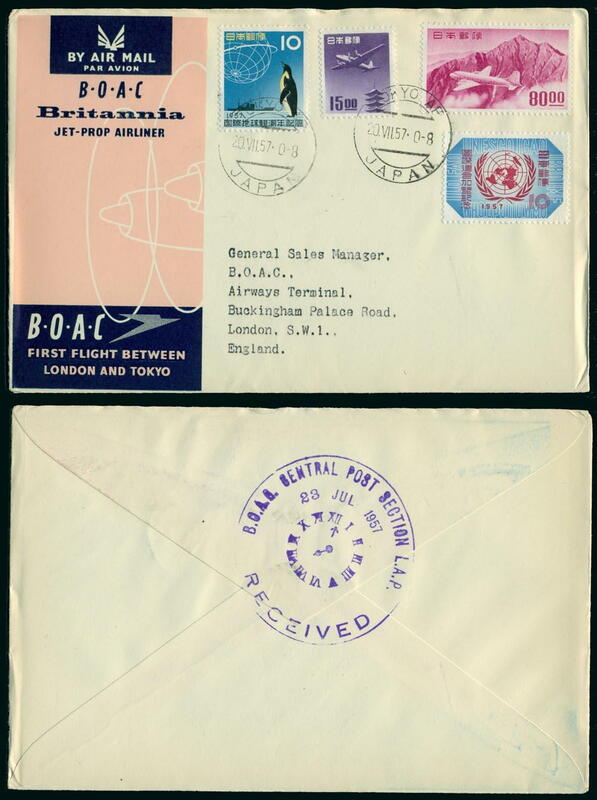 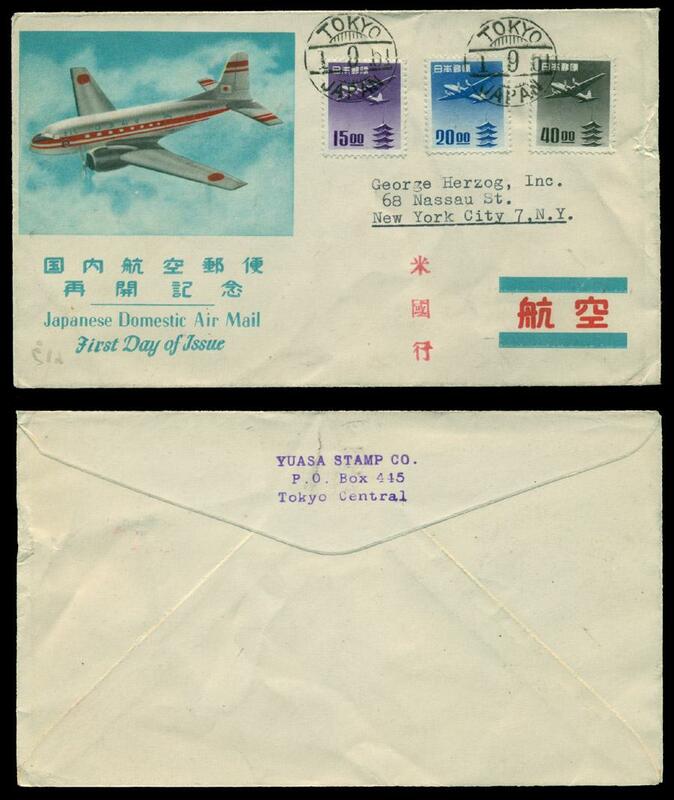 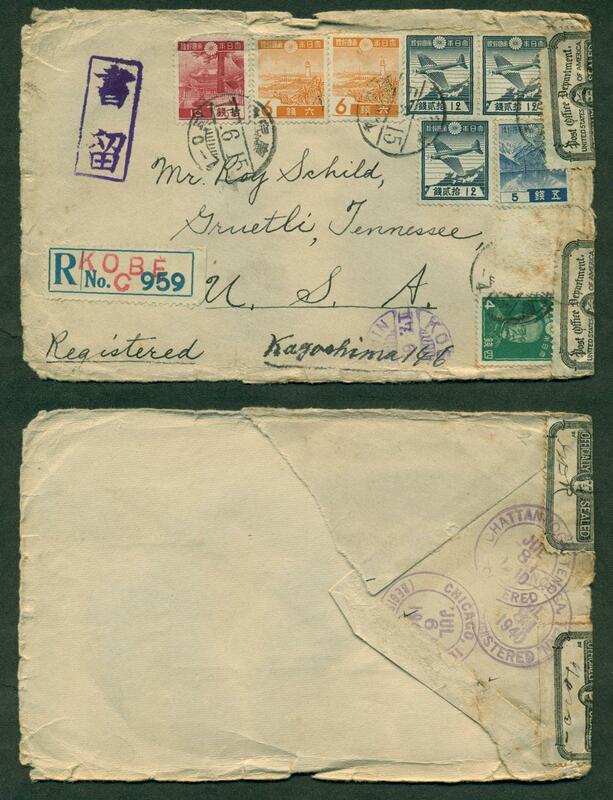 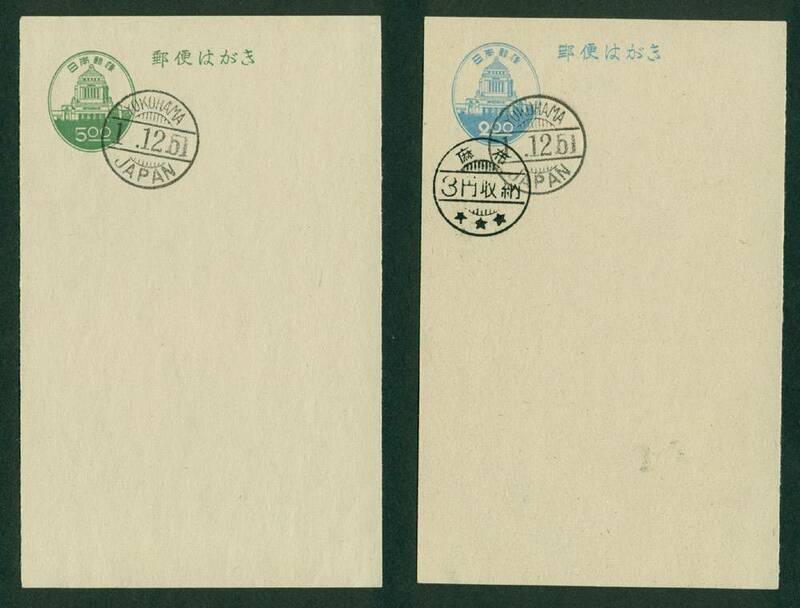 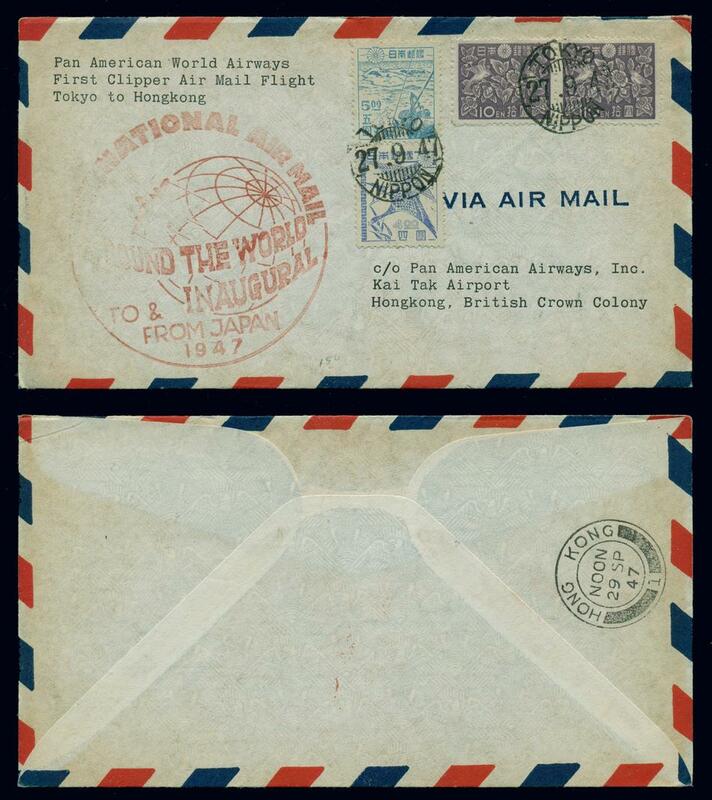 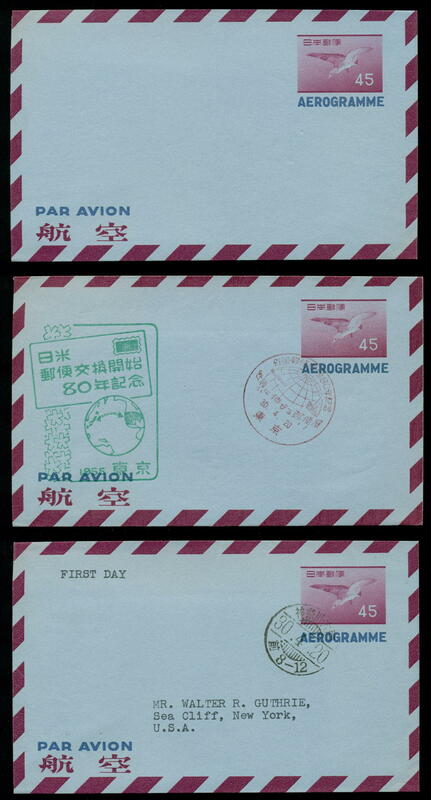 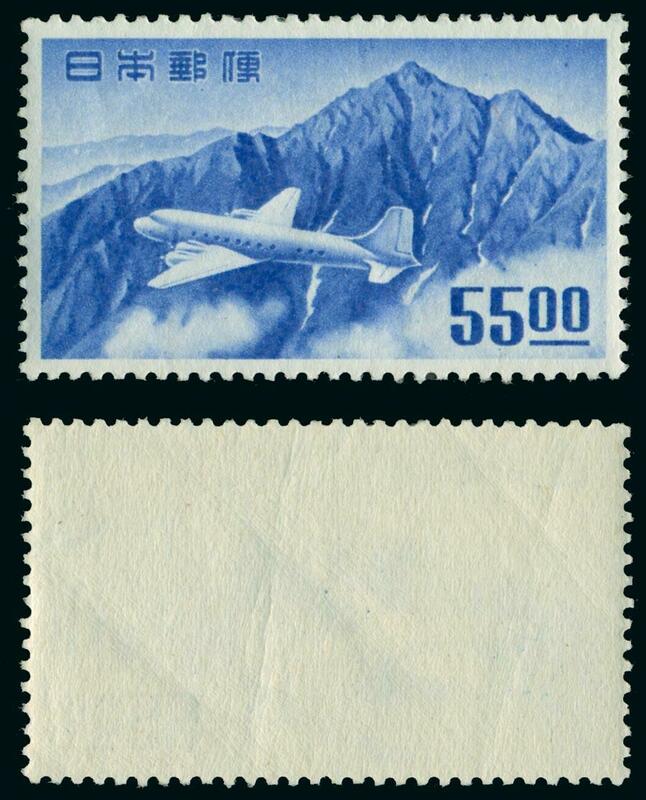 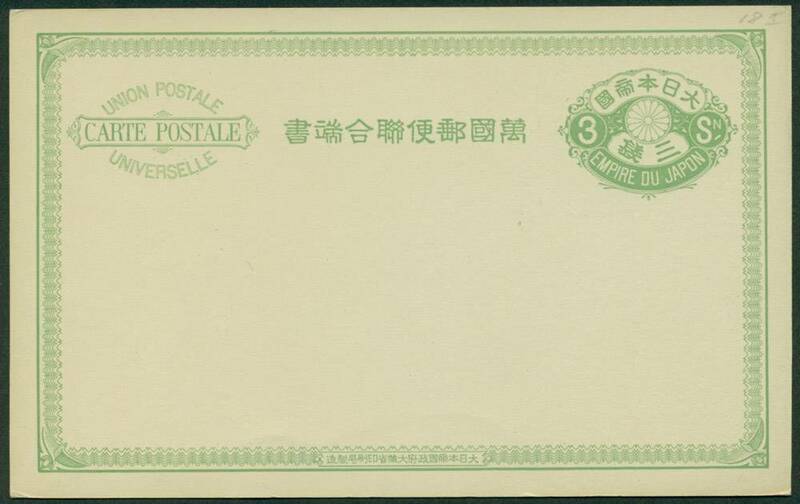 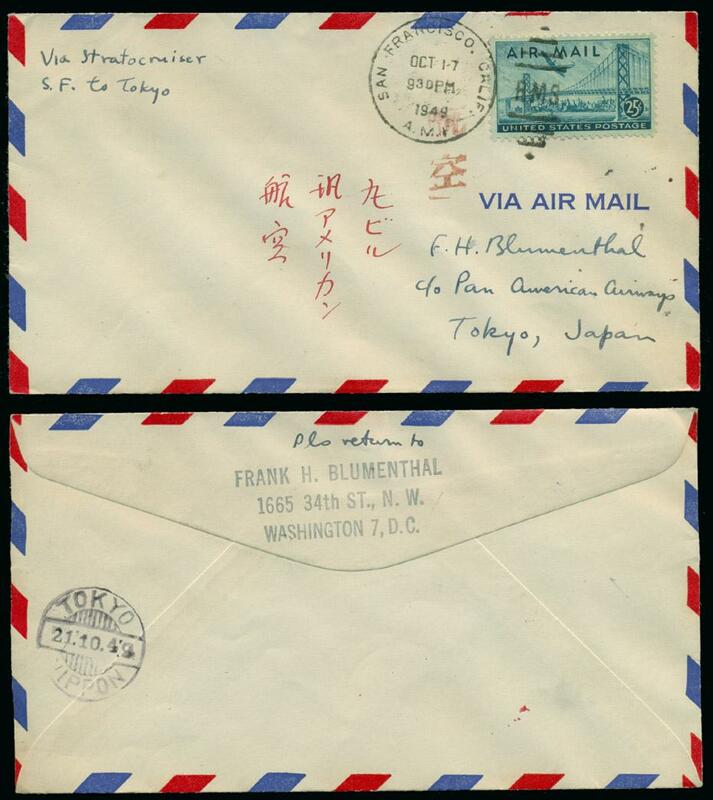 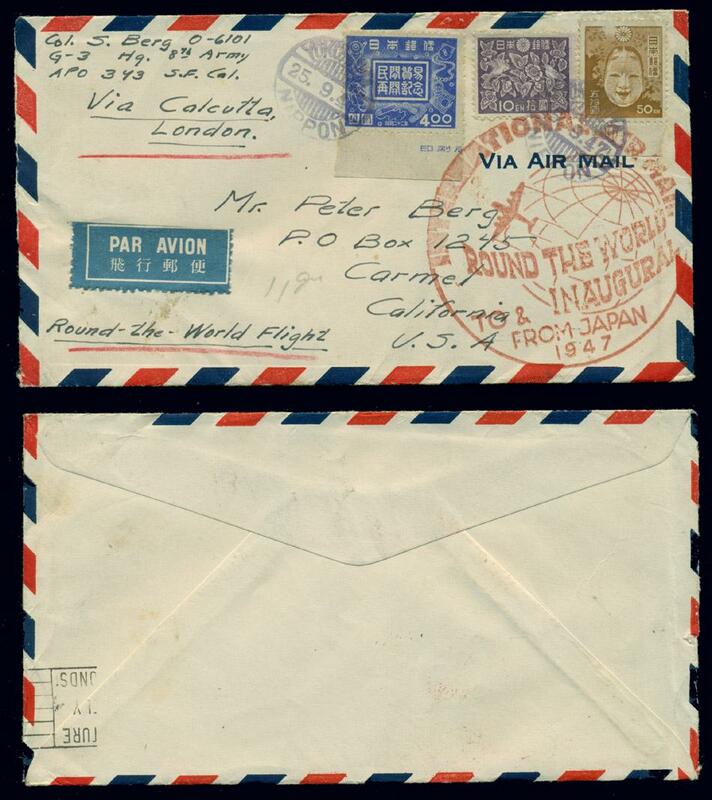 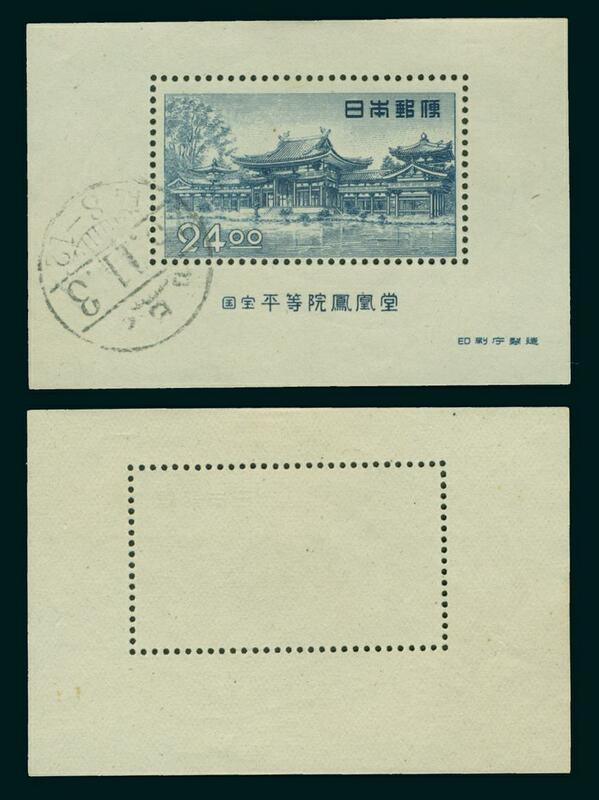 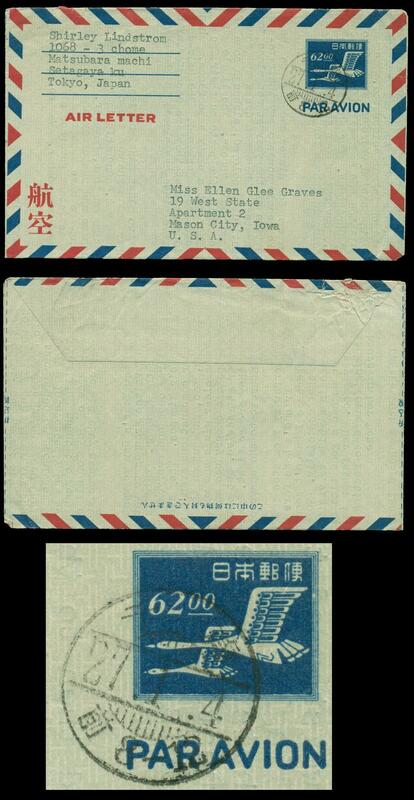 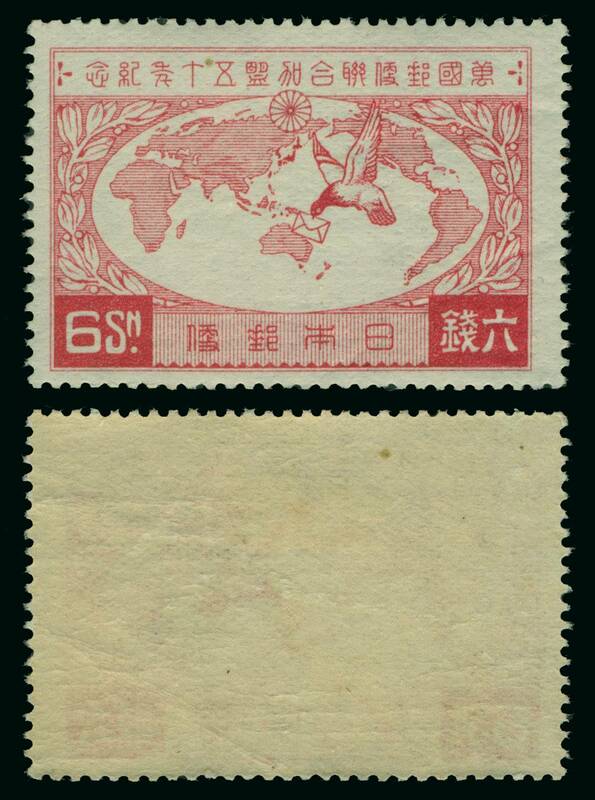 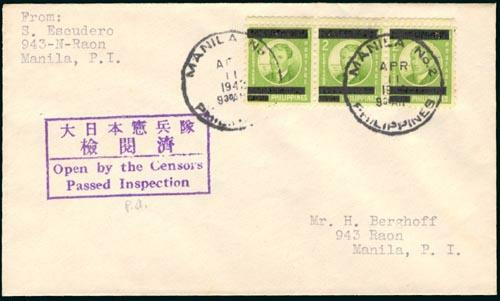 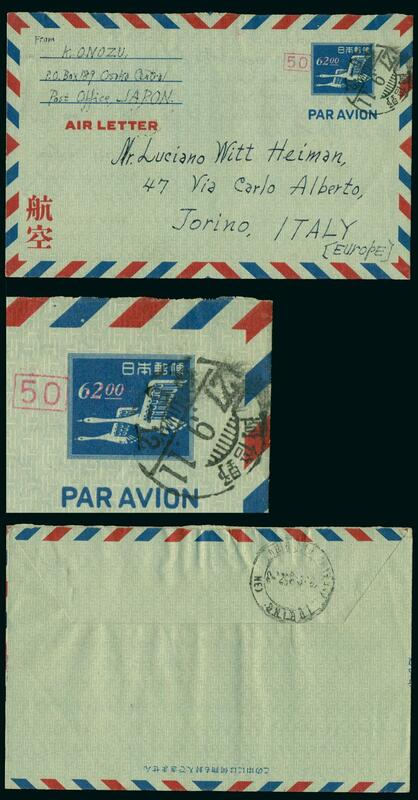 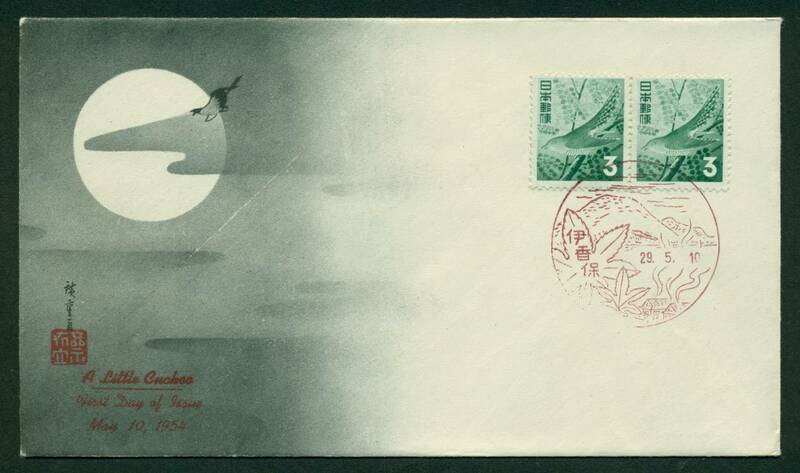 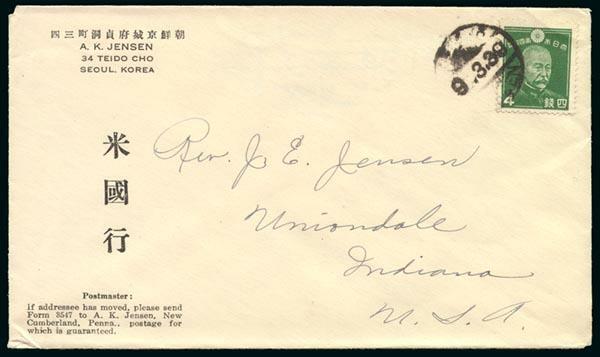 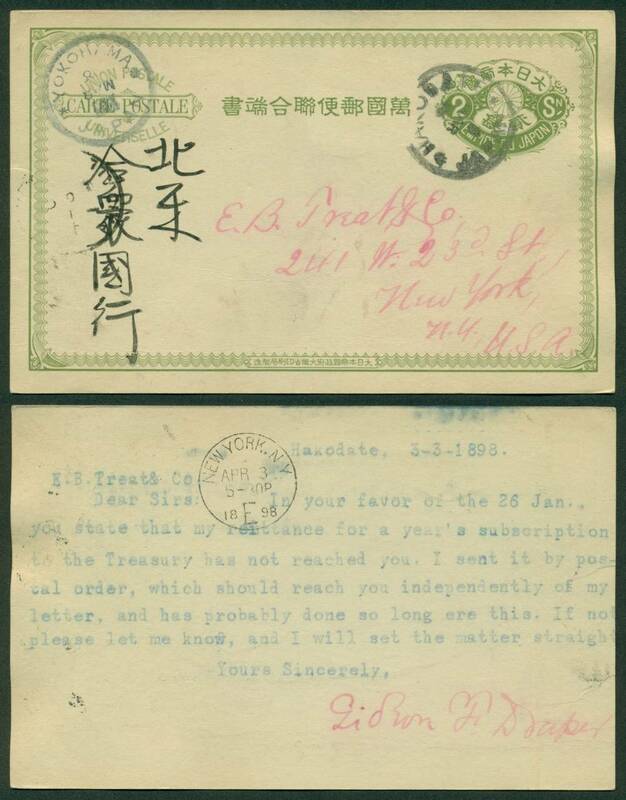 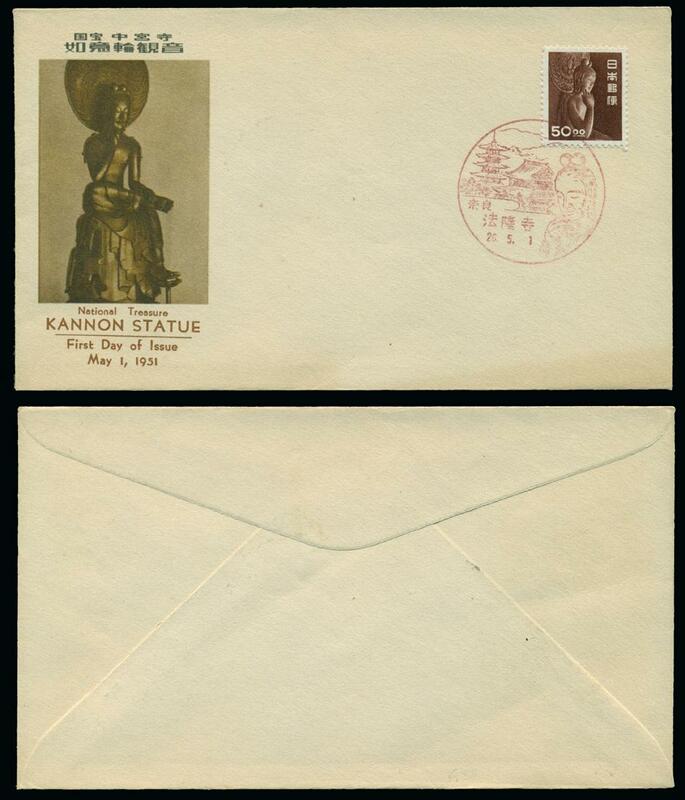 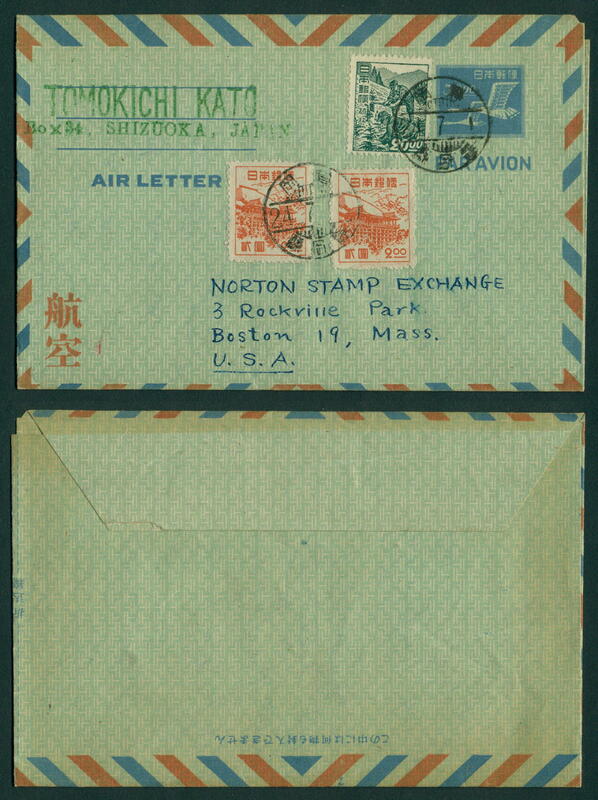 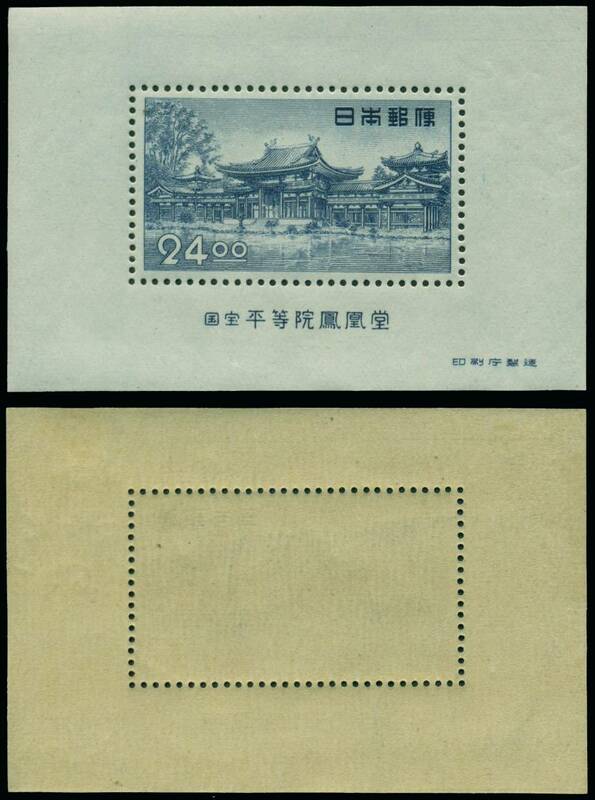 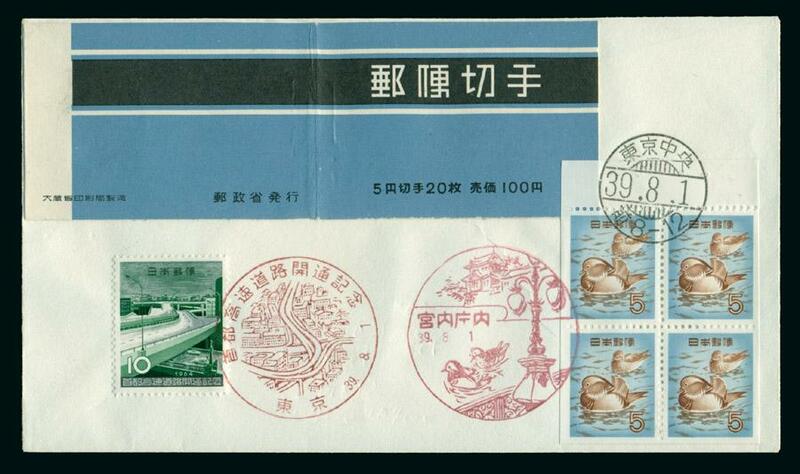 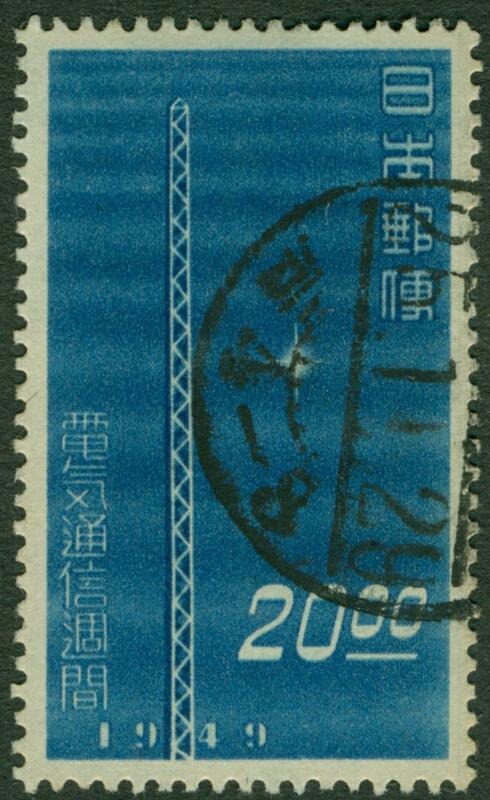 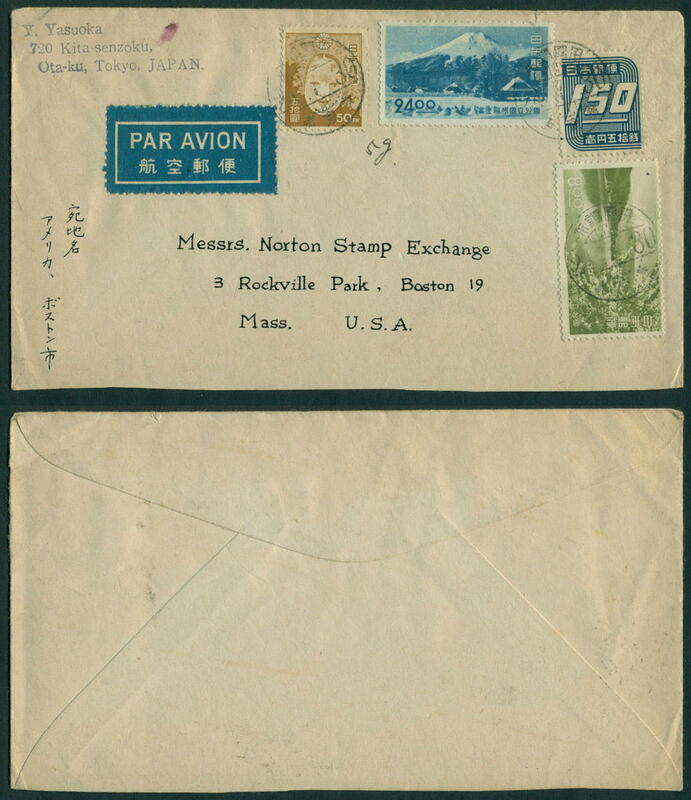 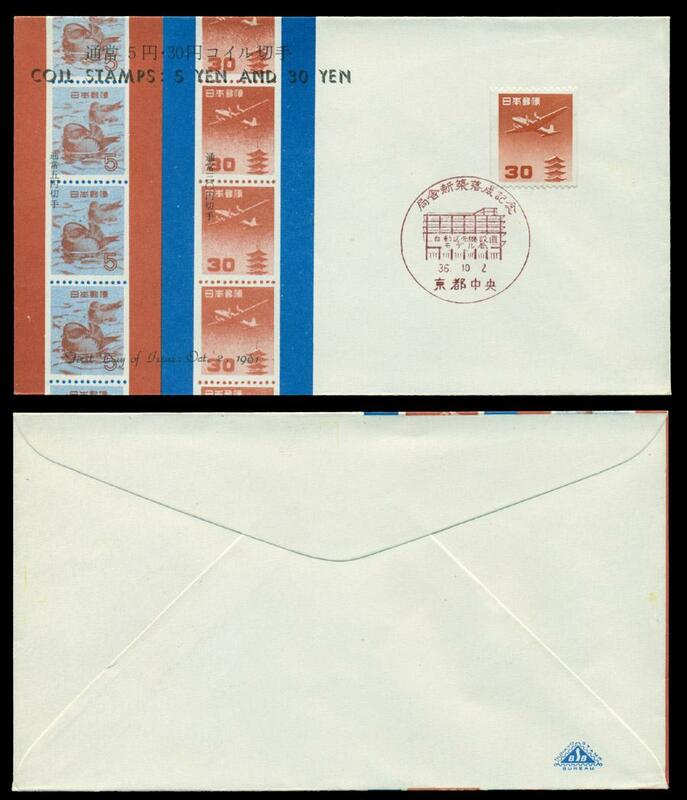 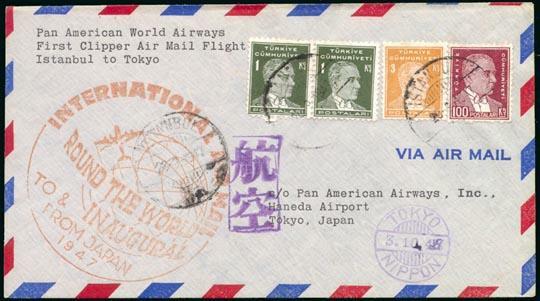 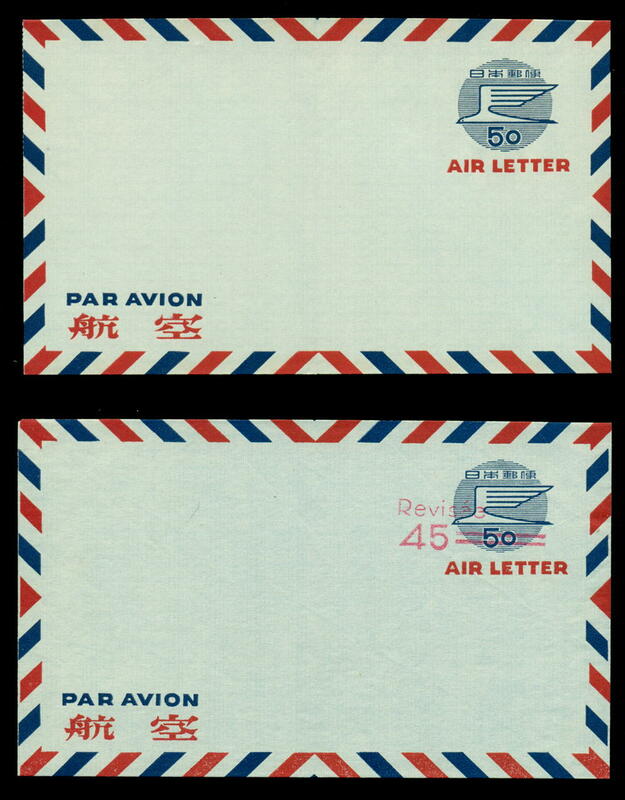 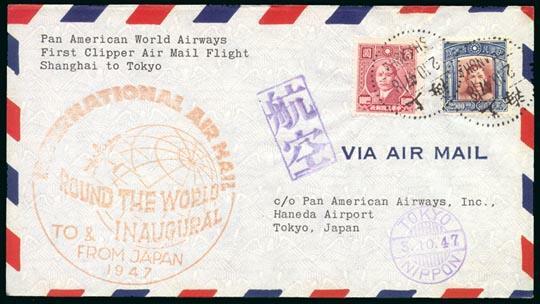 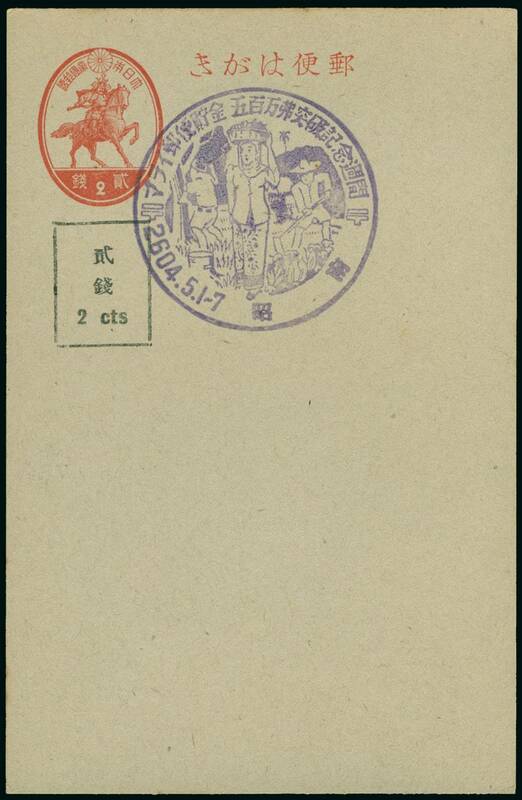 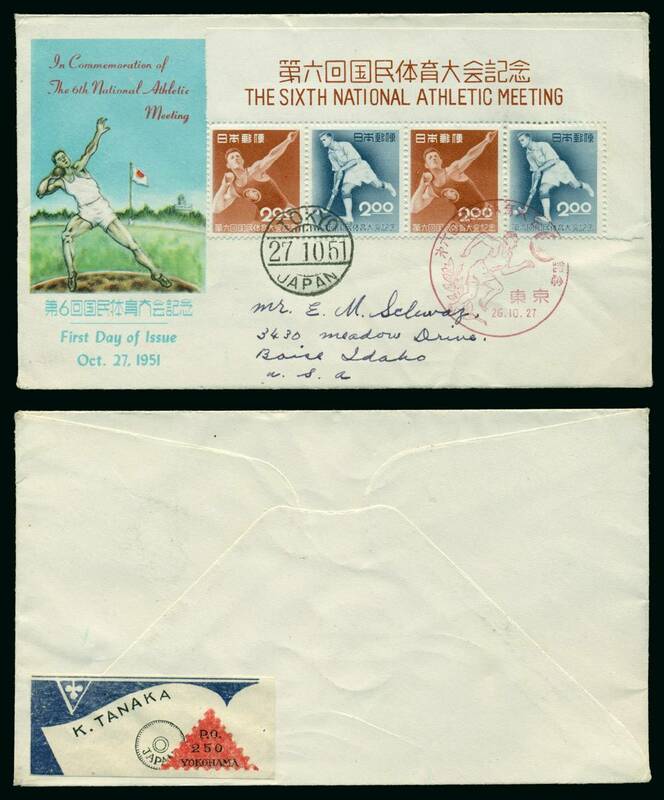 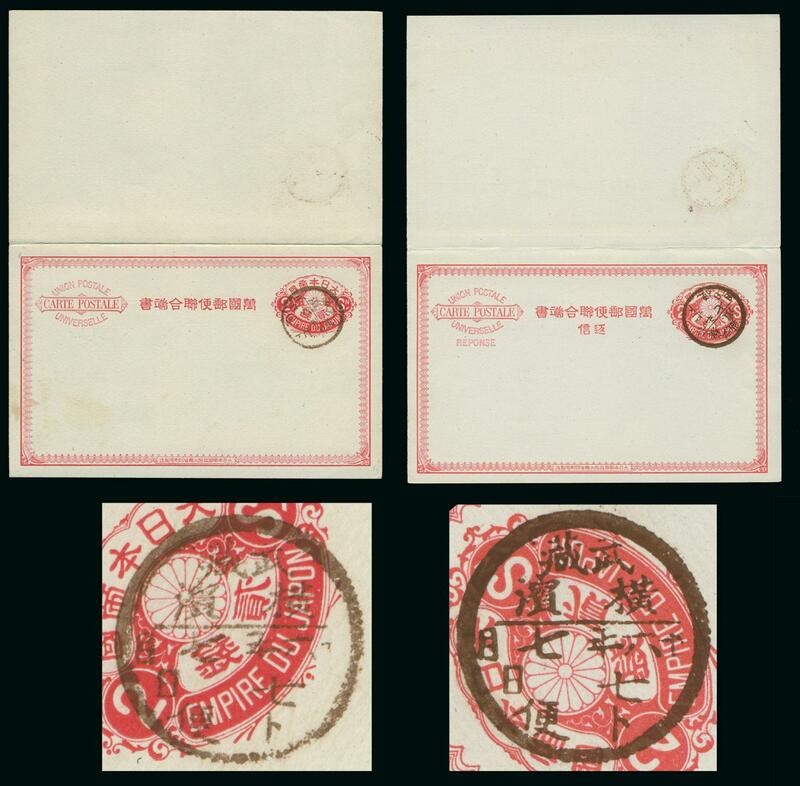 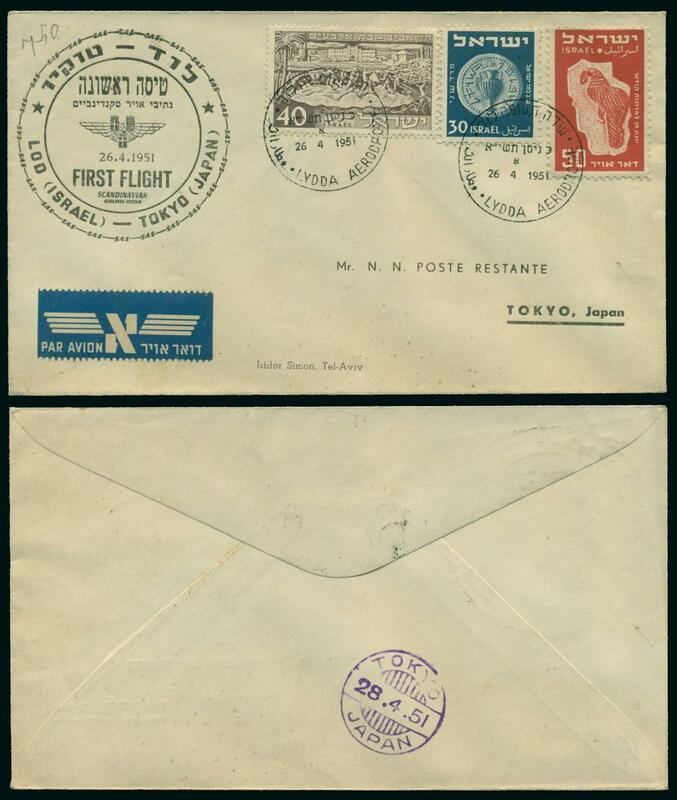 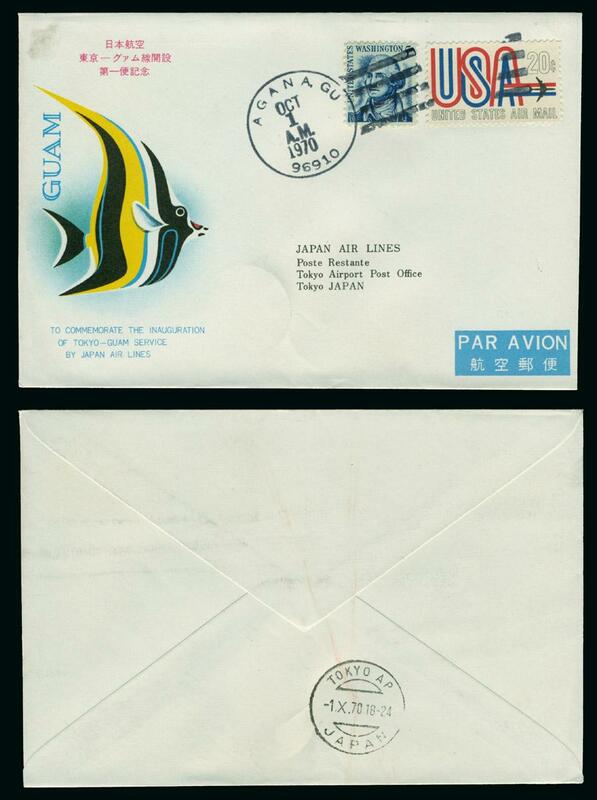 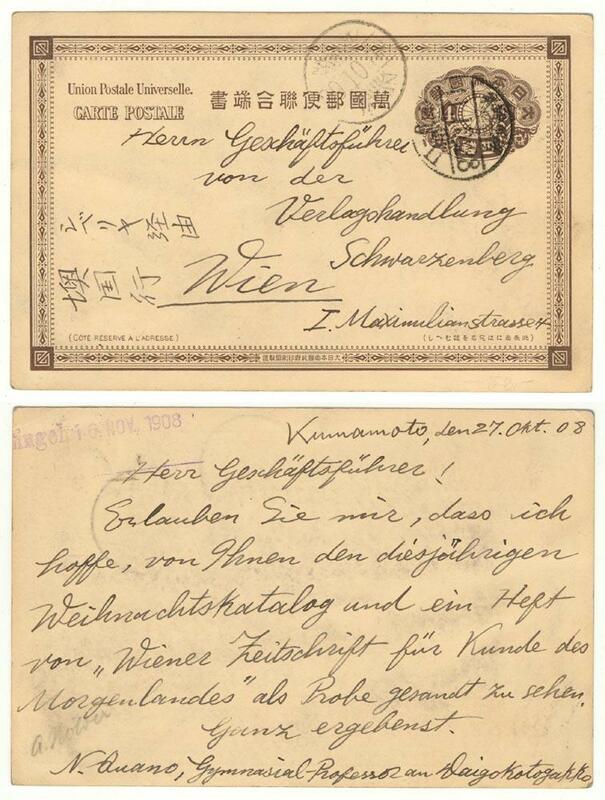 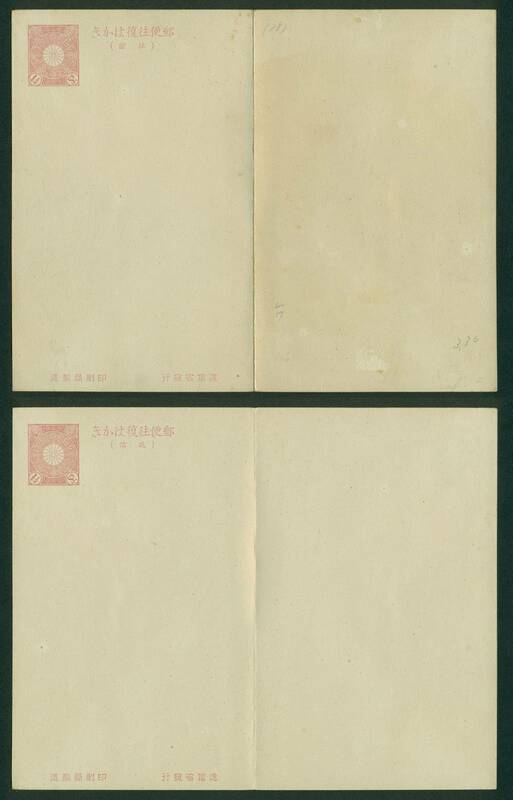 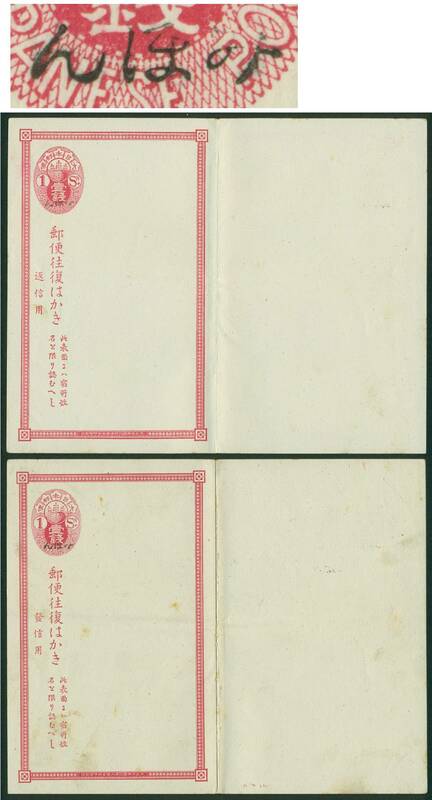 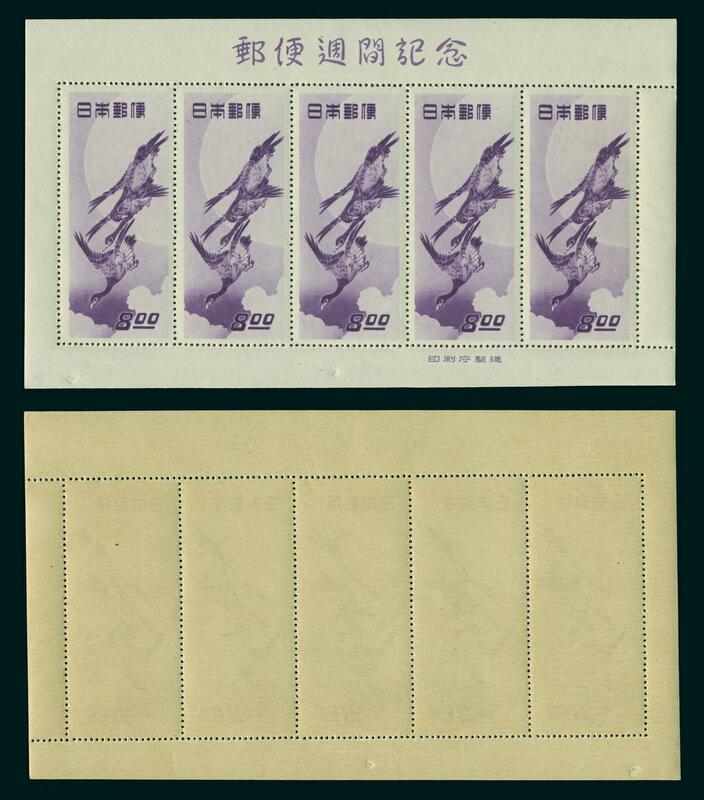 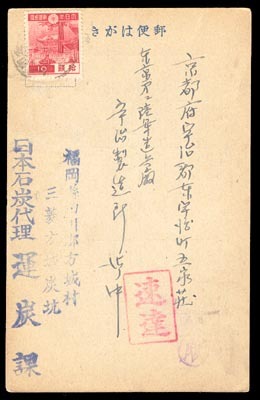 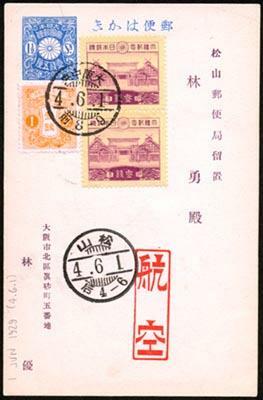 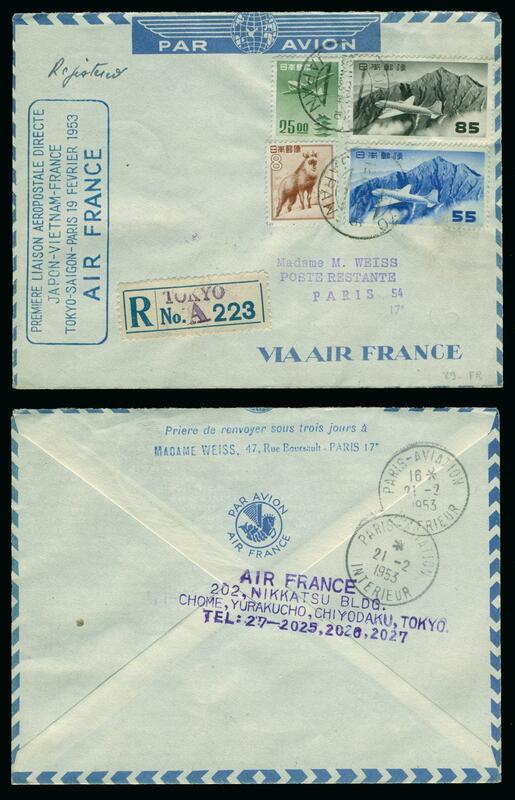 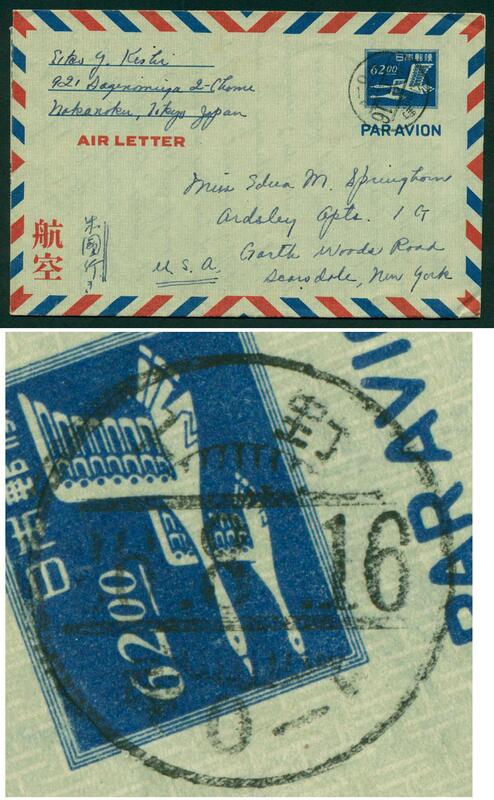 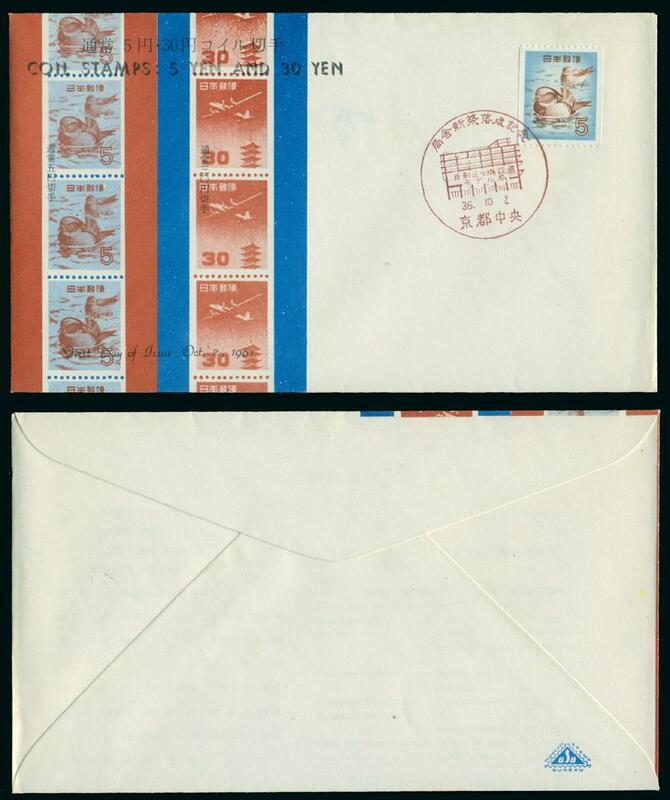 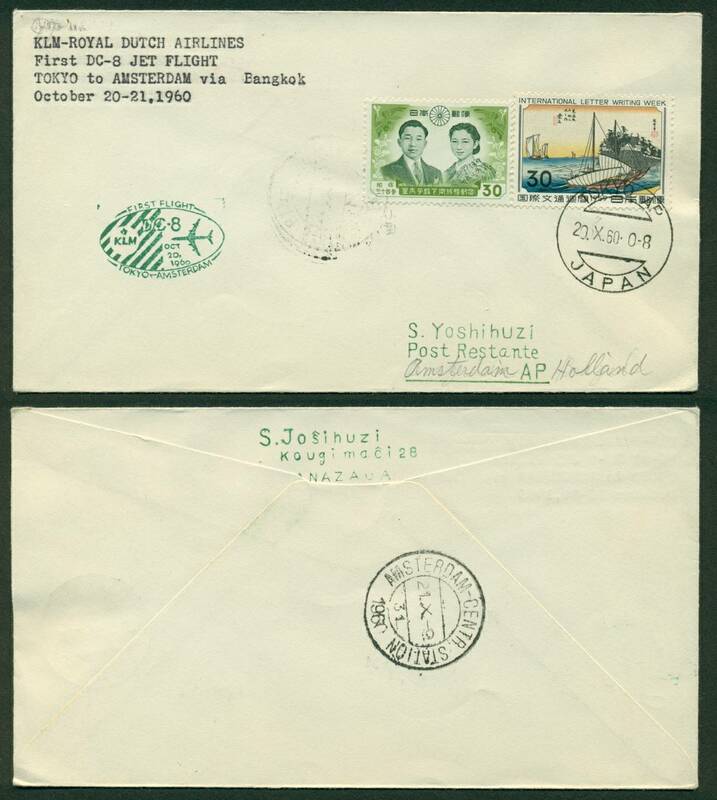 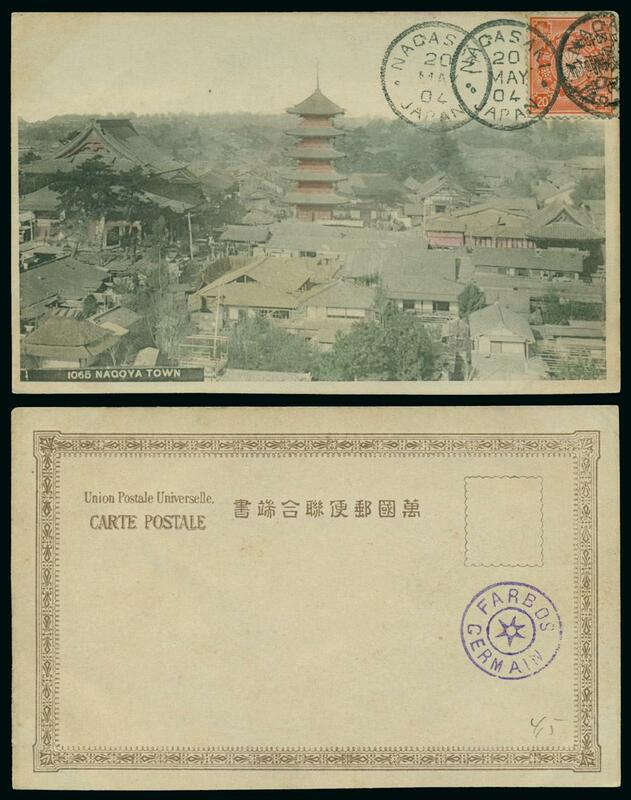 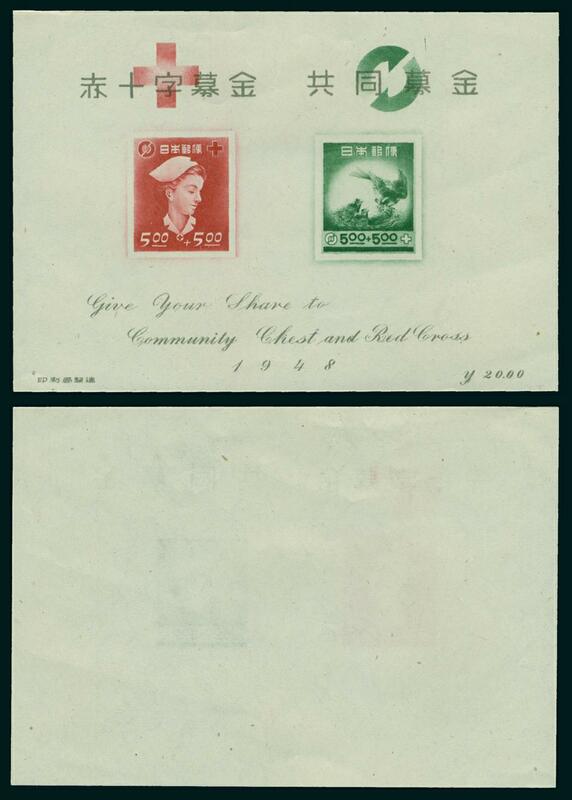 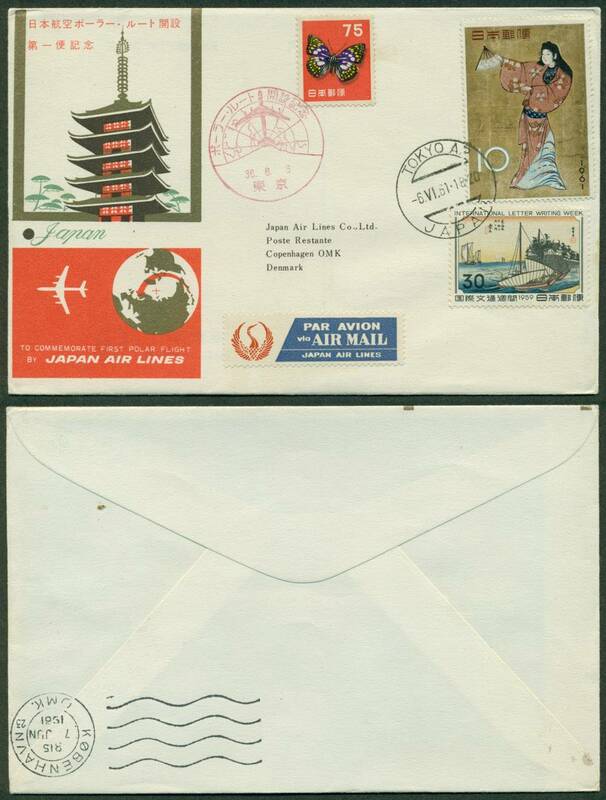 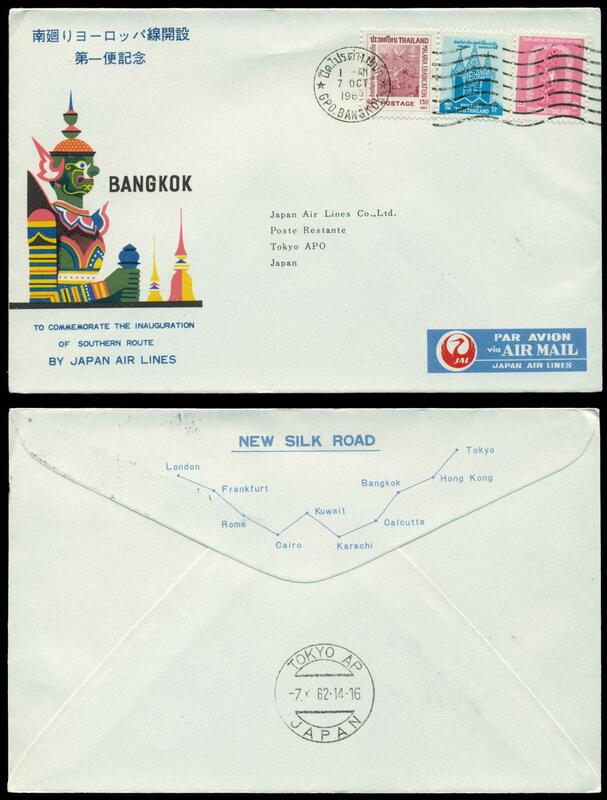 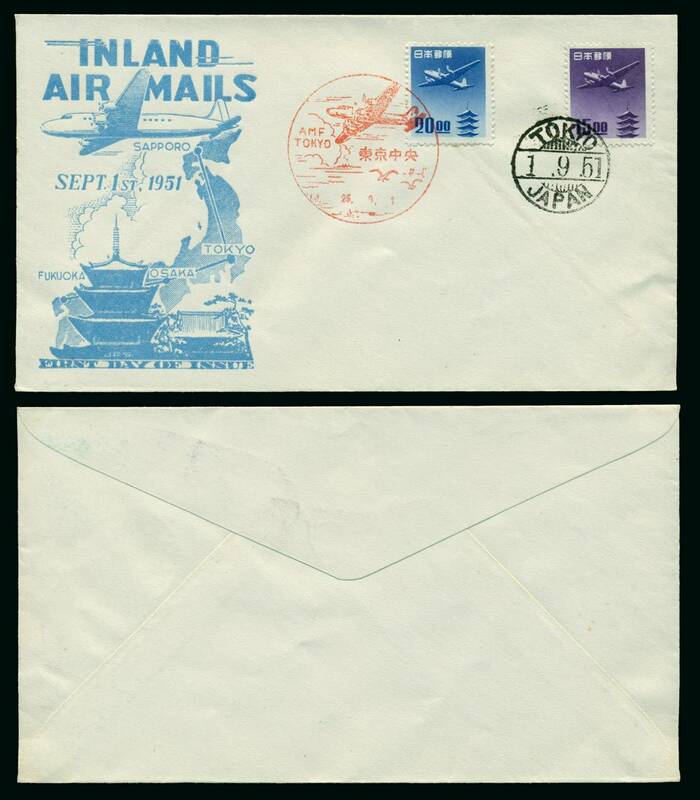 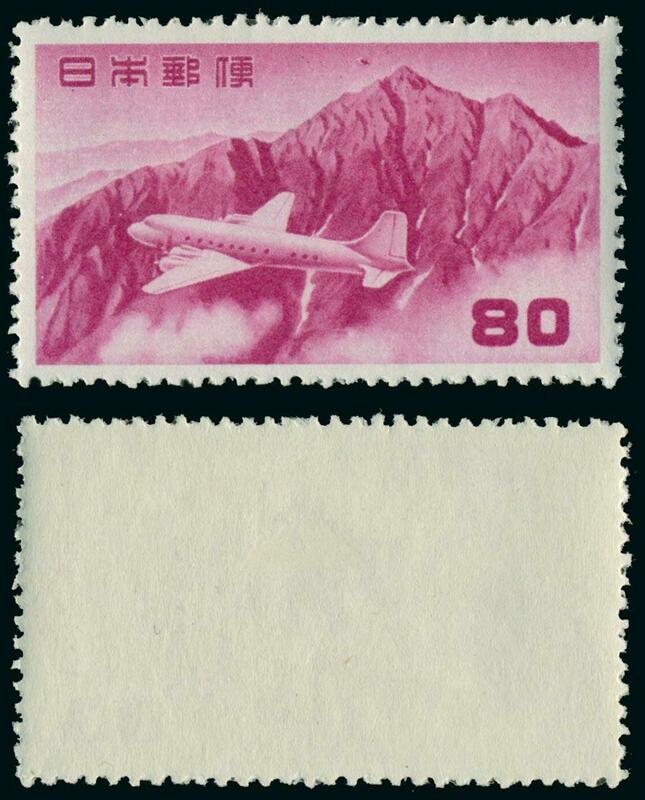 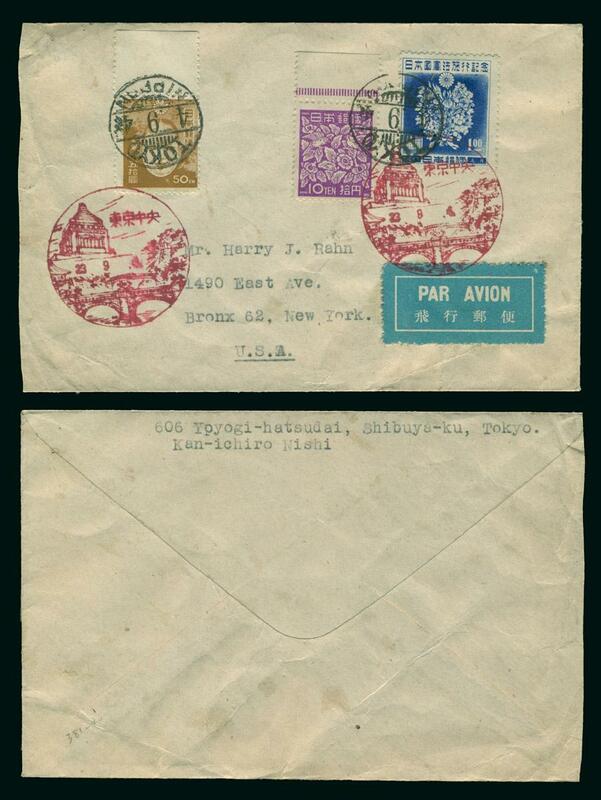 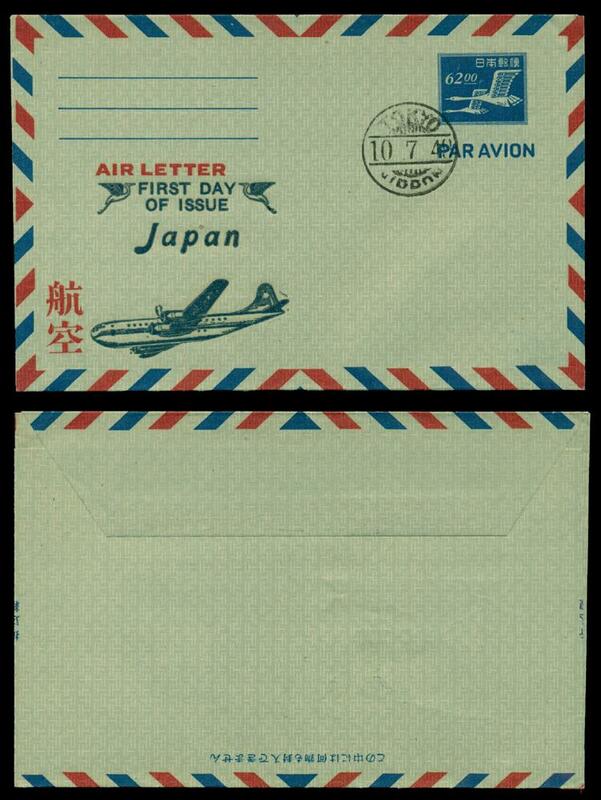 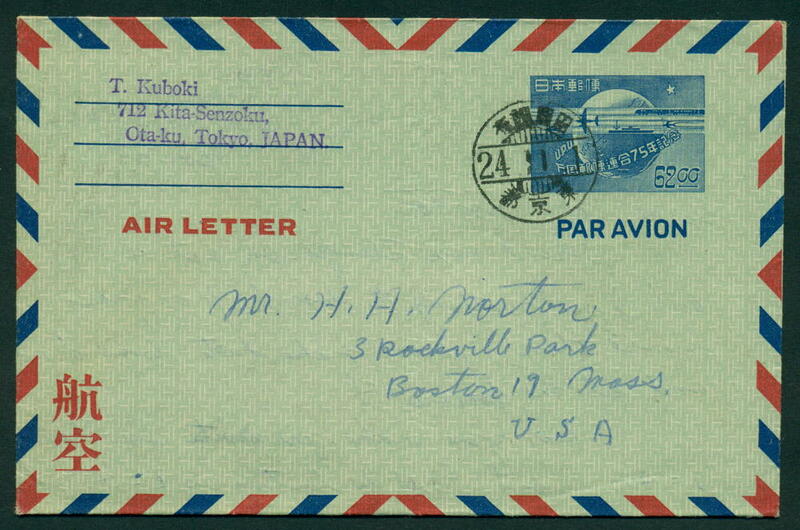 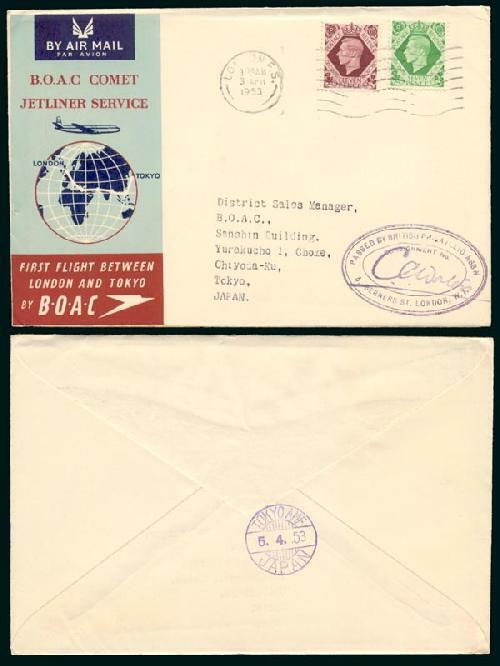 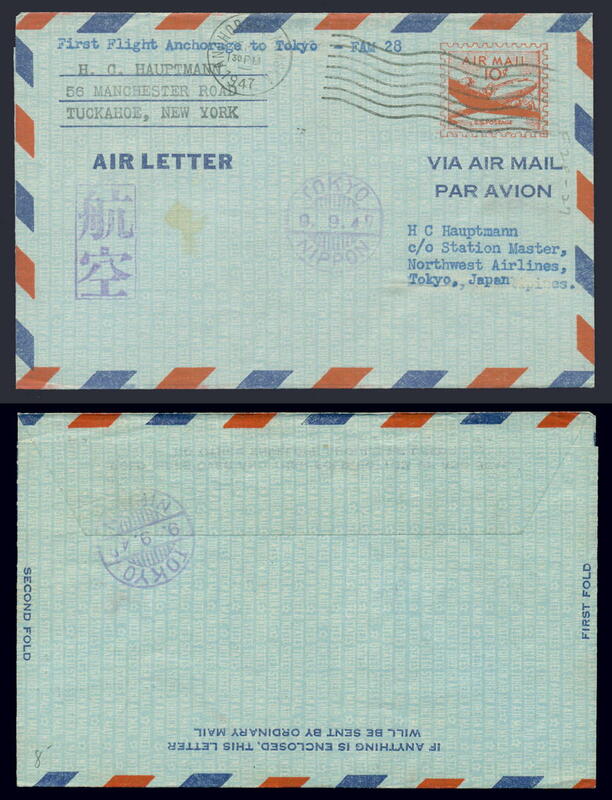 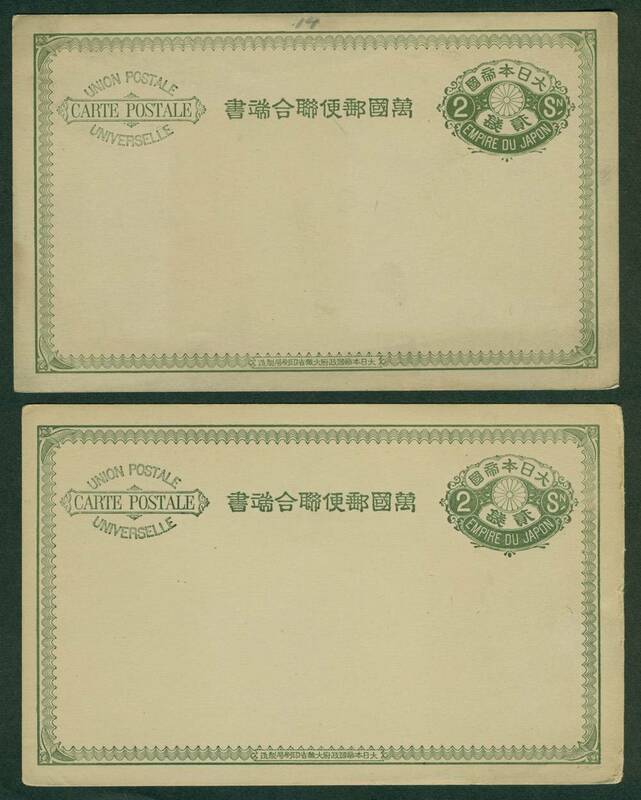 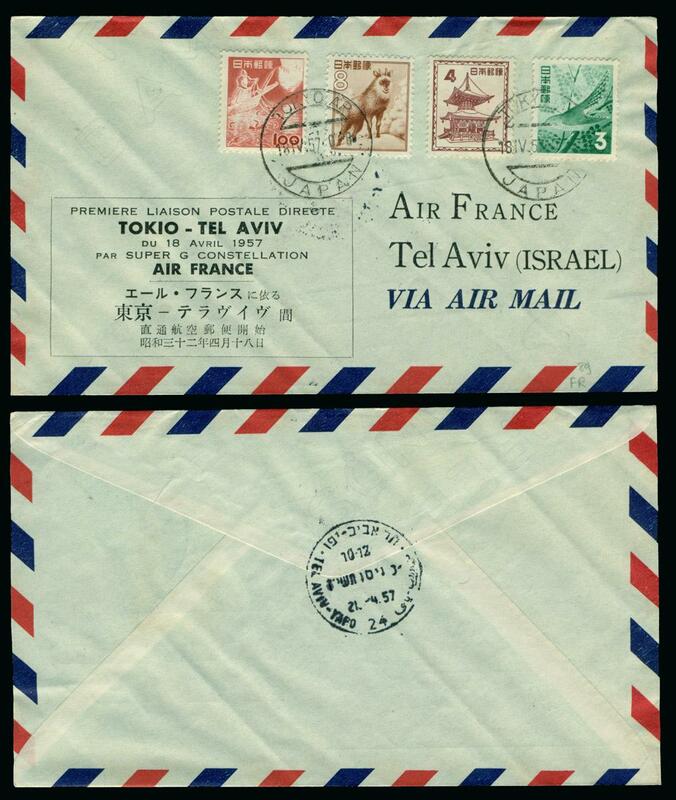 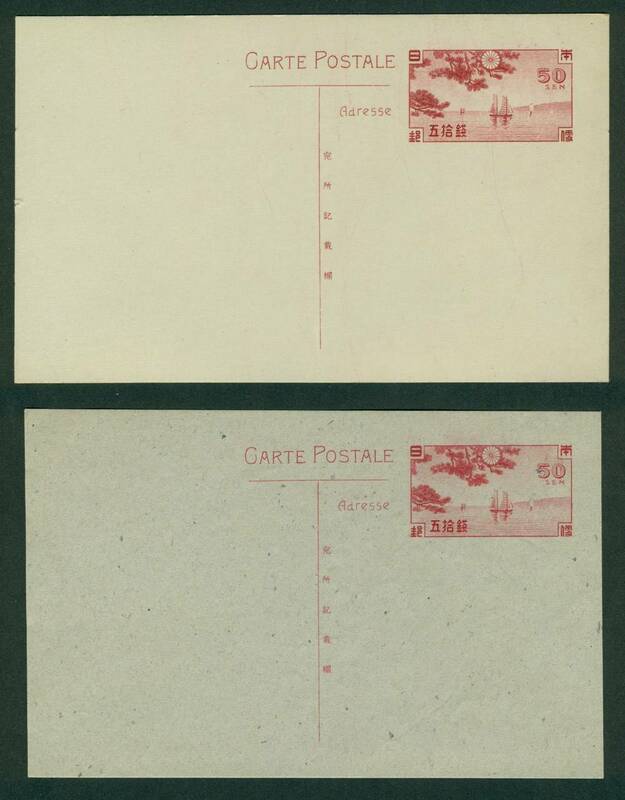 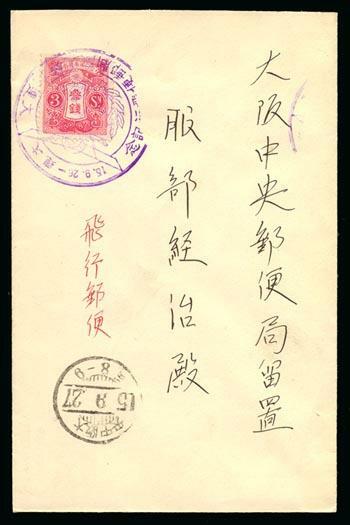 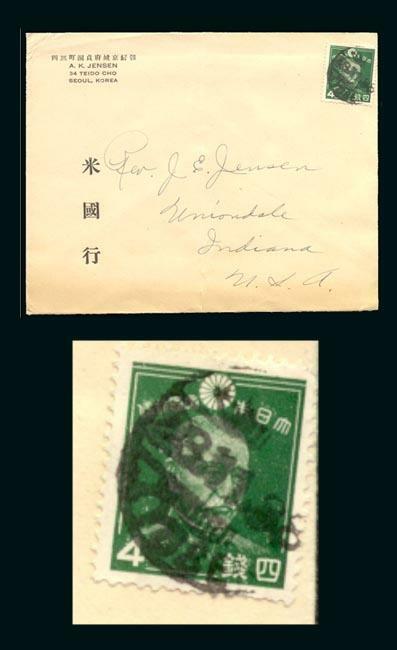 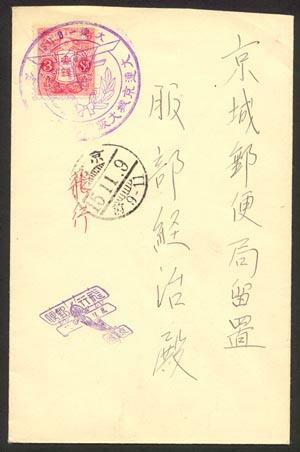 3.8.12 Japan domestic cancel on cover to Shanghai. 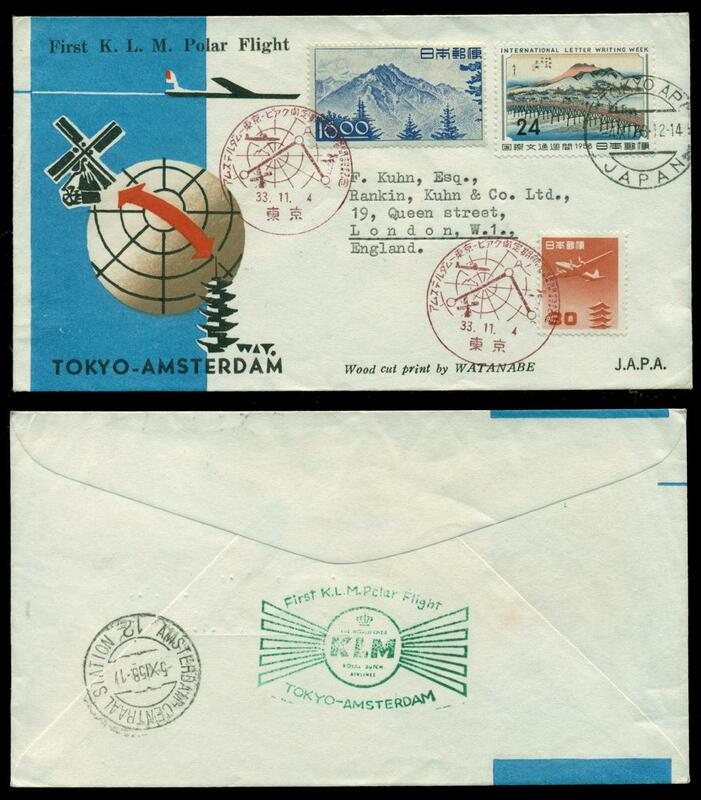 More (in and out) Japan related FFC here. 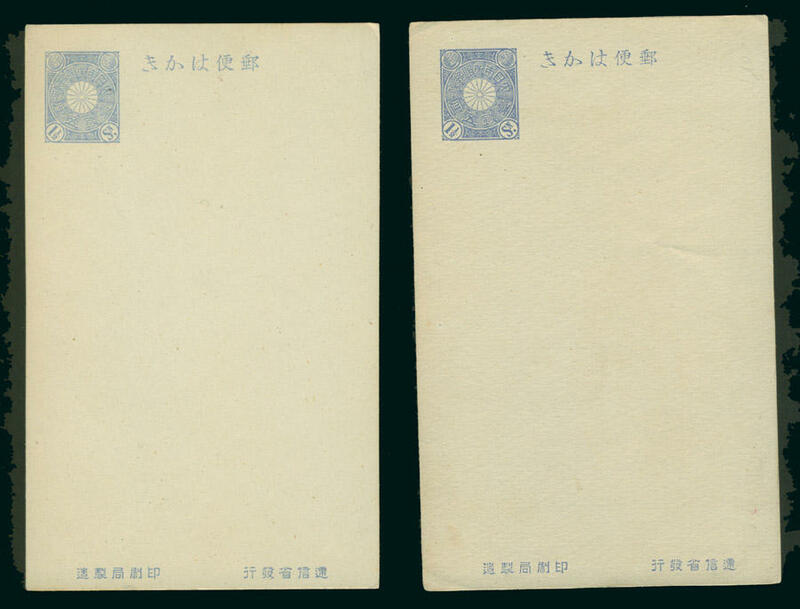 and measure 4 3/4 x 3 3/4 in (12.2 x 9.5 cm). 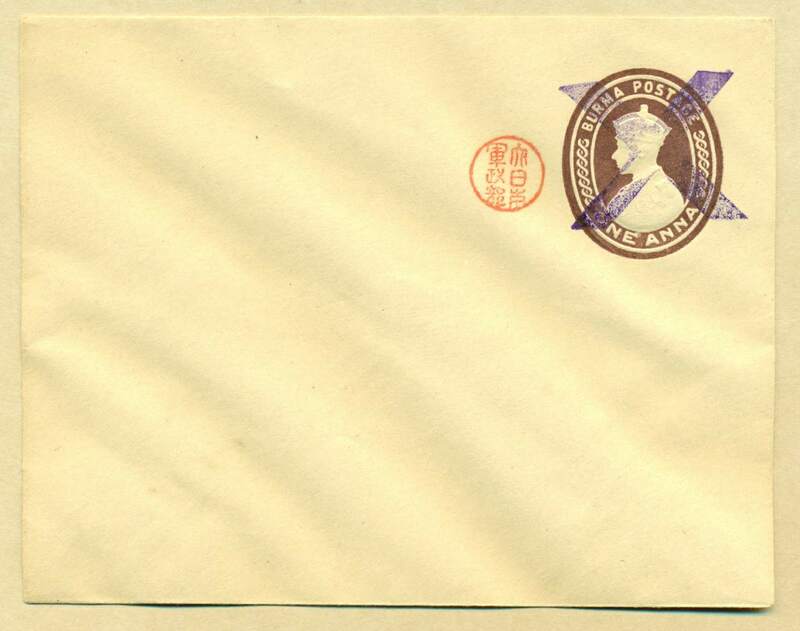 On all envelopes the back flaps are sealed. 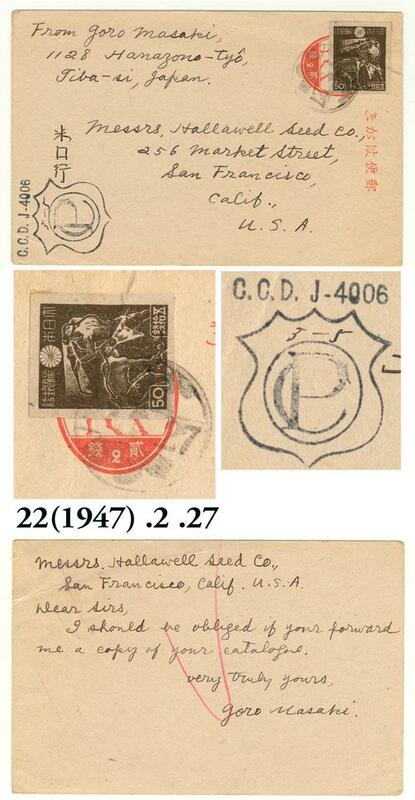 The numbers listed below are mine and not a catalogue number. 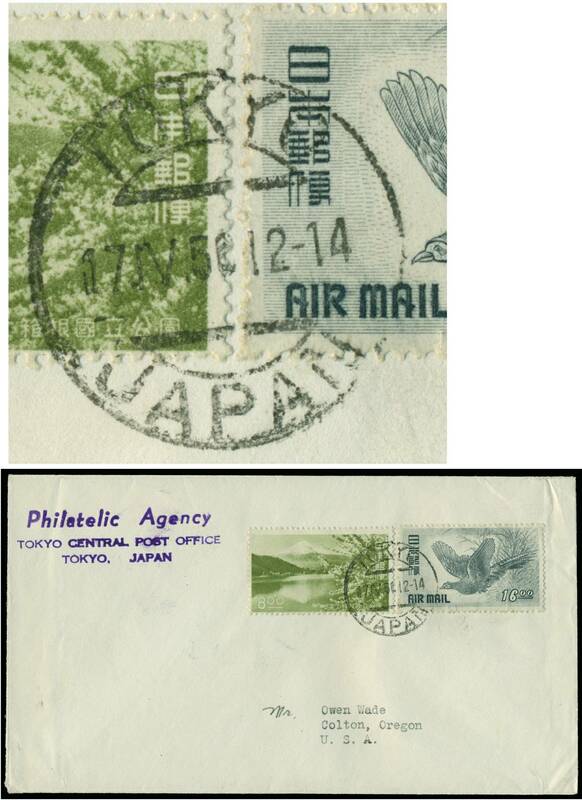 Note Regarding Postage on Philatelic Literature. 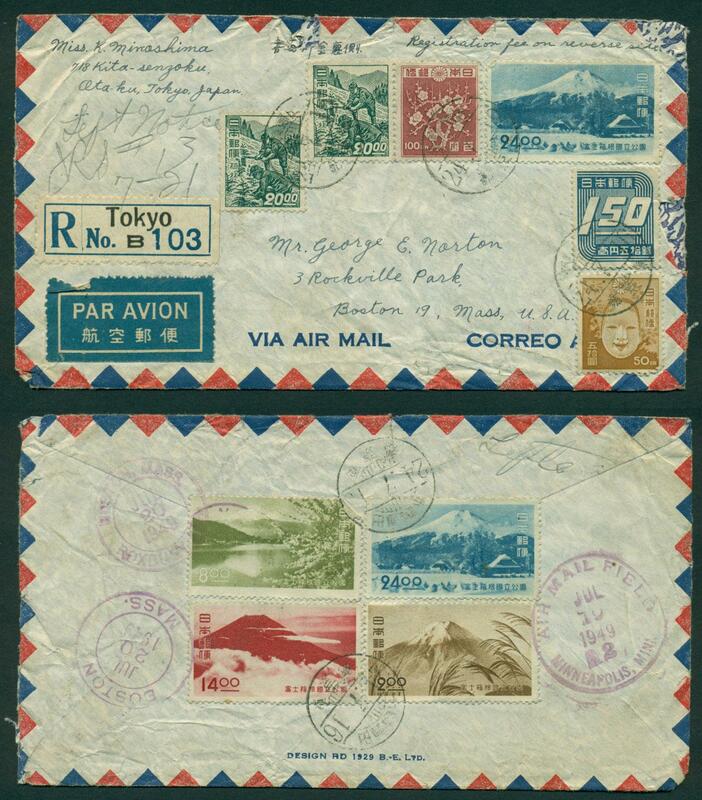 Shipment outside the US will be quoted at the airmail rate. 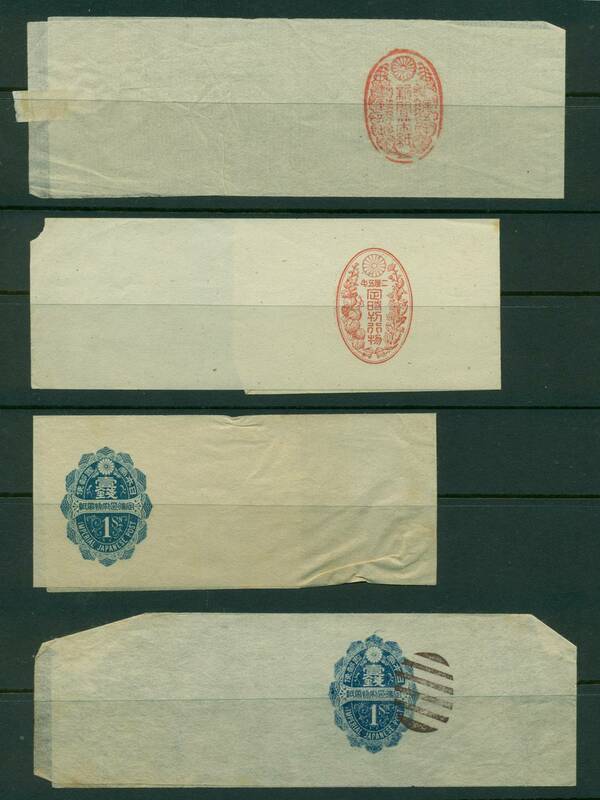 Within the US, postage by media mail will be $4.50 per item. 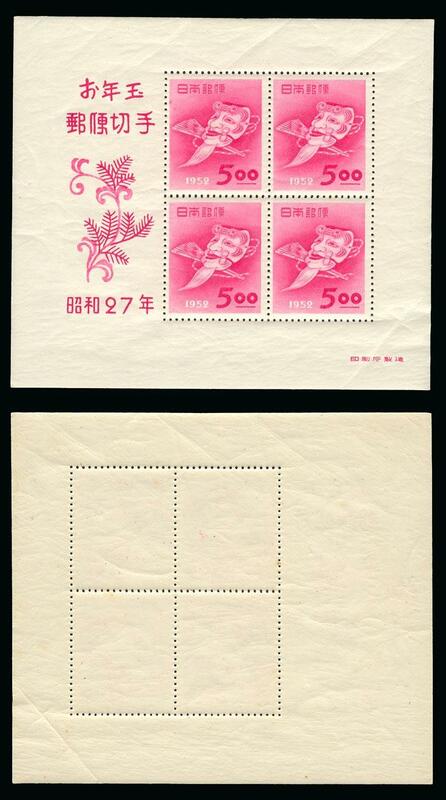 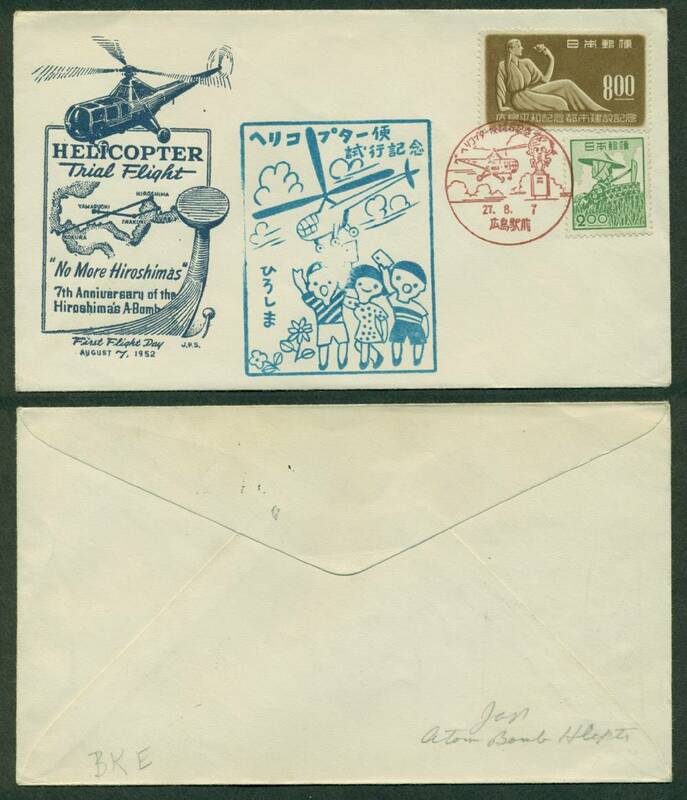 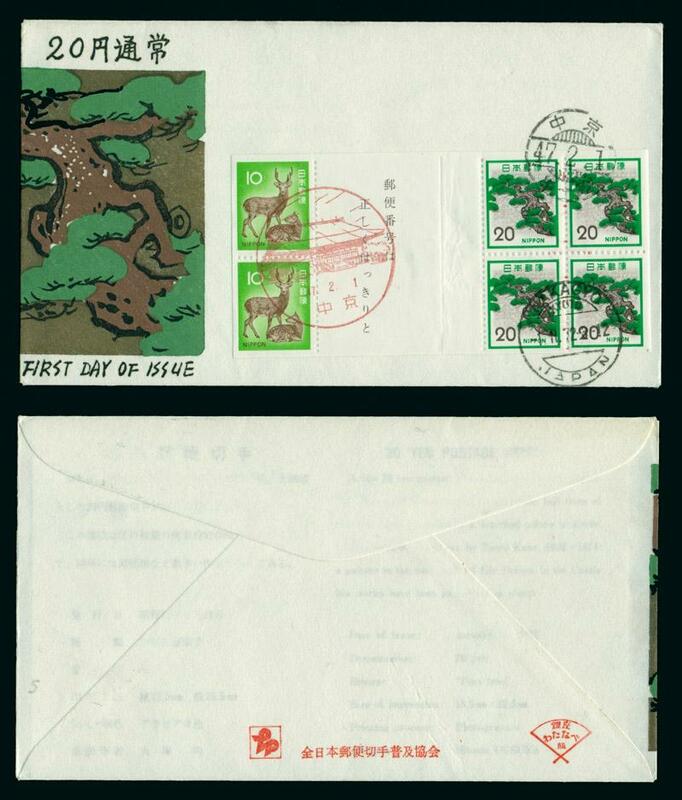 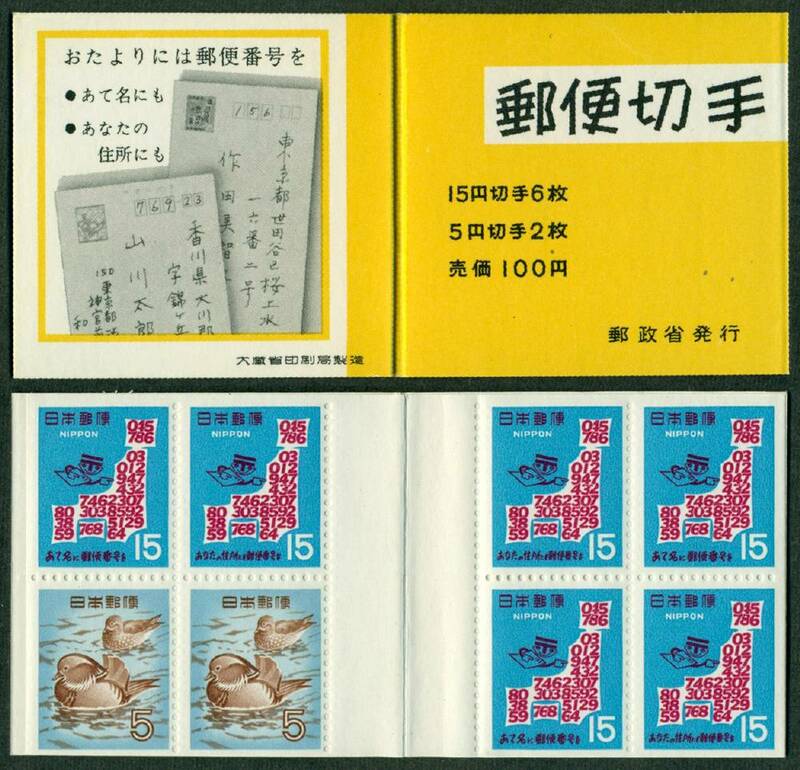 Three books by Dr Soichi Ichida on the Dragon and Cherry Blossom Stamps. 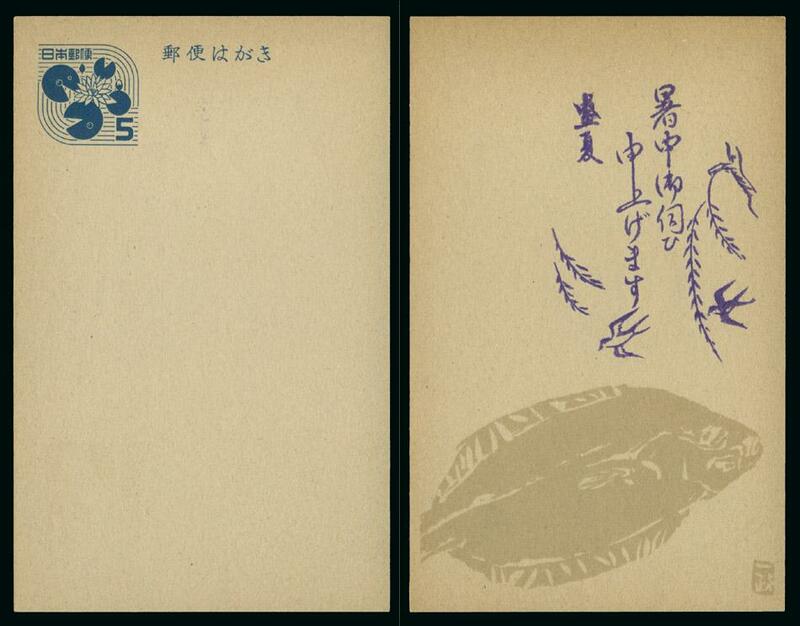 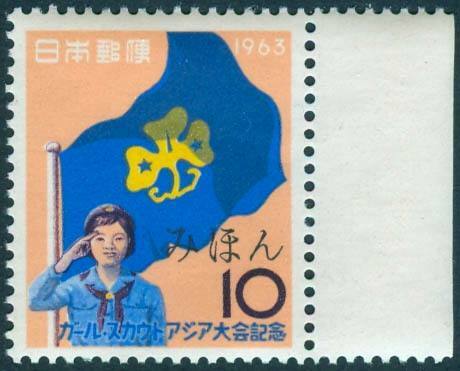 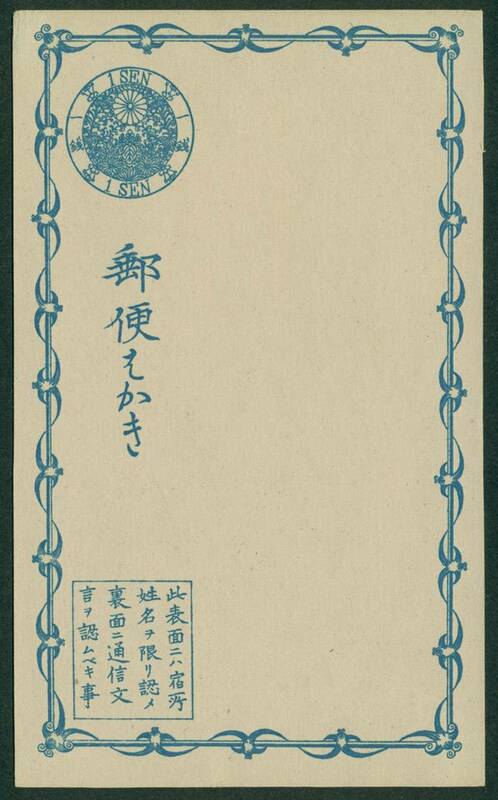 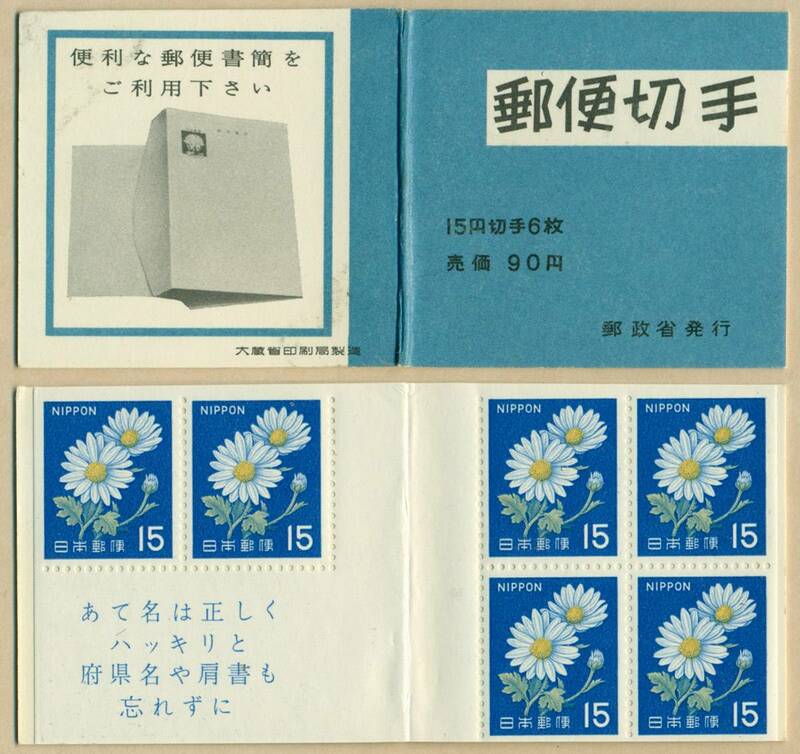 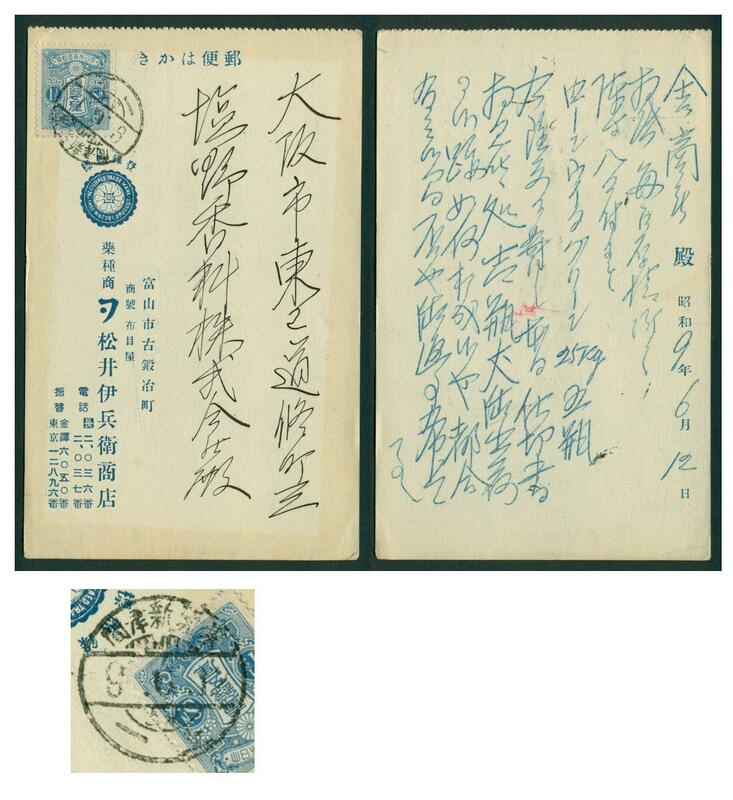 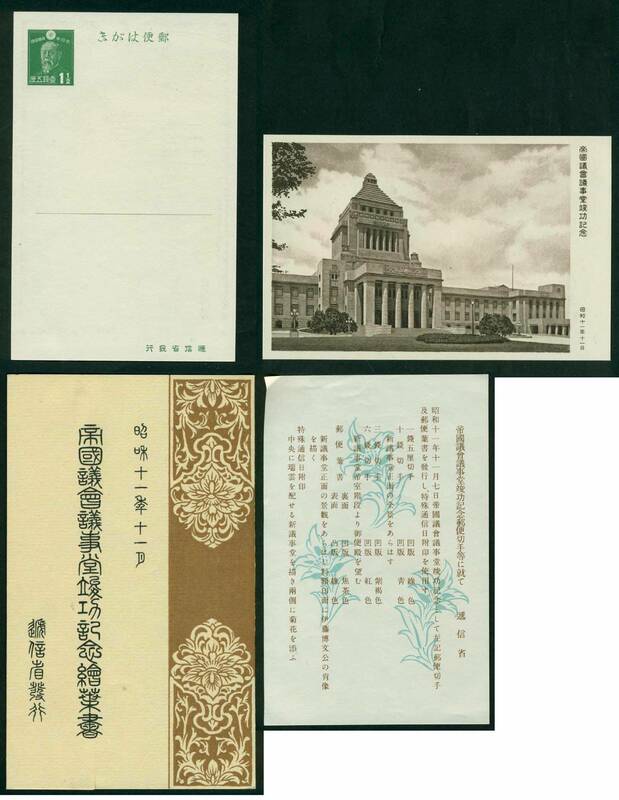 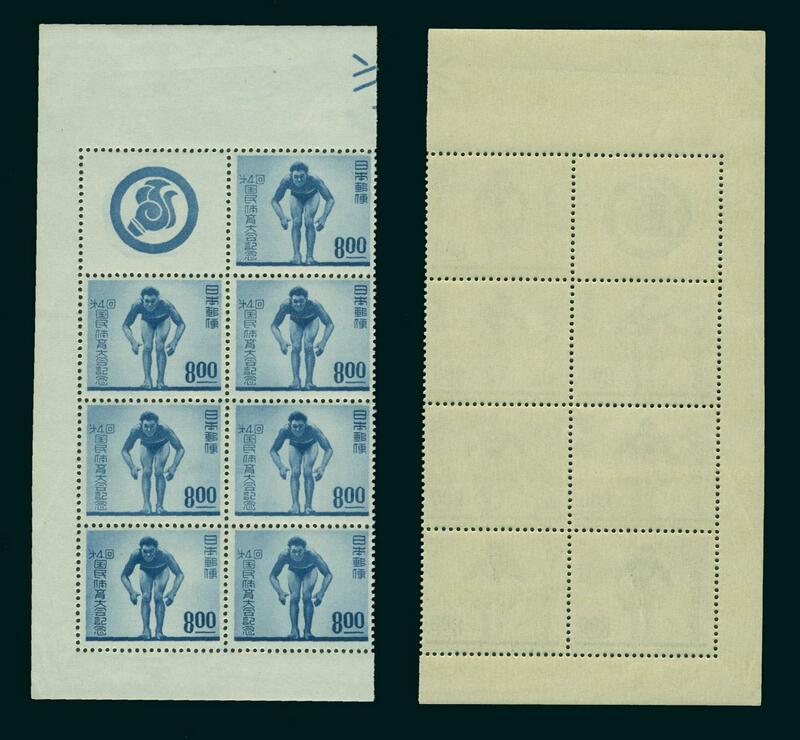 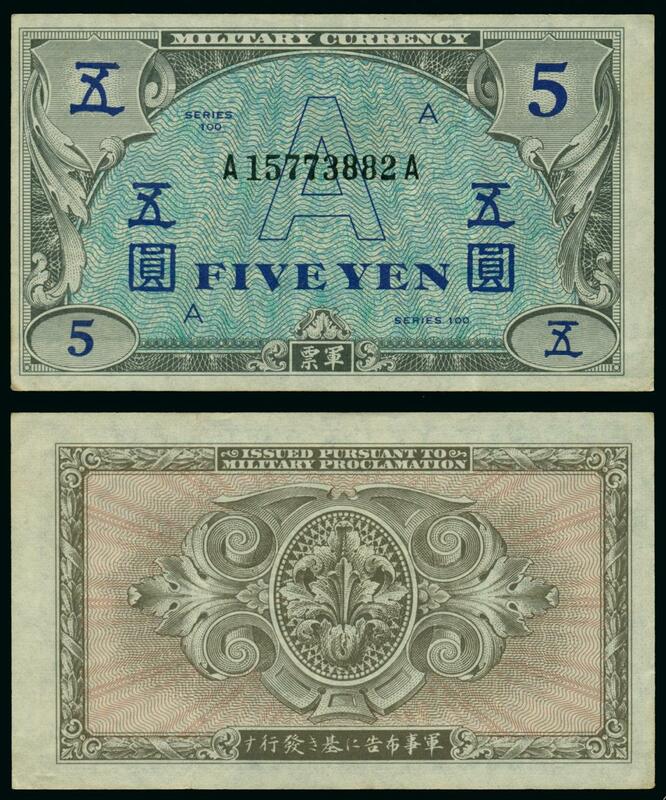 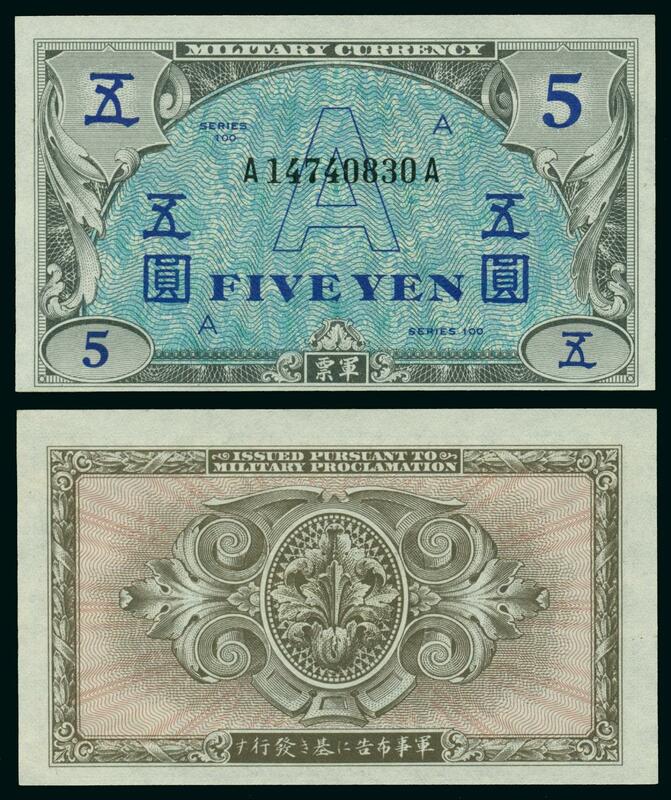 The One Sen Blue Cherry Blossom Stamp, Showa 45 (1970), Tokyo, dark blue half leather, light blue cloth with gilt lettering on front board and spine, 8vo (7 3/4 x 10 3/8 in - 19.2 x 26.4 cm), blue dust jacket, text in Japanese, 2 color plates with descriptive tissue guards (Figures 1 & 2), 147 illustrations (designated "Figures" and assigned numbers), 13 numbered "Tables," 329 pp. 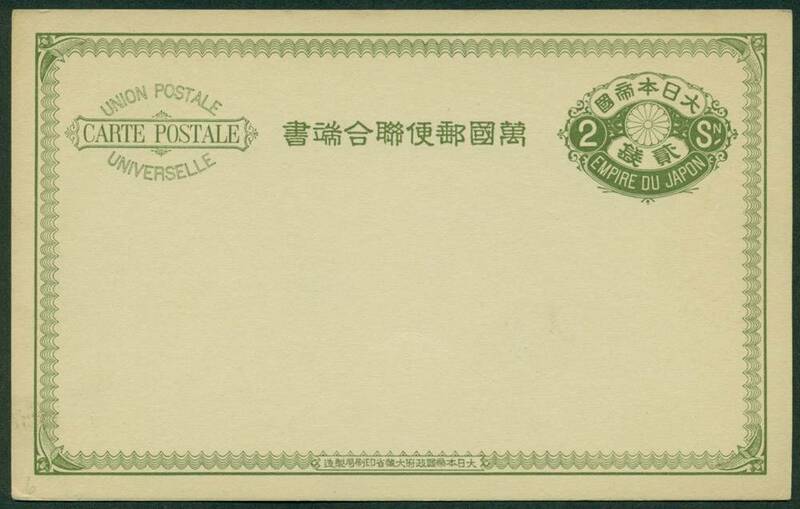 The Dragon Stamps of Japan, Showa 46 (1971), Tokyo, dark green half leather, light green cloth with gilt lettering on front board and spine, 8vo (7 3/4 x 10 3/8 in - 19.2 x 26.4 cm), light green dust jacket, text in Japanese, 2 color frontispiece plates, 115 text illustrations predominately in black and white (designated "Figures" and assigned numbers), 6 plates in color (color plates A & B and "Figures" 22-3 (each figure has two plates), 2 appendices, 210 pp. 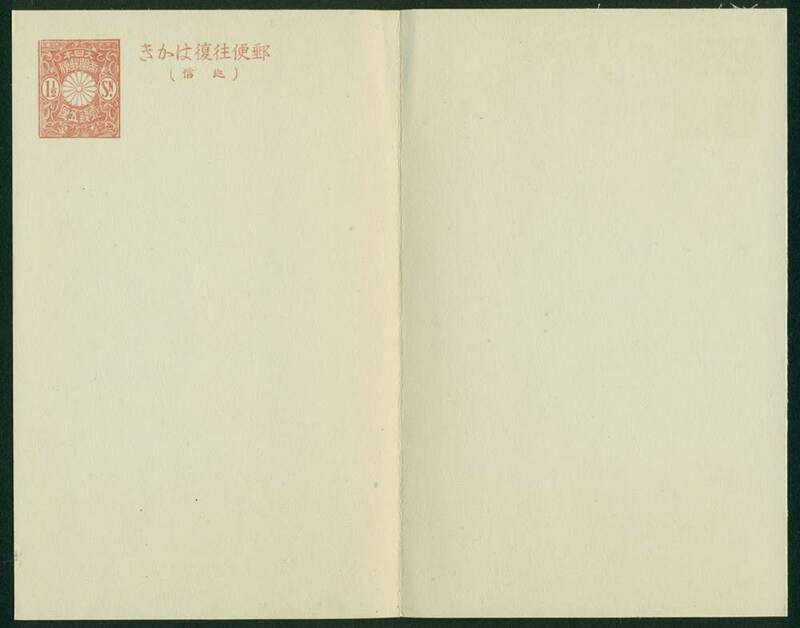 The Cherry Blossom Issues of Japan, 1872-1876, Showa 57 (1982), Tokyo, dark red half leather, light red cloth with gilt lettering on front board and spine, 8vo (7 3/4 x 10 3/8 in - 19.2 x 26.4 cm), red dust jacket, text in Japanese, 283 text illustrations predominately in color (designated "Figures" and assigned numbers), 13 numbered "Tables" of data, numerous unnumbered tables, 313 pp. 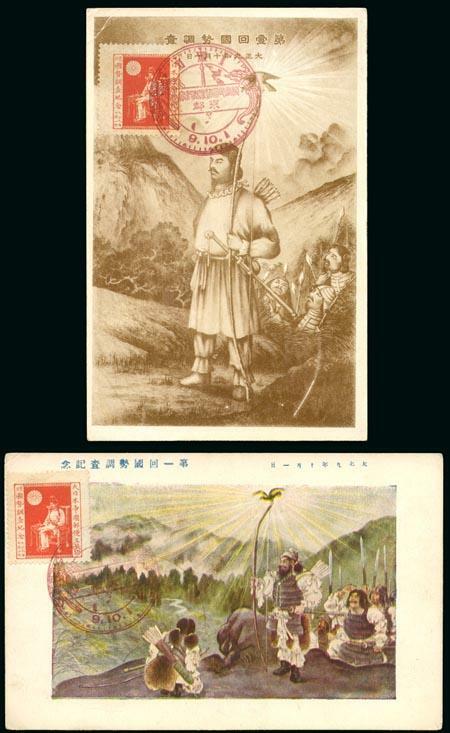 For more information on these three books, click here here. 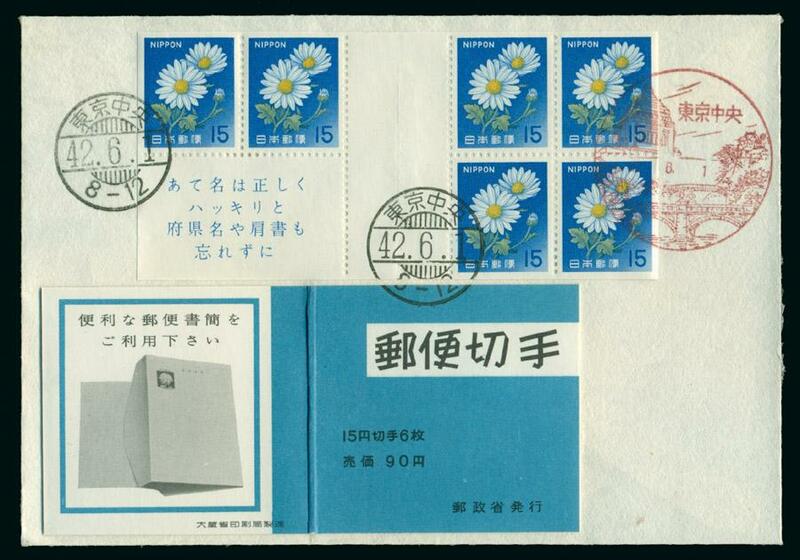 A Guide to the Cherry Blossom Series, I.S.J.P Monograph 2, (Japanese Philately, Vol 24: No 3, Part 3) Silver Spring, MD, The International Society for Japanese Philately, Inc, June 1969, 4to, paper wraps stable bound, 31 pp. 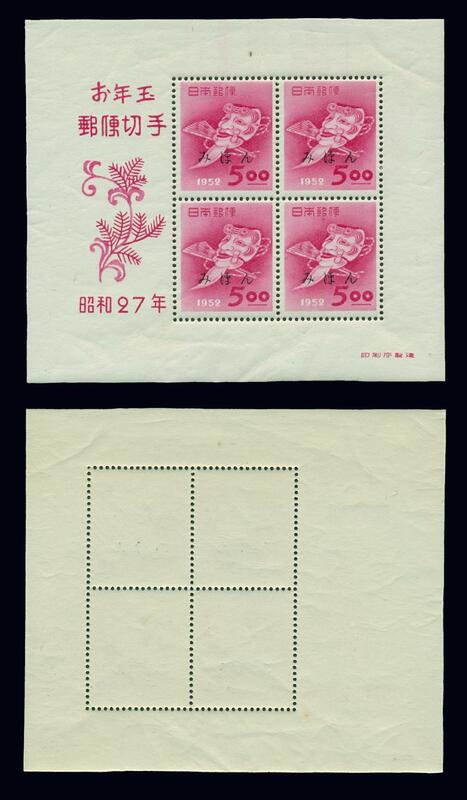 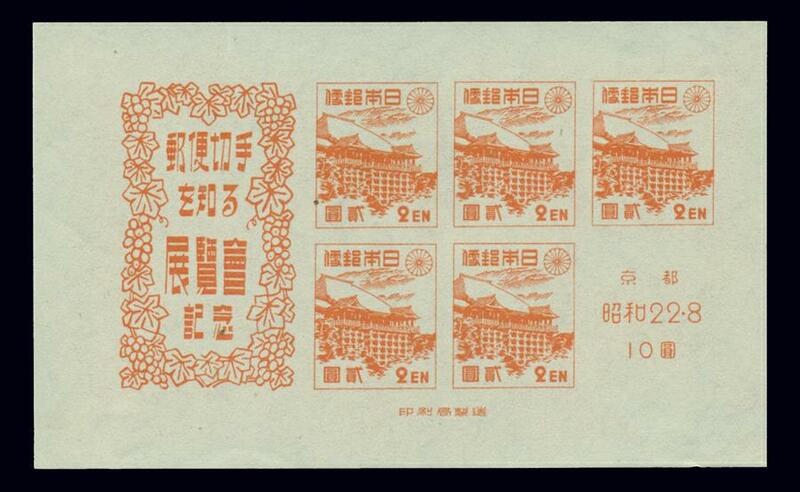 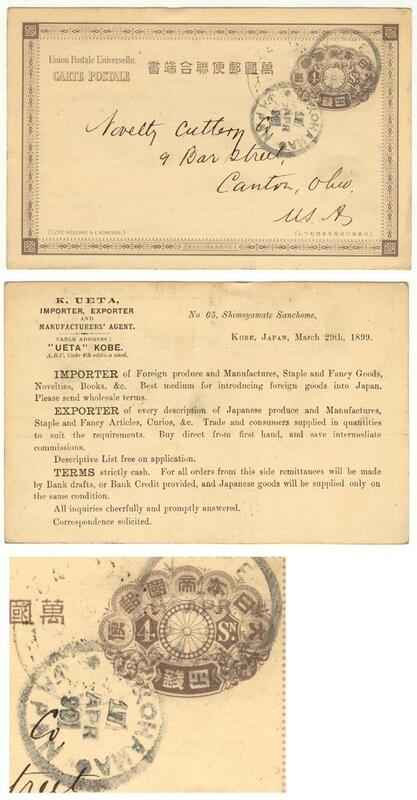 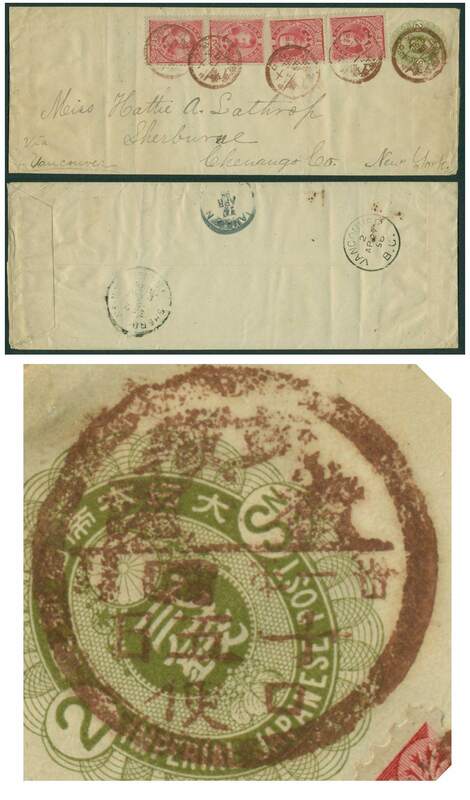 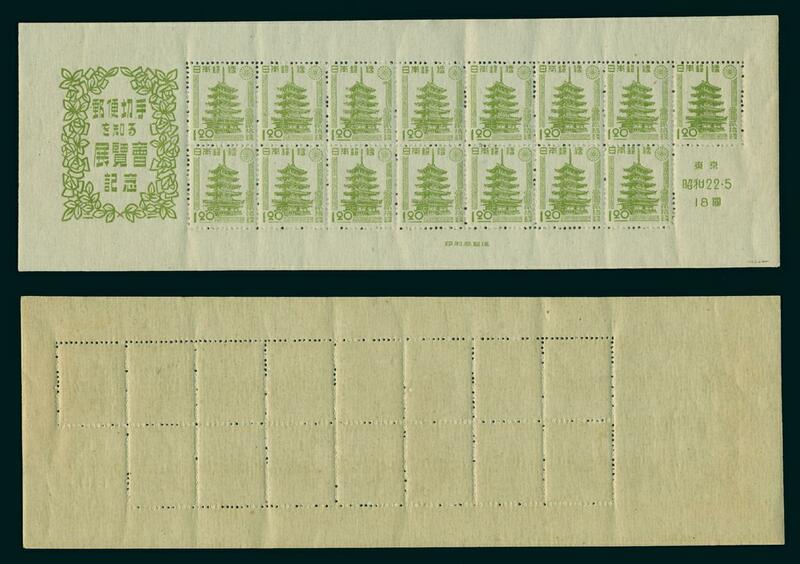 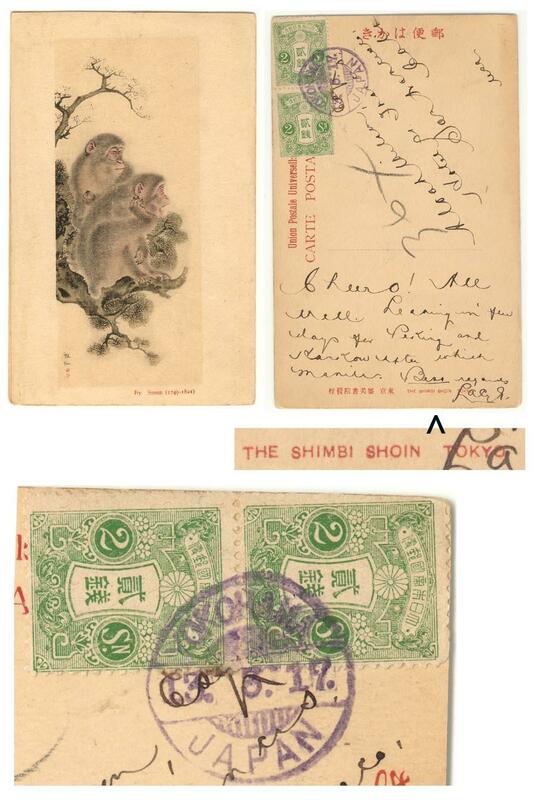 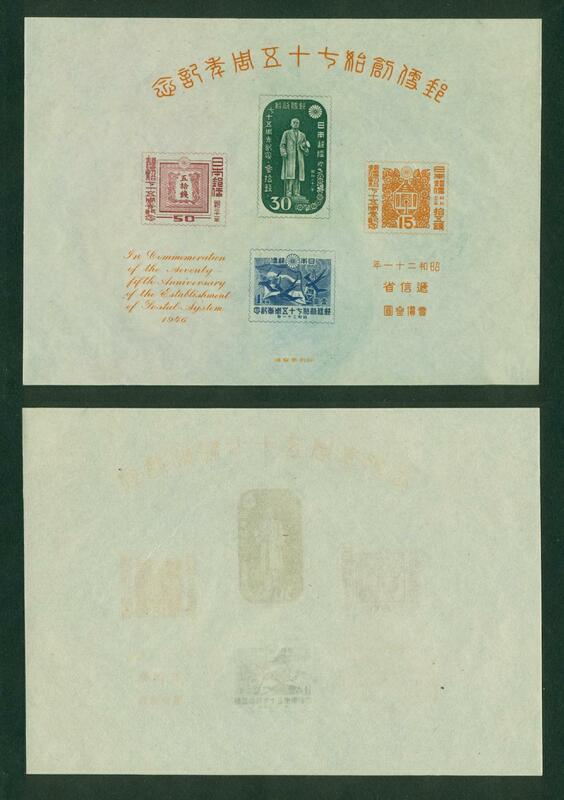 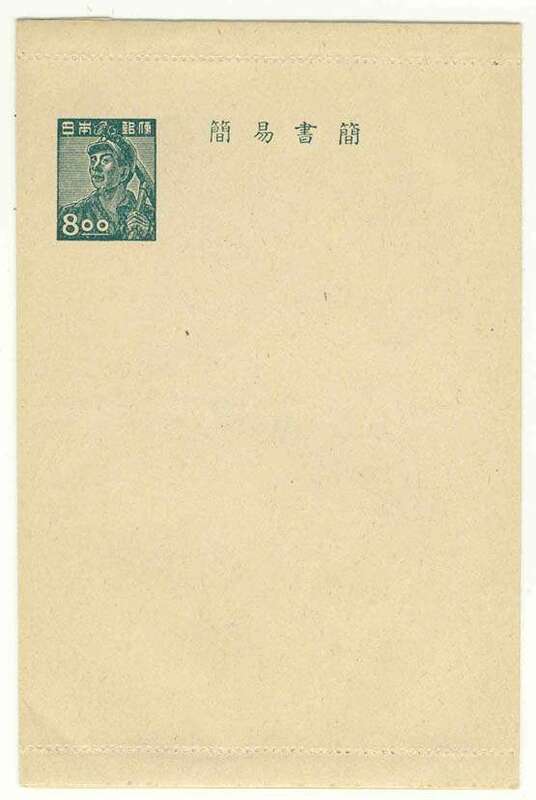 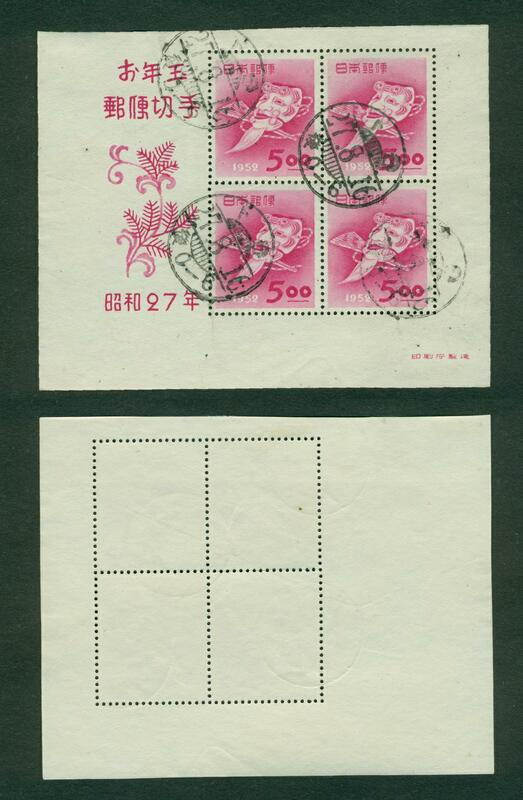 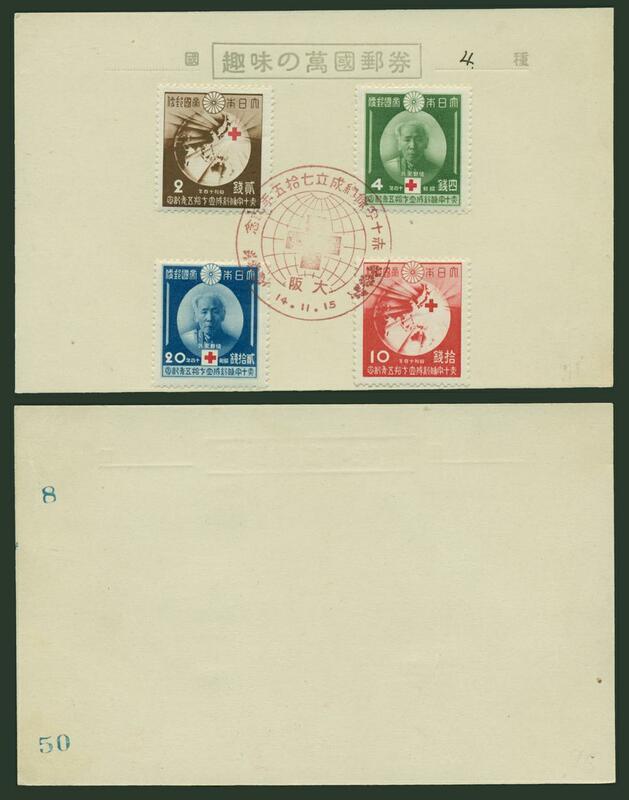 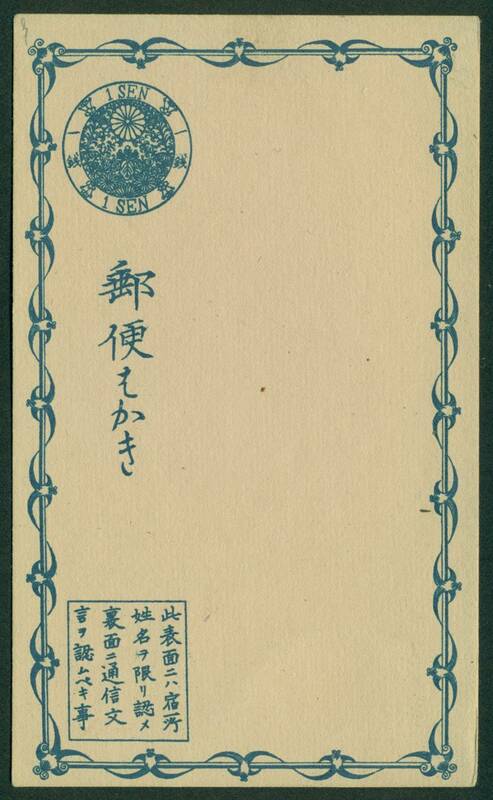 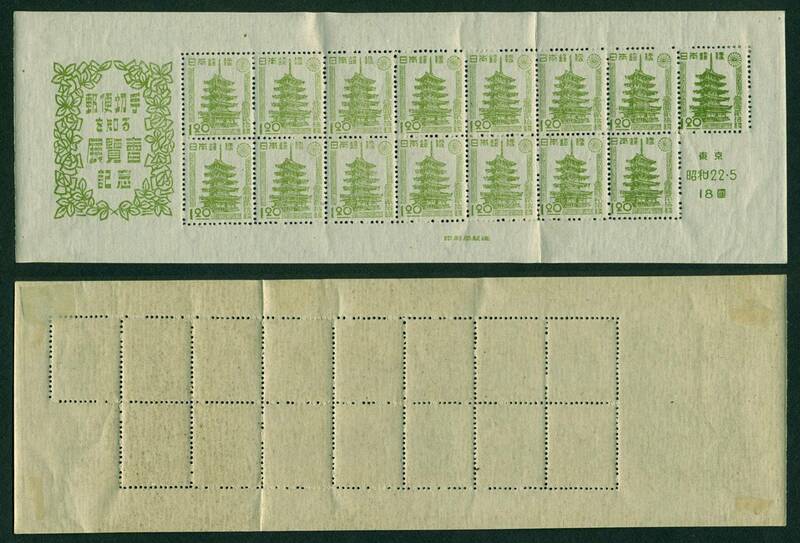 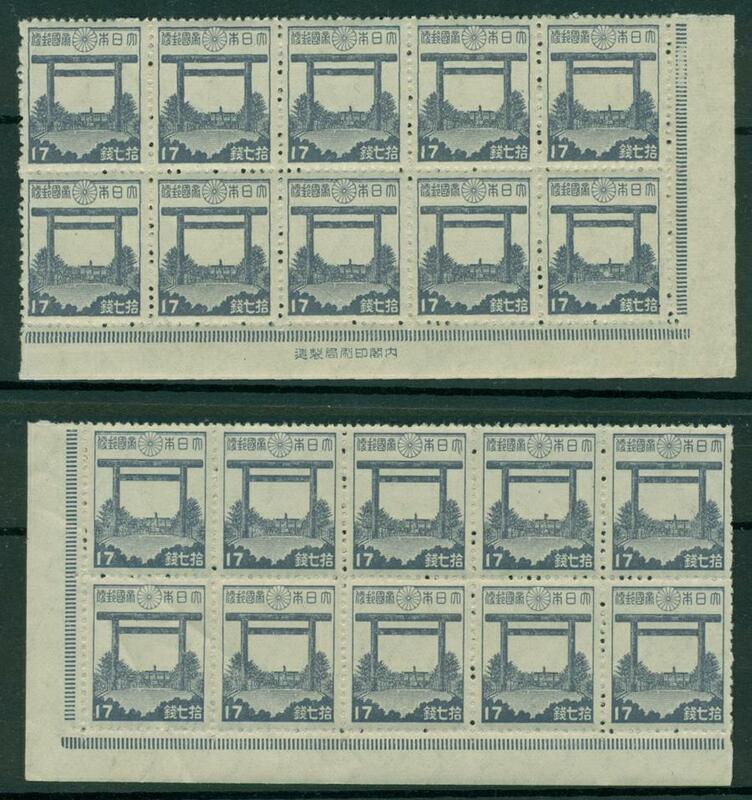 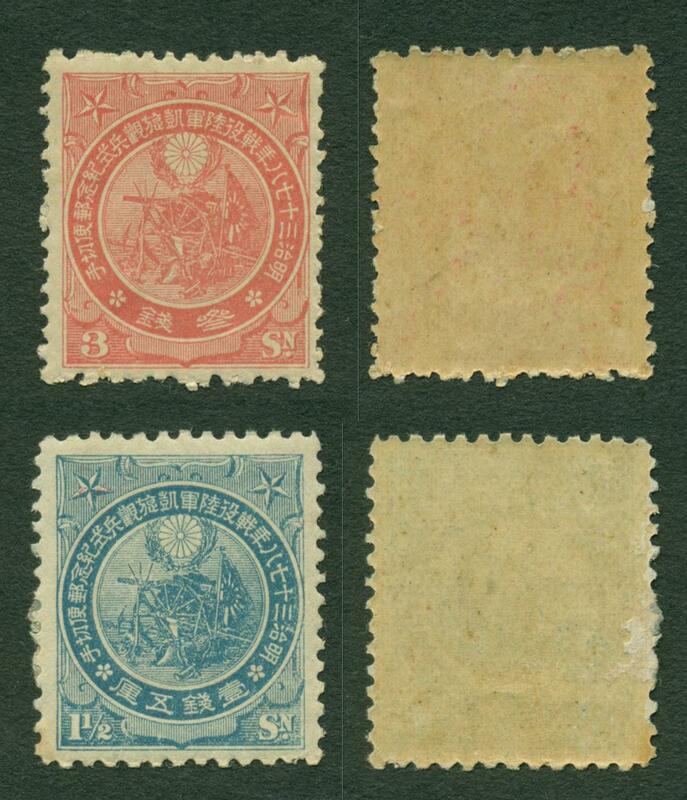 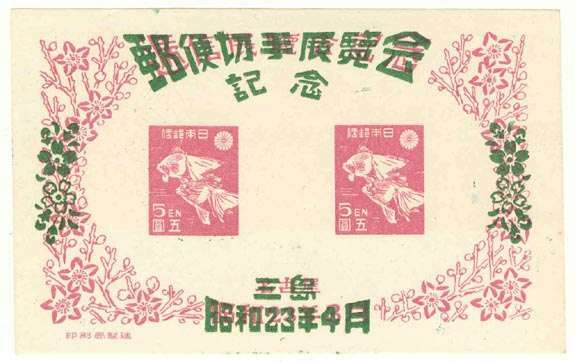 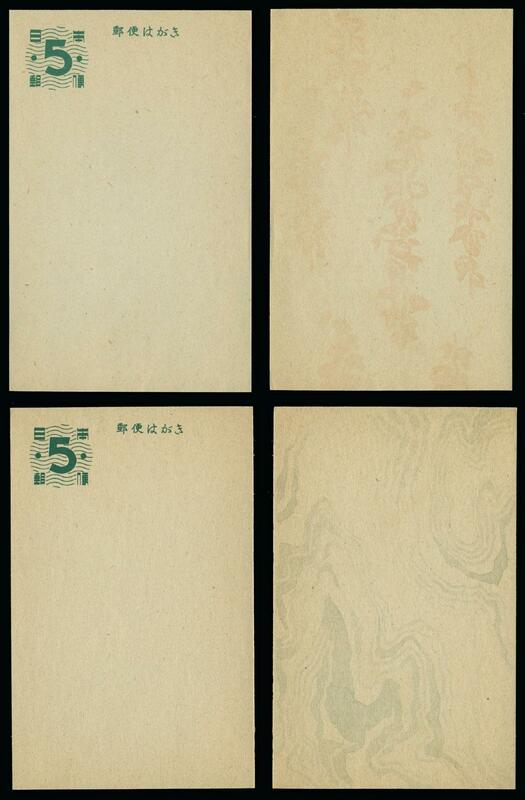 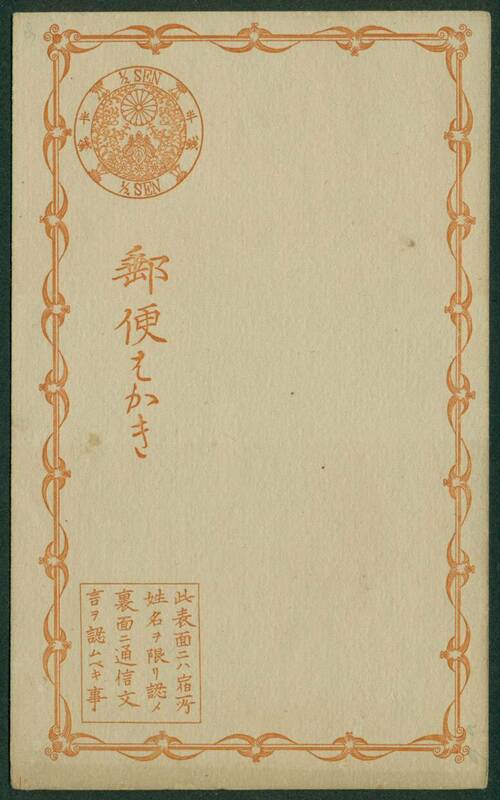 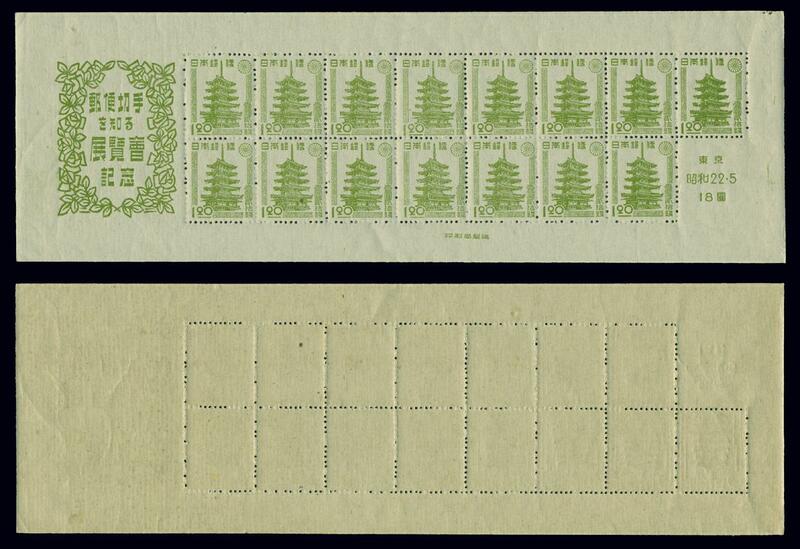 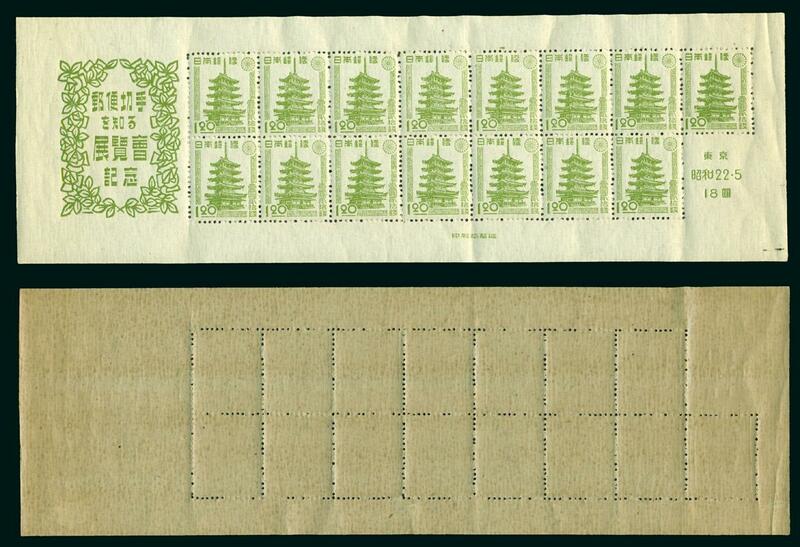 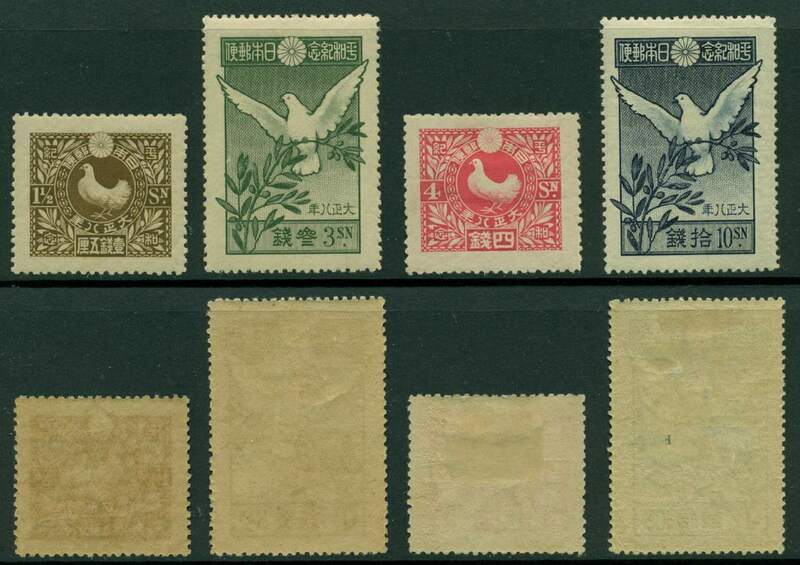 Sub-title: "The Japanese Cherry Blossom Issues - 1872-1876, Characteristics Identifying Genuine Stamps." 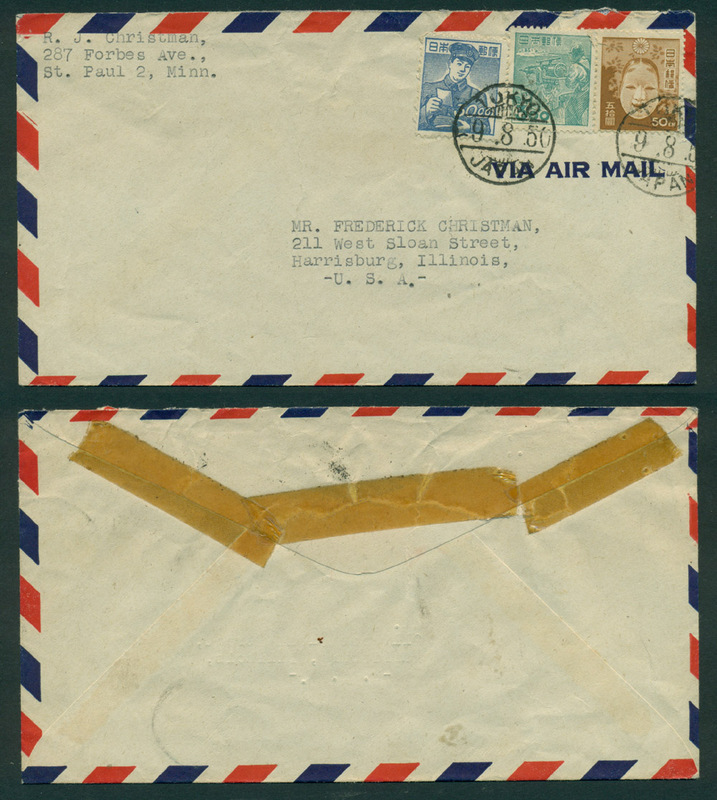 Forward by Varo E. Tyler. 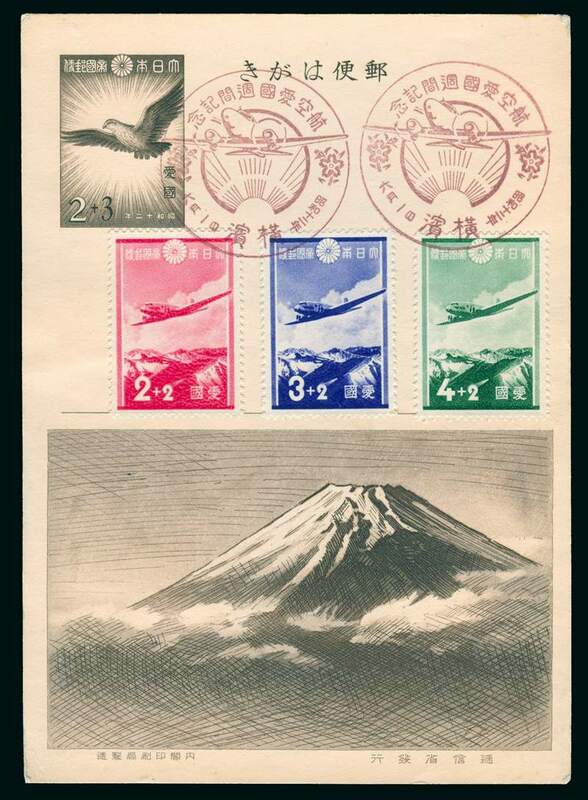 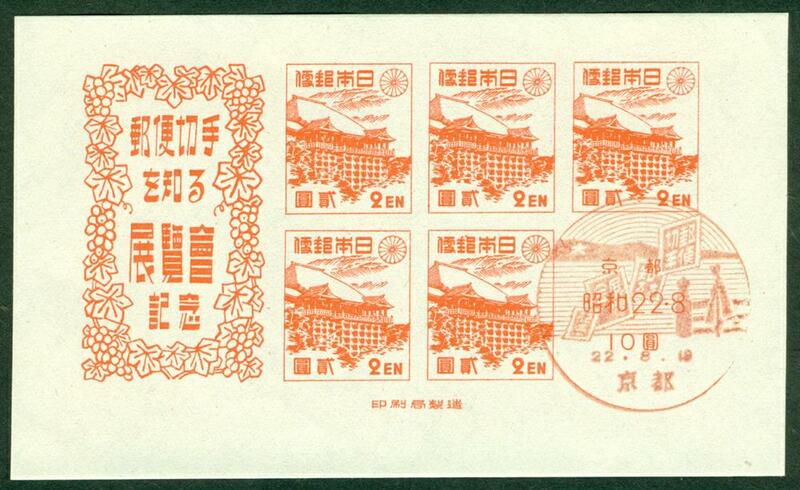 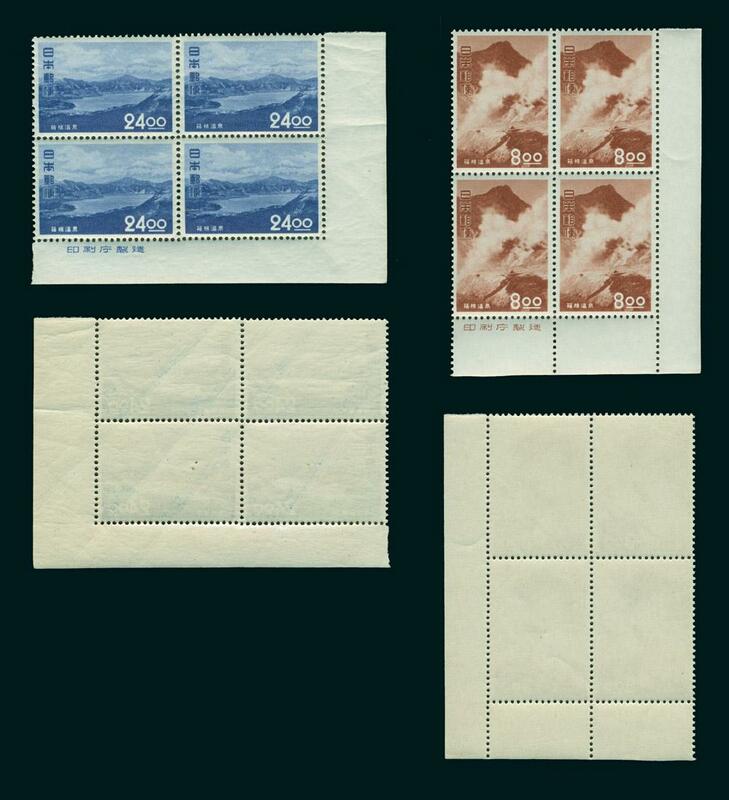 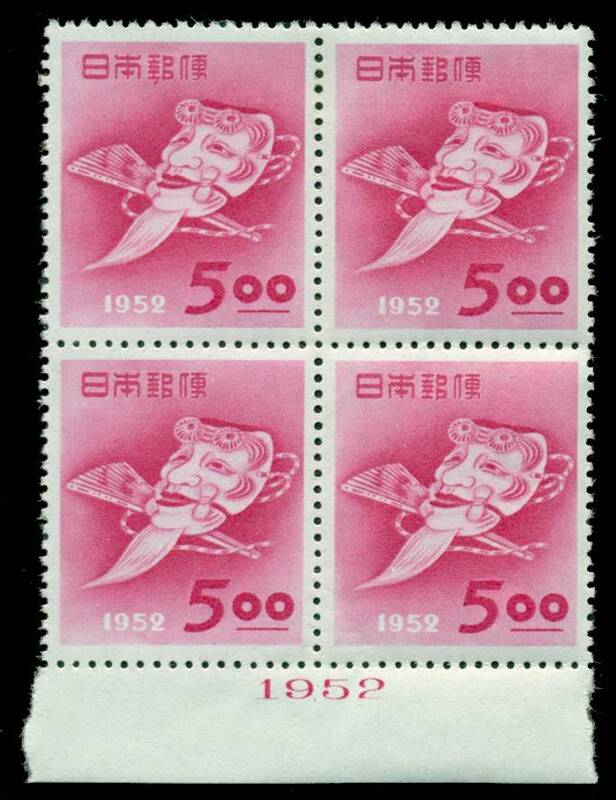 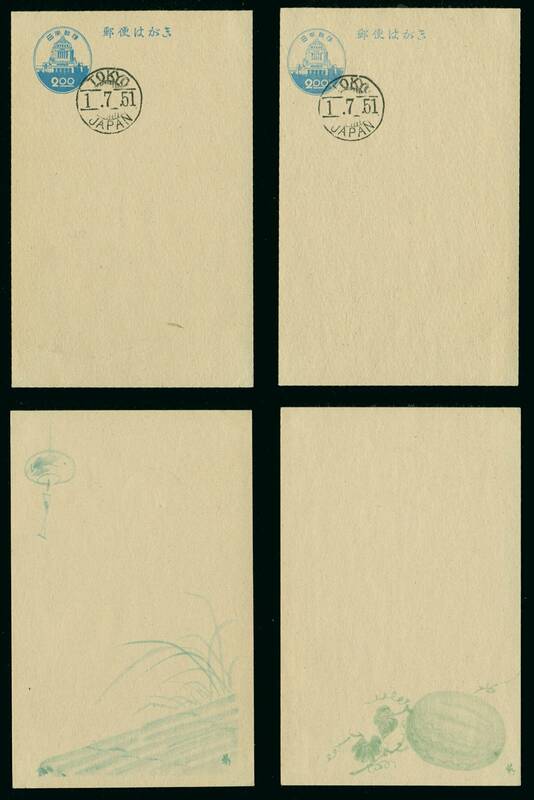 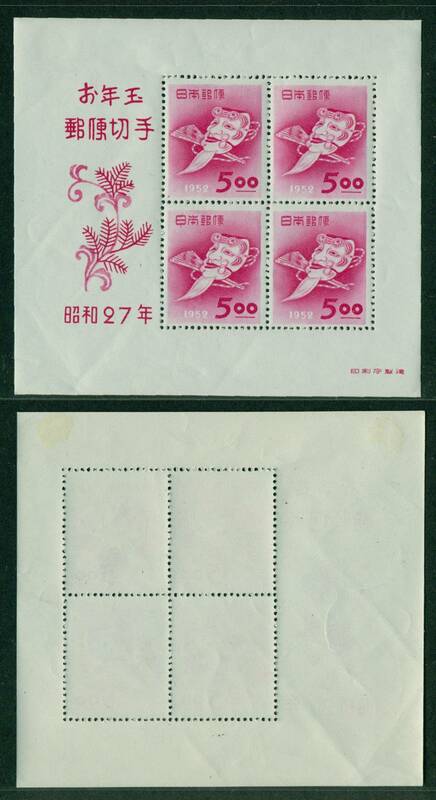 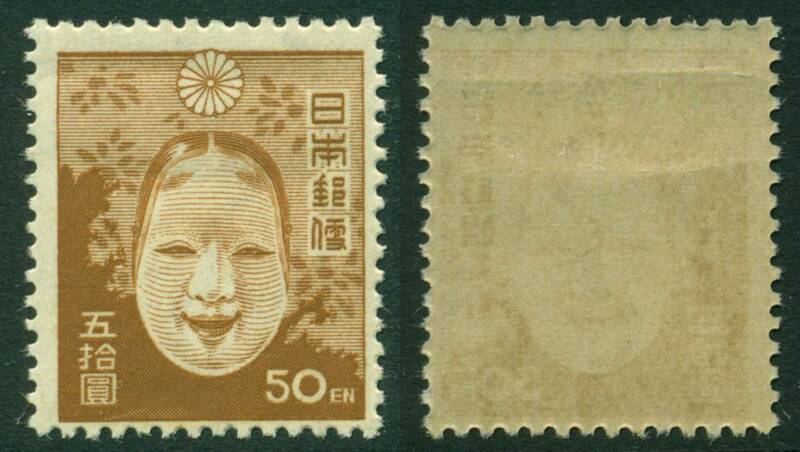 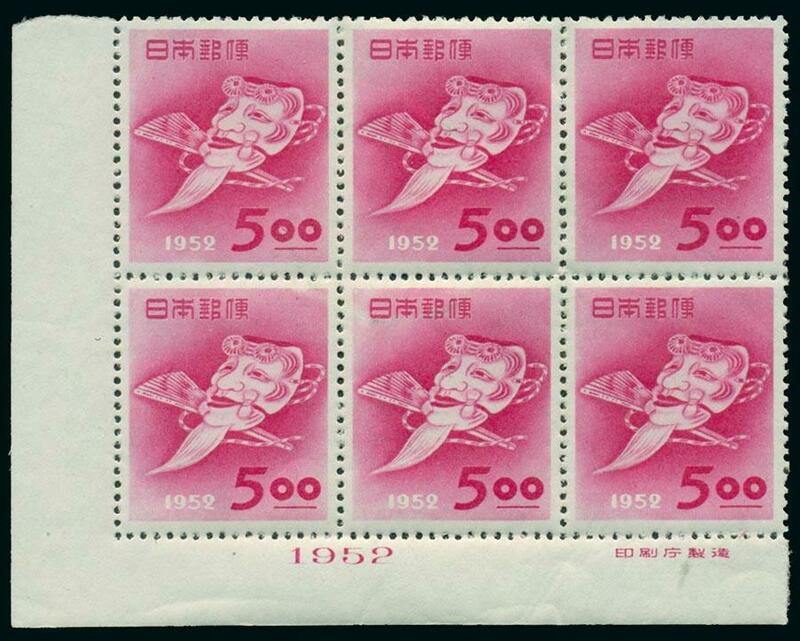 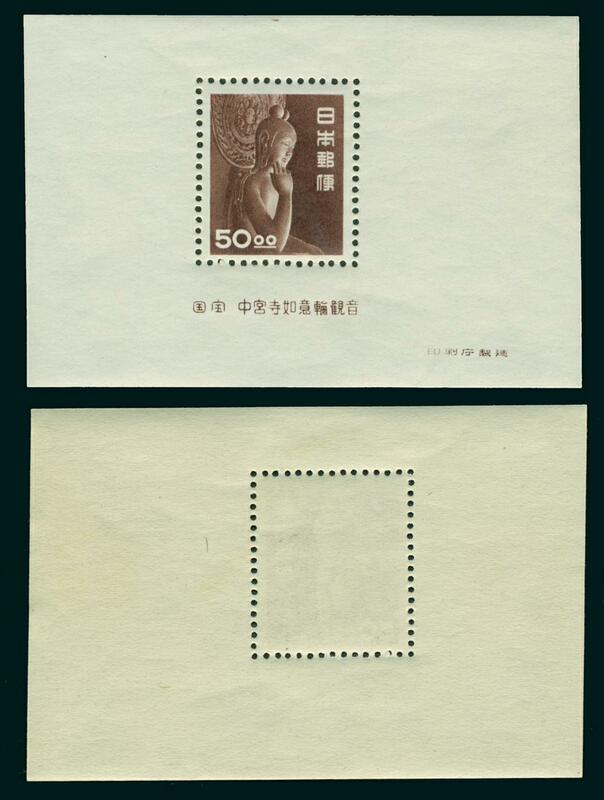 A detailed illustrated study describing features of genuine and forged issues of the second series (Cherry Blossom issues) of Japanese stamps issued. 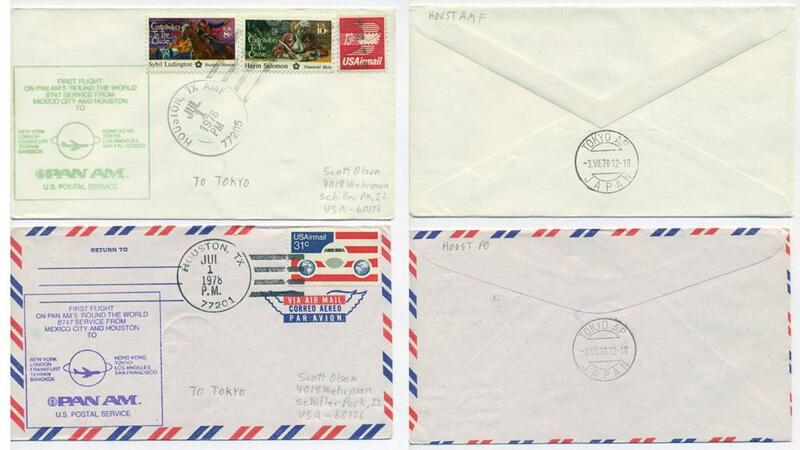 This series as well as the first series have been widely forged. 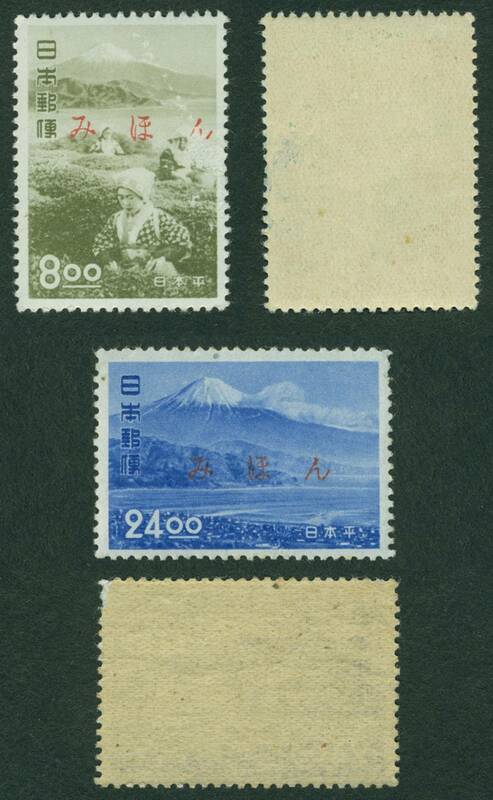 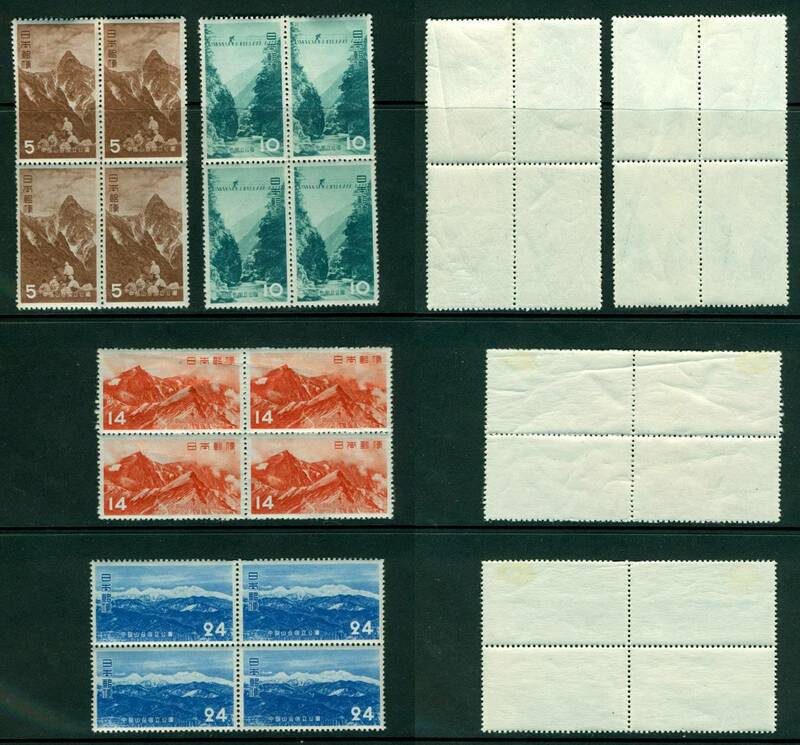 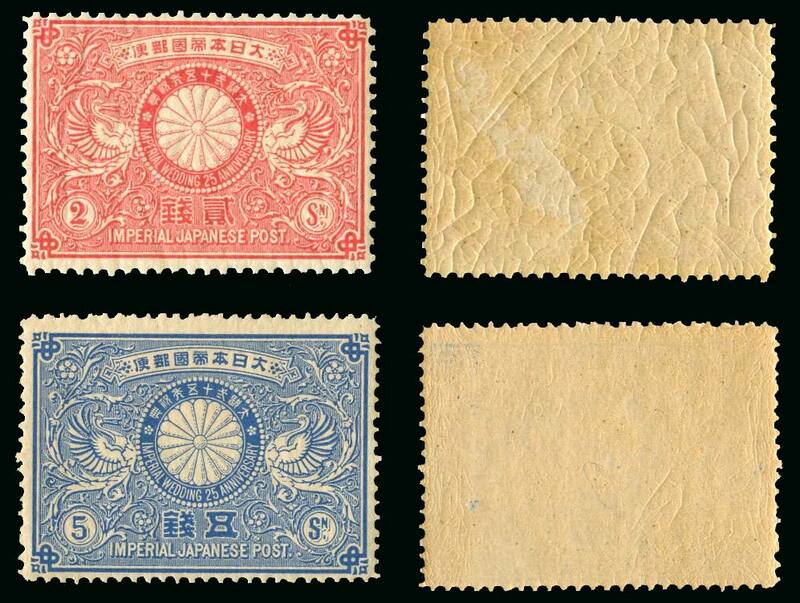 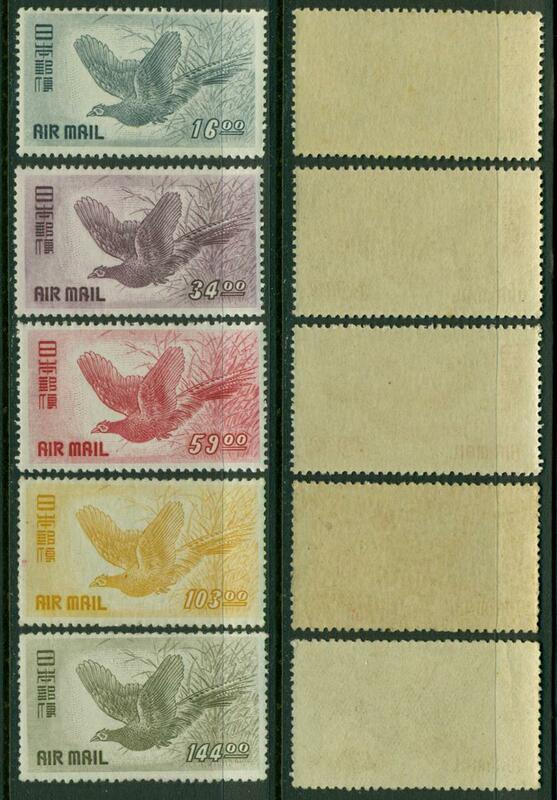 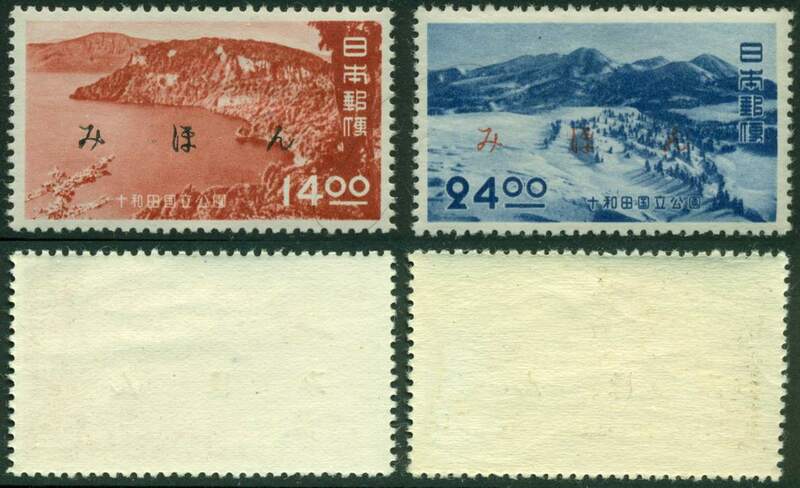 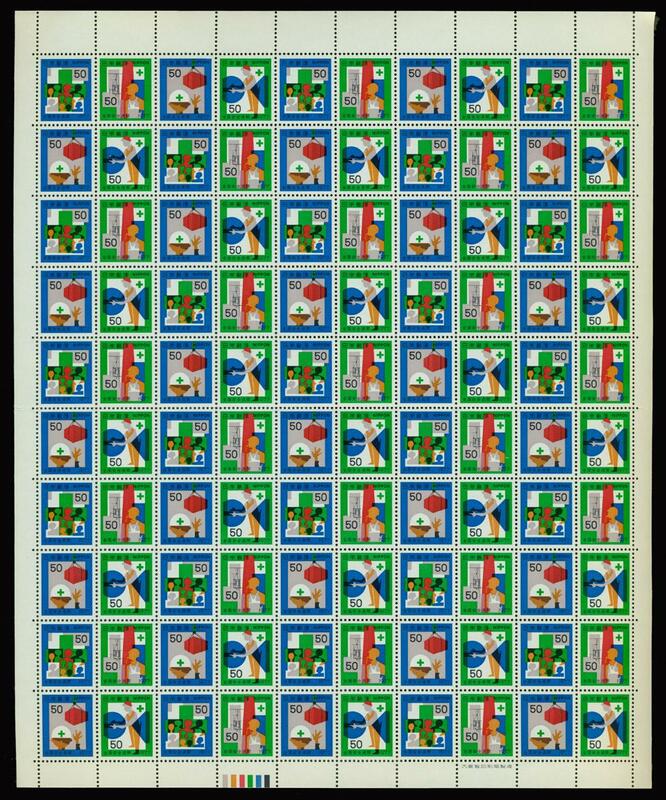 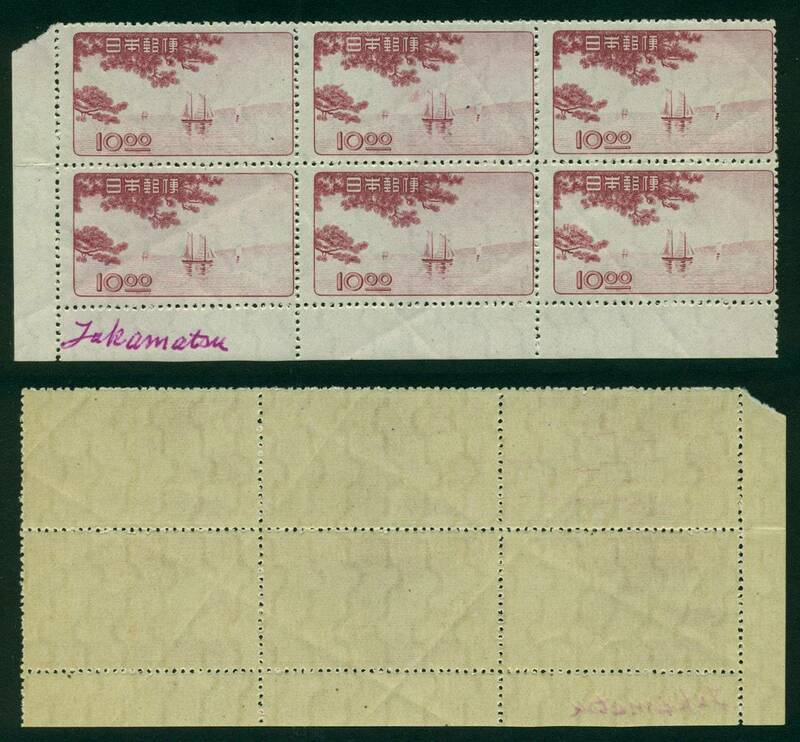 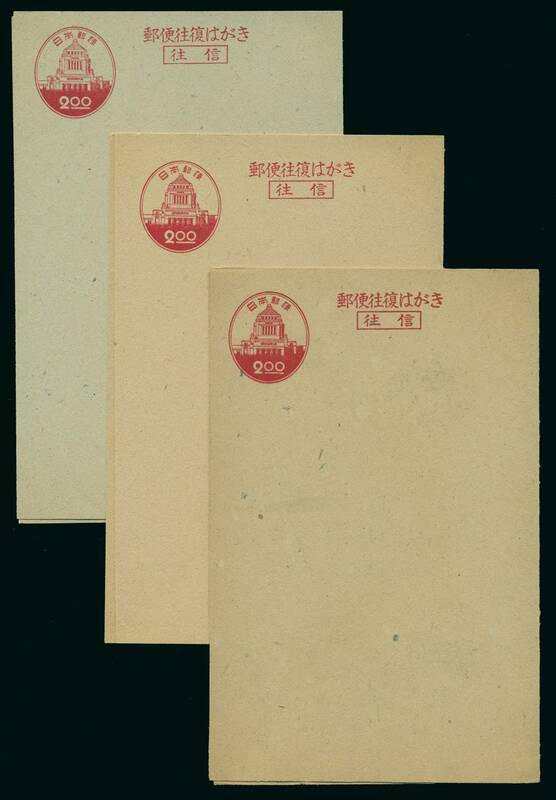 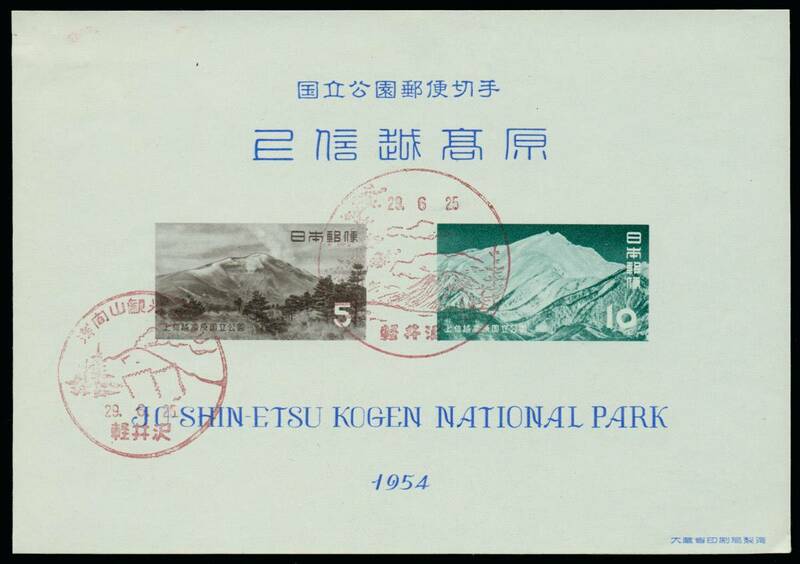 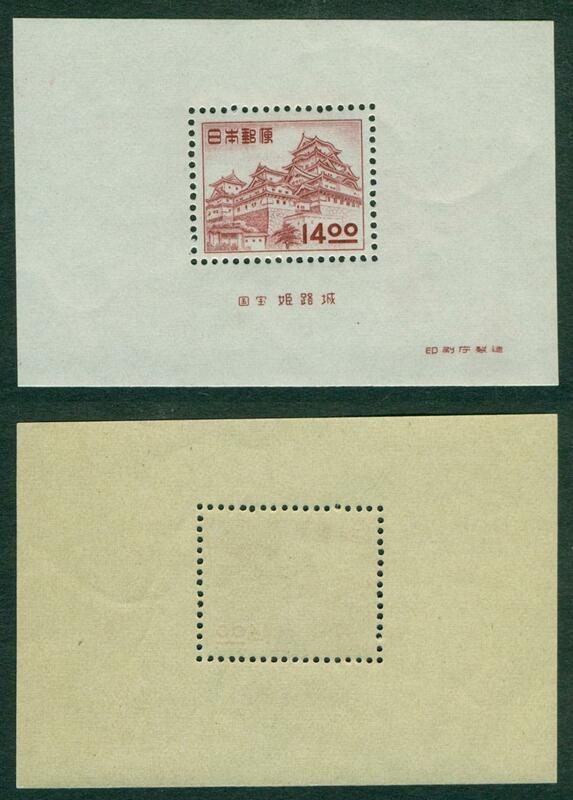 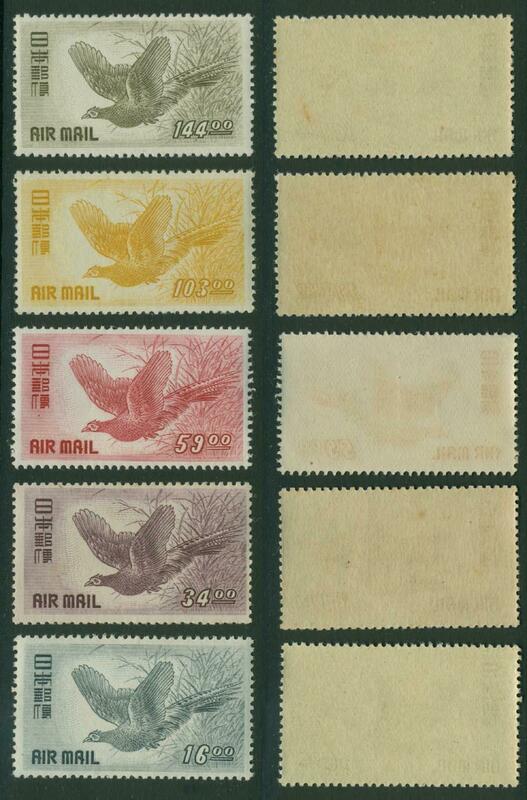 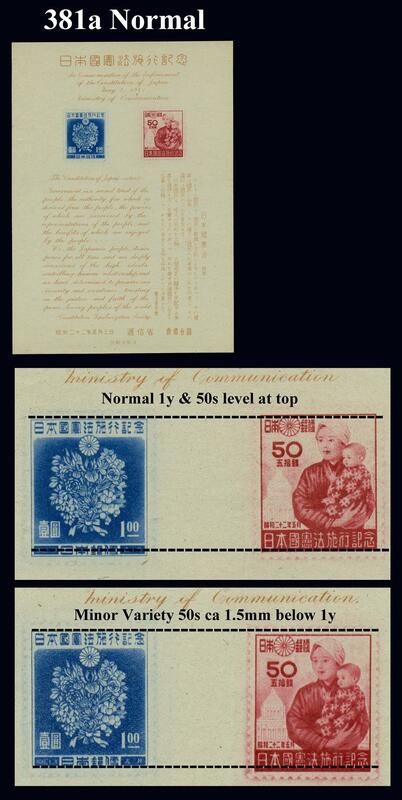 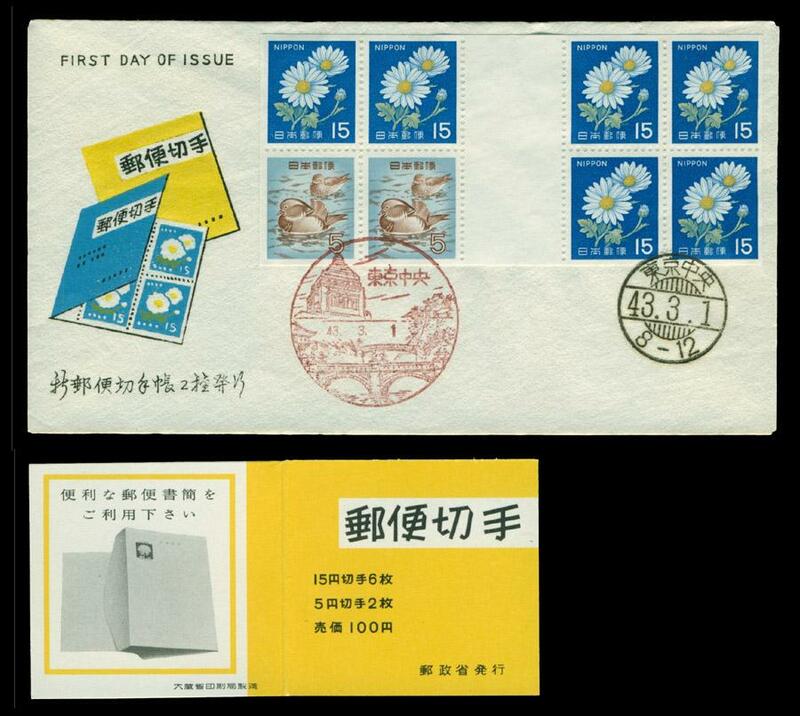 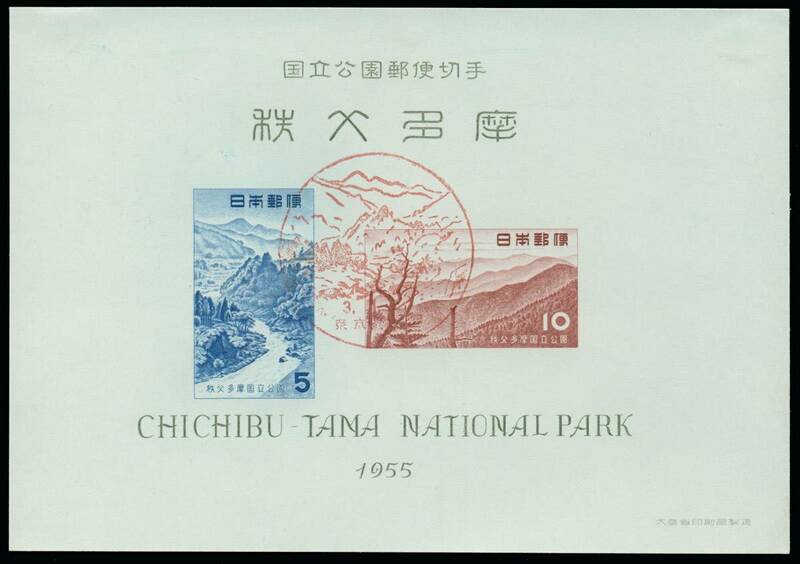 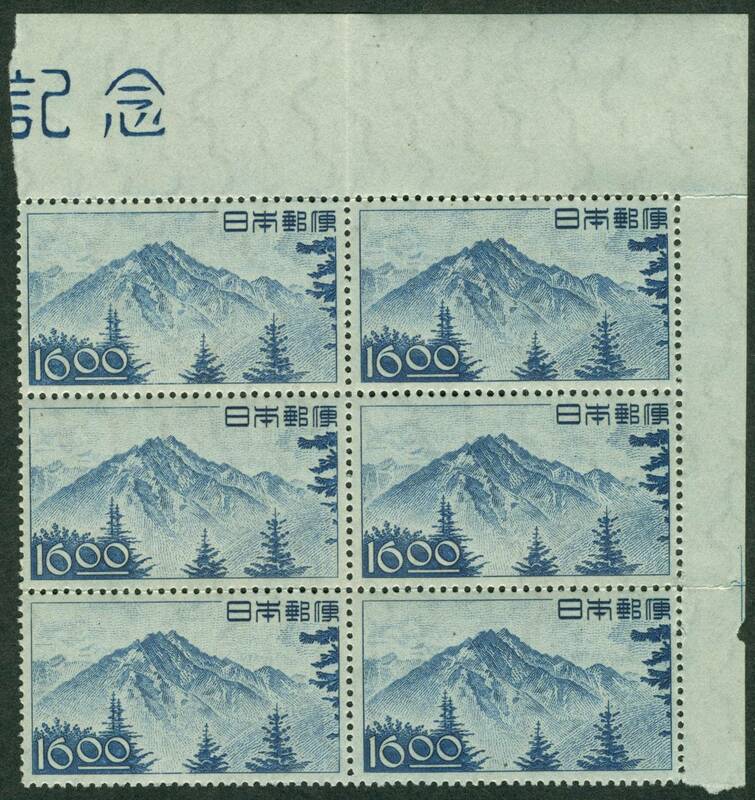 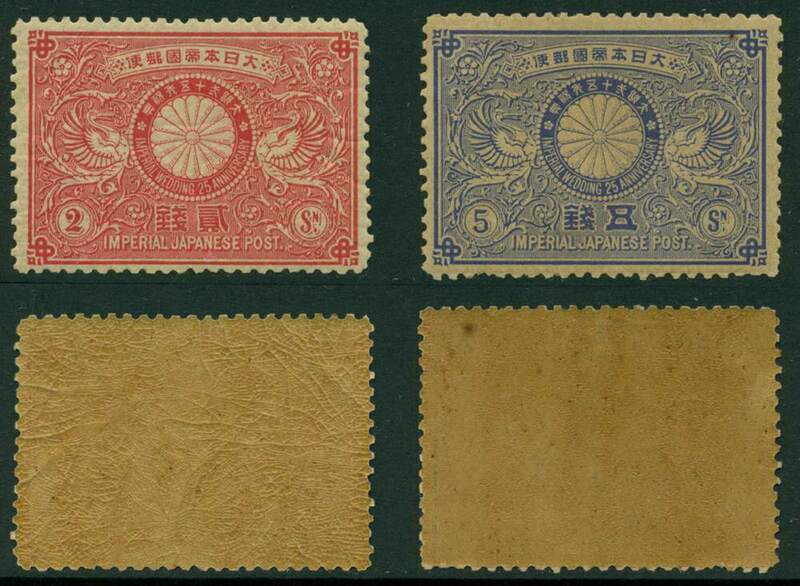 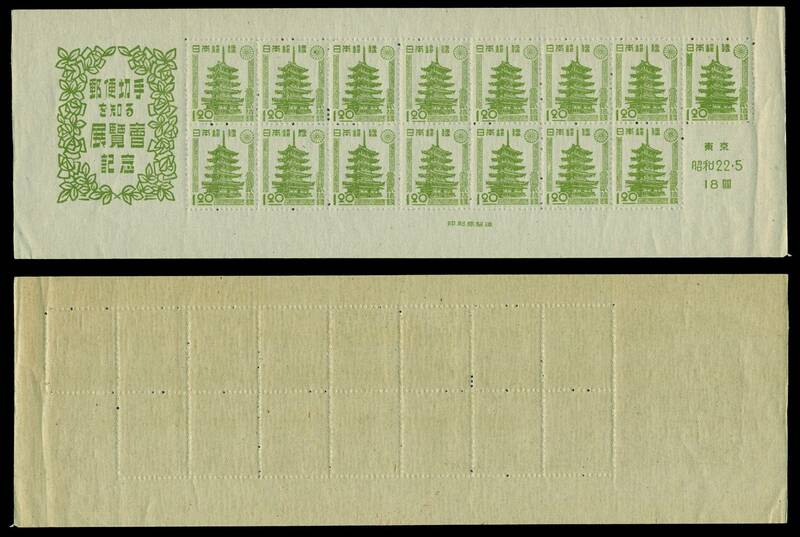 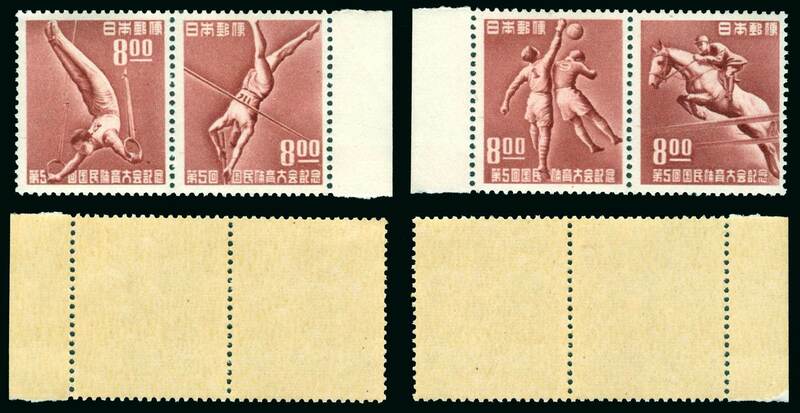 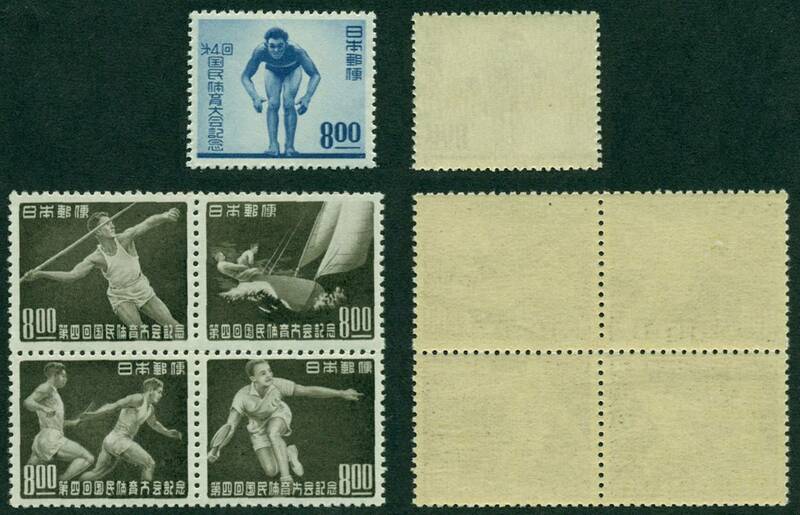 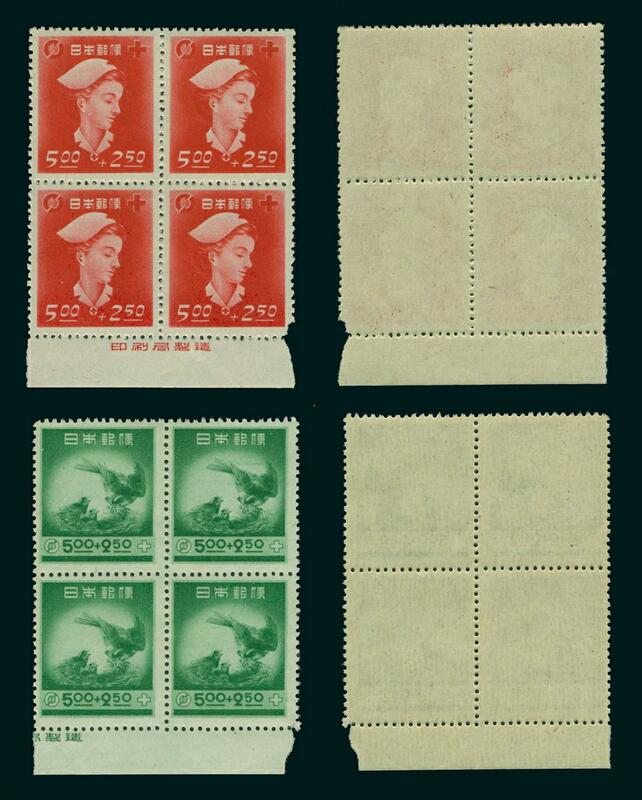 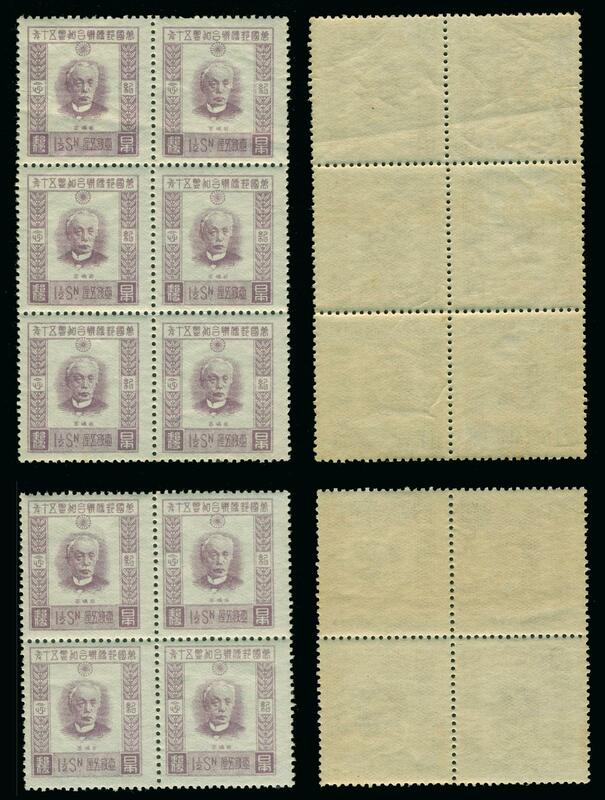 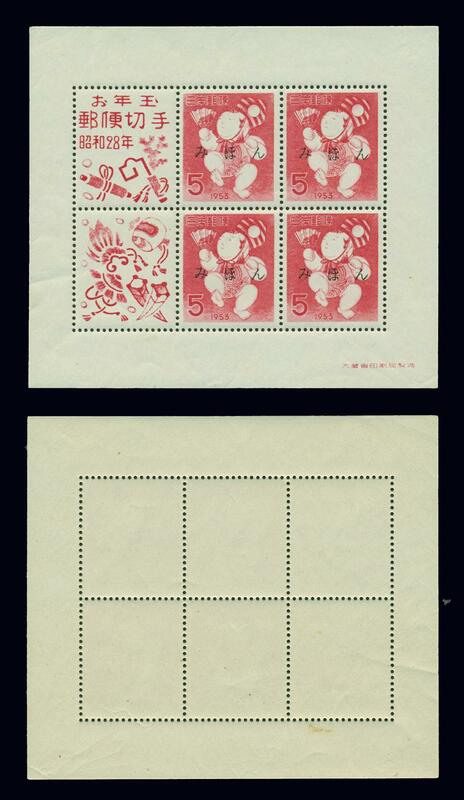 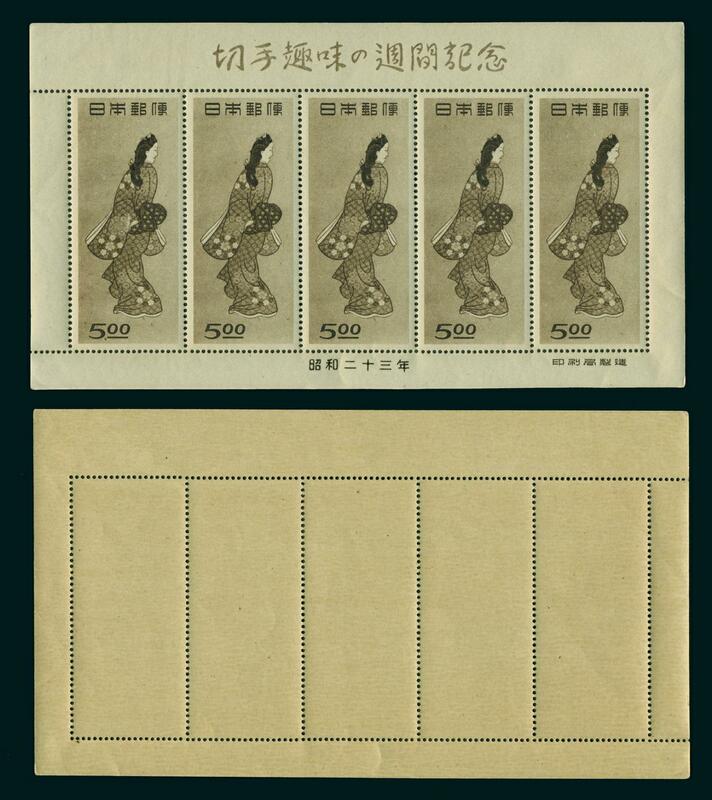 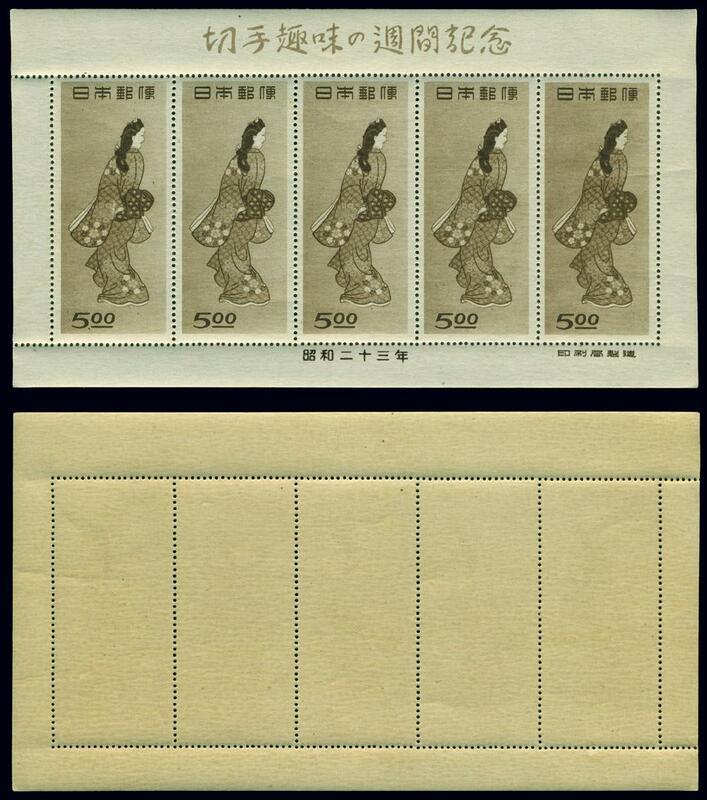 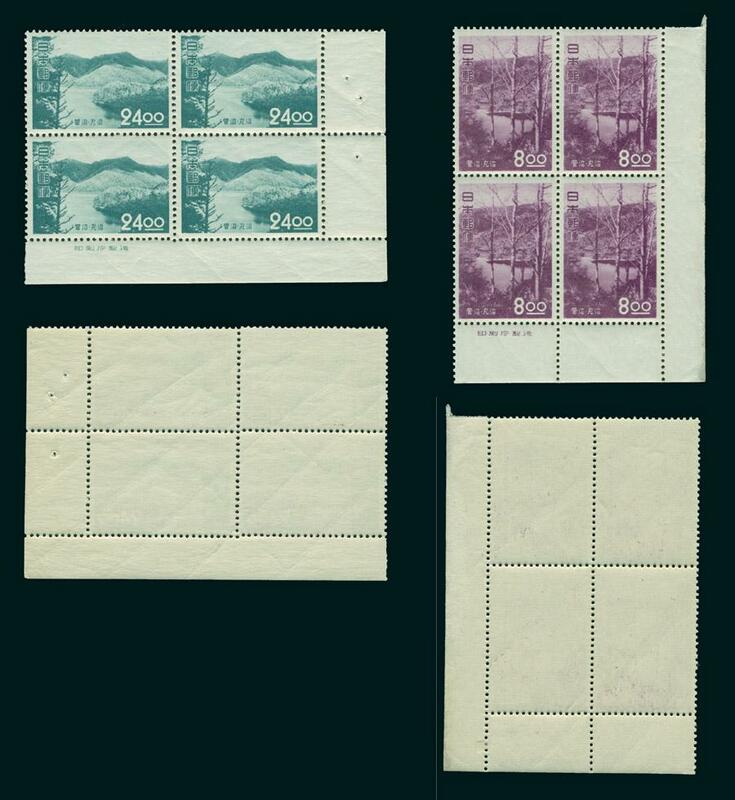 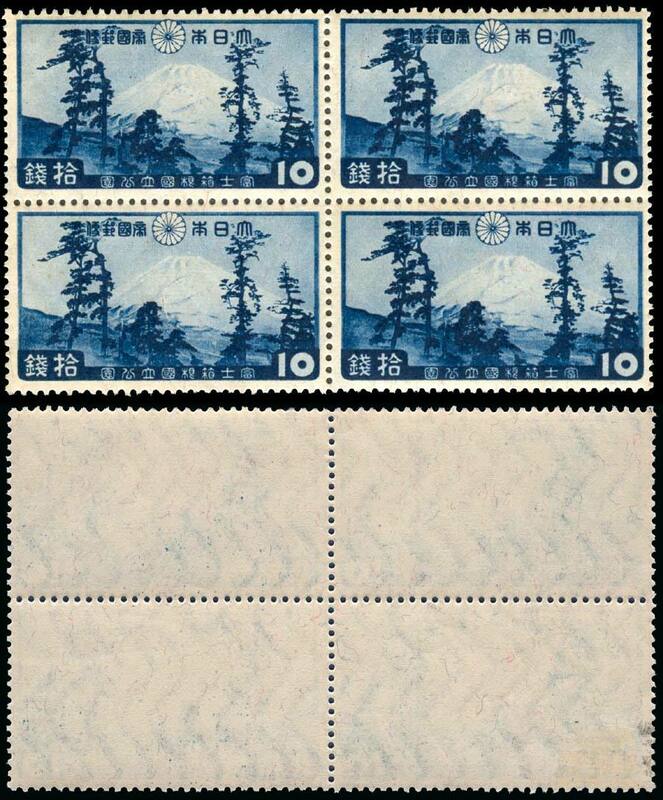 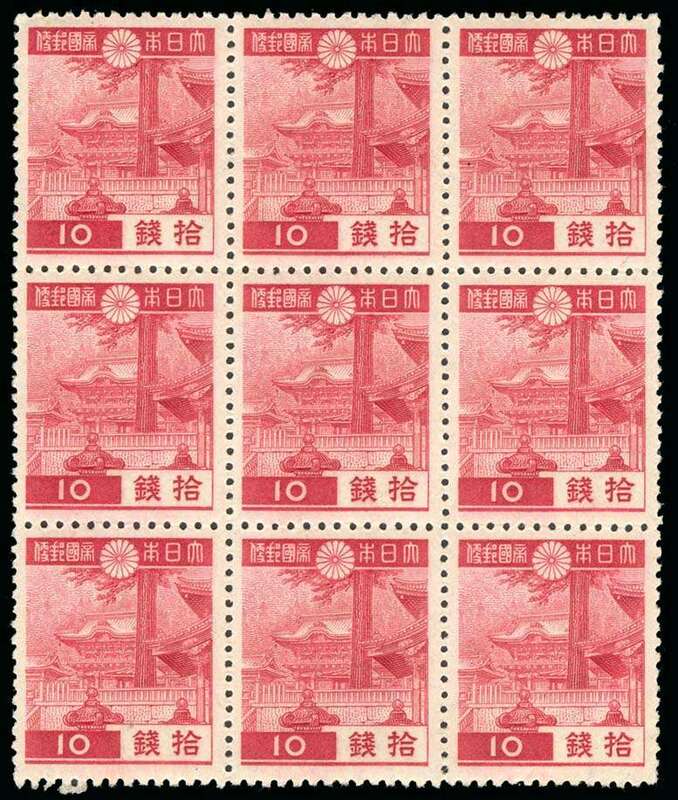 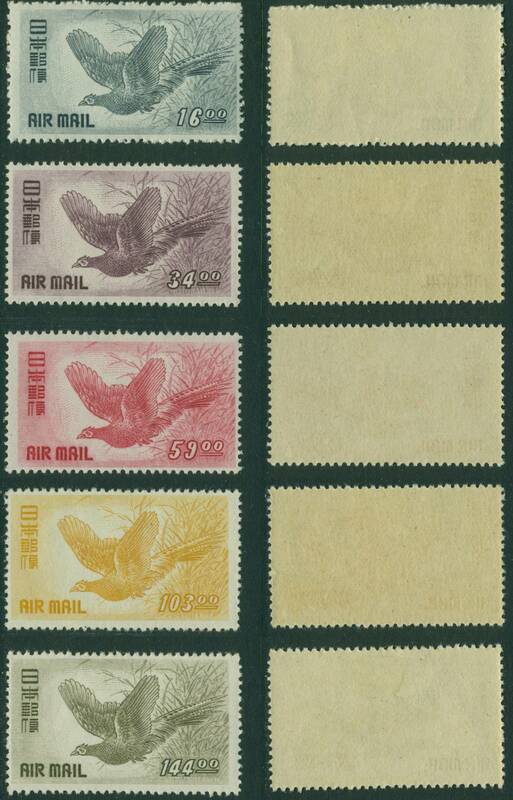 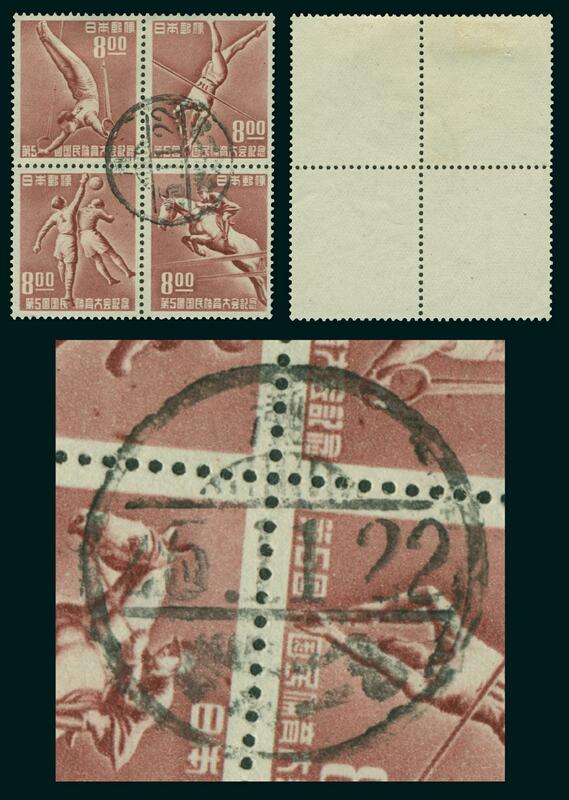 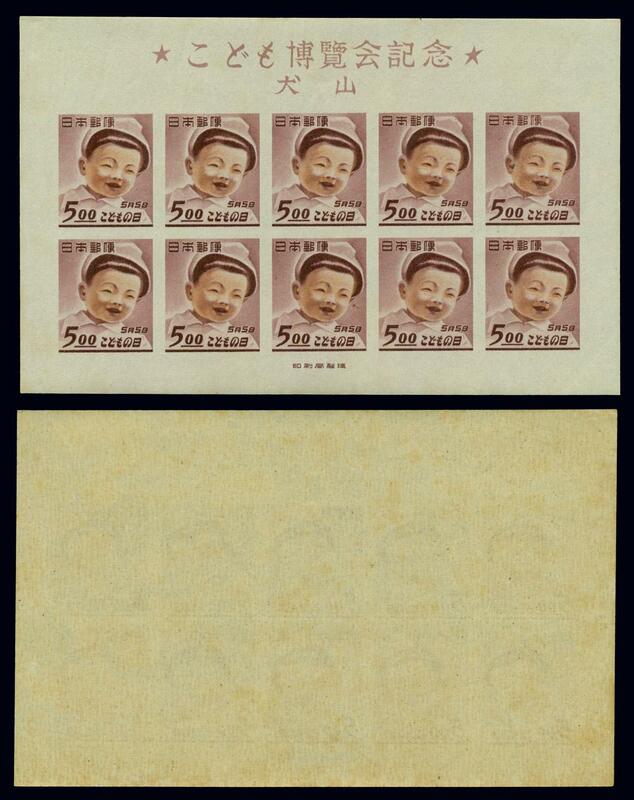 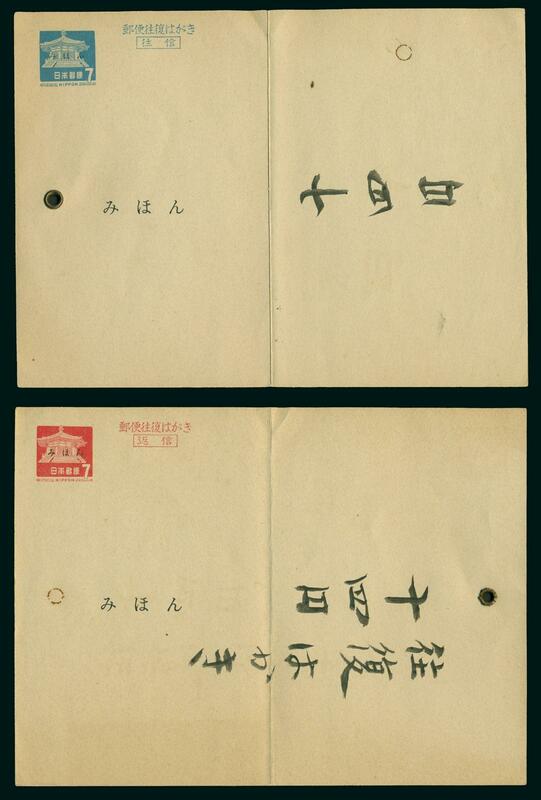 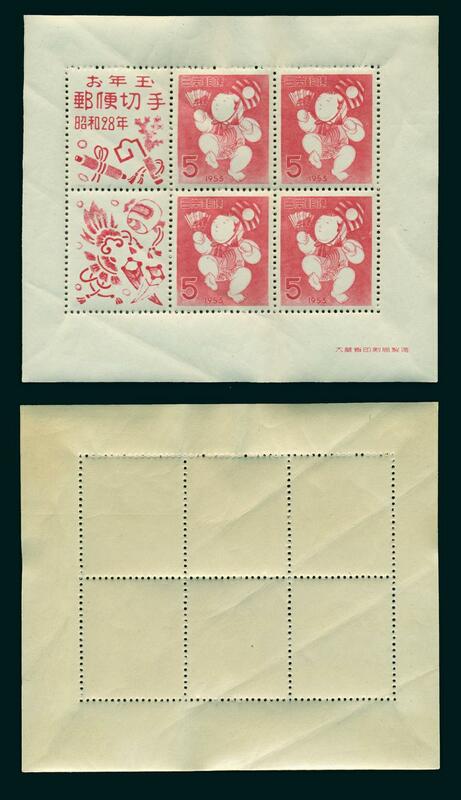 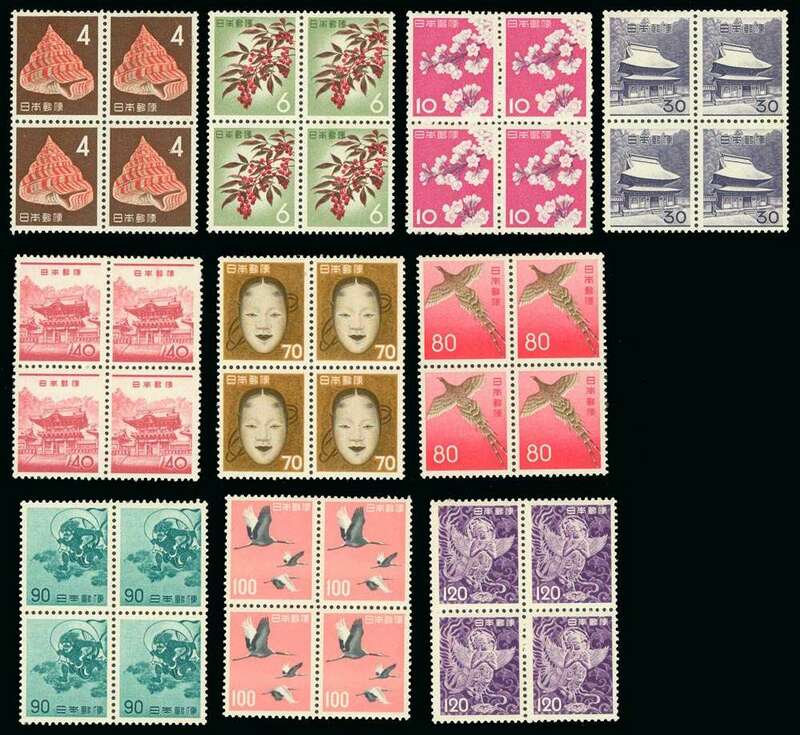 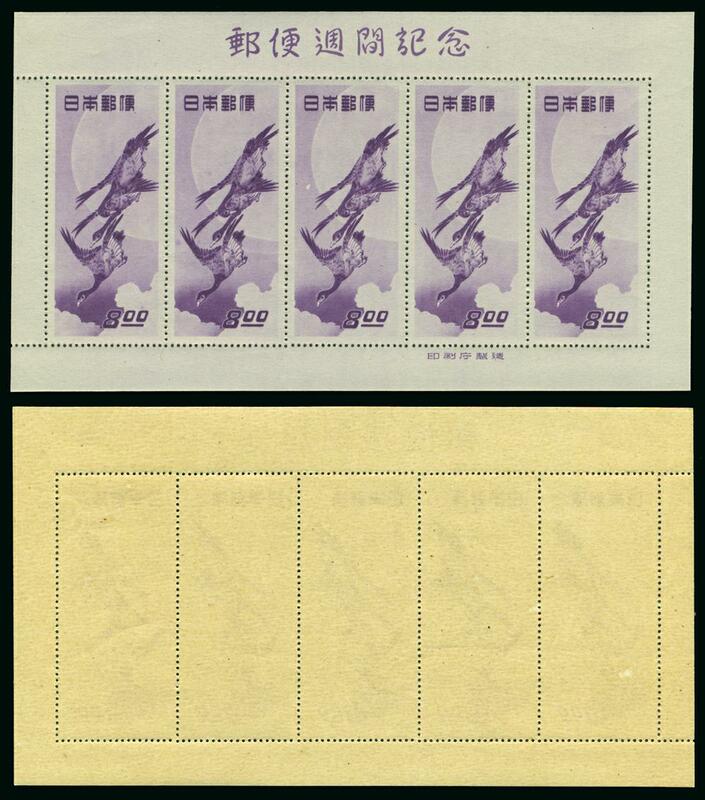 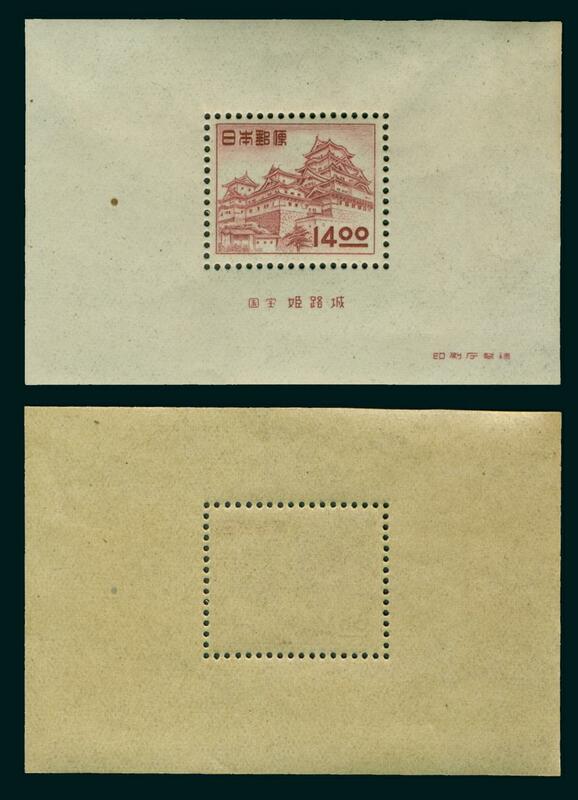 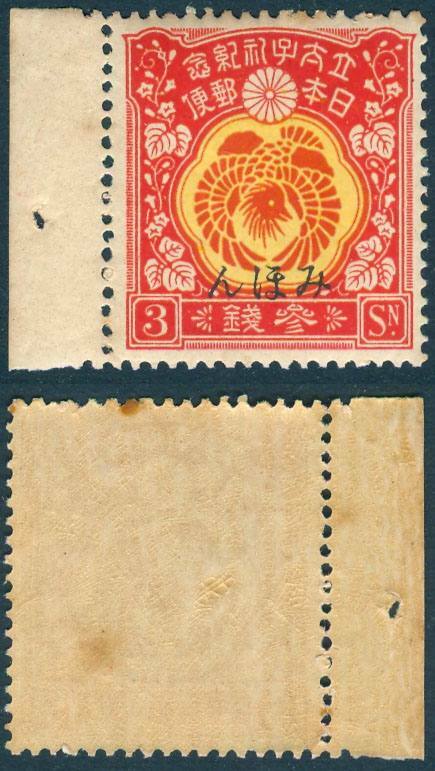 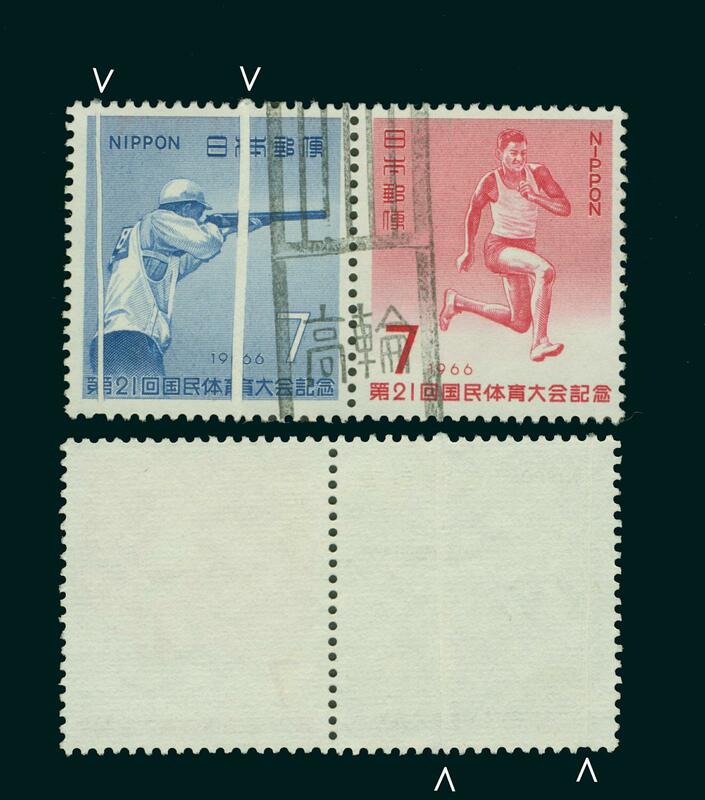 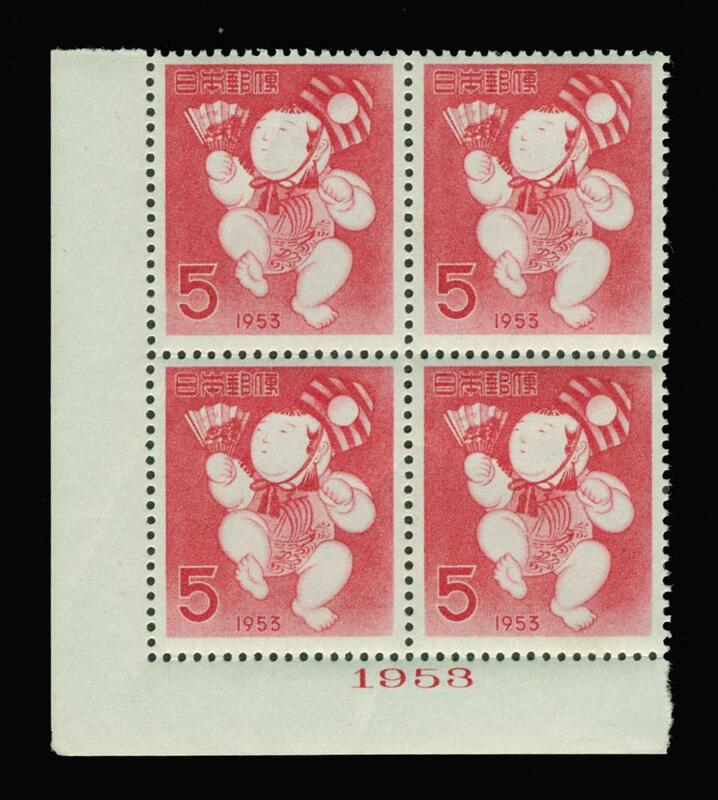 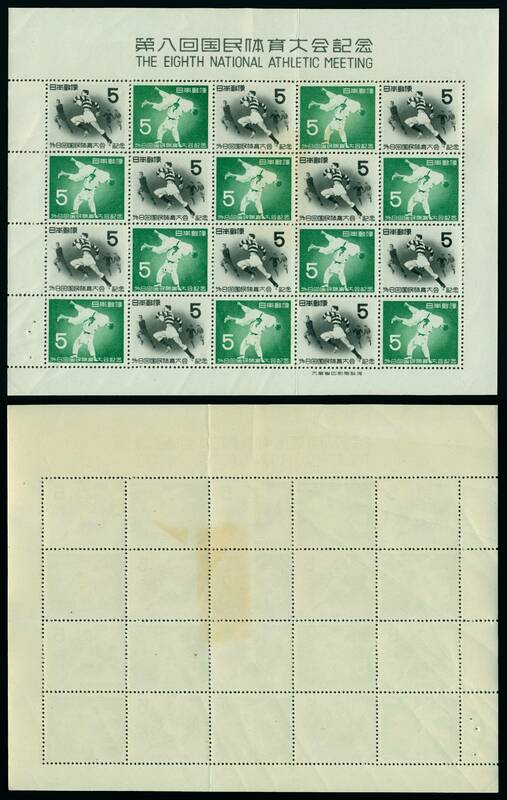 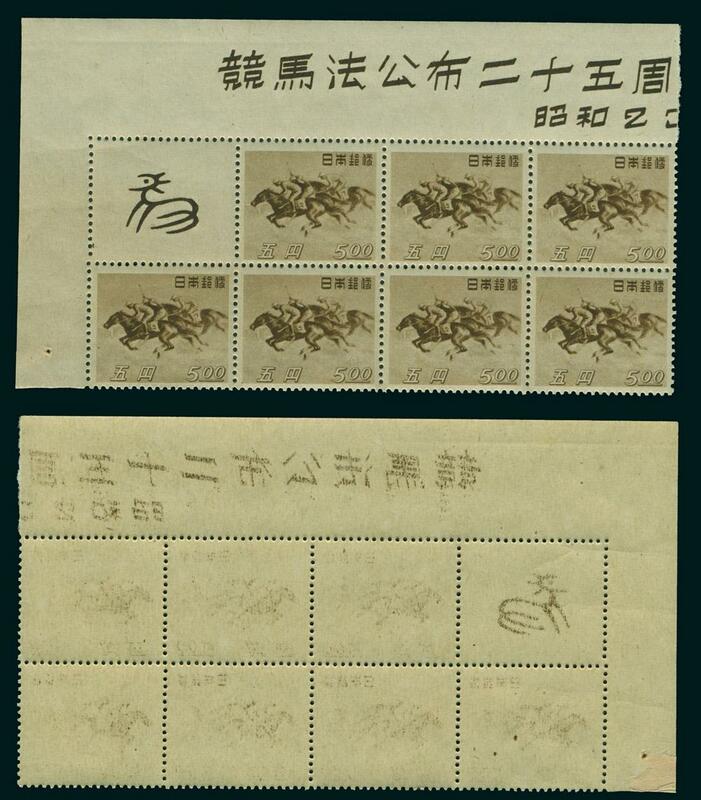 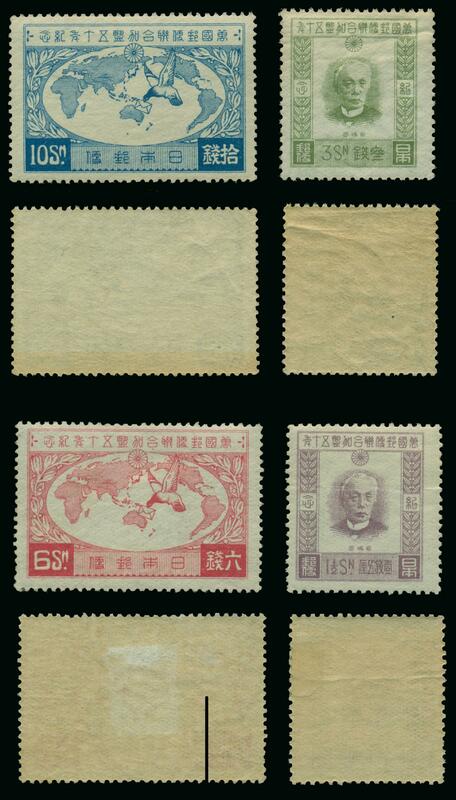 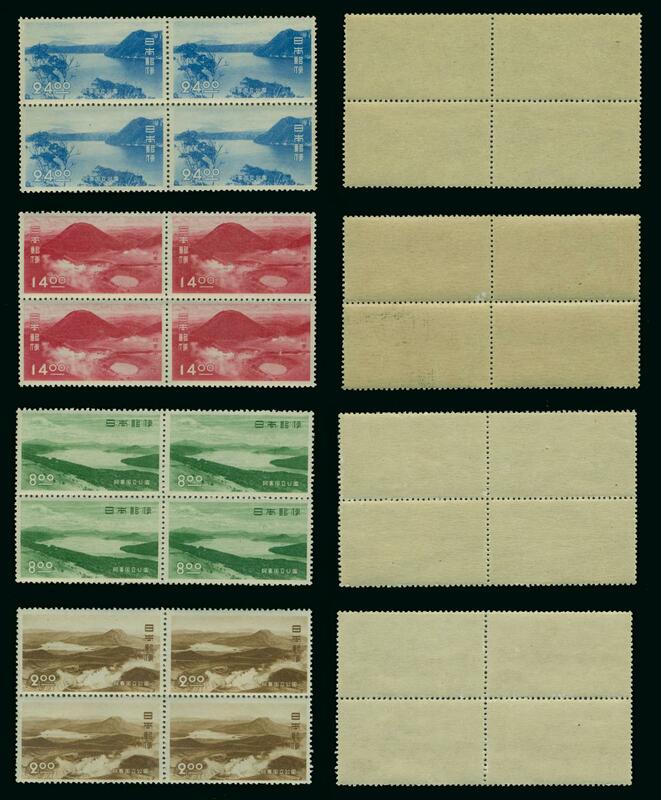 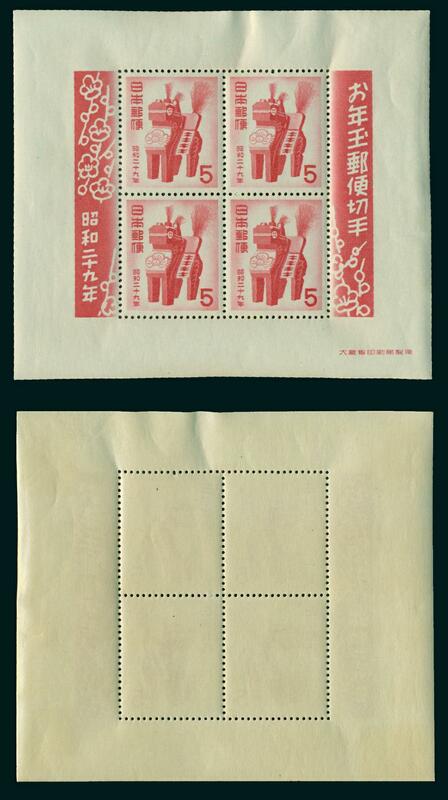 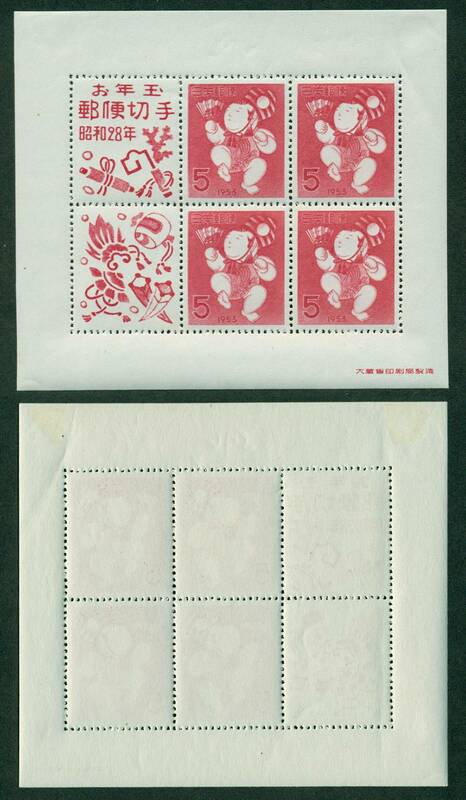 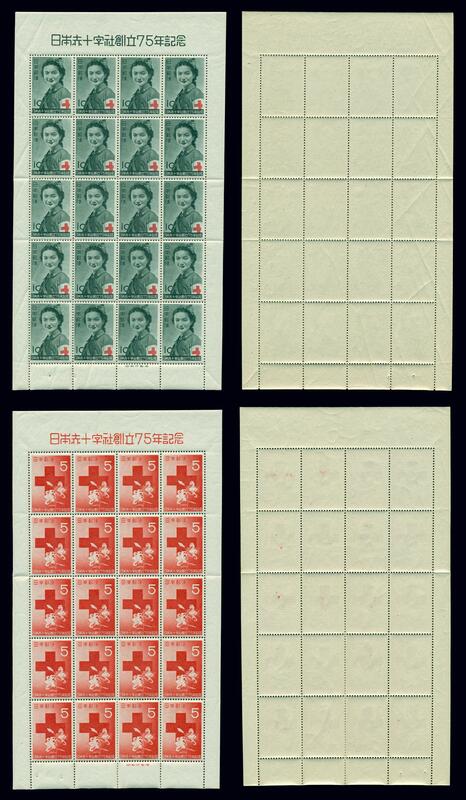 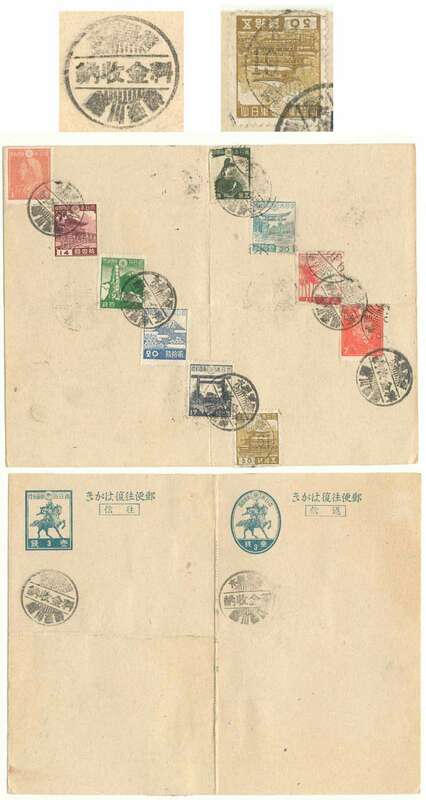 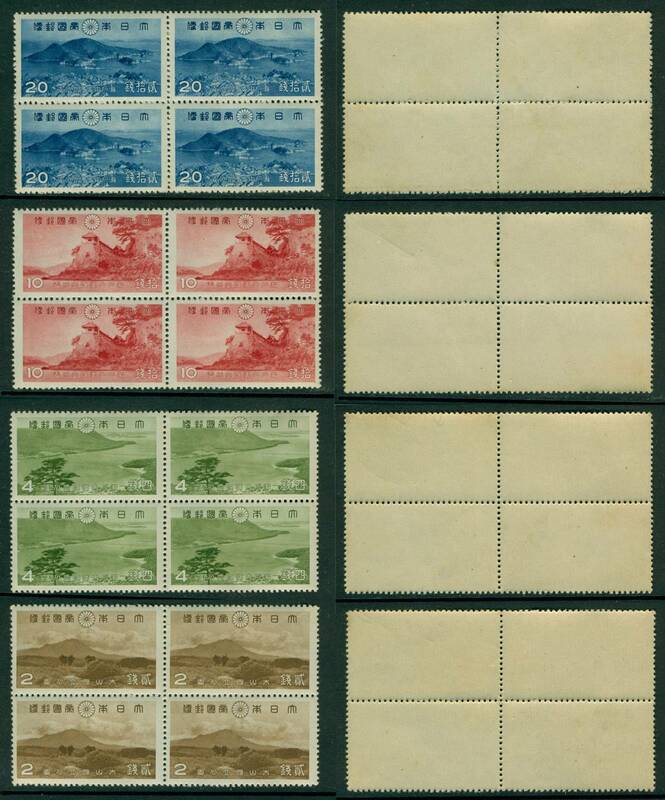 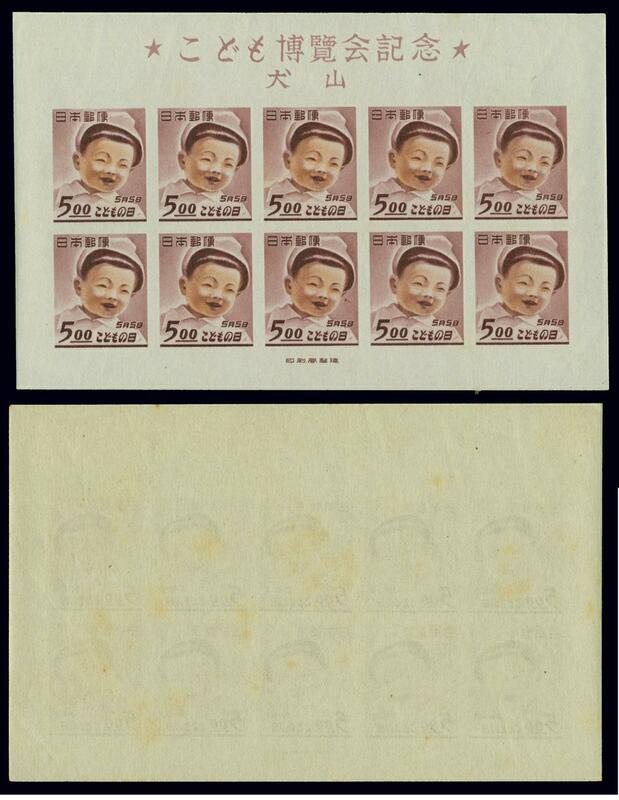 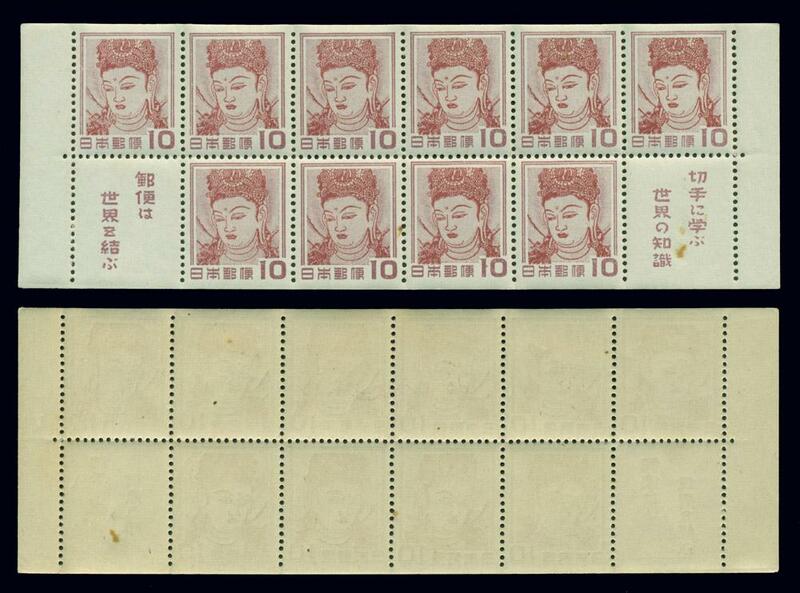 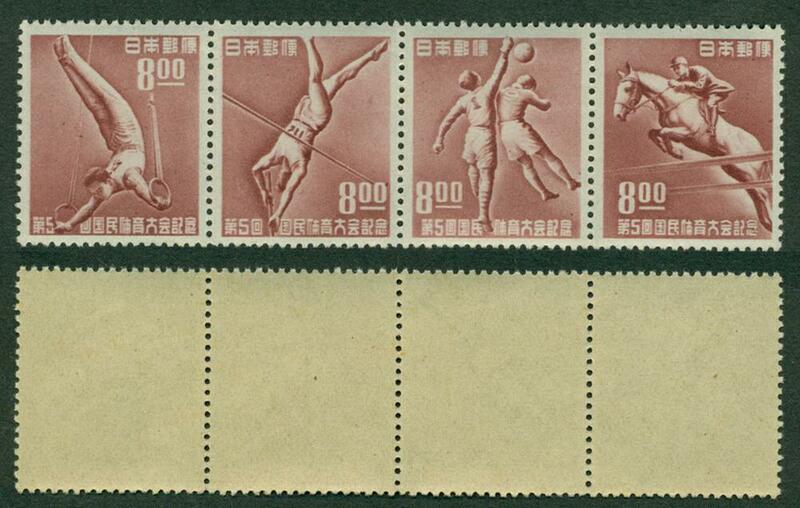 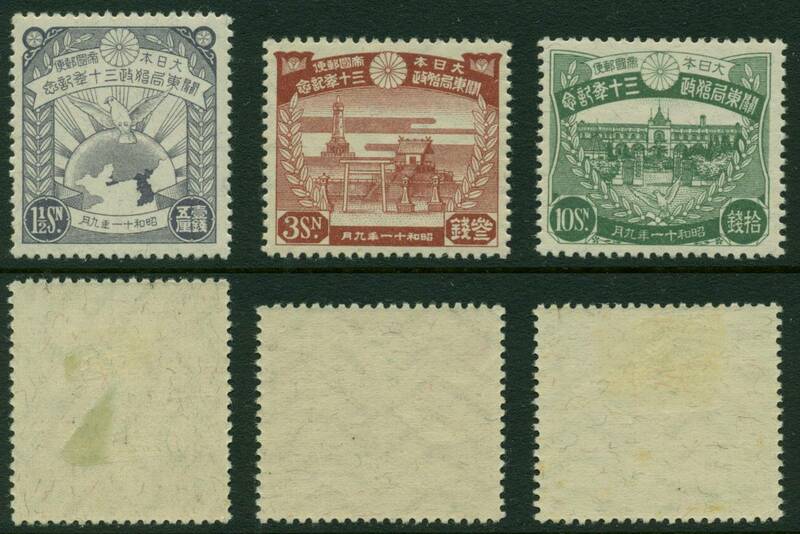 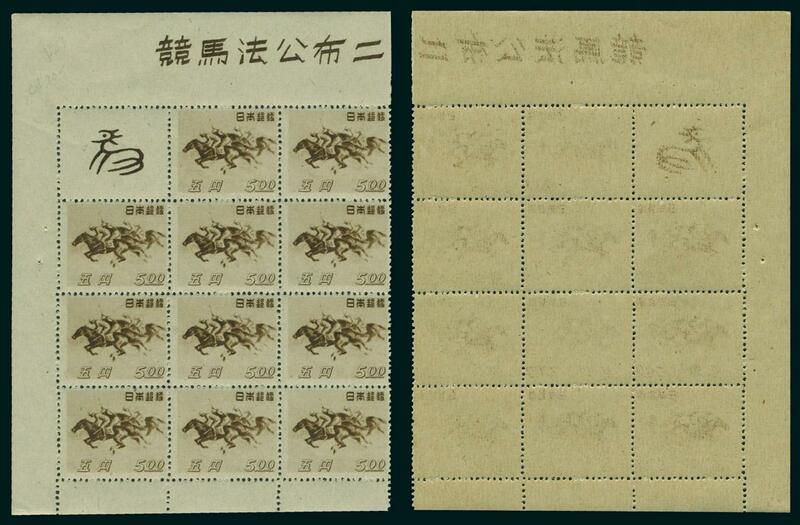 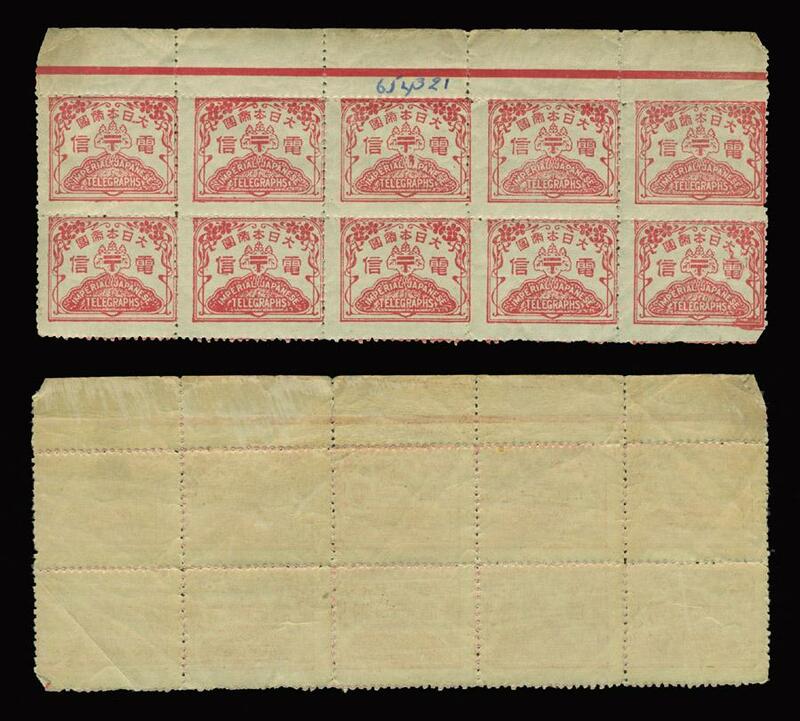 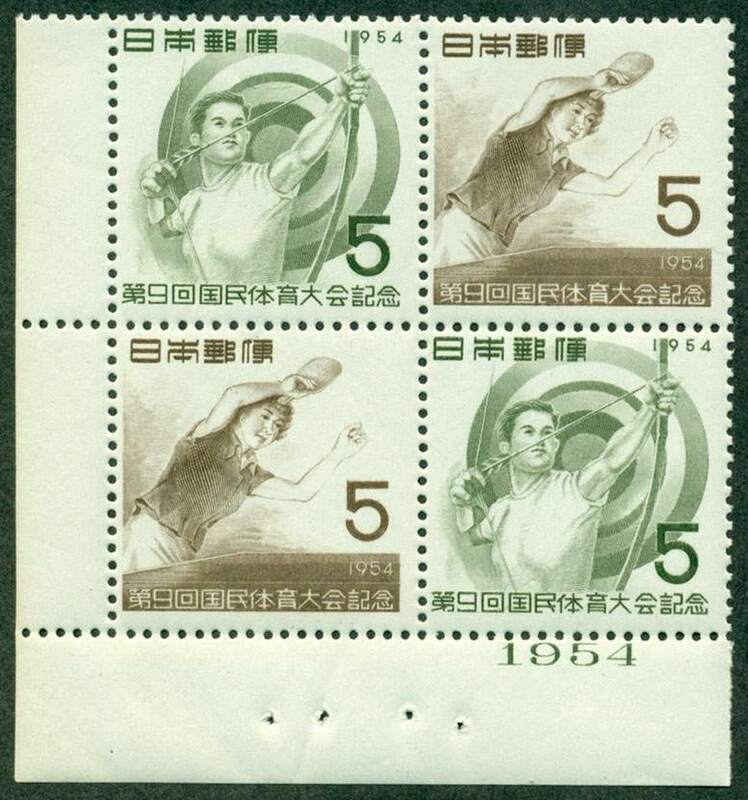 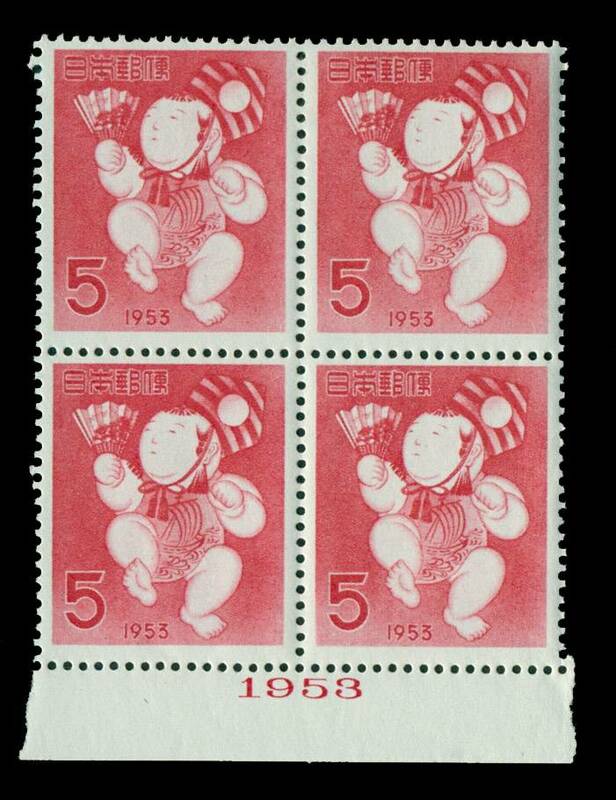 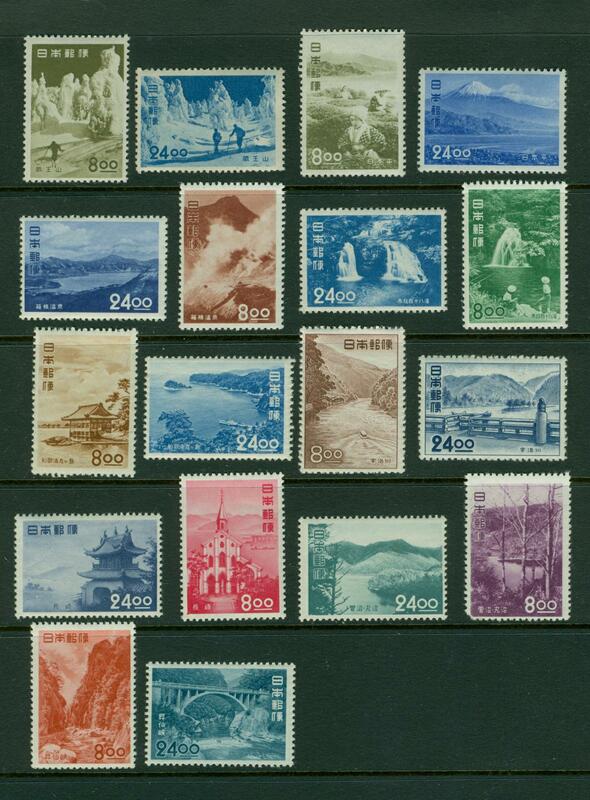 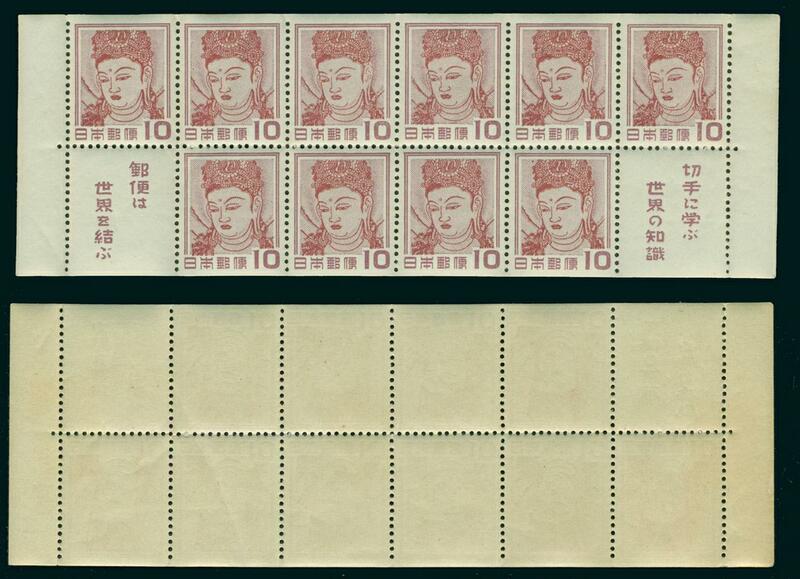 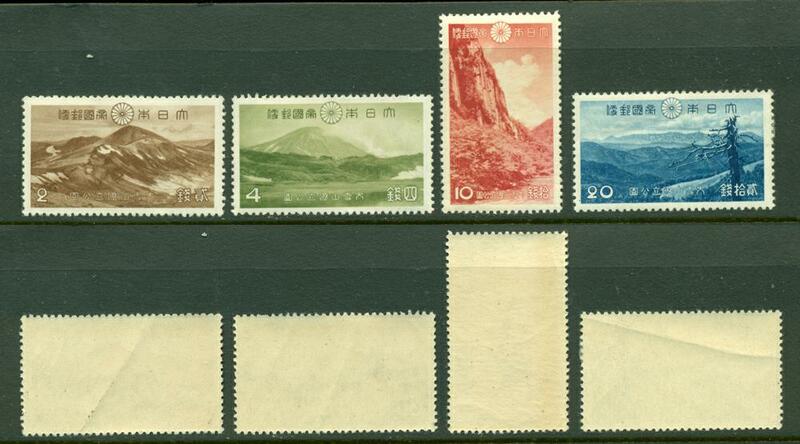 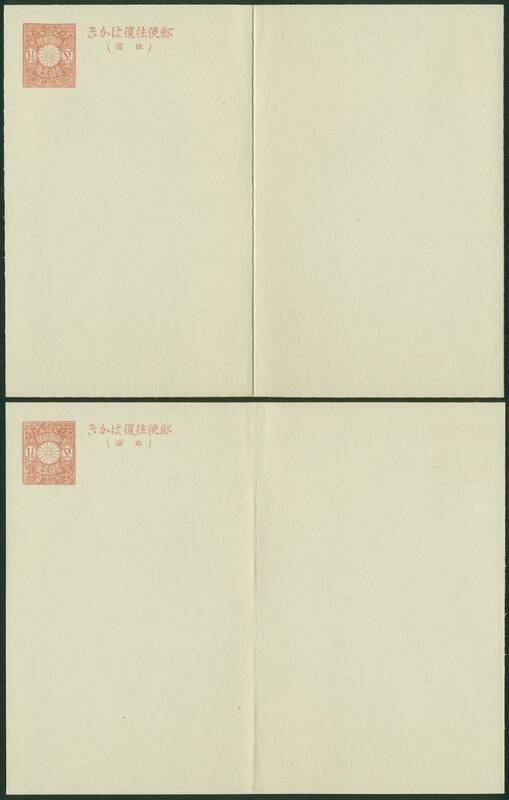 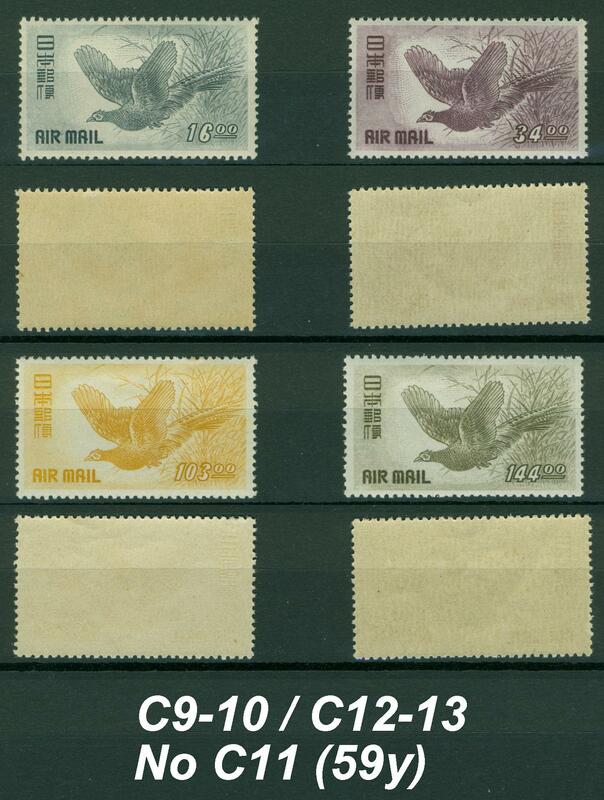 The monograph concludes with tables showing "Main Groups of Cherry Blossom Stamps" and "Equivalent Catalogue Numbers." 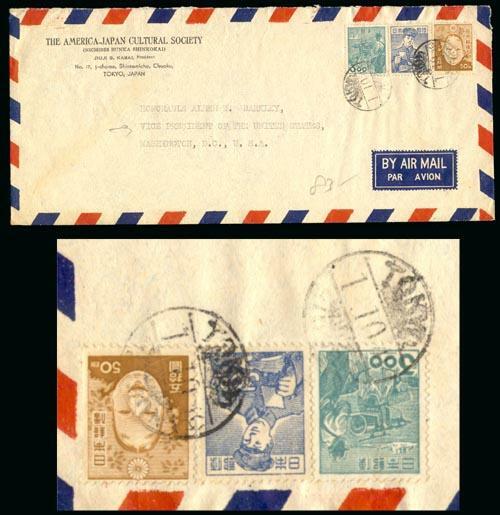 To see the cover and an example of a text page, click here. 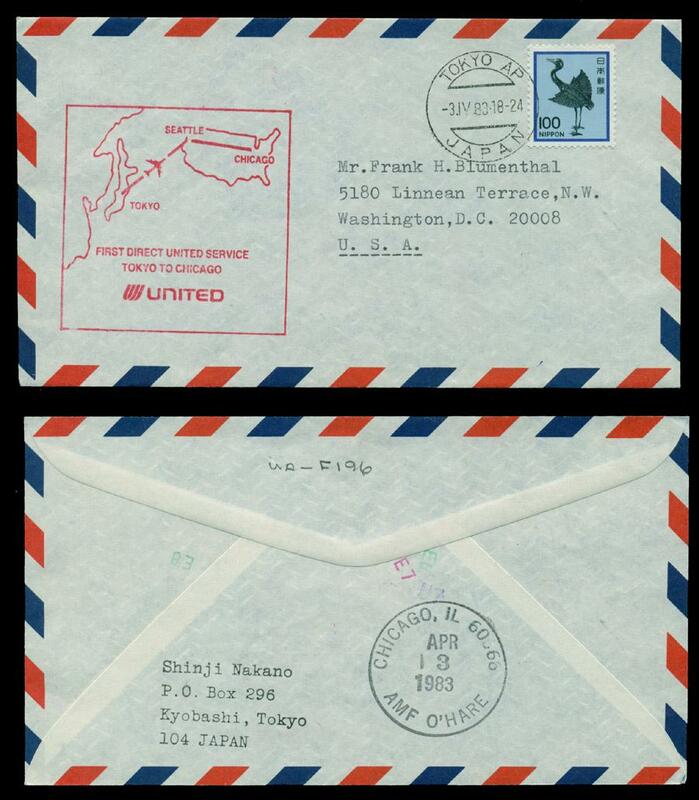 The Forerunner Foreign Post Offices in Japan, British - U.S.- French, Tokyo, Japan Philatelic Publications, Inc, printed by Kyodo Insatsu, 1976, large 8vo (7 1/4 x 9 in), red covers with gilt titles on front cover and spine, no dust jacket, numerous illustrations (most in color), 164 pp. 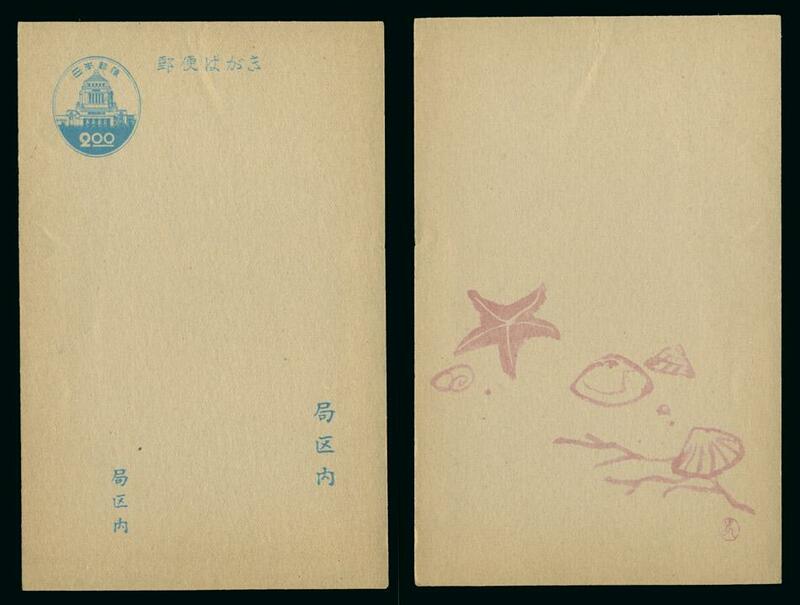 The book is primarily in Japanese but the key illustrations have English descriptive titles. 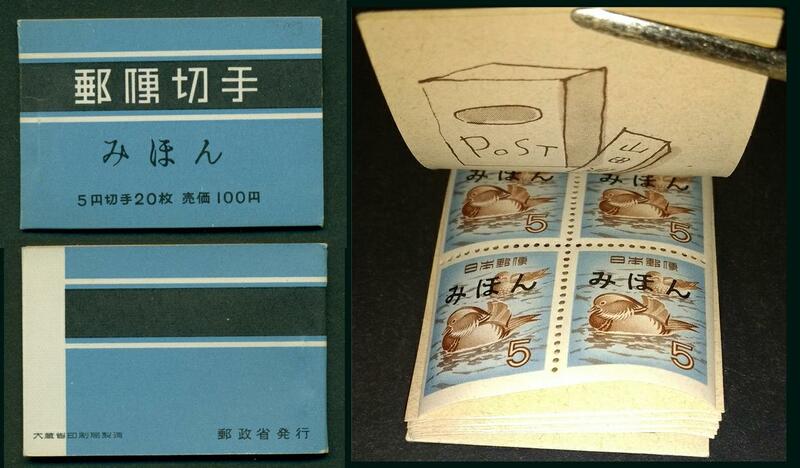 Accompanying the book is an 11 page English language pamphlet that discusses the early foreign post offices in Japan. 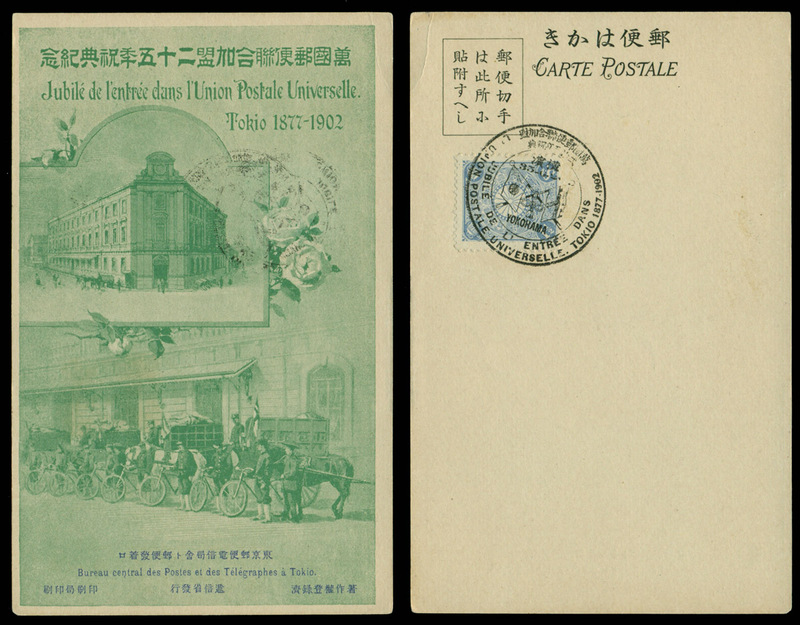 The book presents philatelic material (covers and stamps) from Ishikawa's award winning philatelic collection of foreign mail and post offices (British, United States and France) operating in Japan from the 1860s through the 1880s. 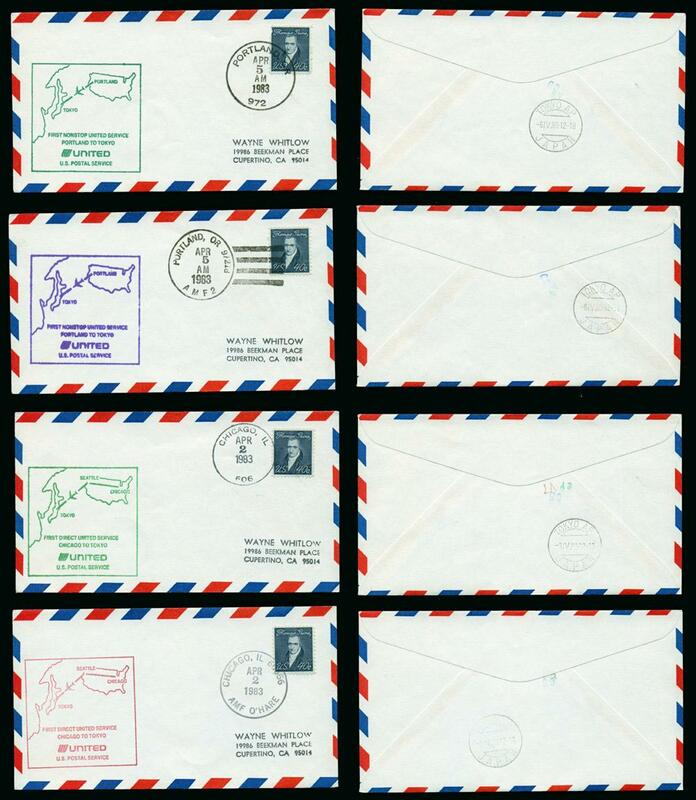 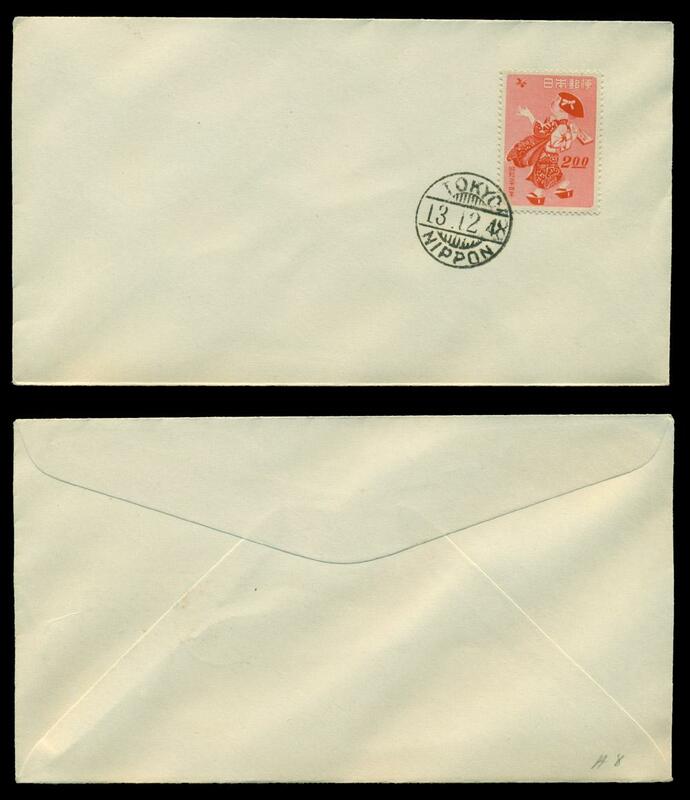 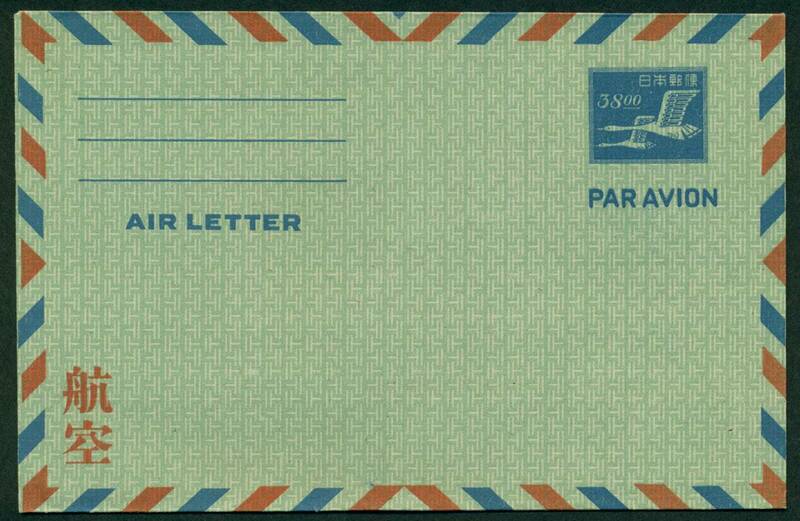 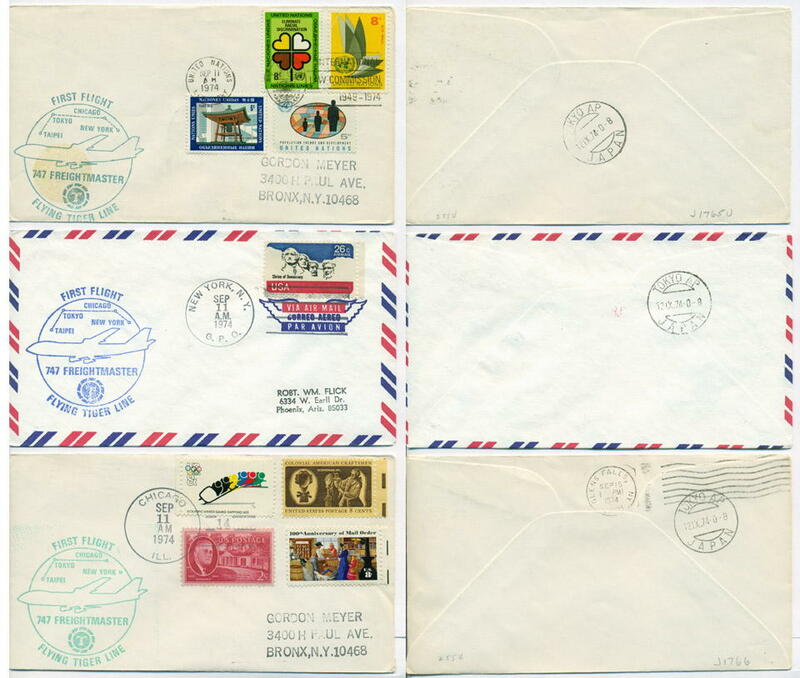 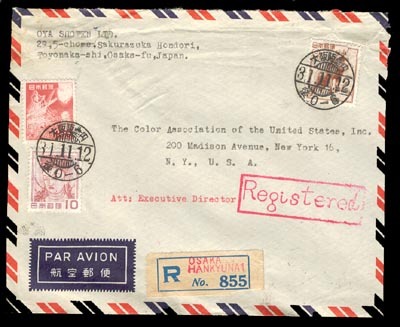 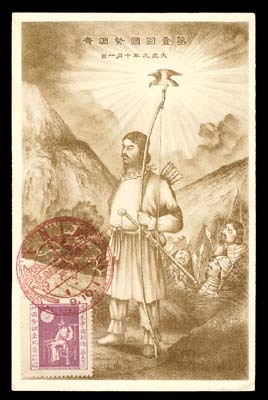 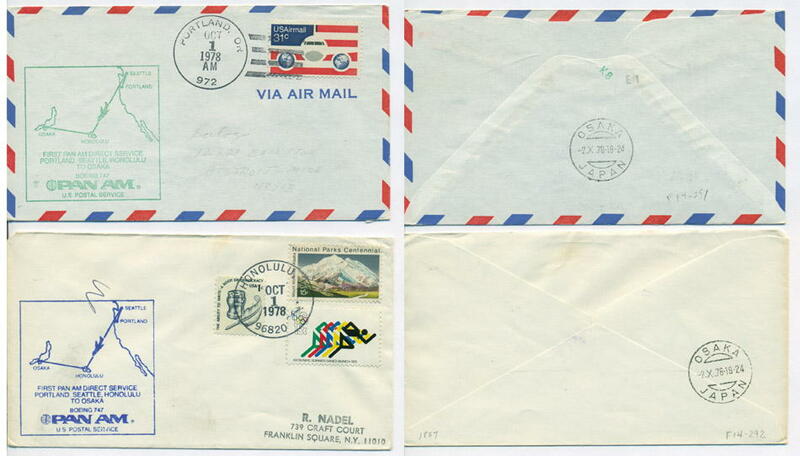 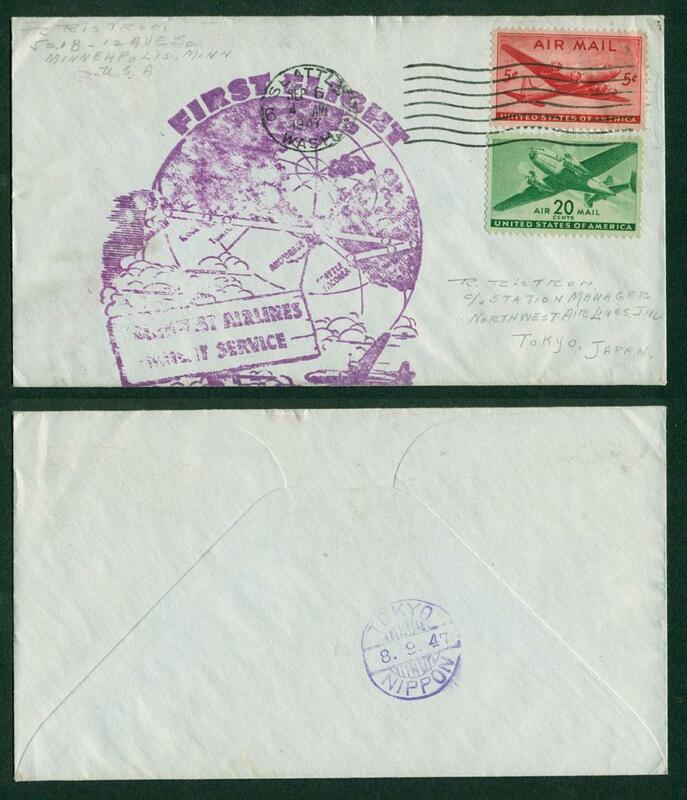 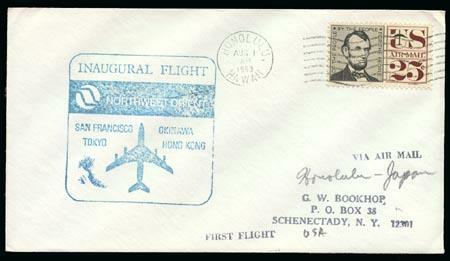 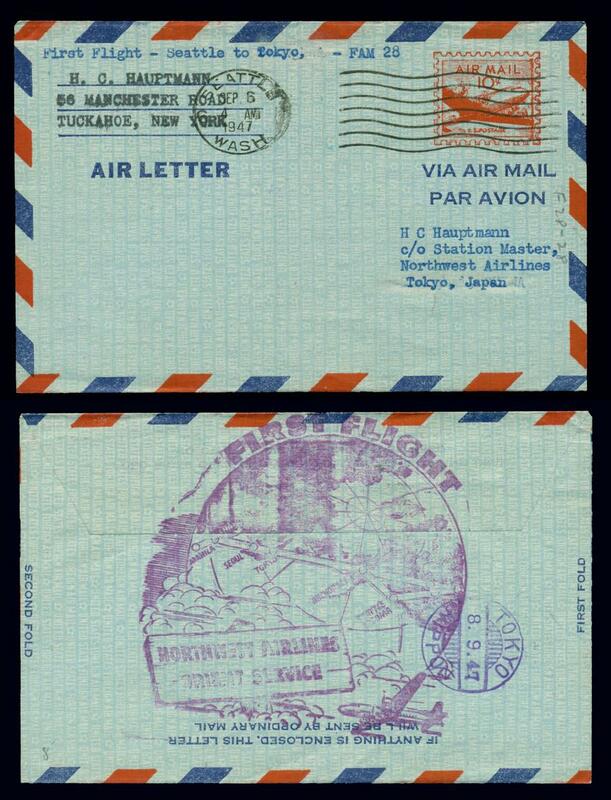 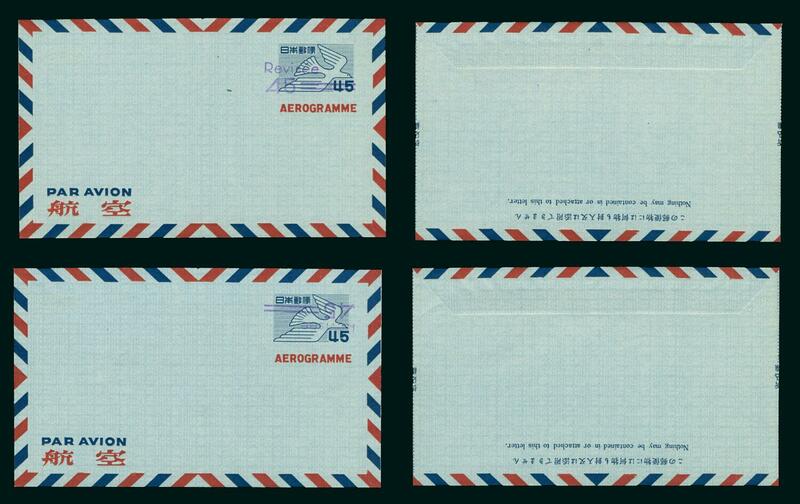 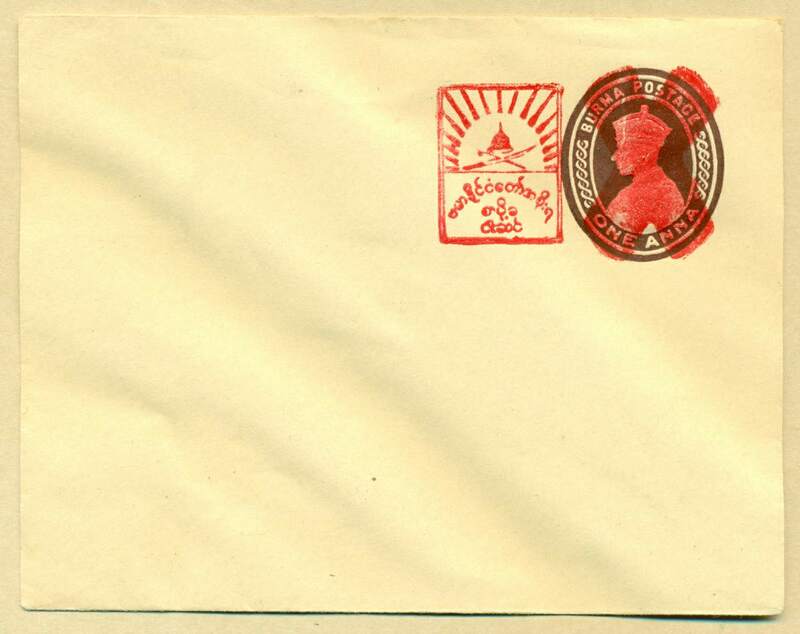 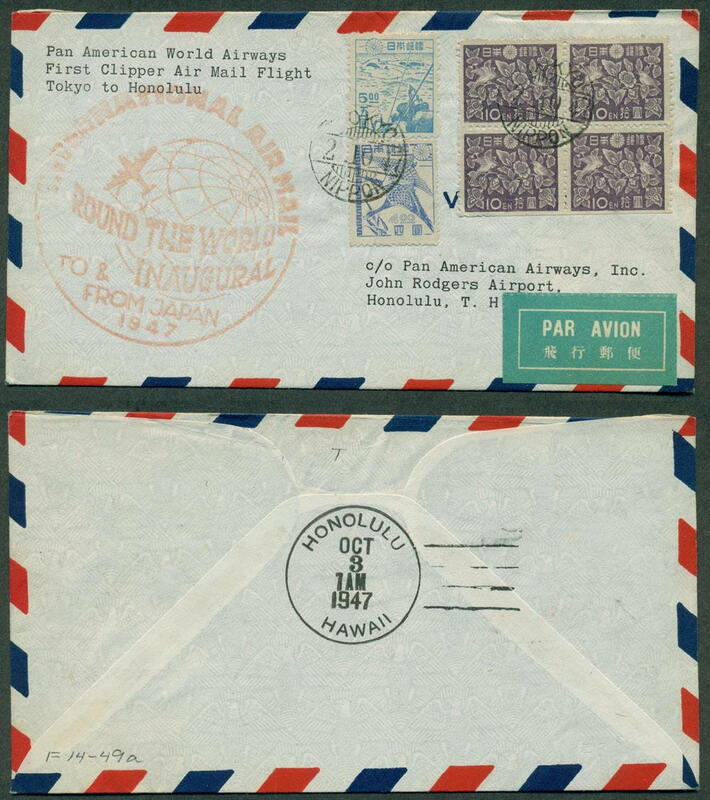 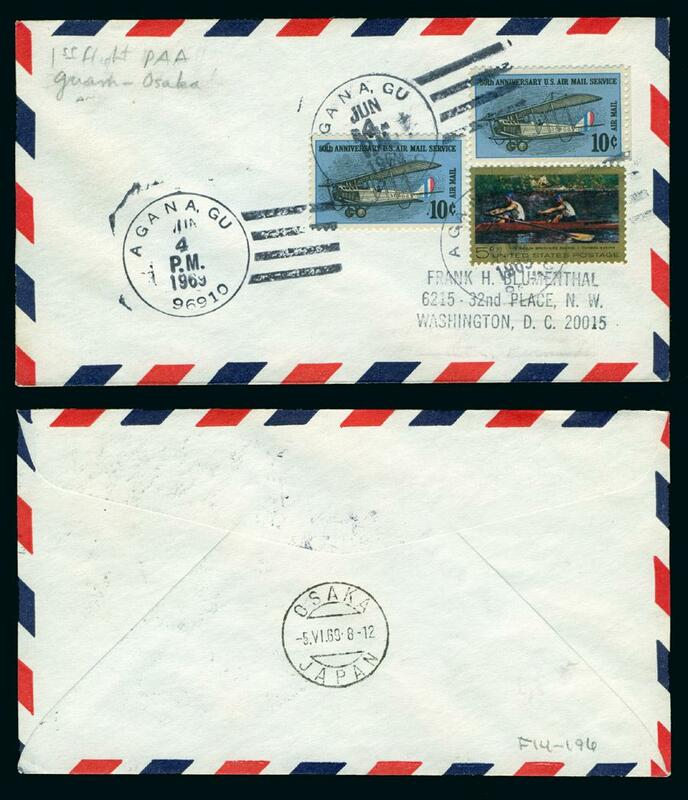 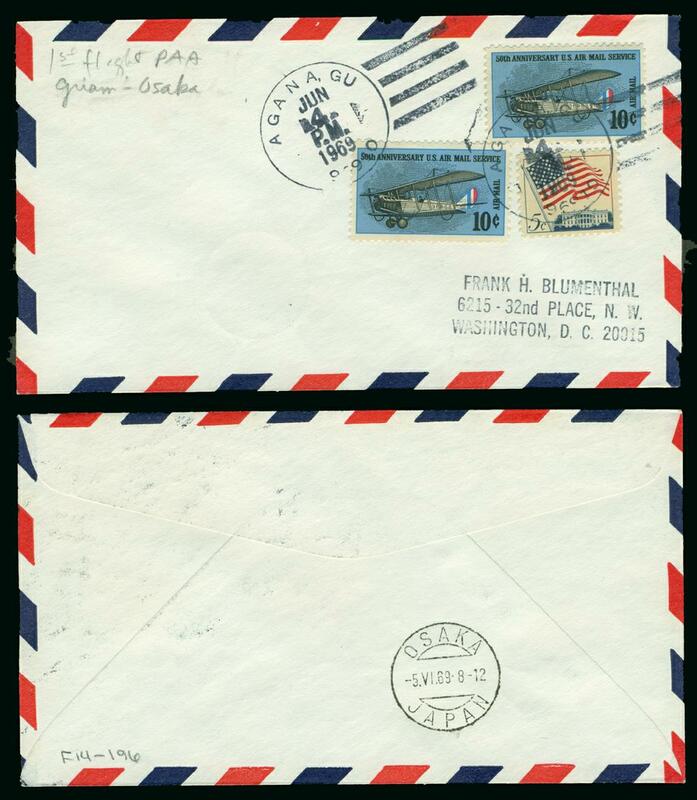 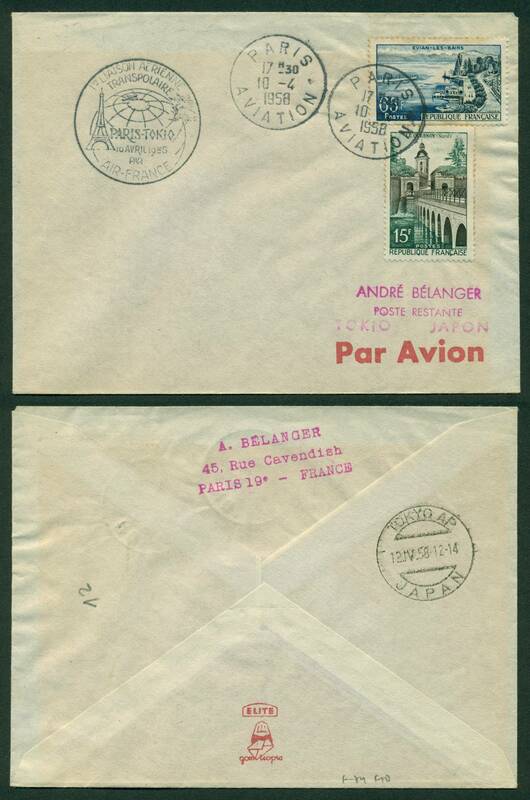 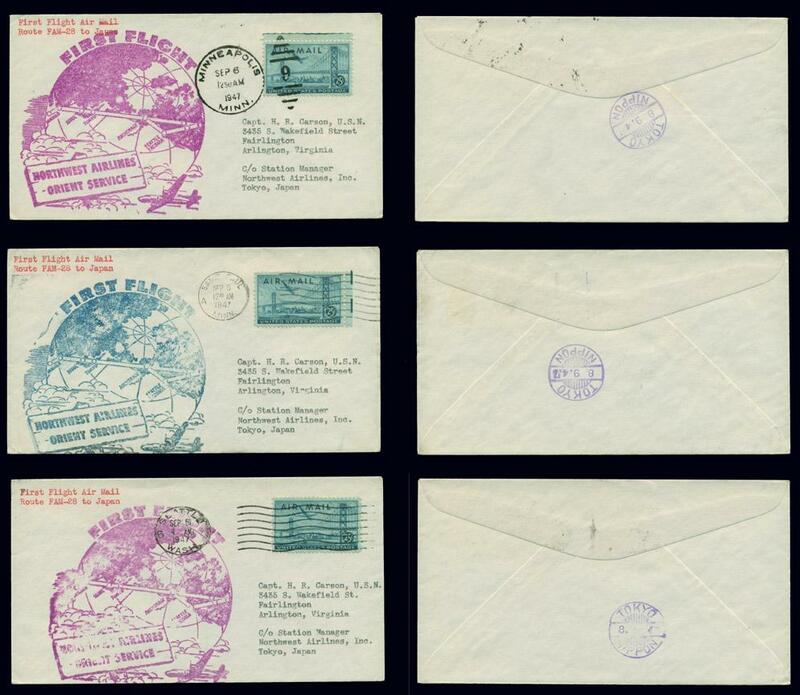 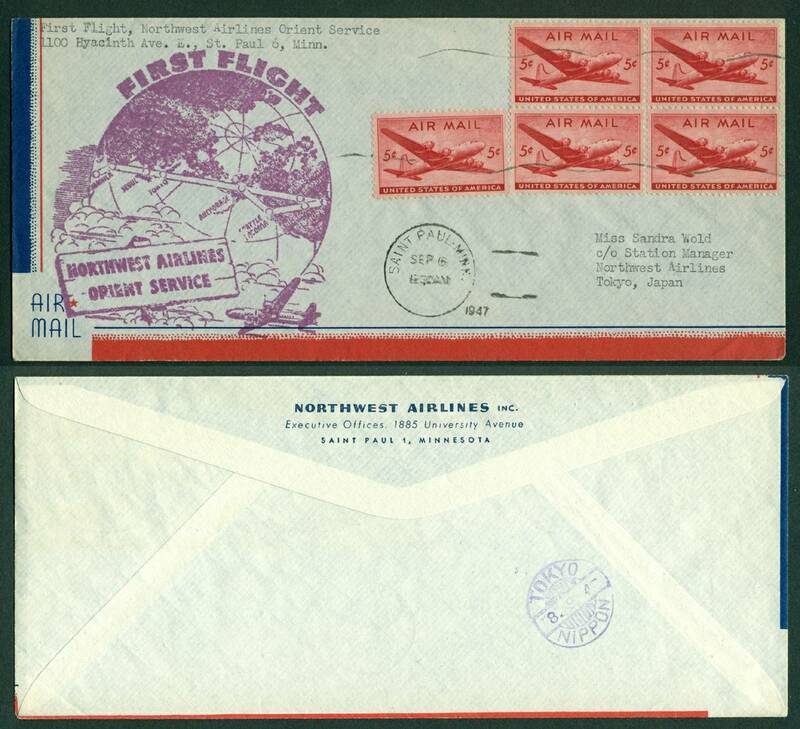 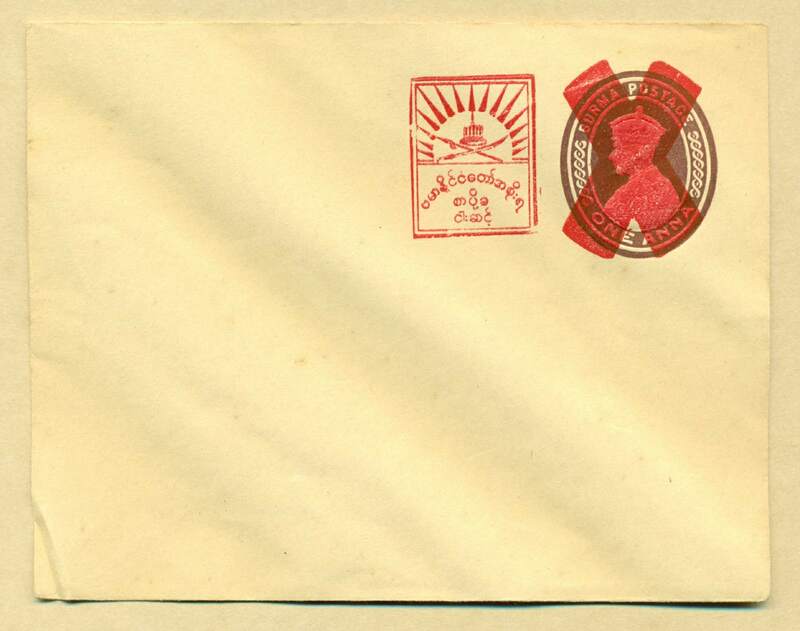 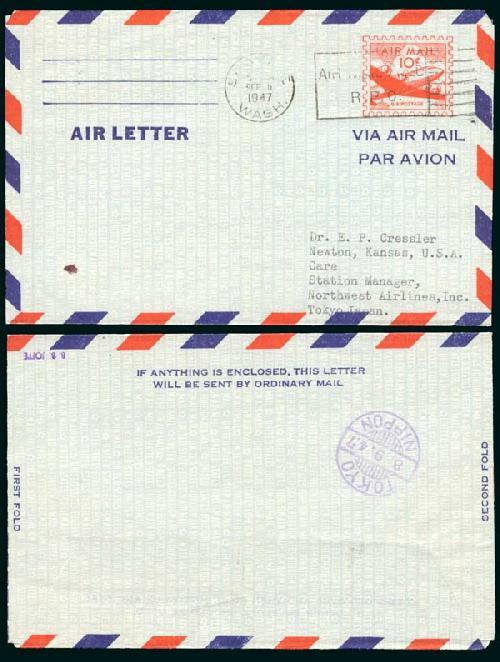 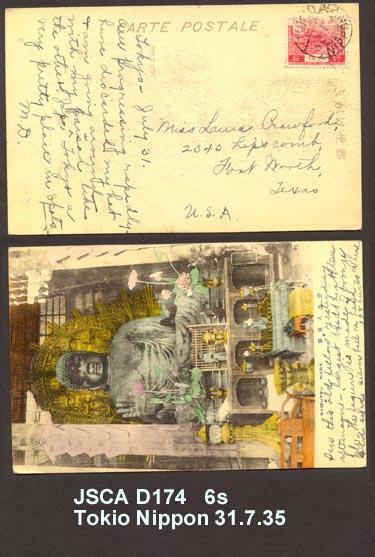 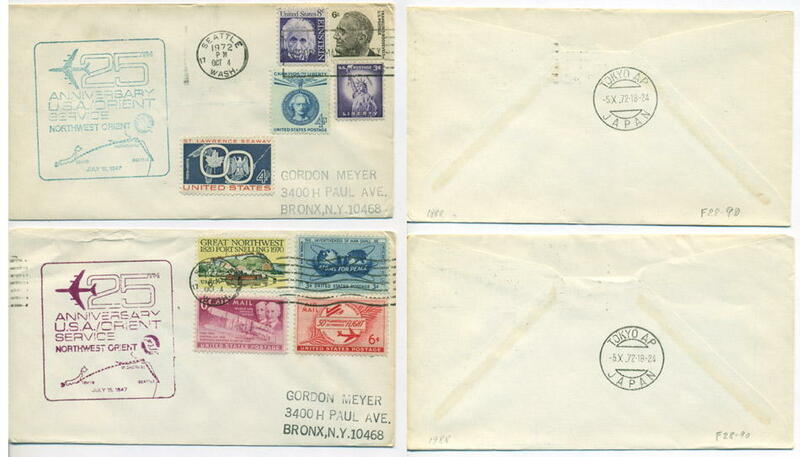 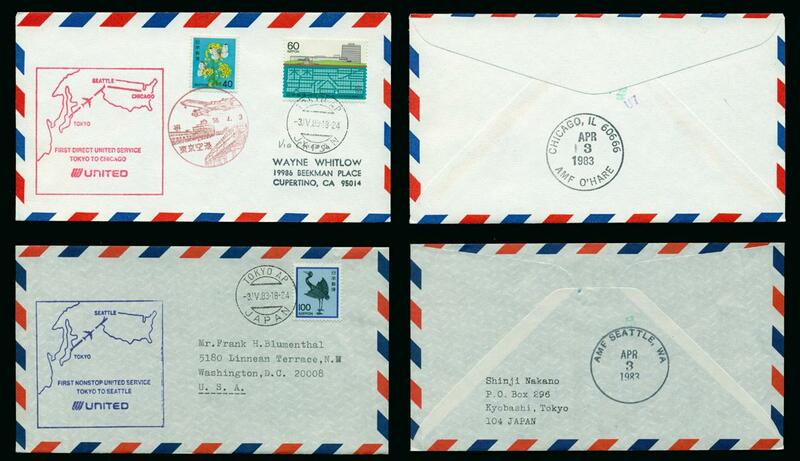 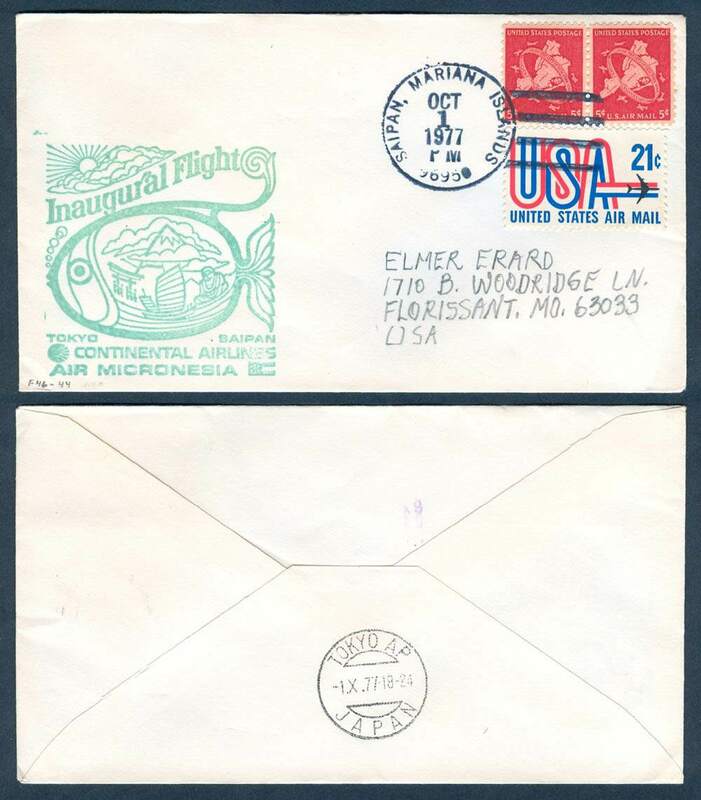 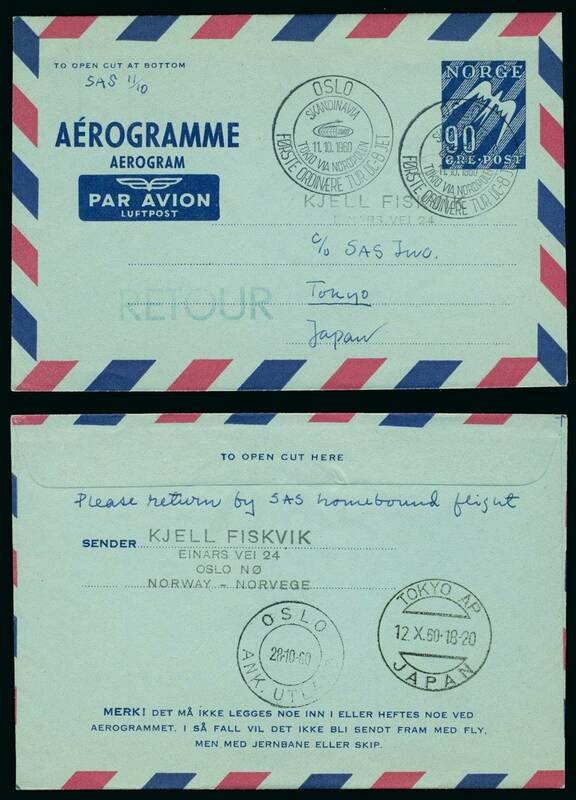 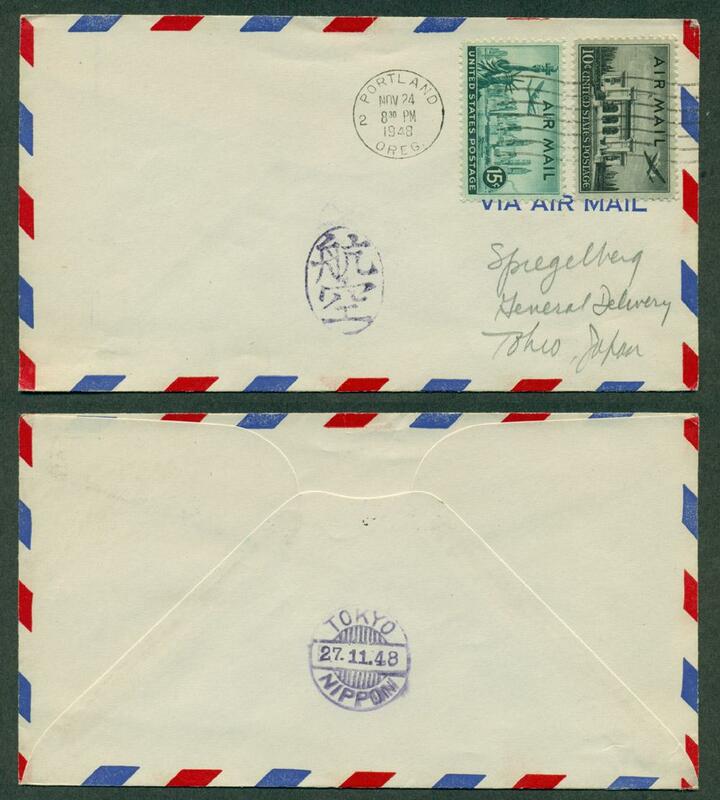 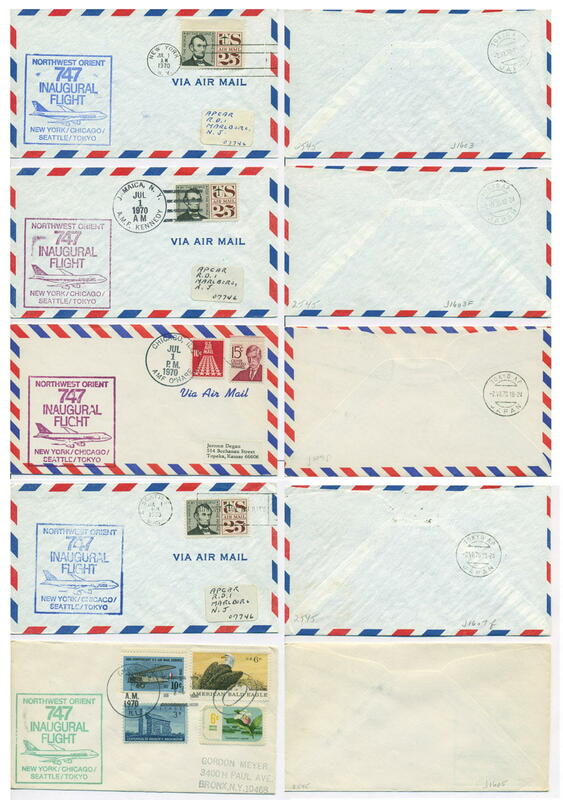 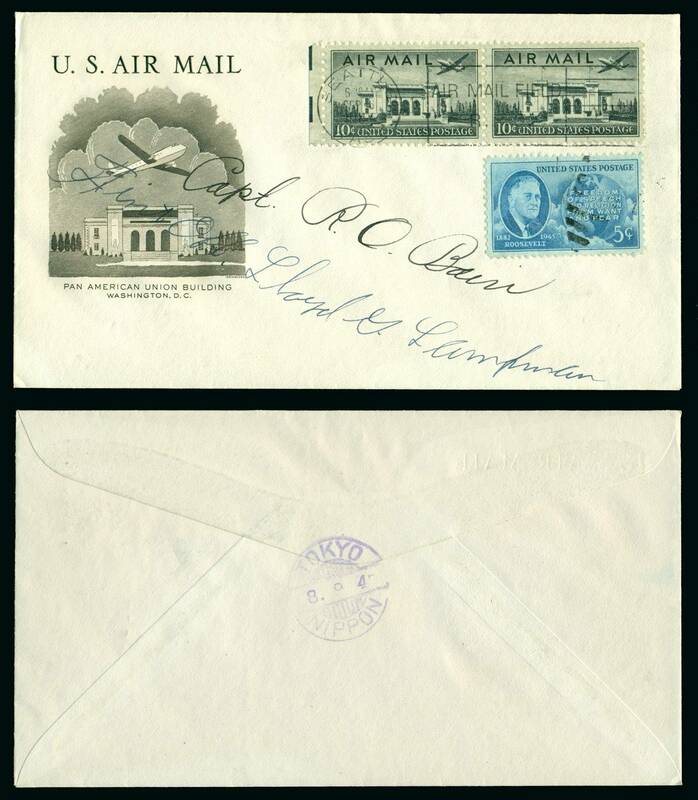 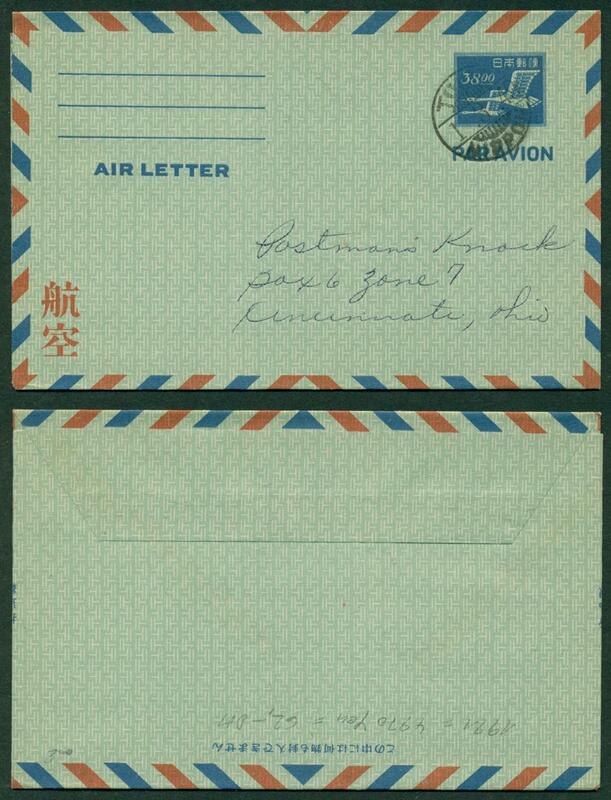 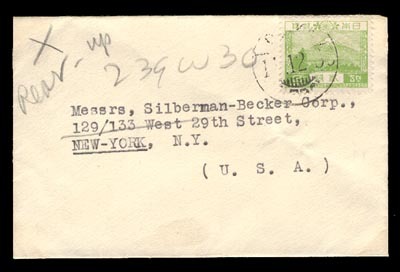 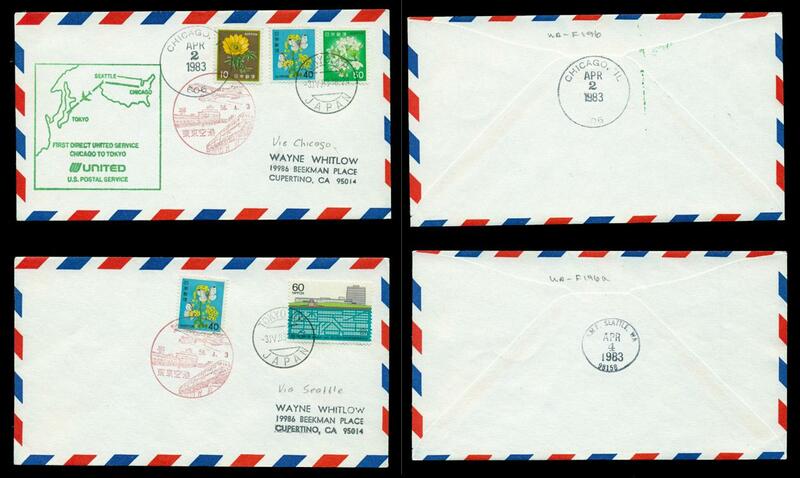 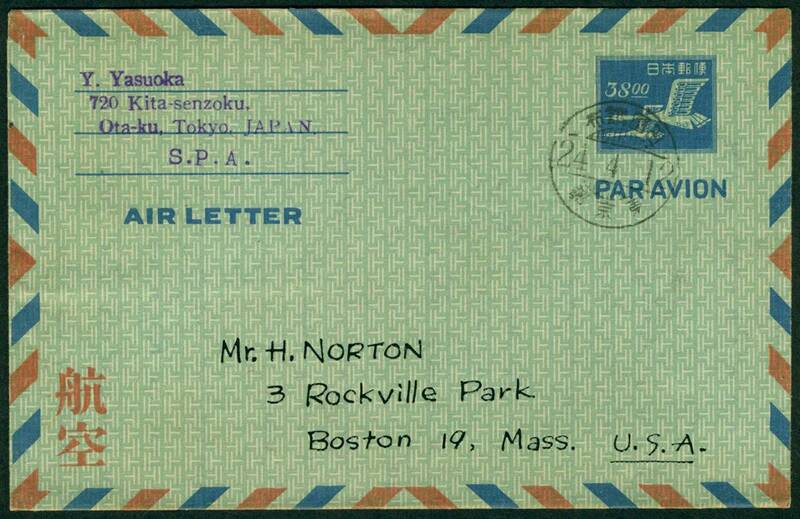 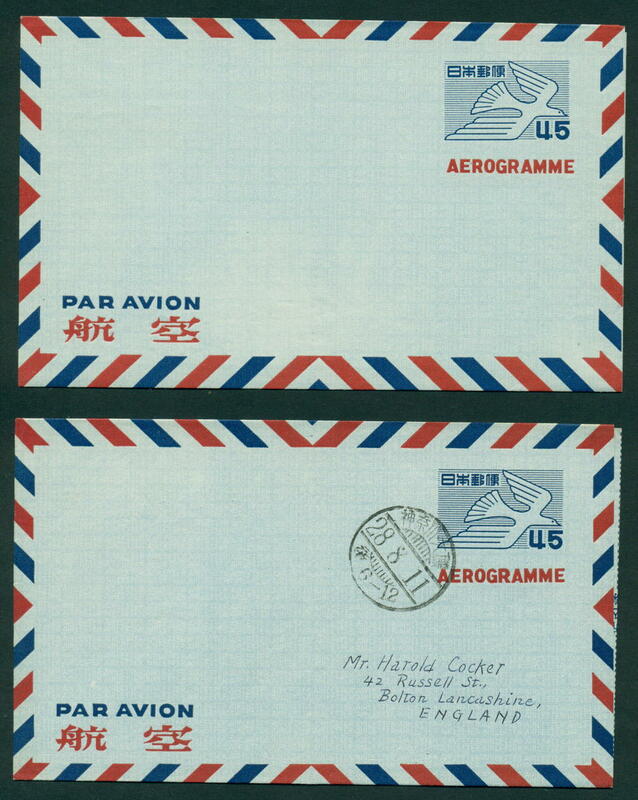 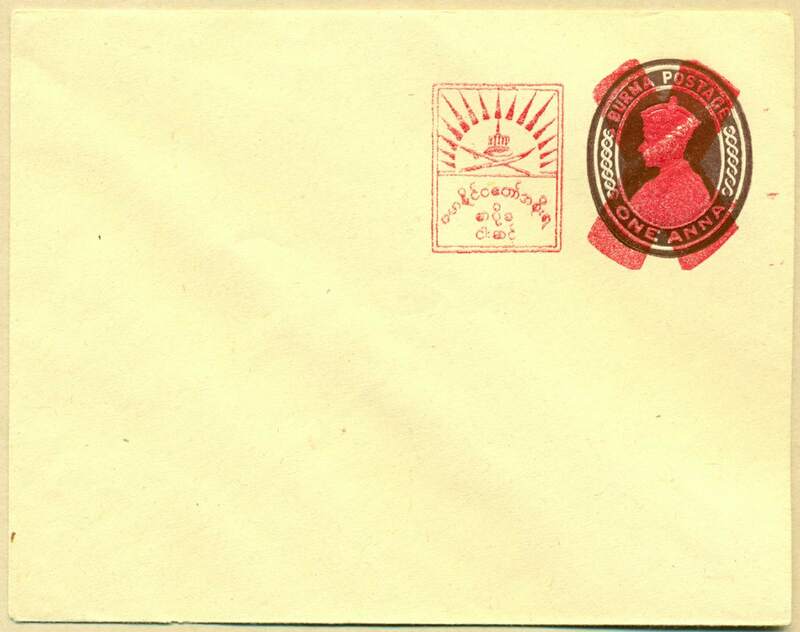 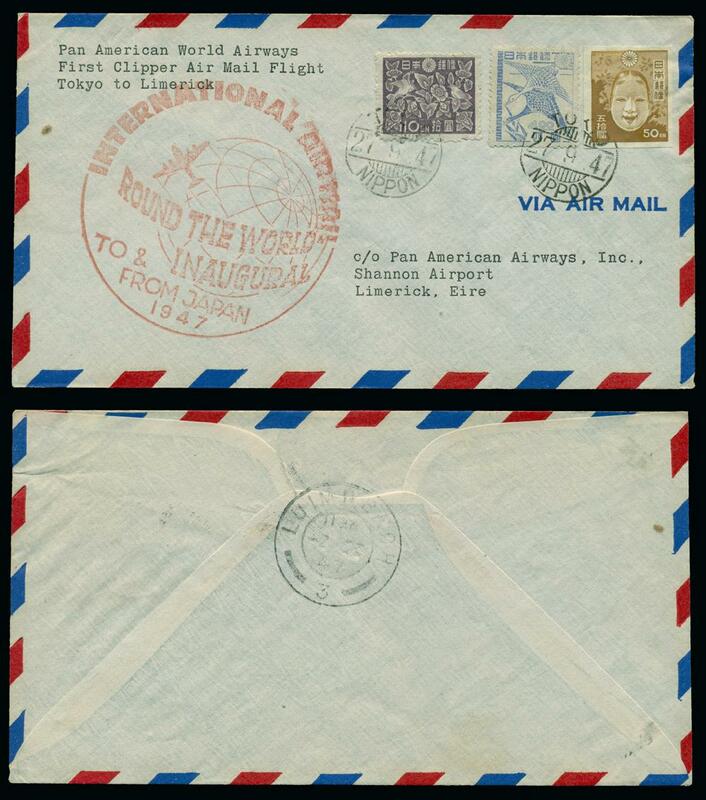 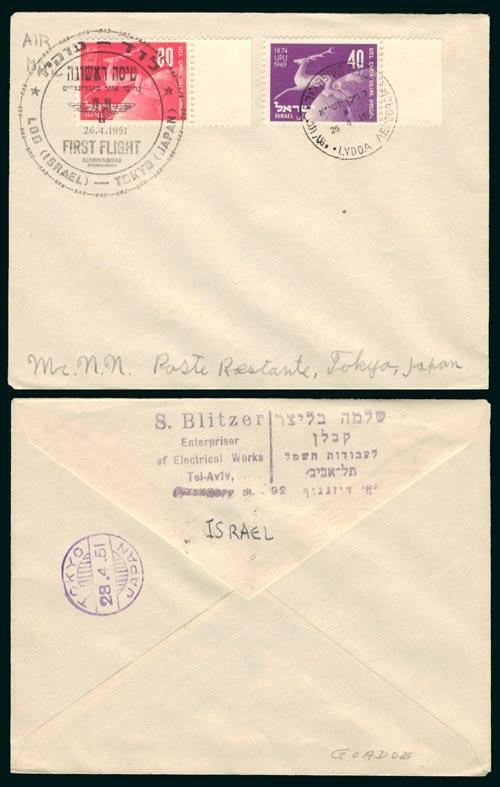 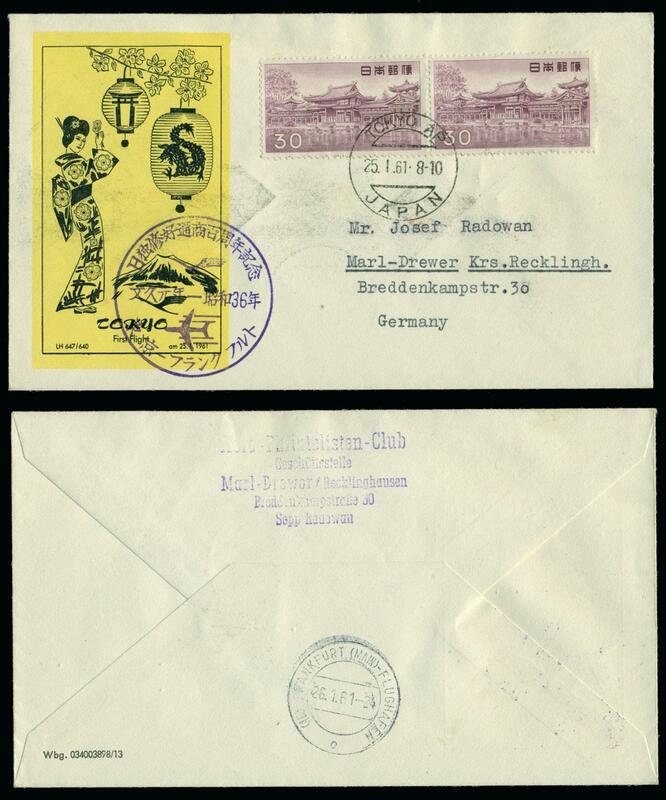 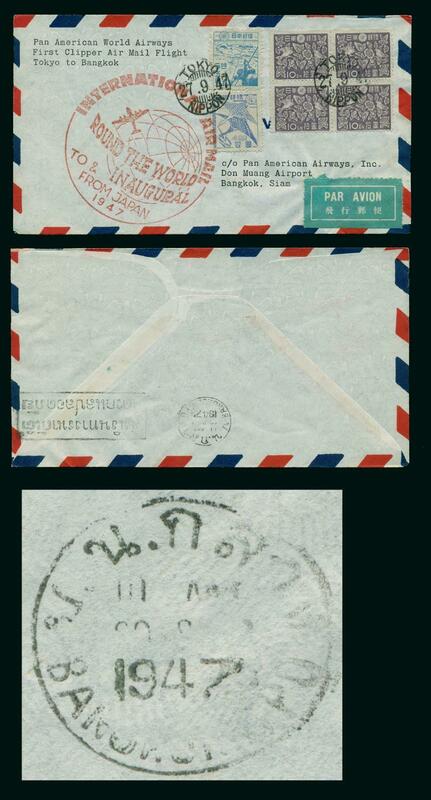 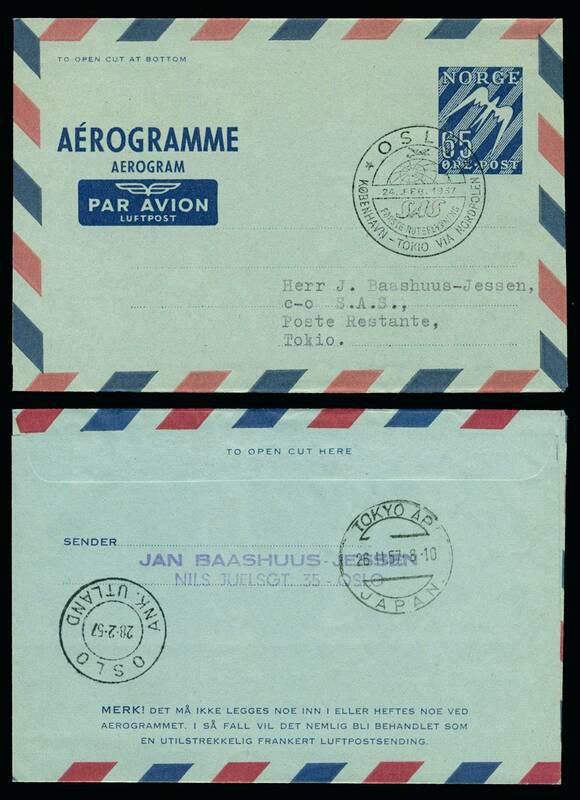 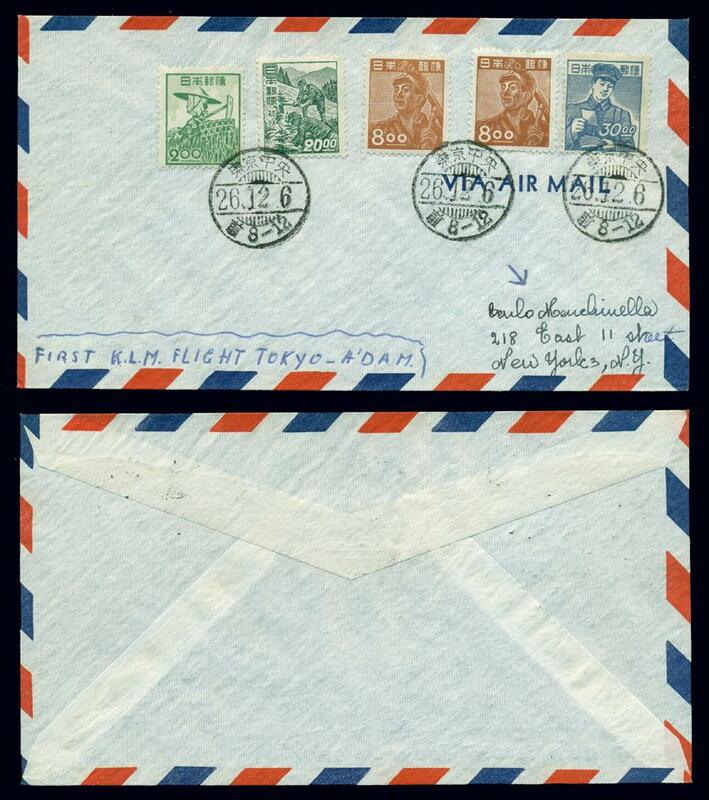 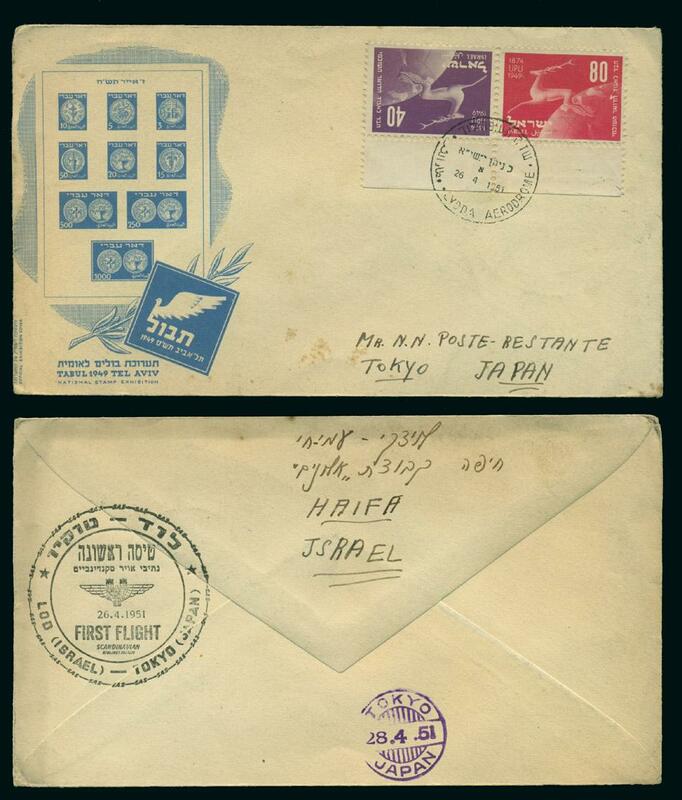 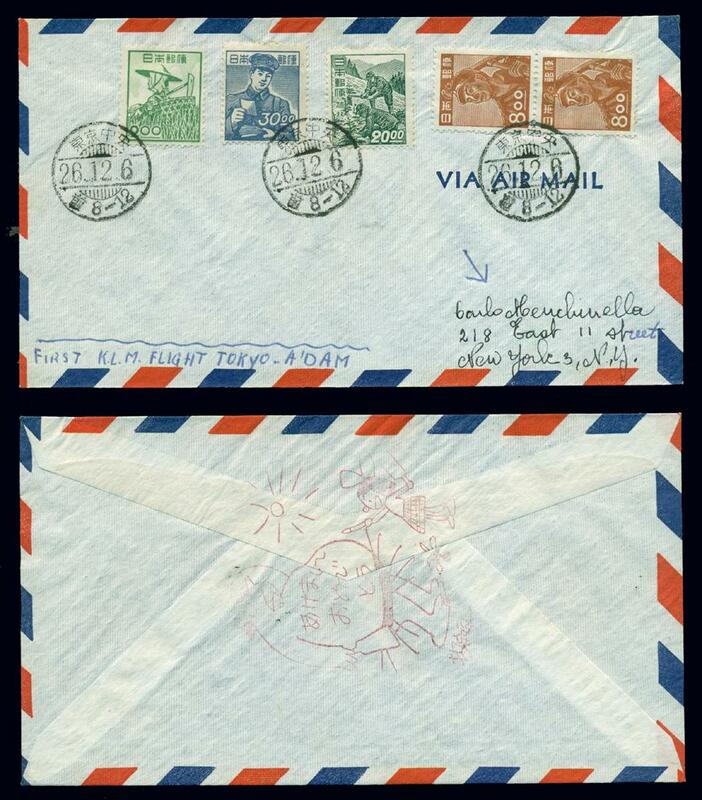 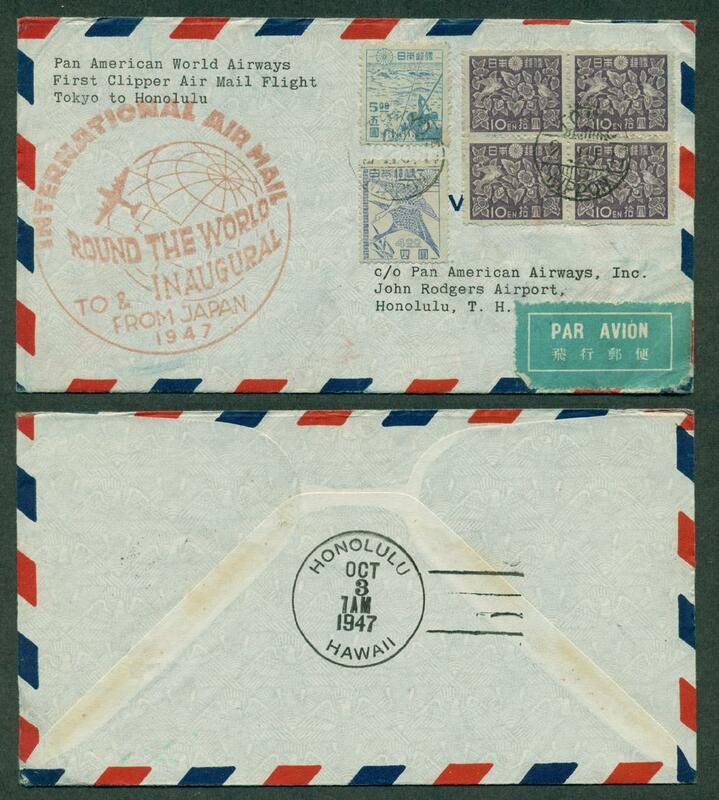 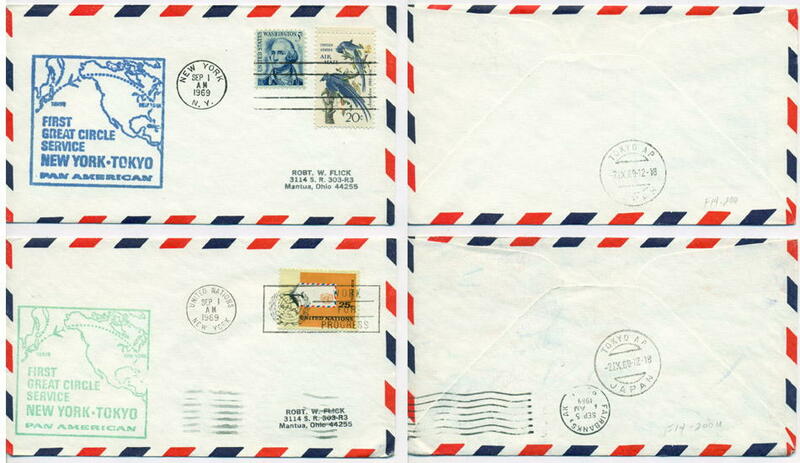 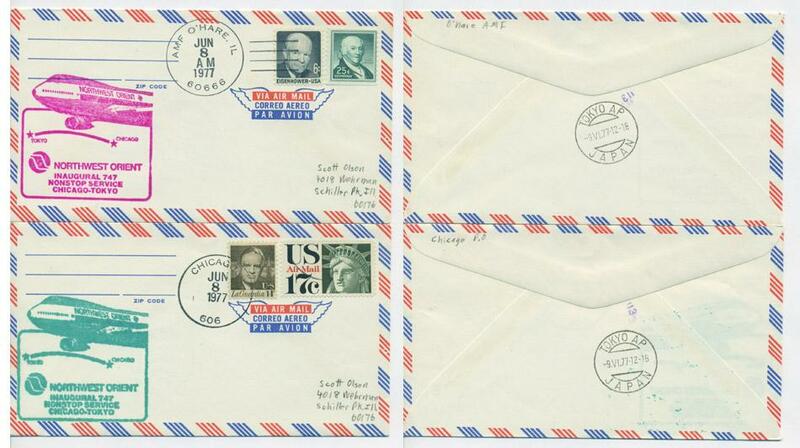 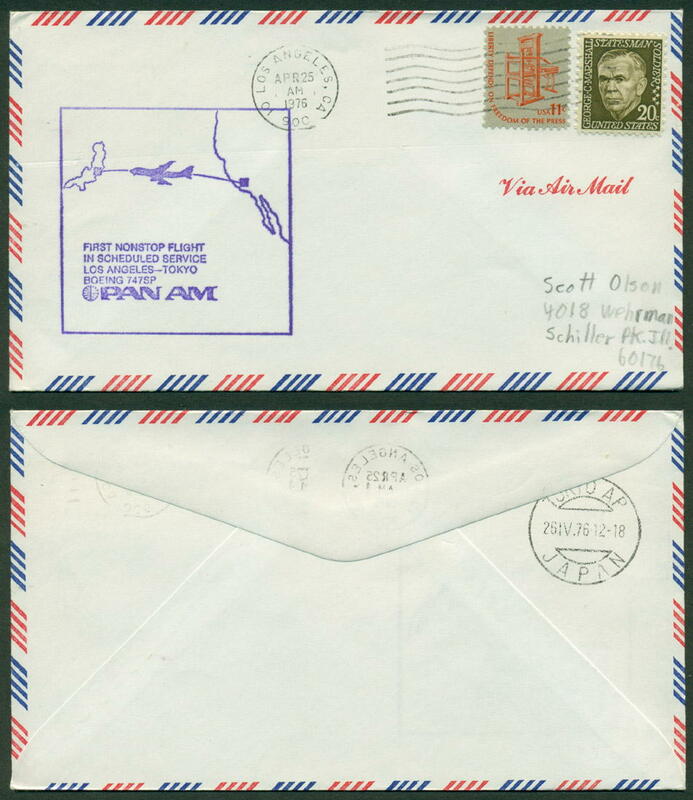 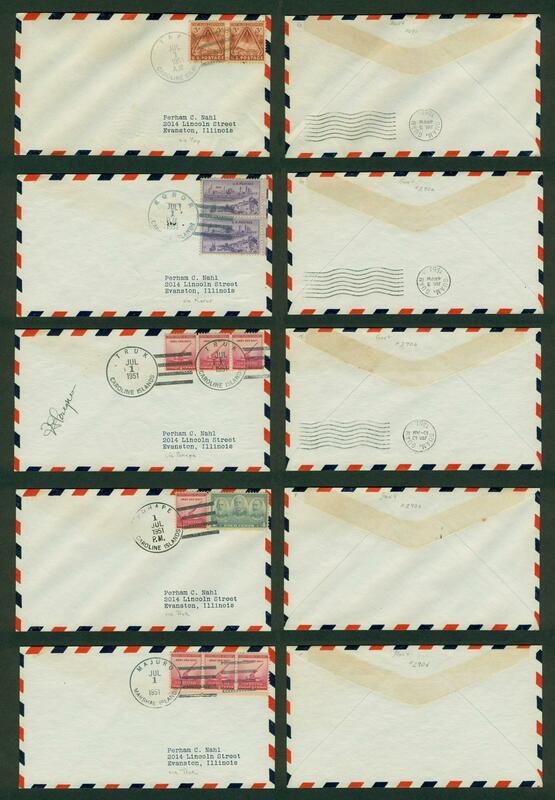 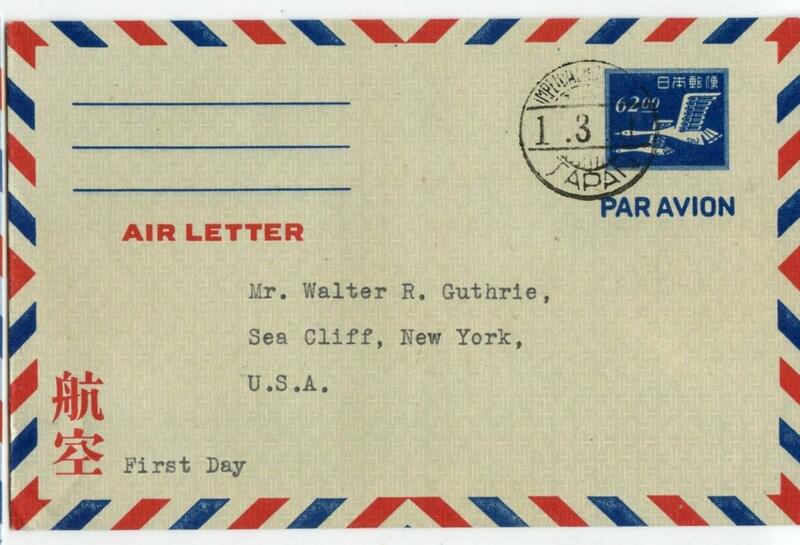 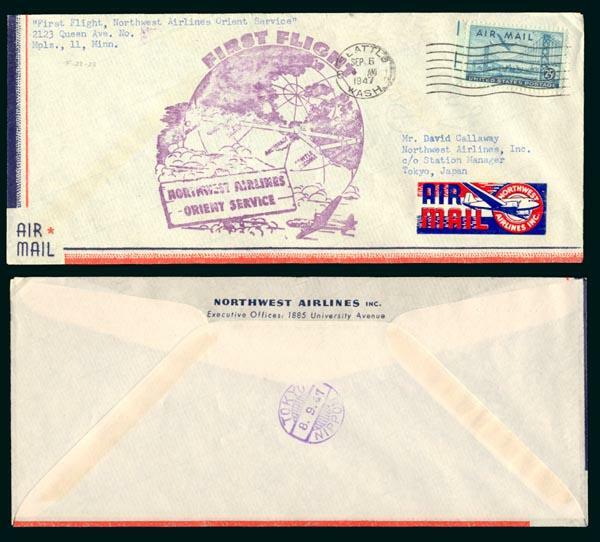 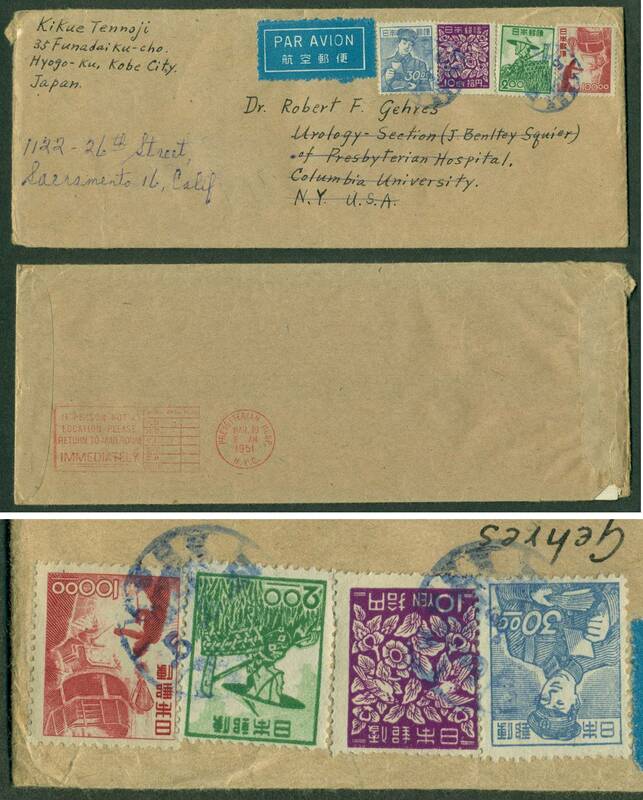 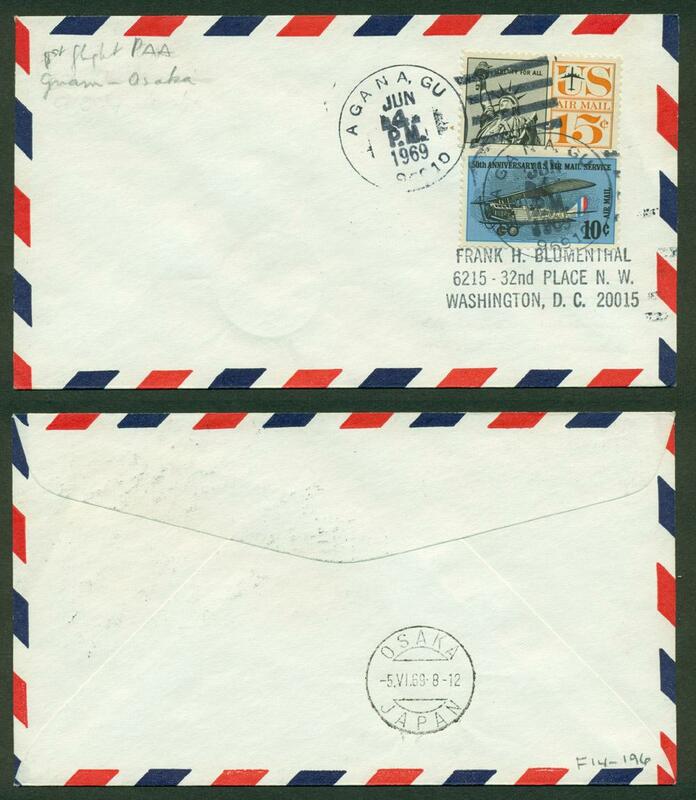 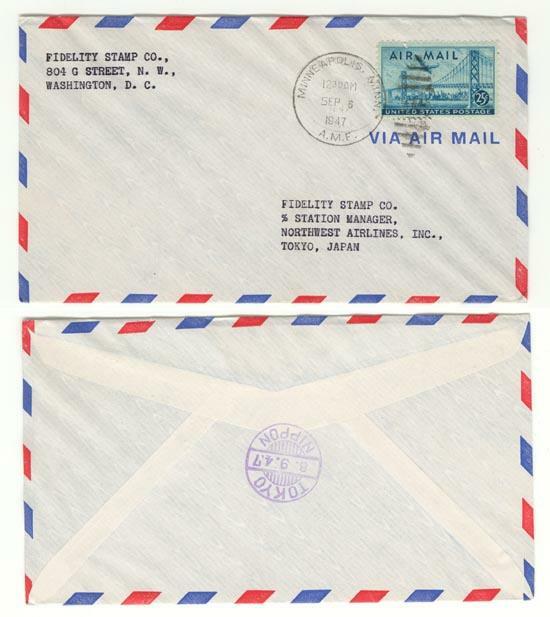 Numerous covers (franked envelopes) and canceled stamps are presented in color with descriptive titles. 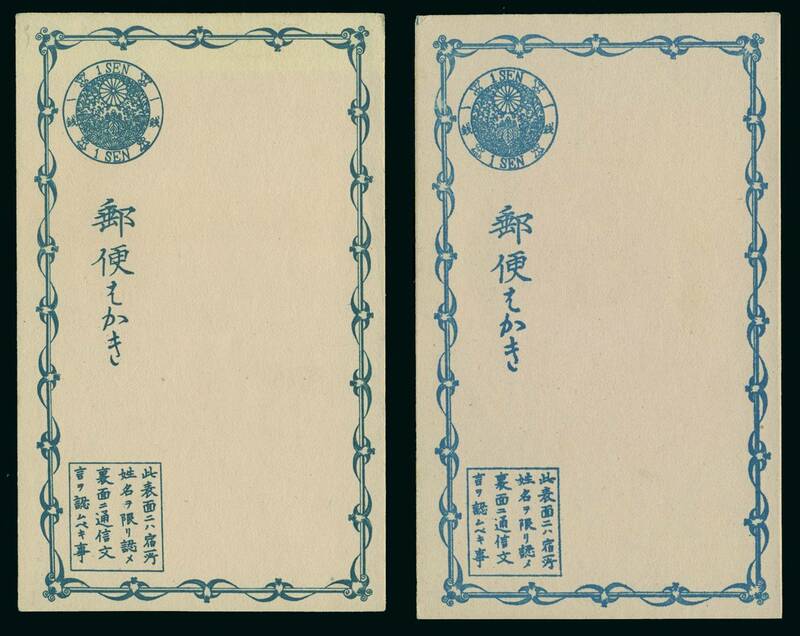 A key reference for this very rare material. 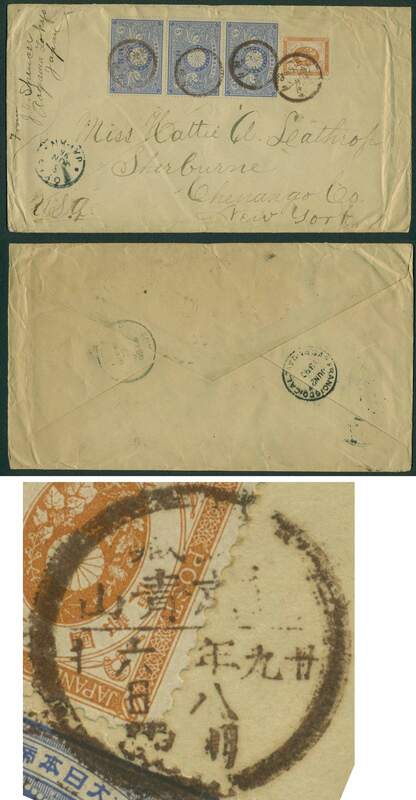 The first cover pictured in the book is an official (Public Business) cover from Commodore Perry aboard the Susquehanna with a letter dated May 23, 1853. 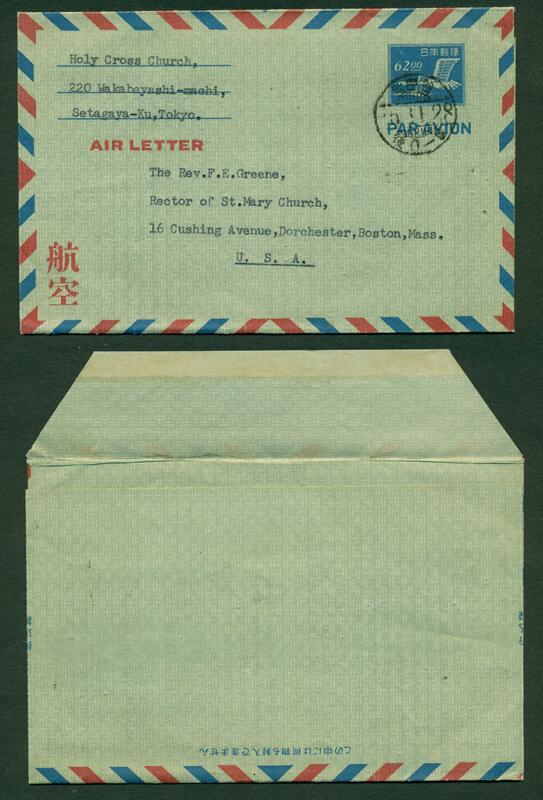 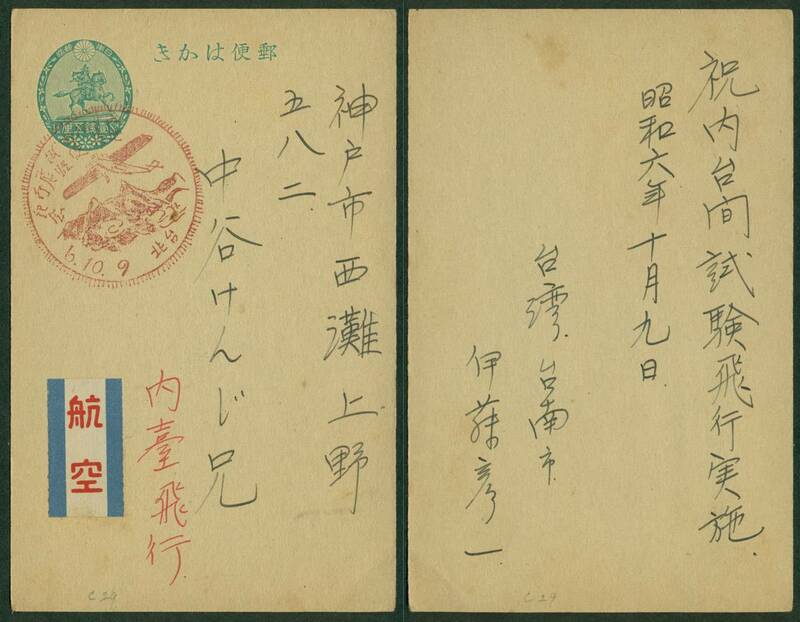 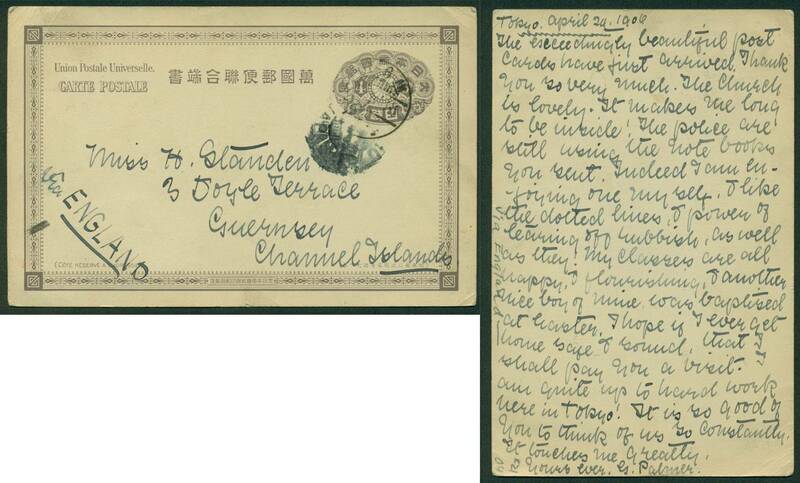 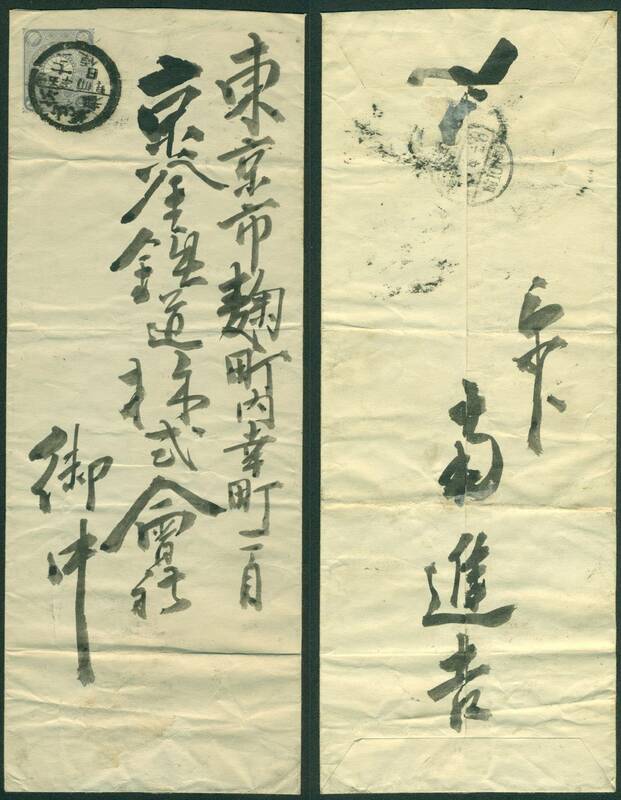 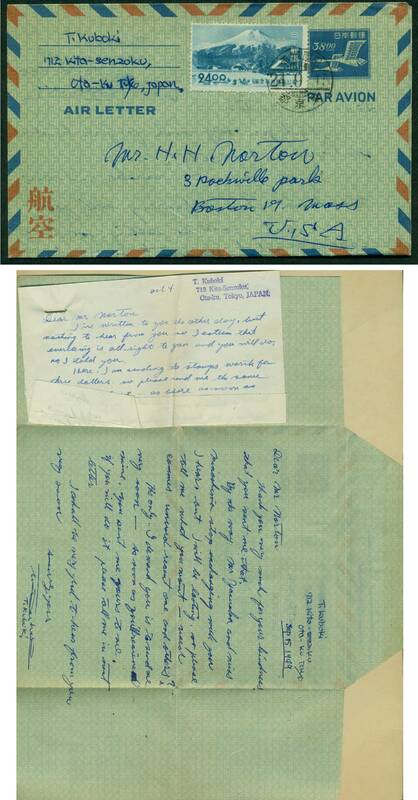 This letter would have been written while Perry was en route to Okinawa (arriving May 26) from China. 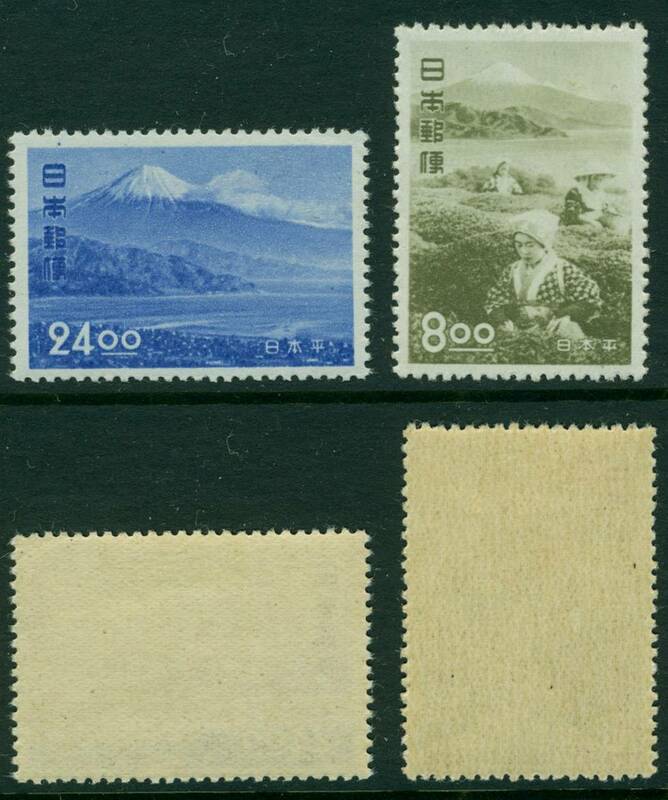 Pacific Crossings from Japan, 1858-79, I.S.J.P Monograph 3, International Society for Japanese Philately, reprinted from Japanese Philately, Volume 24, No. 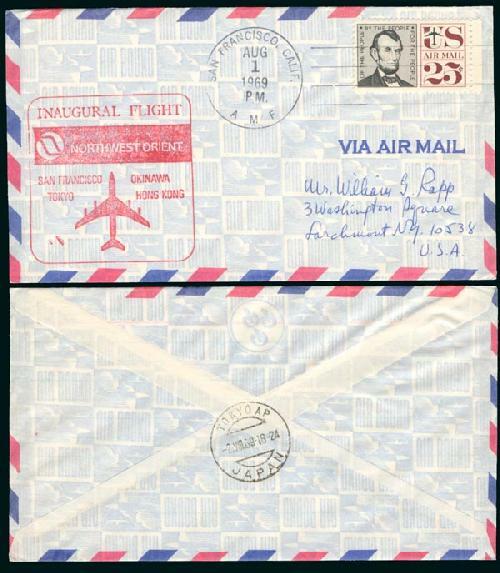 6 (Part 2, Pages 1-32), December 1969, stapled wraps, 31 pp. 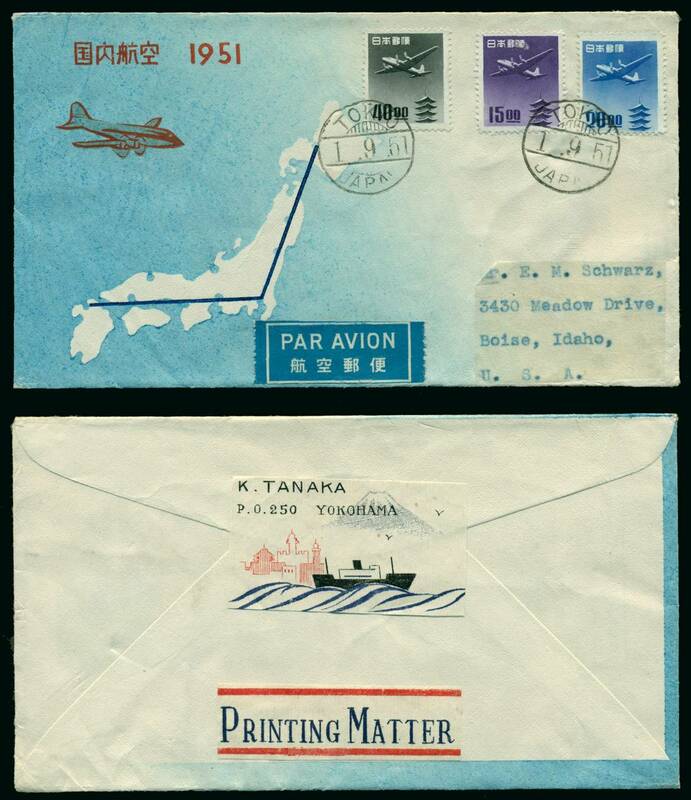 This monograph is a gold mine of information on ships going from Japan across the Pacific to the US. 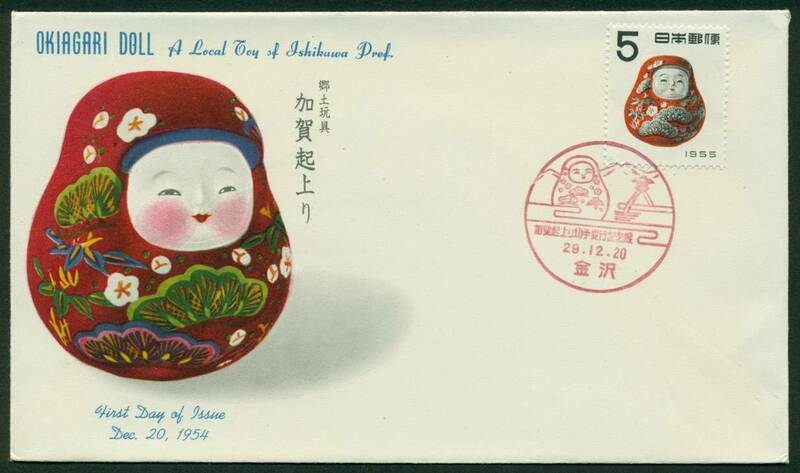 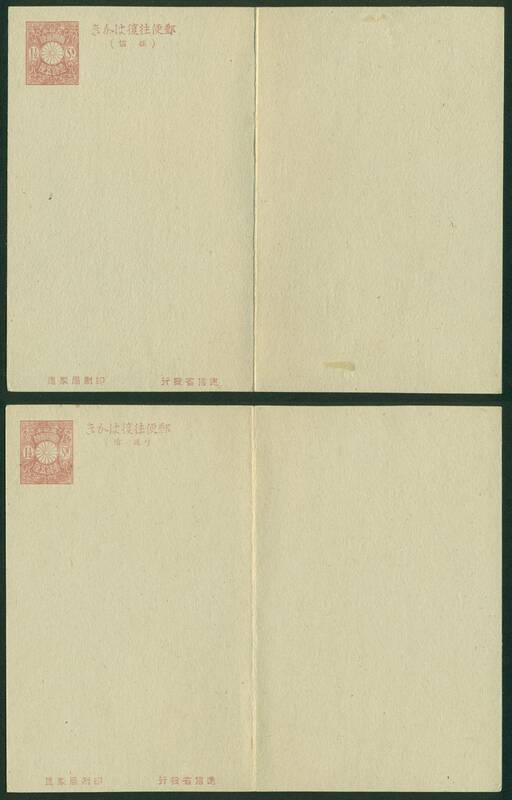 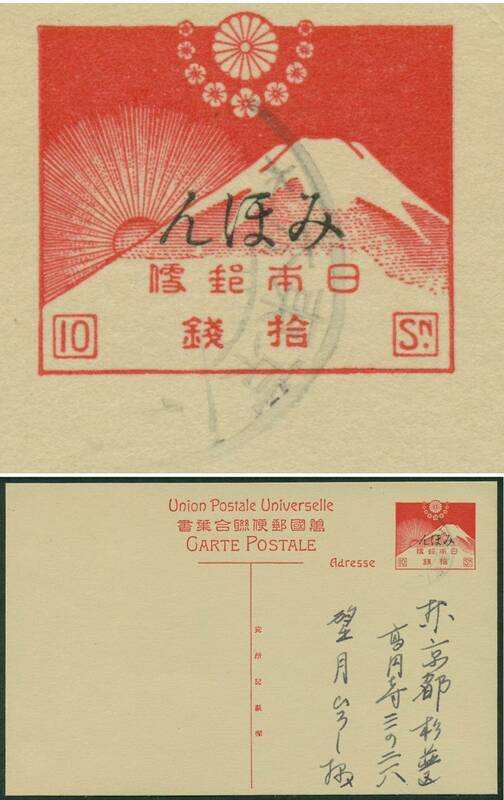 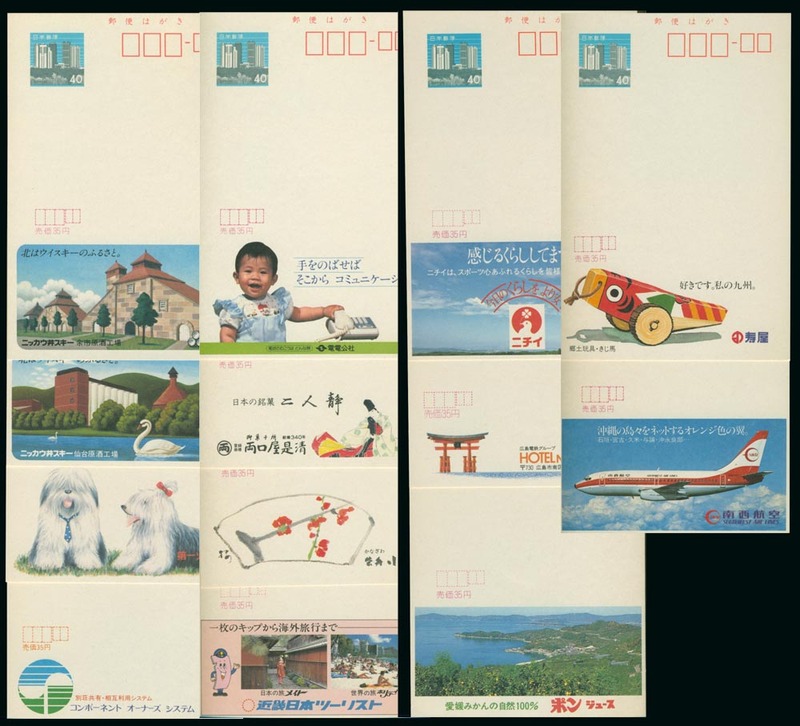 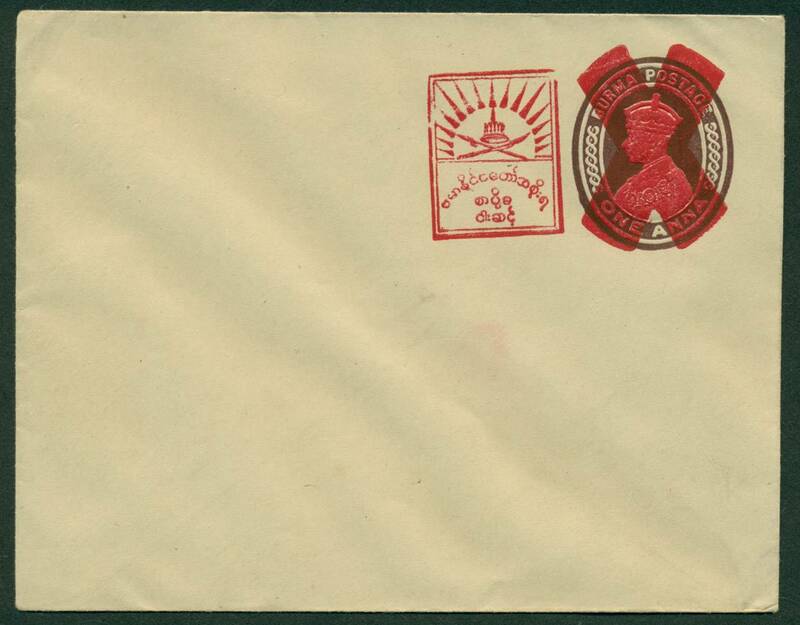 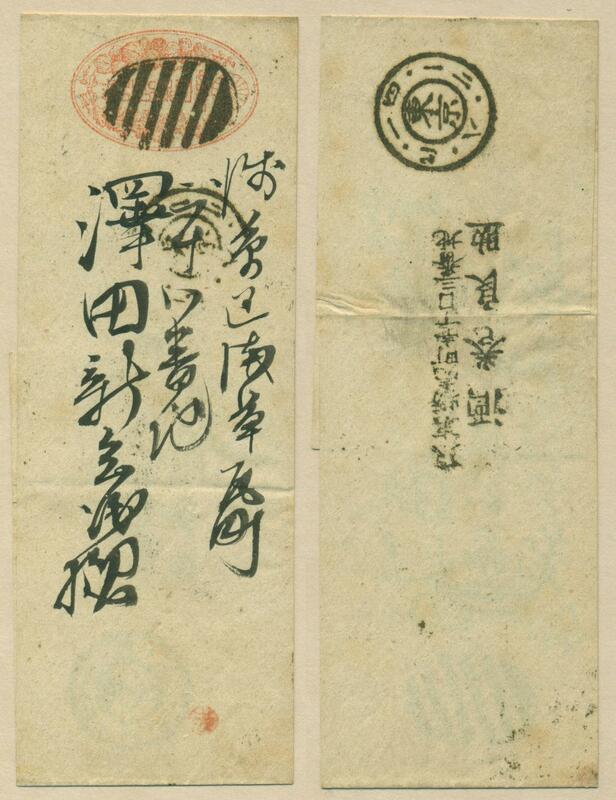 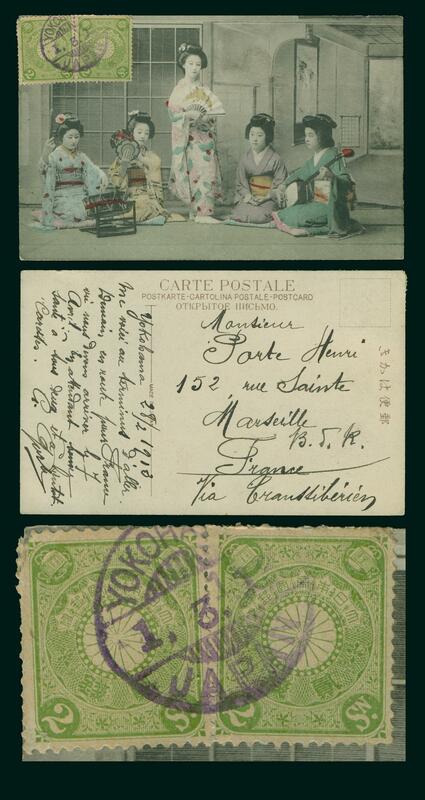 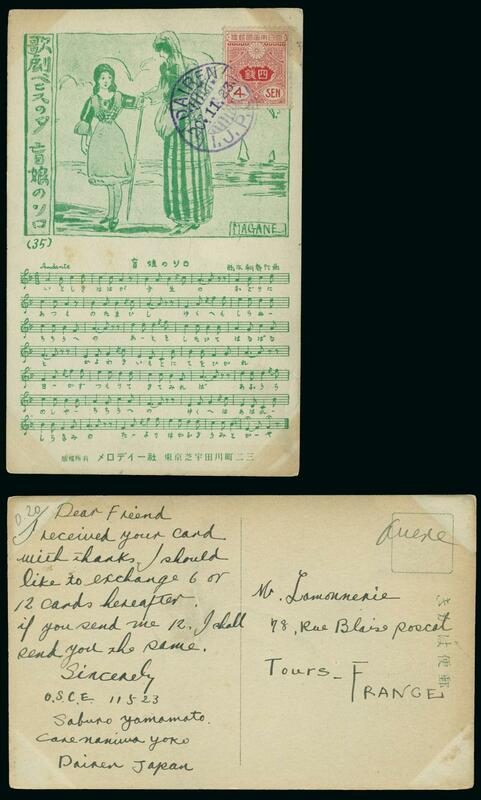 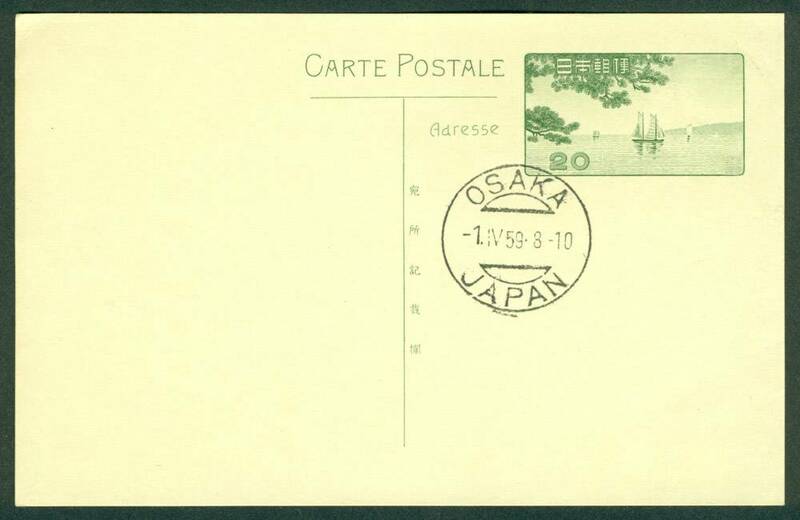 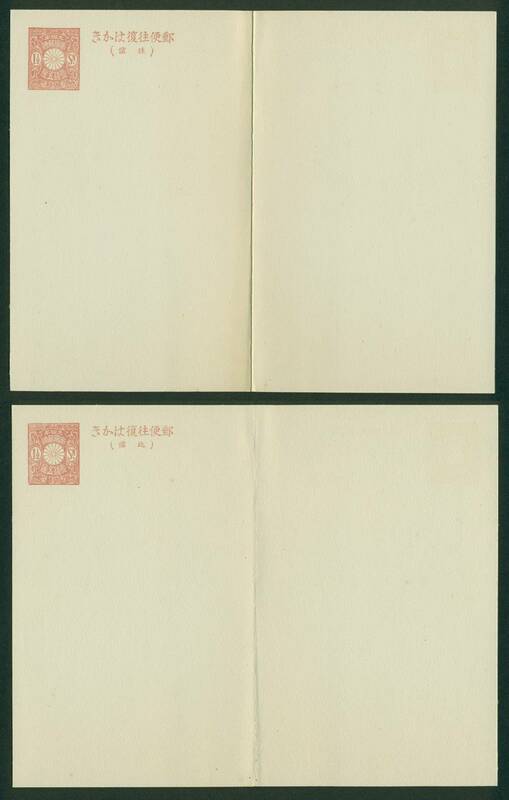 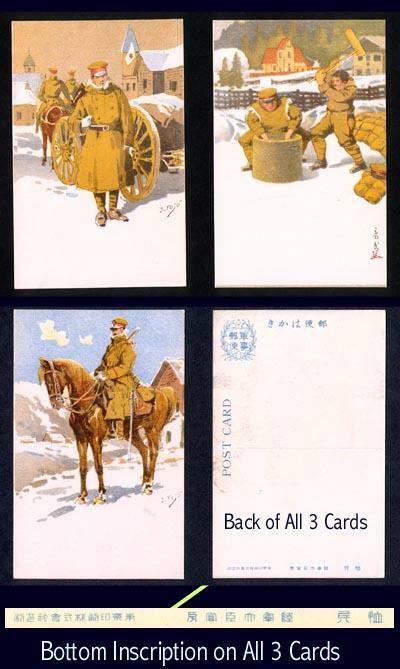 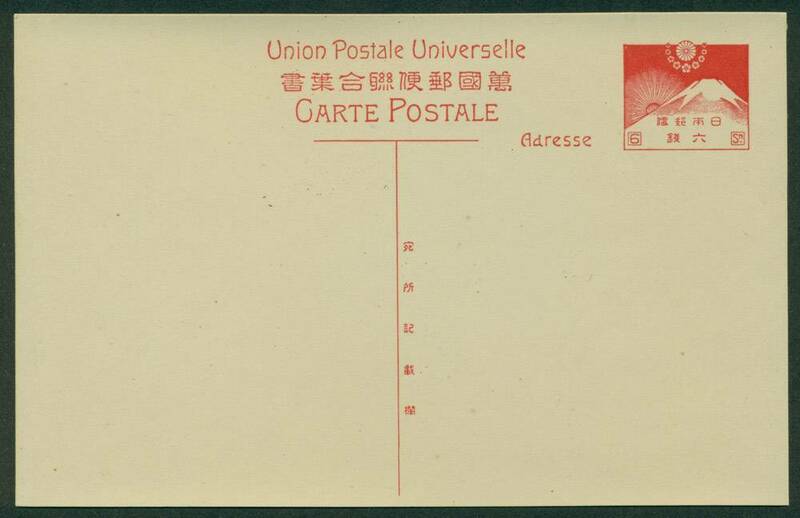 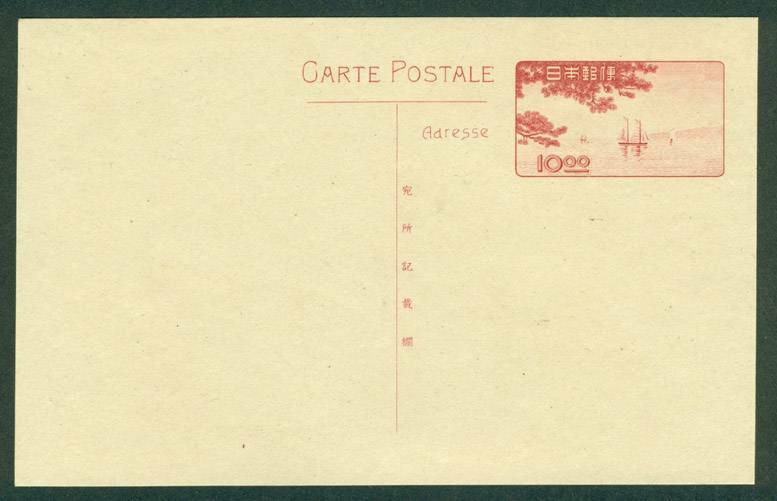 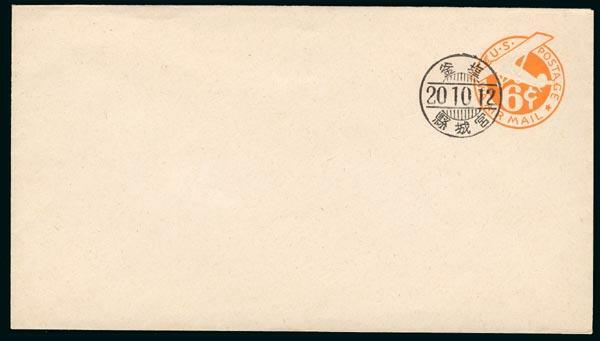 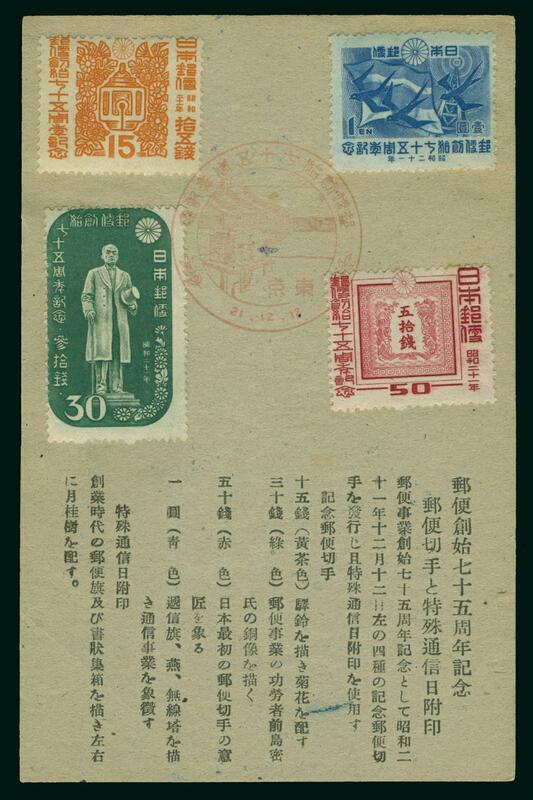 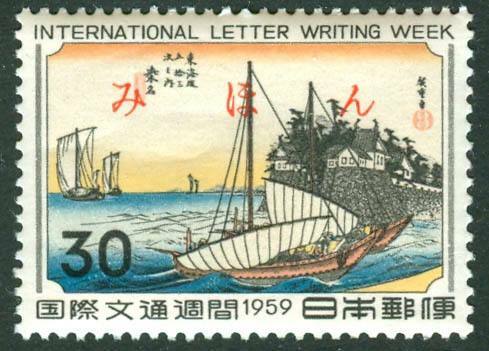 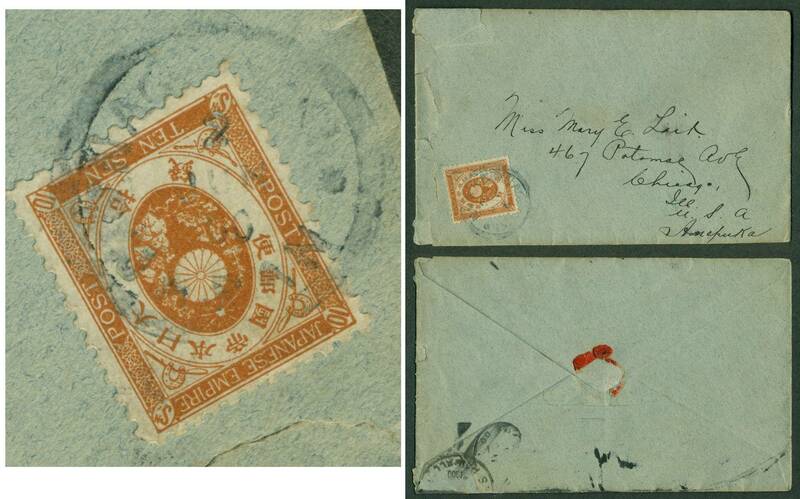 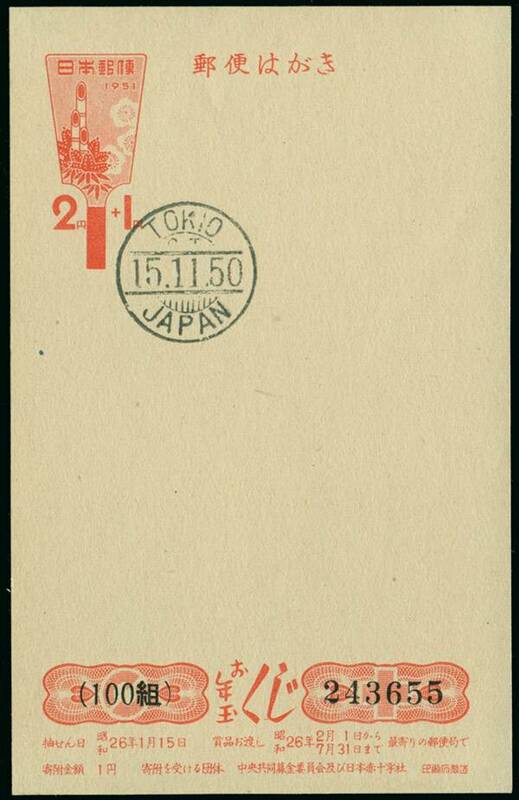 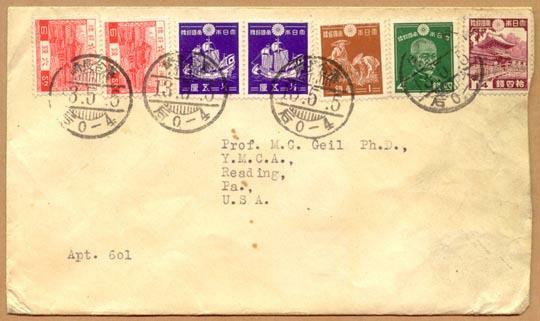 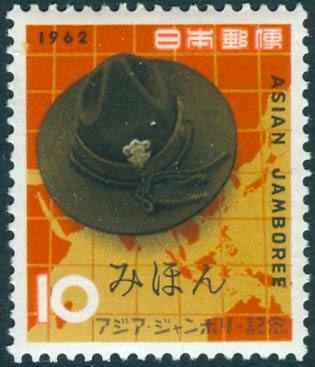 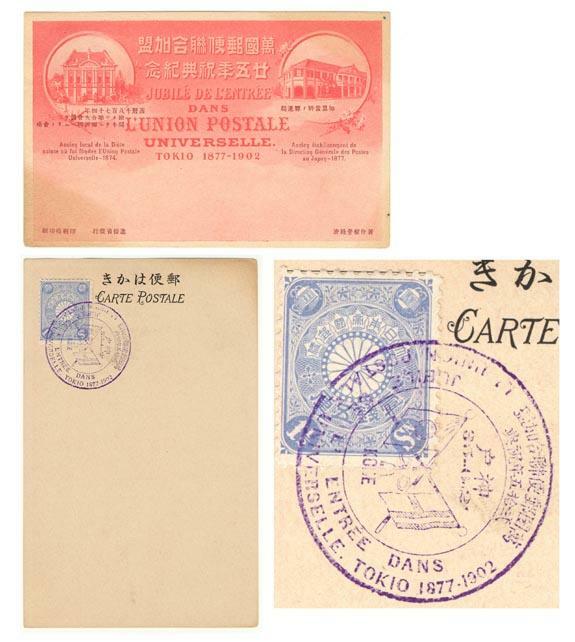 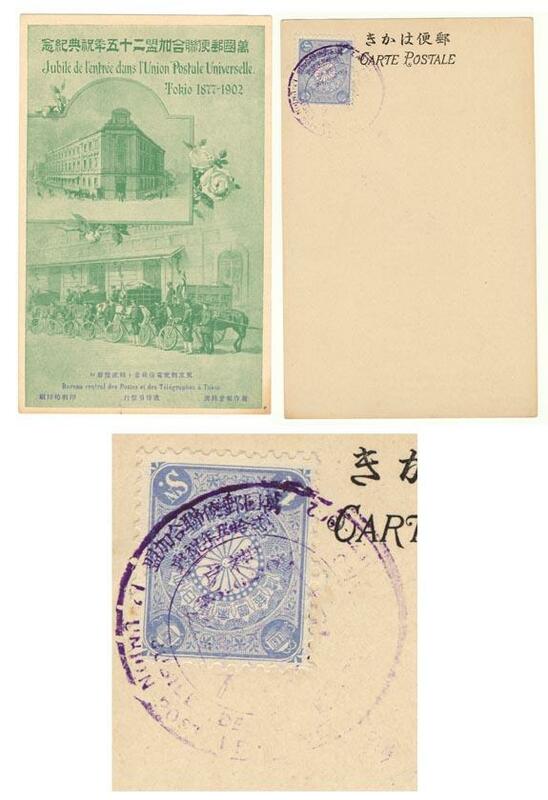 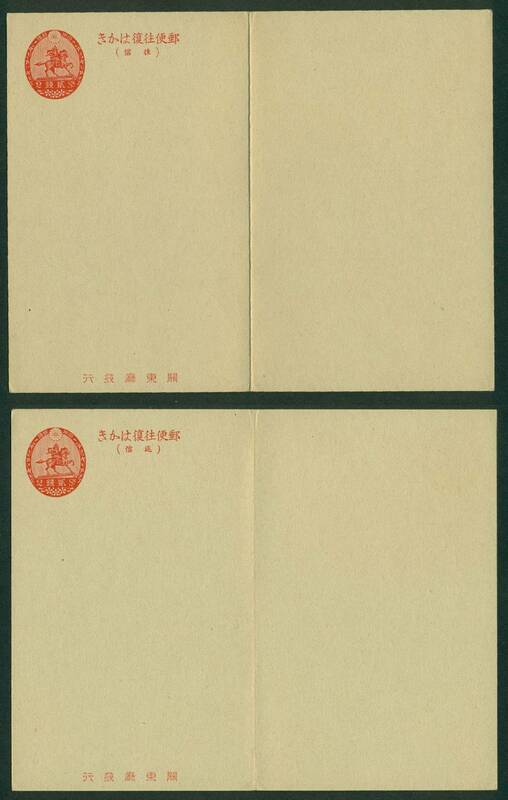 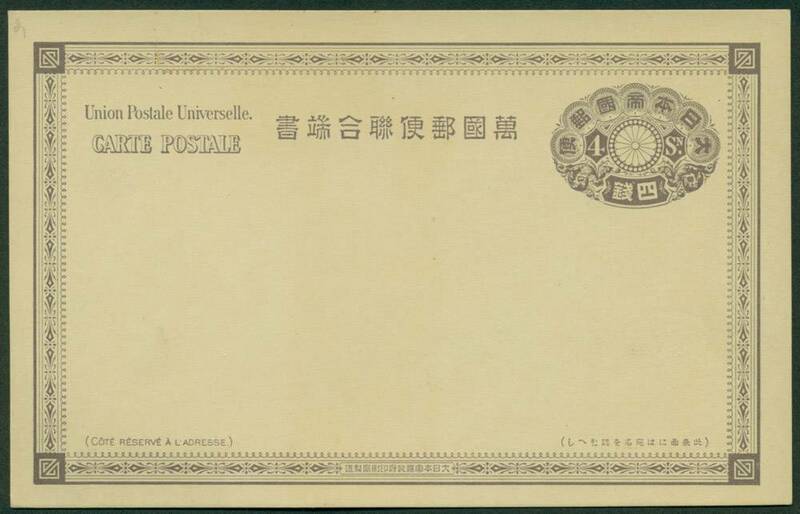 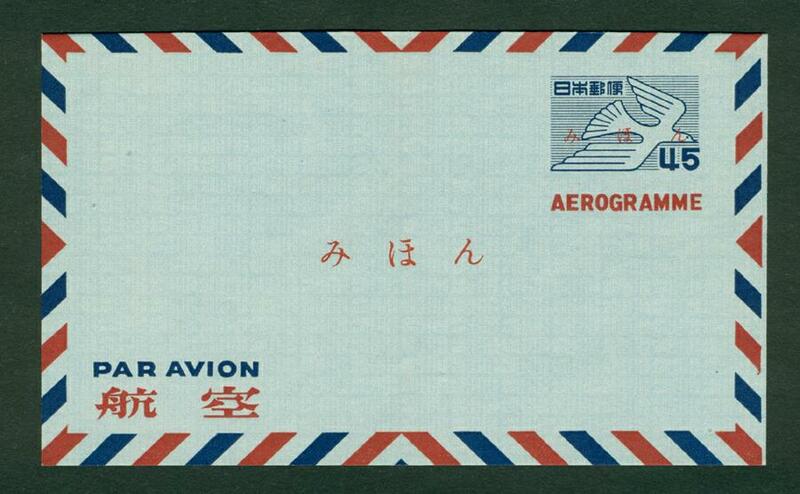 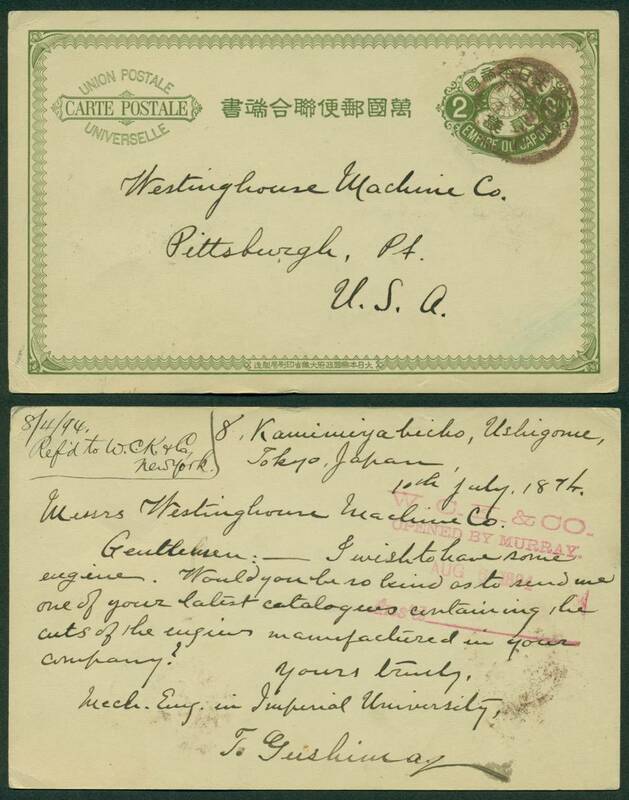 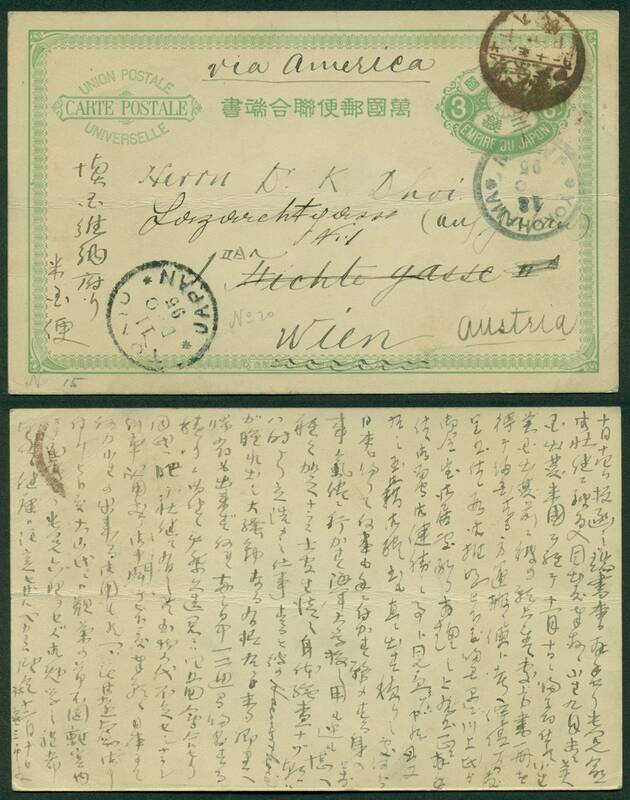 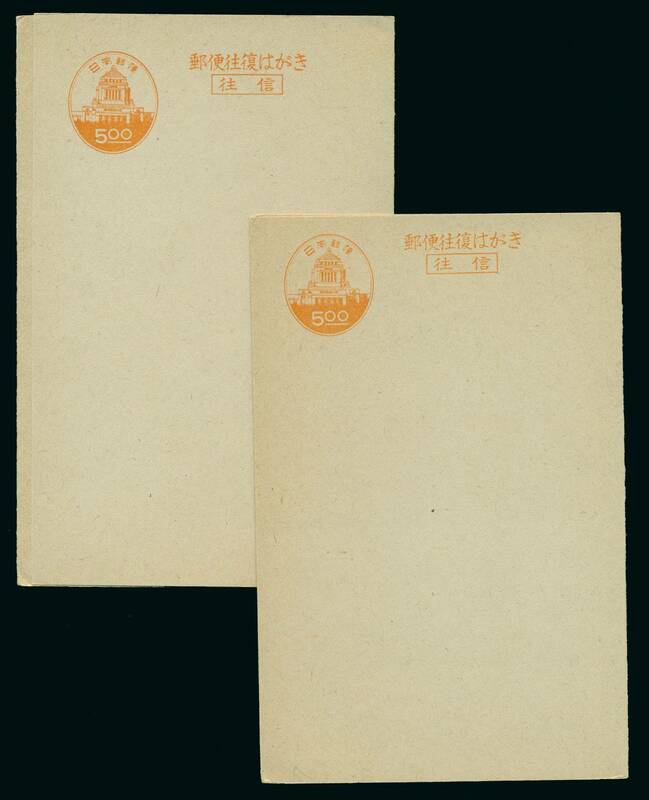 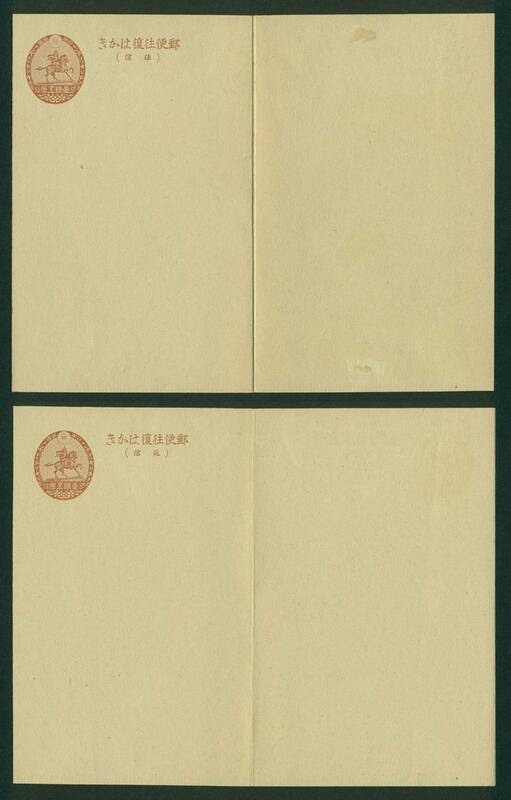 An invaluable philatelic history resource regarding mail out of Japan from 1859-1879. 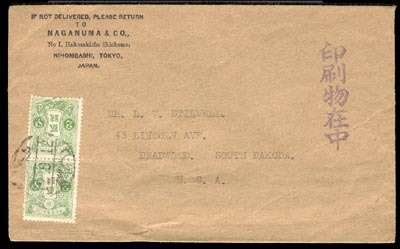 The majority of mail processed through the American mail system established in Japan only bears cancels indicating month and day - no year. 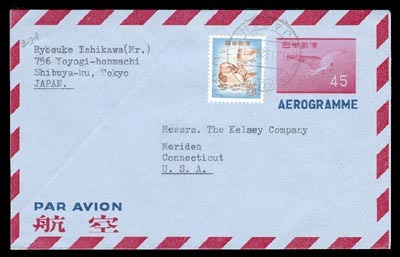 This monograph compiles the various Pacific crossings from Japan to the US during this 20 year period. 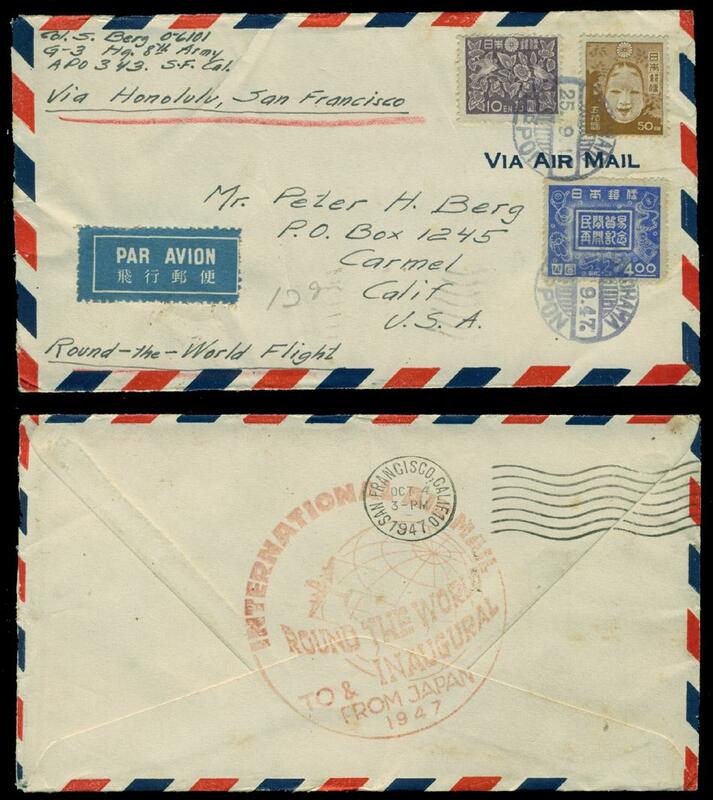 Ship names, ports of departure, dates of departure and date of arrival in San Francisco are provided. 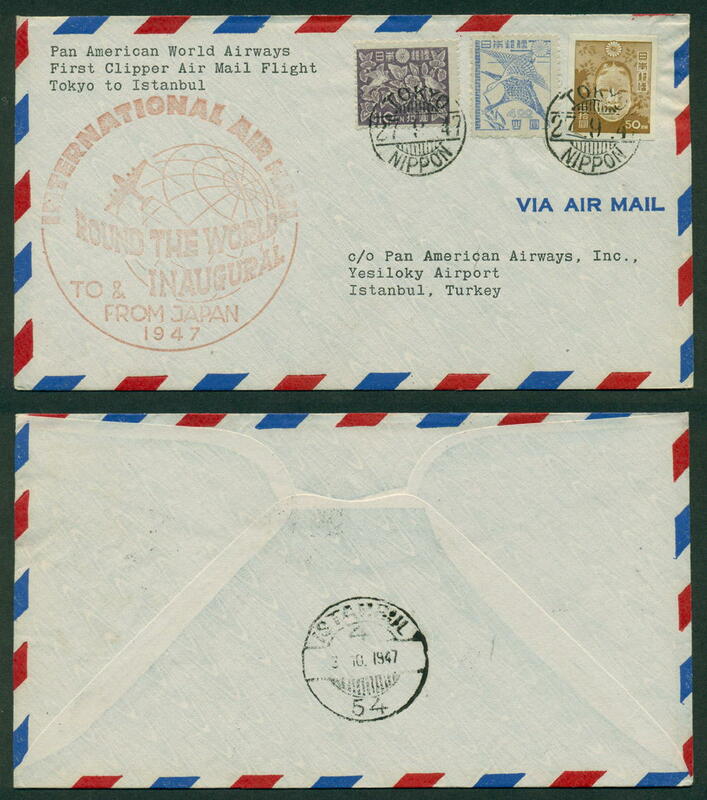 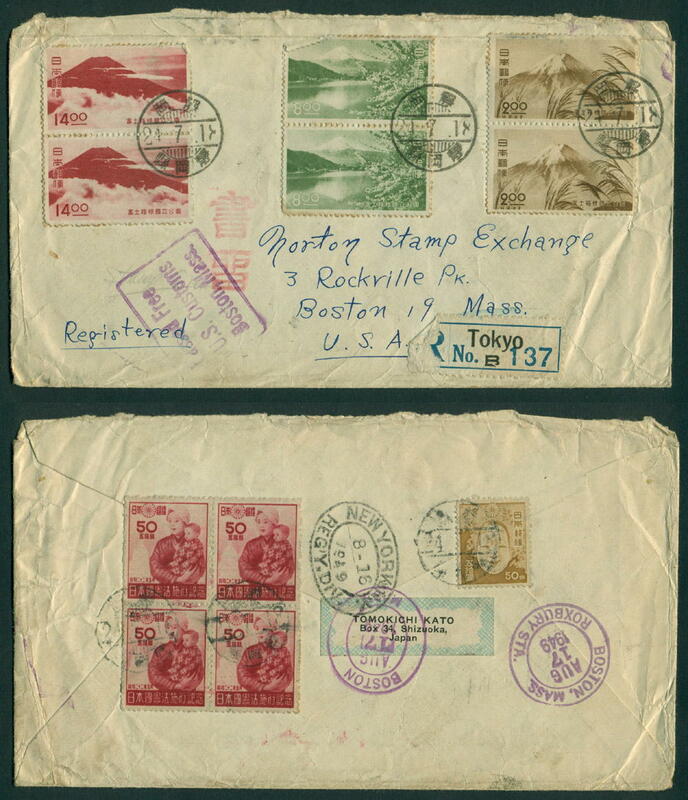 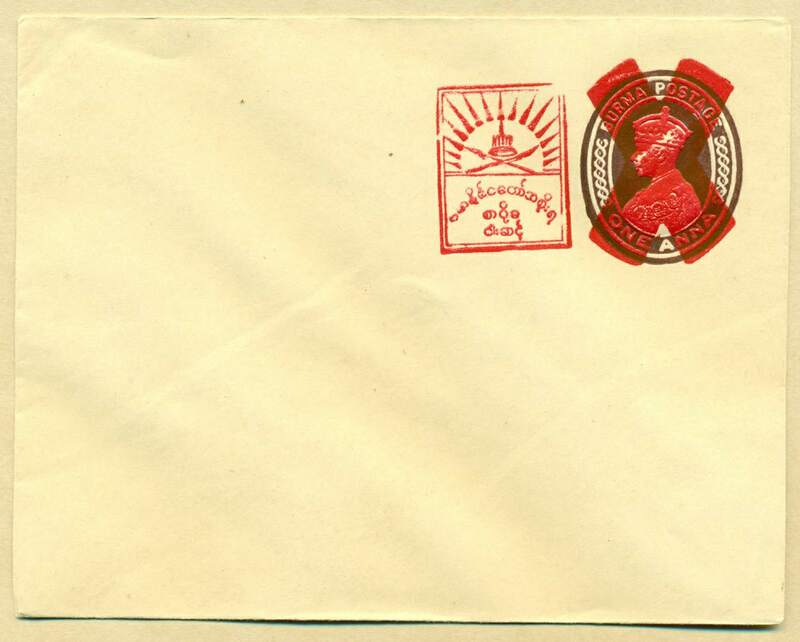 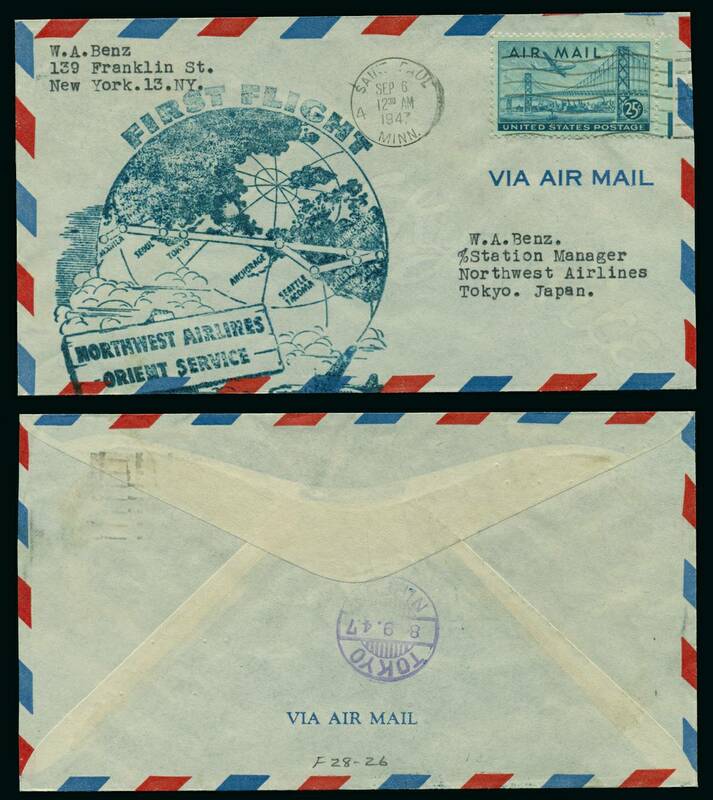 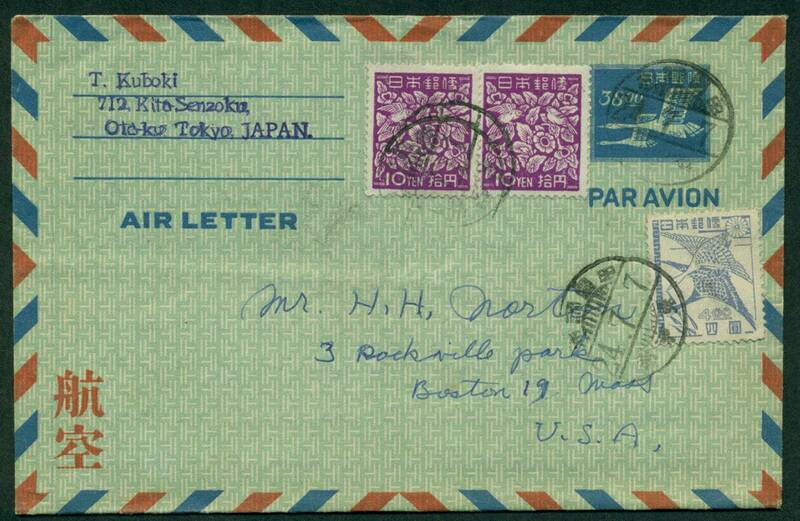 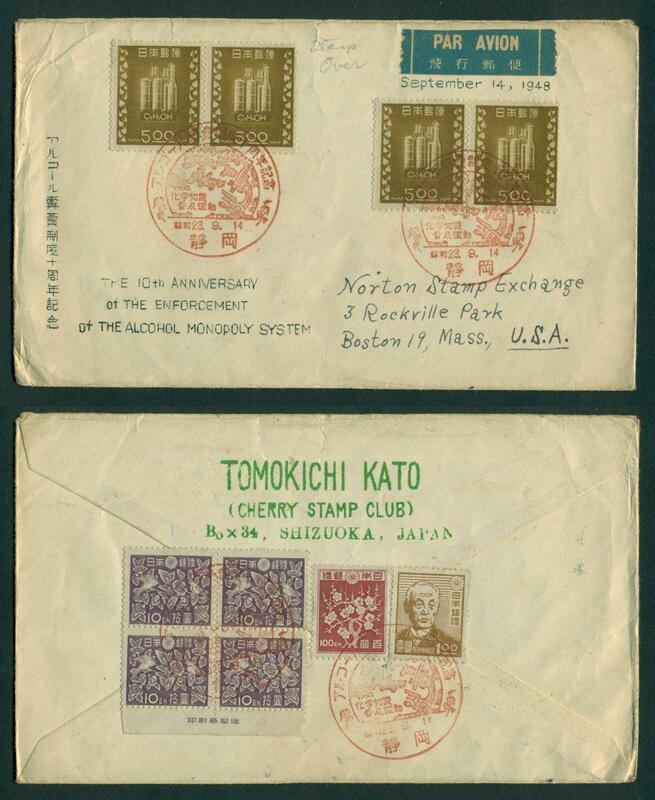 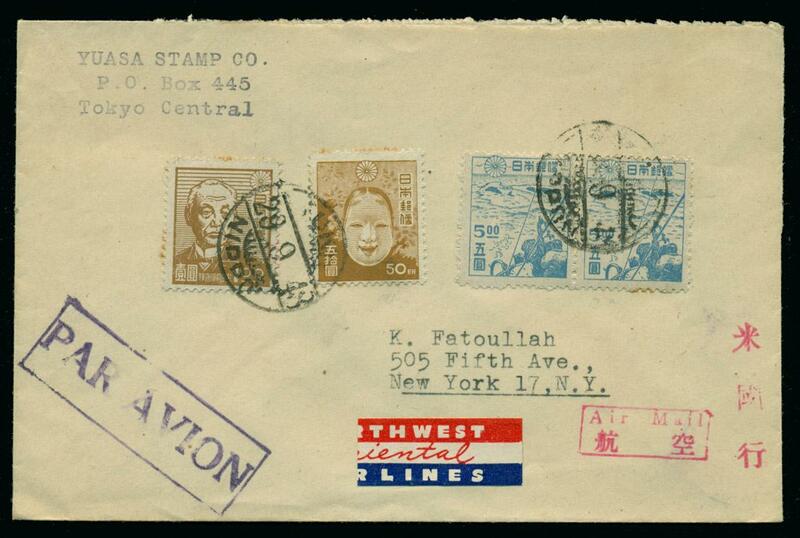 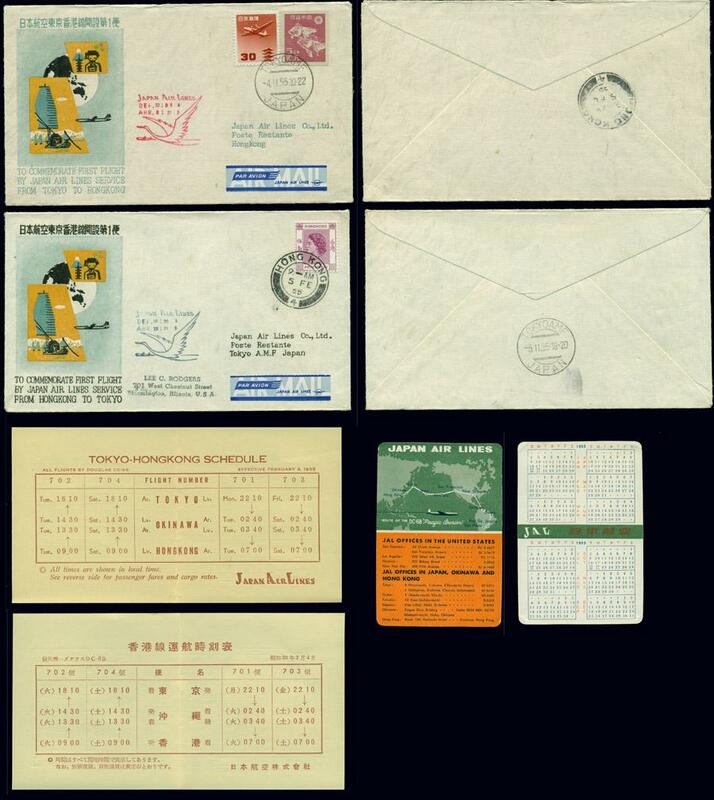 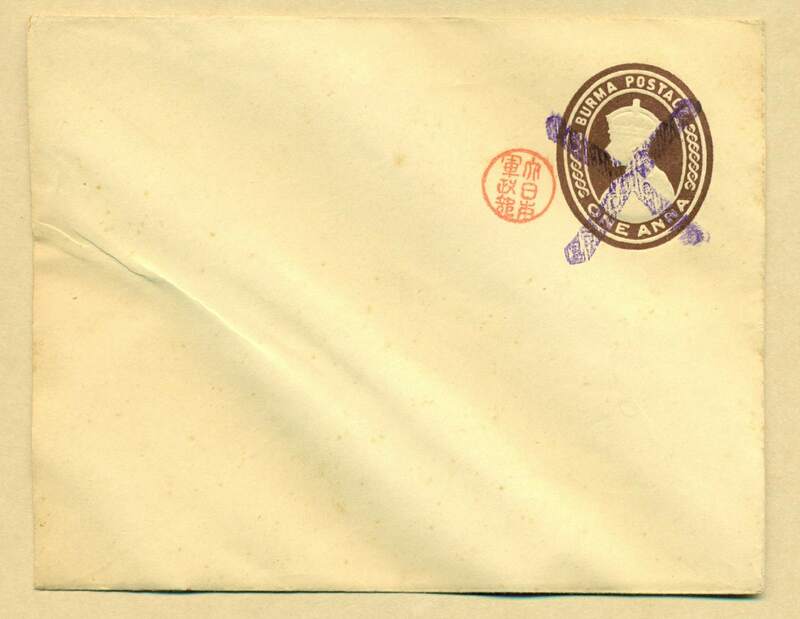 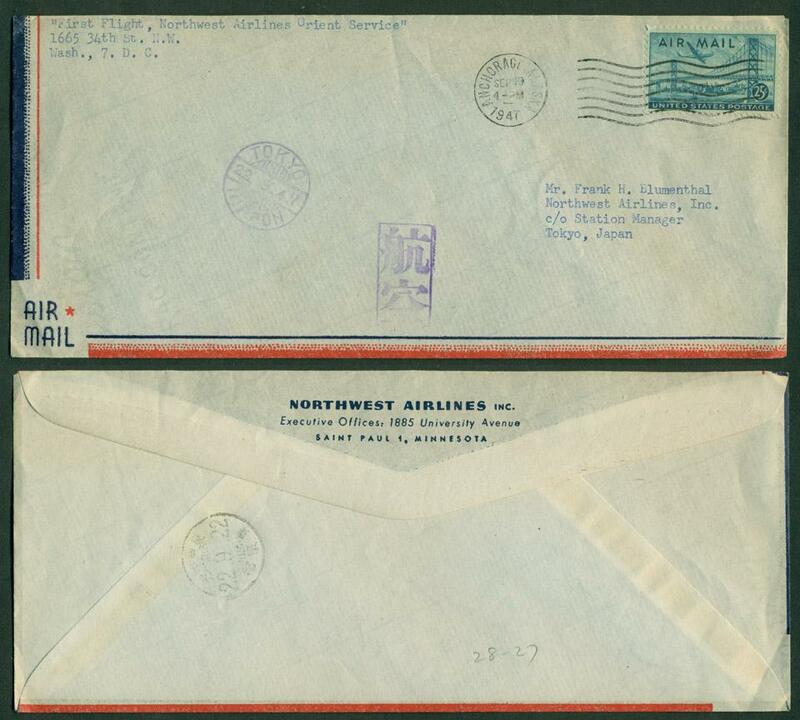 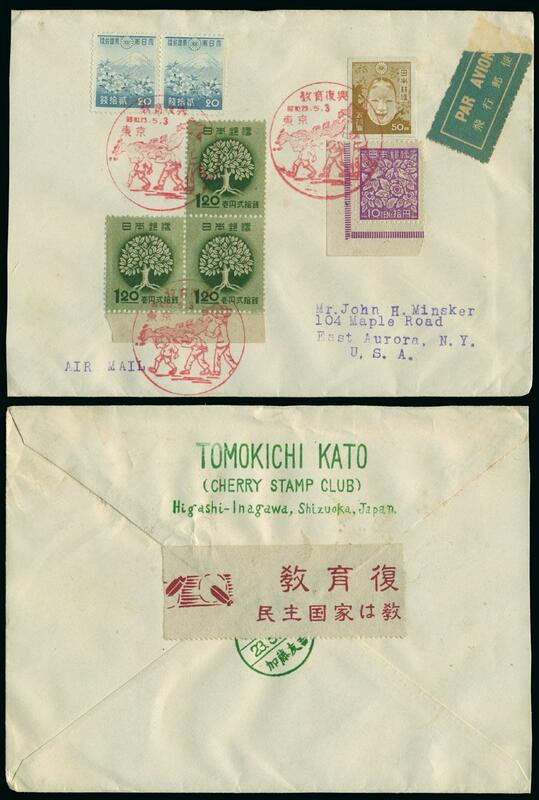 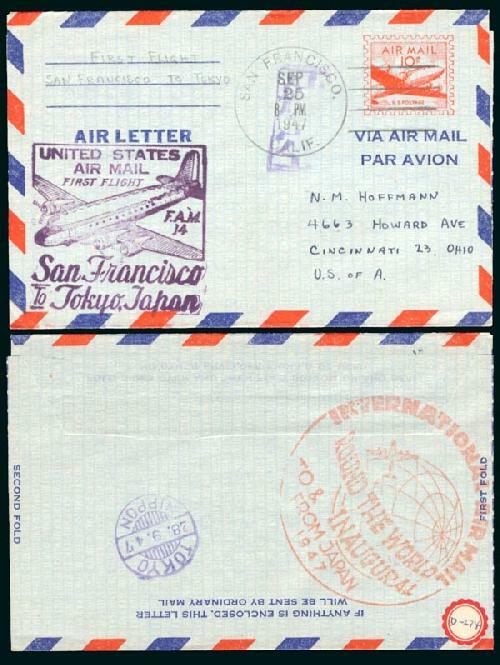 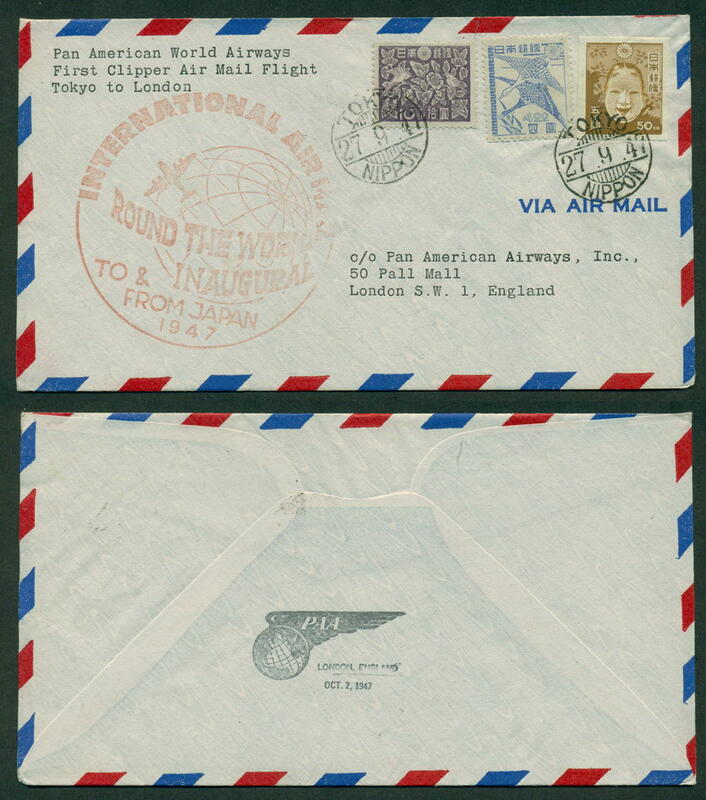 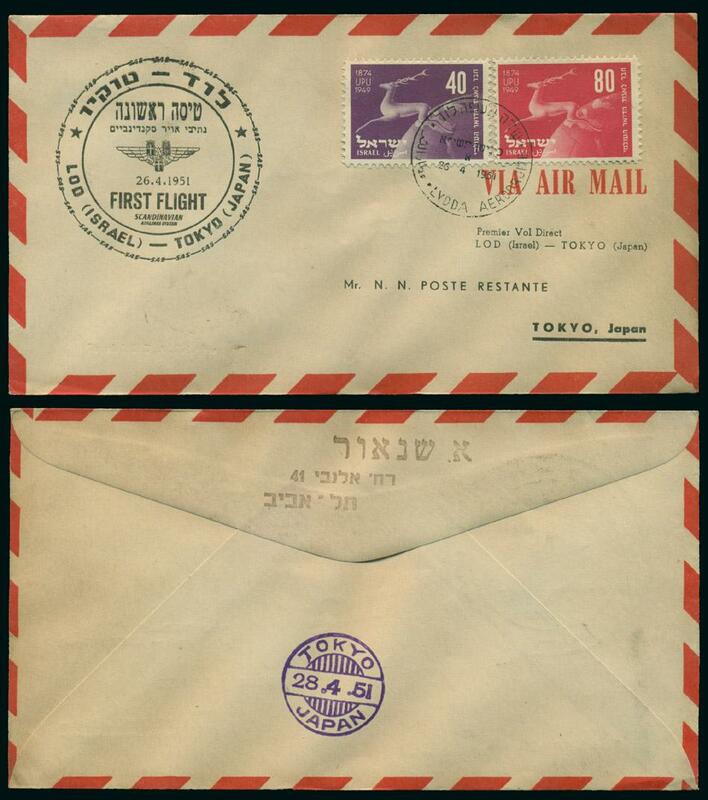 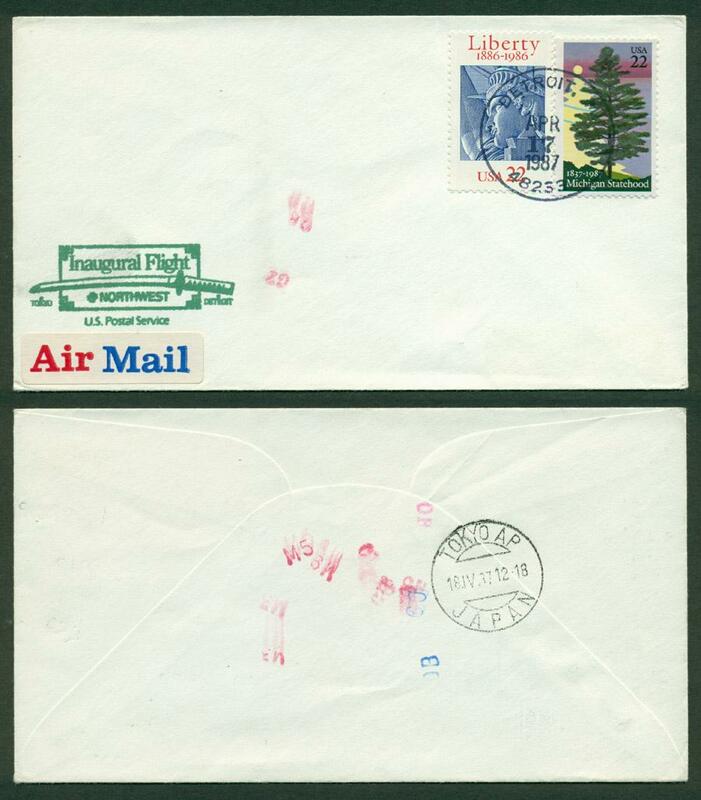 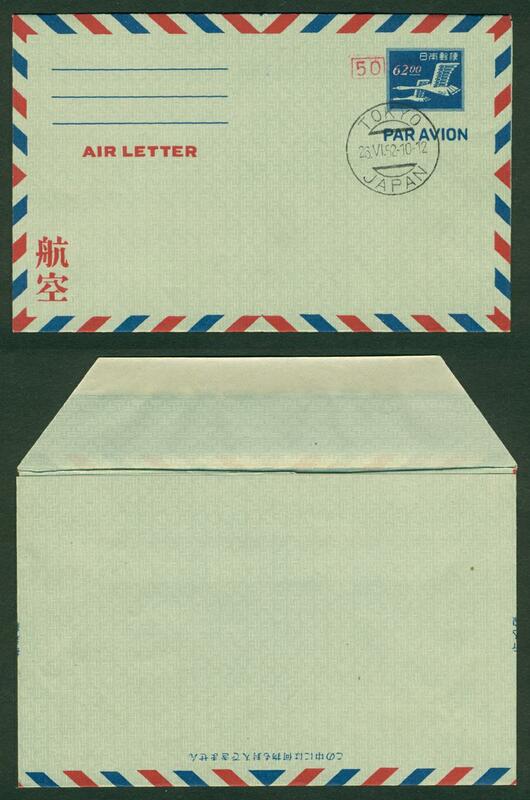 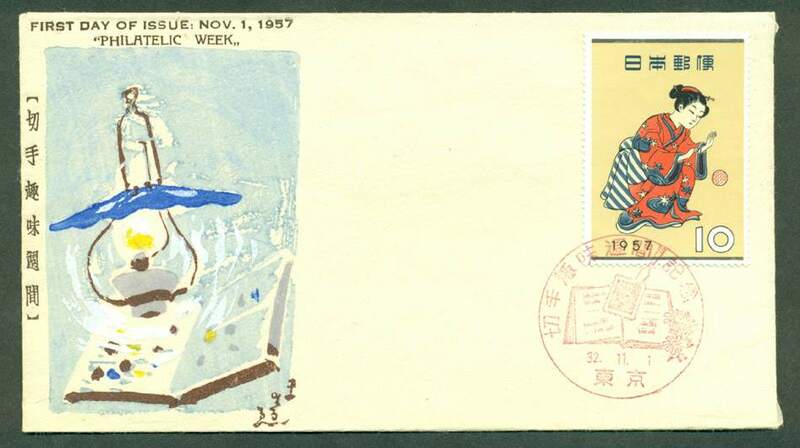 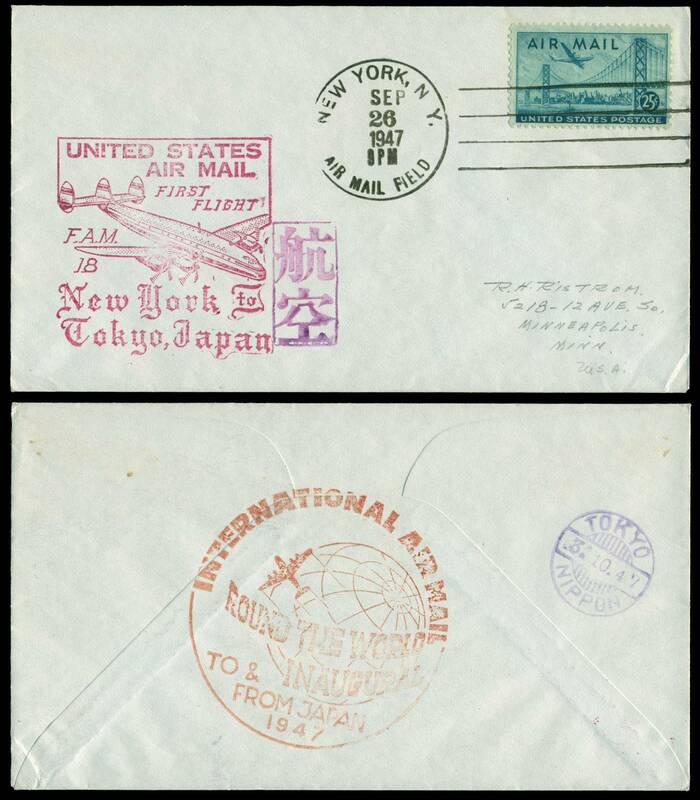 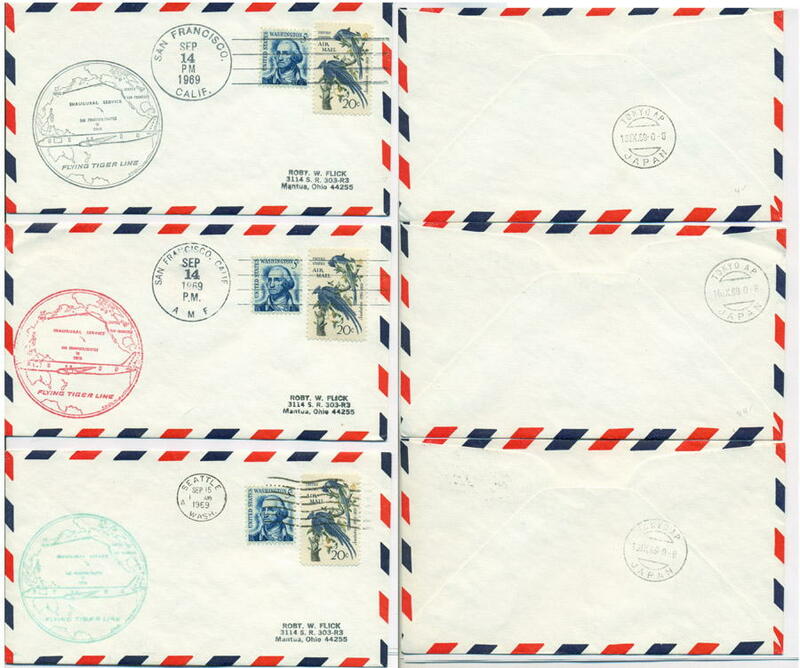 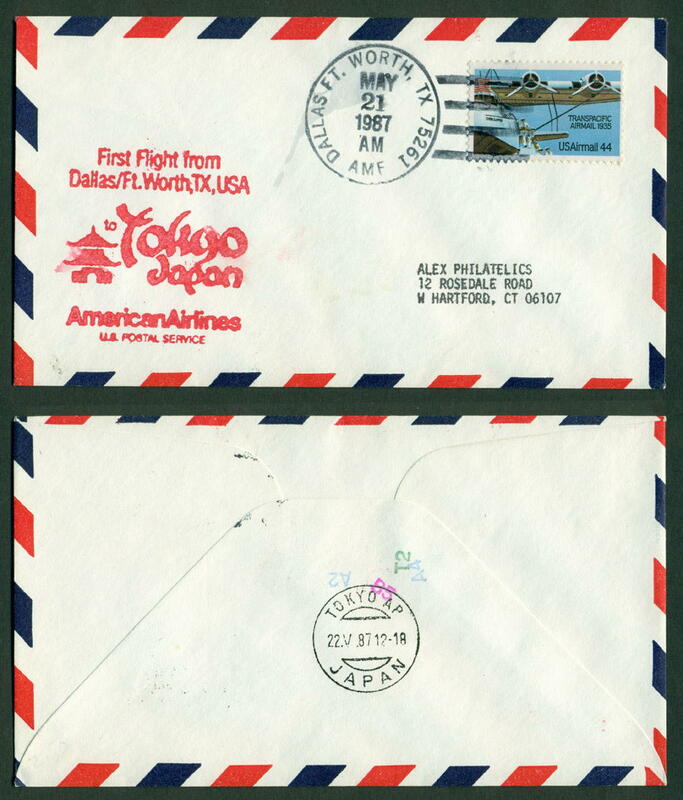 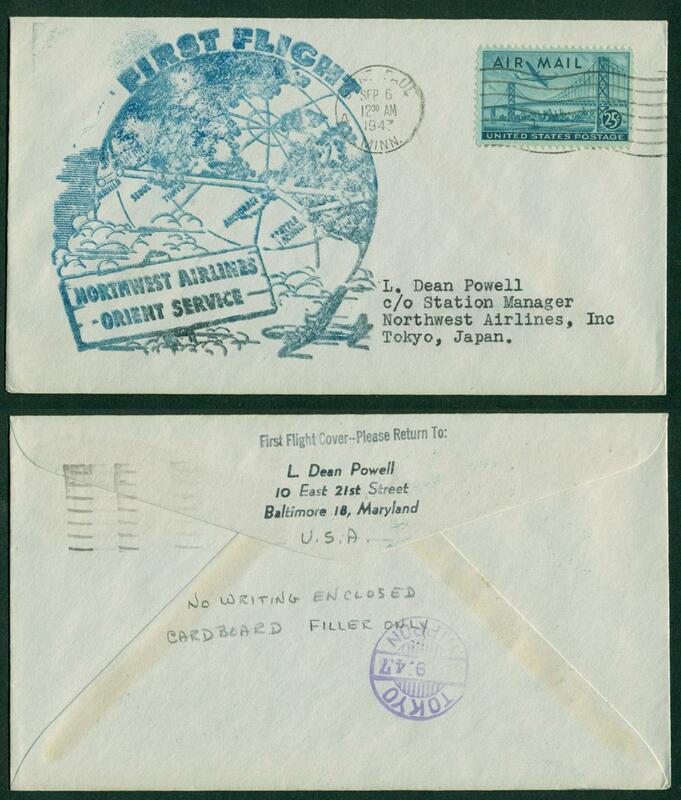 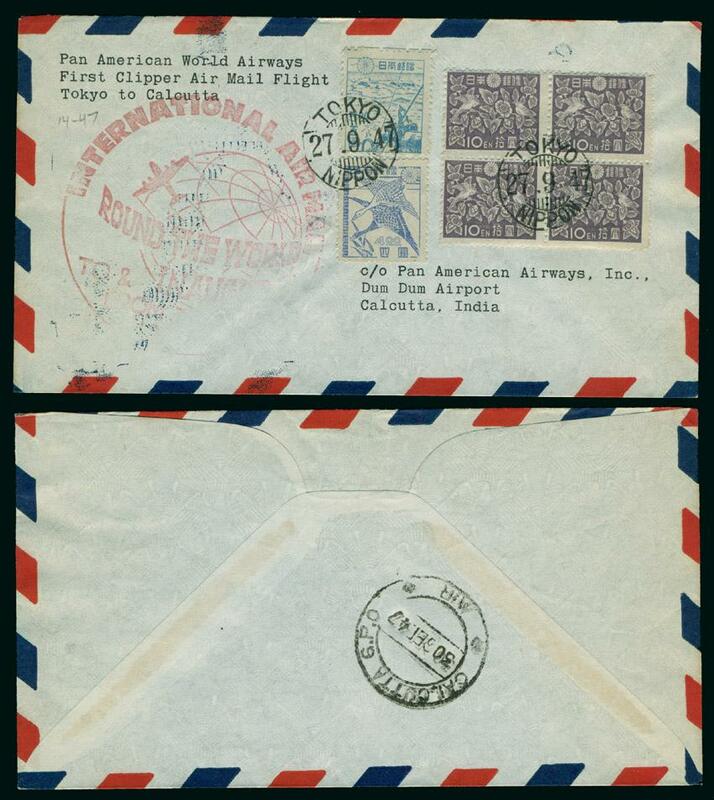 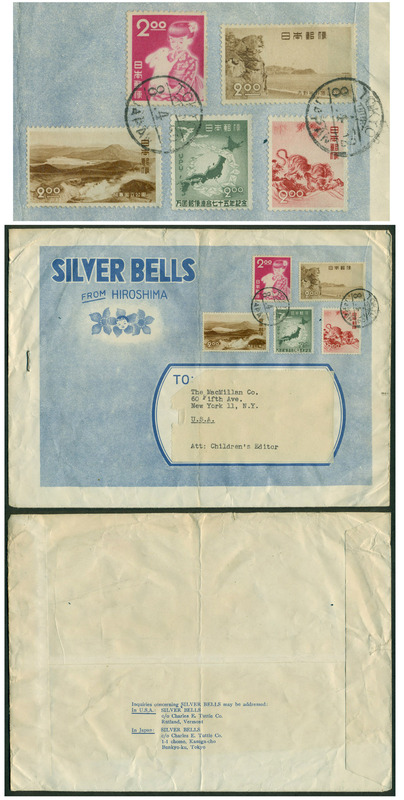 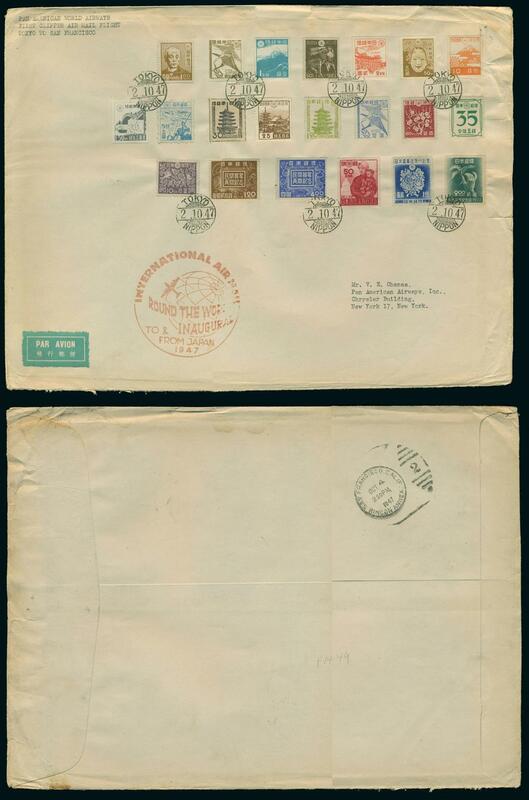 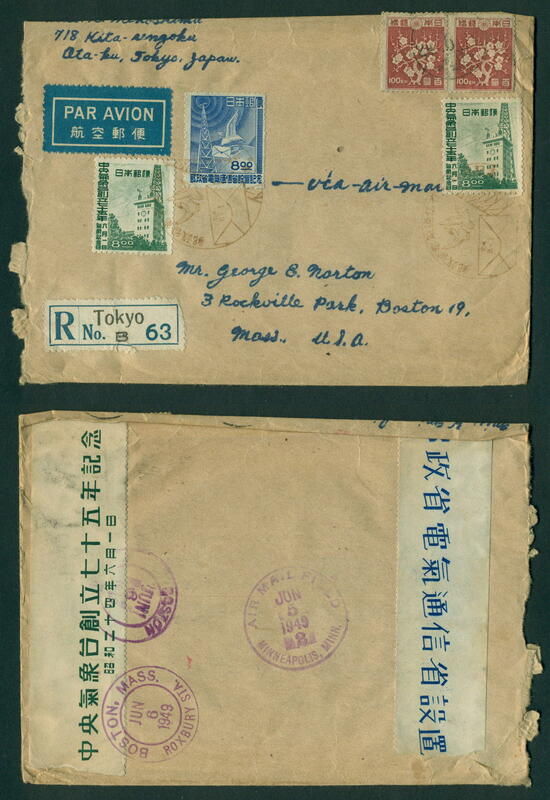 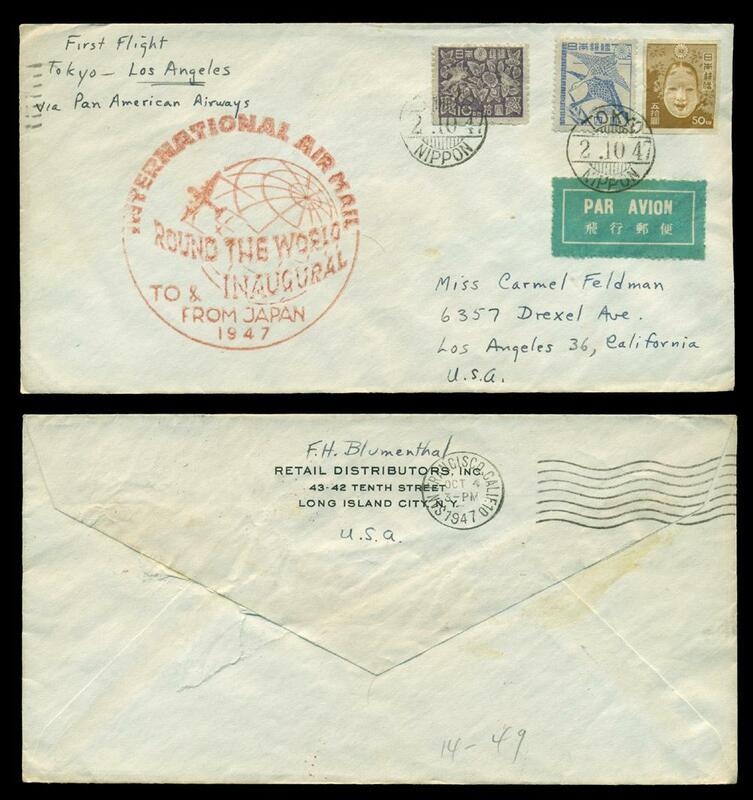 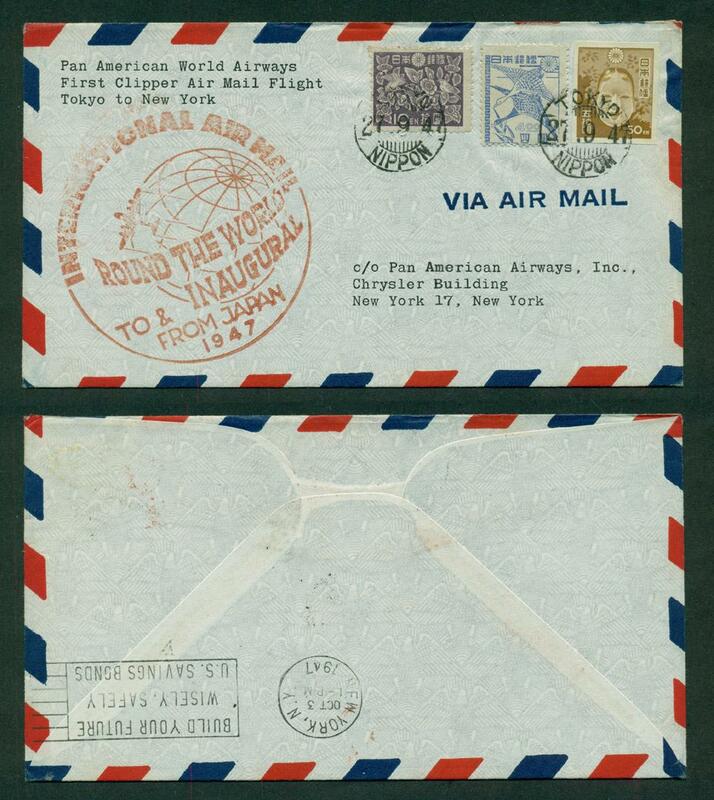 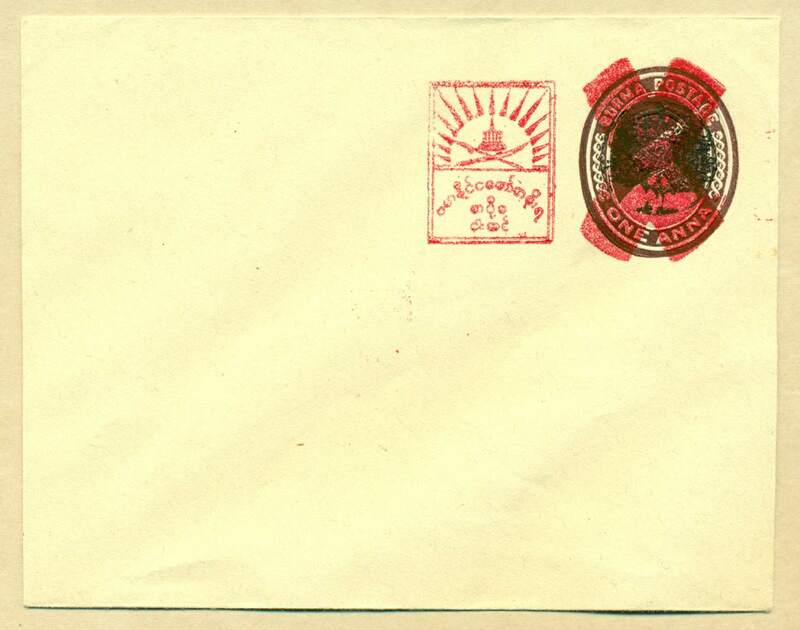 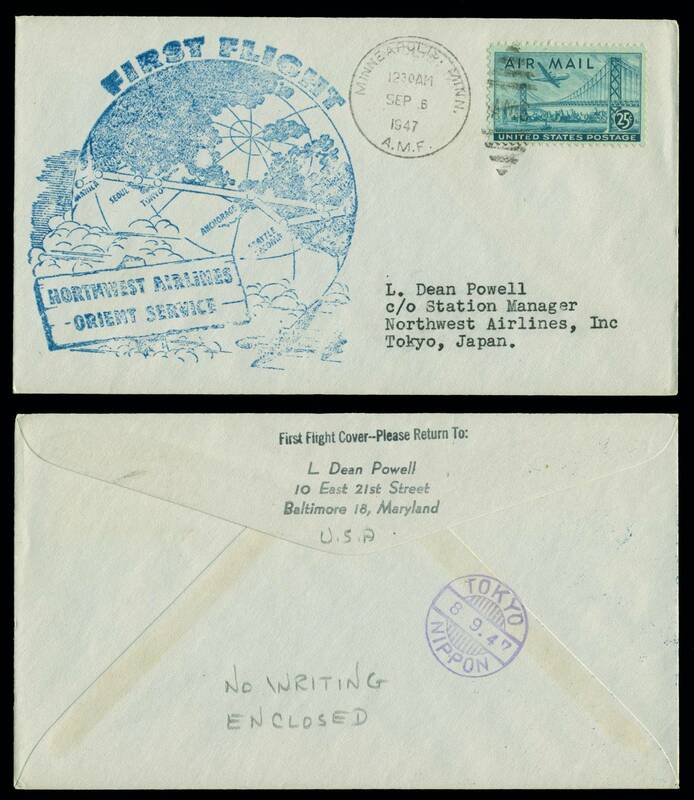 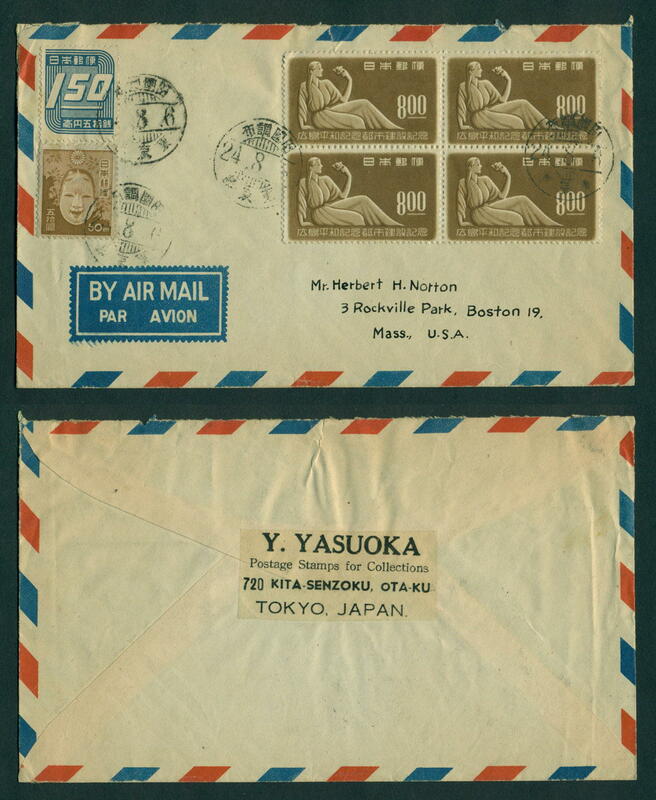 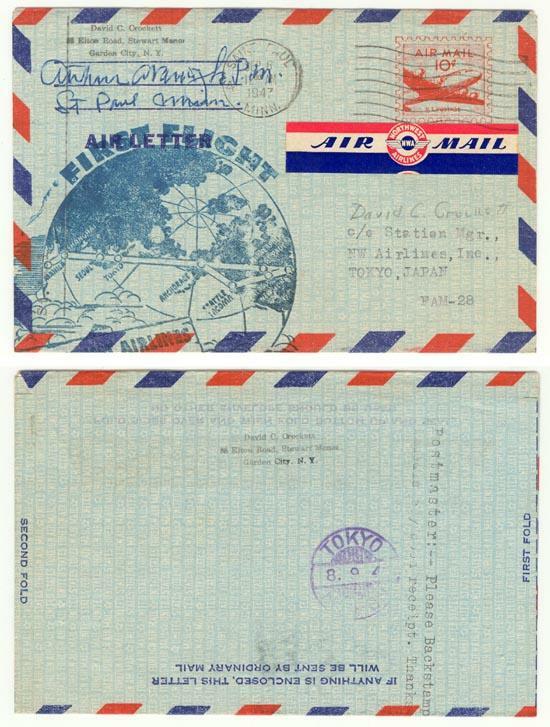 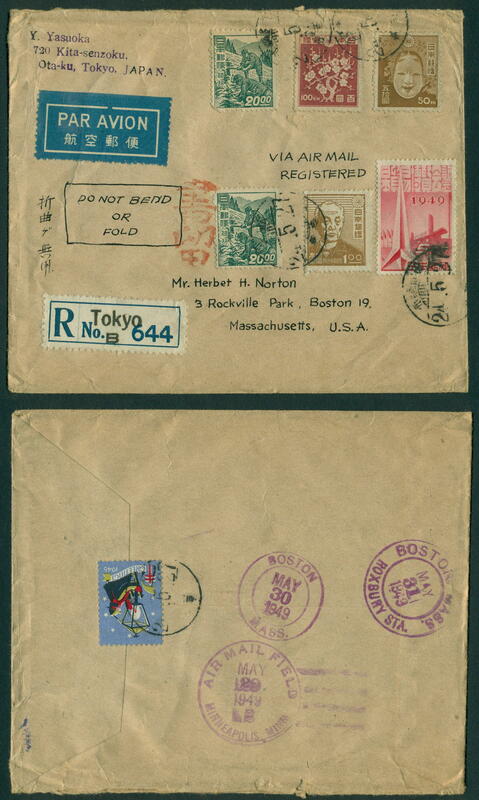 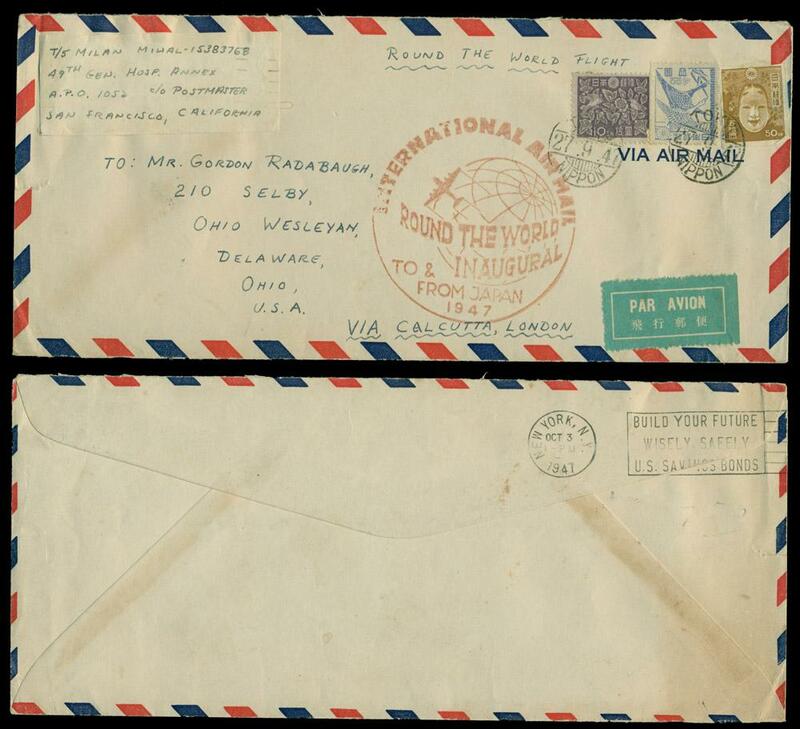 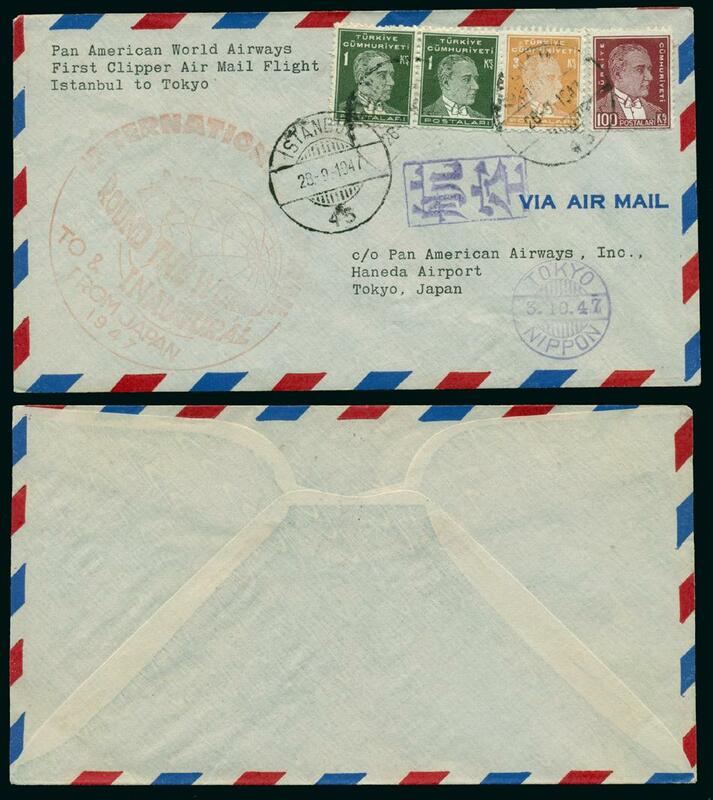 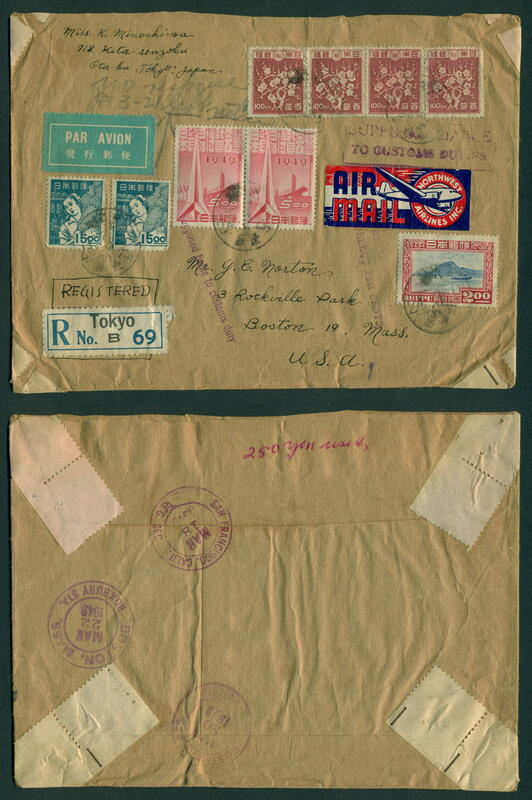 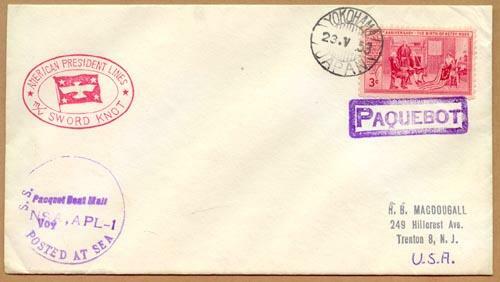 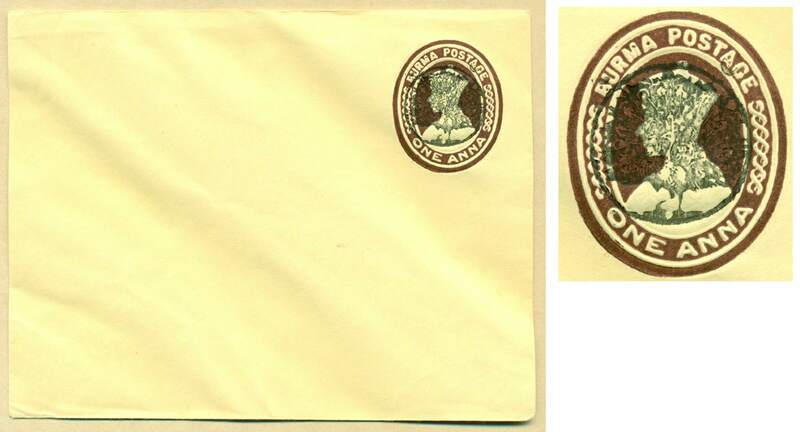 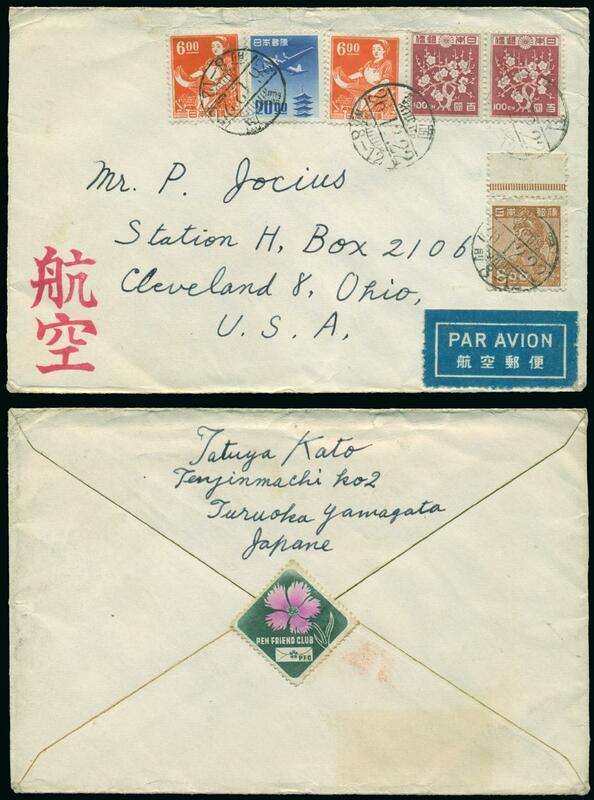 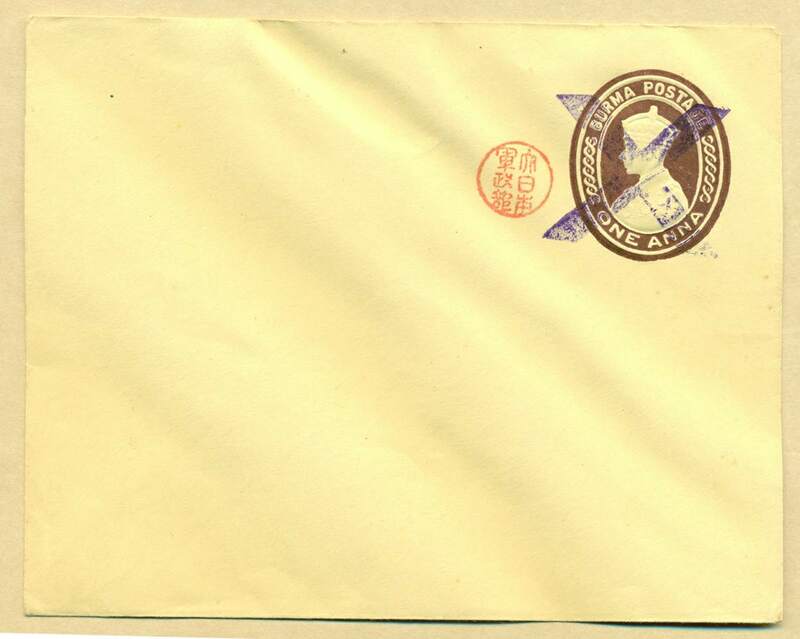 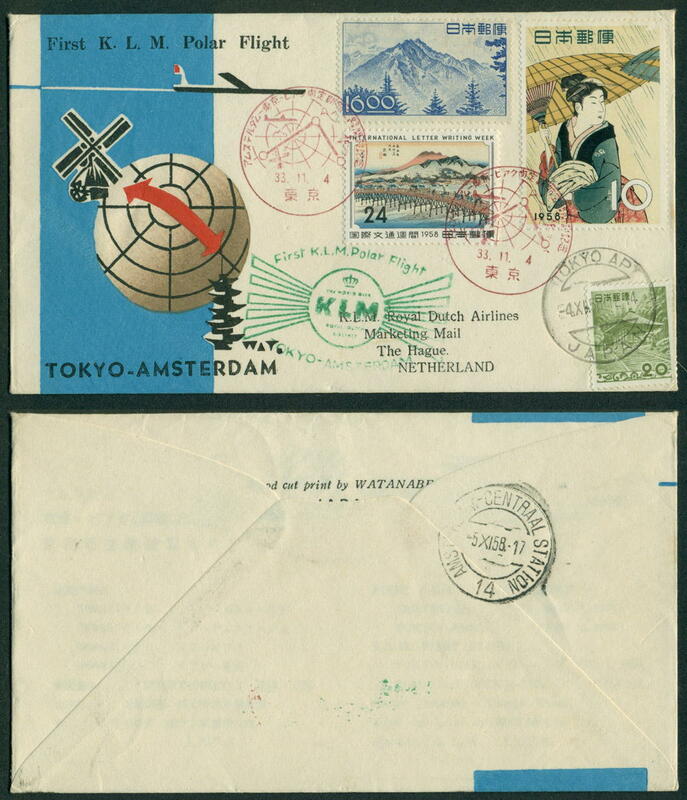 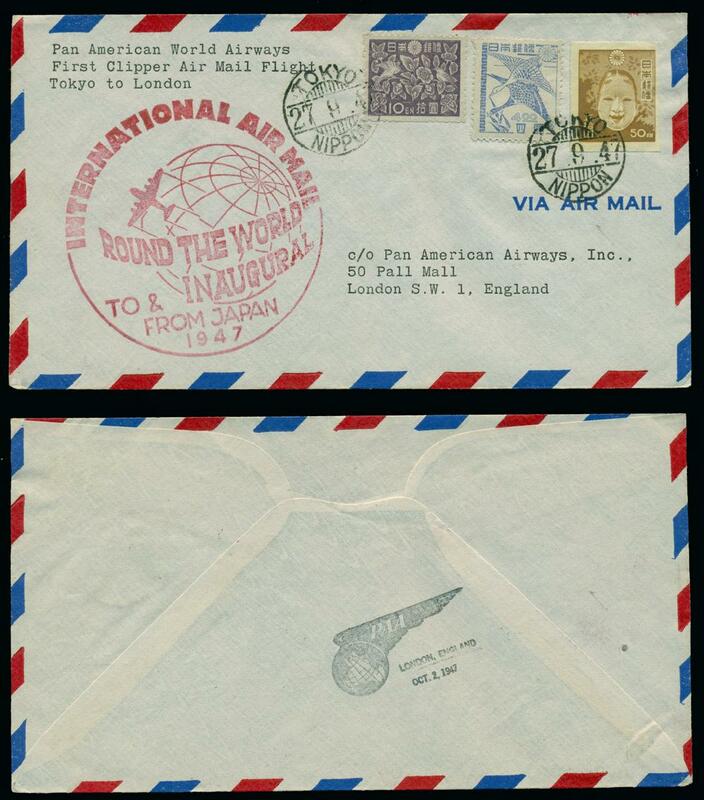 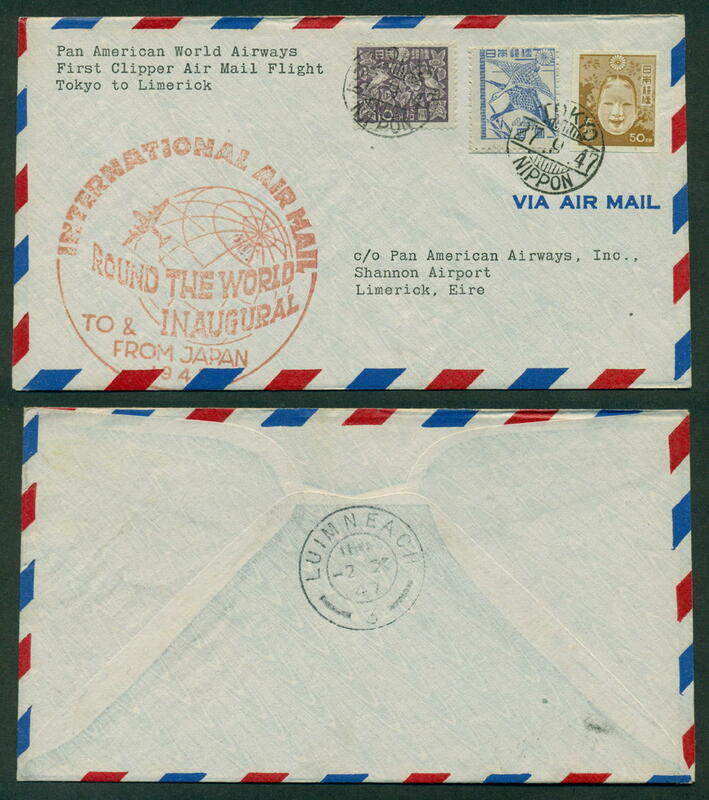 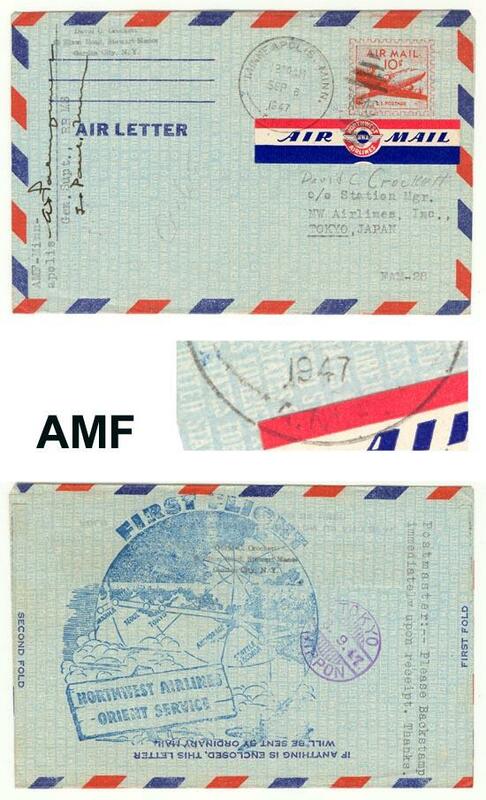 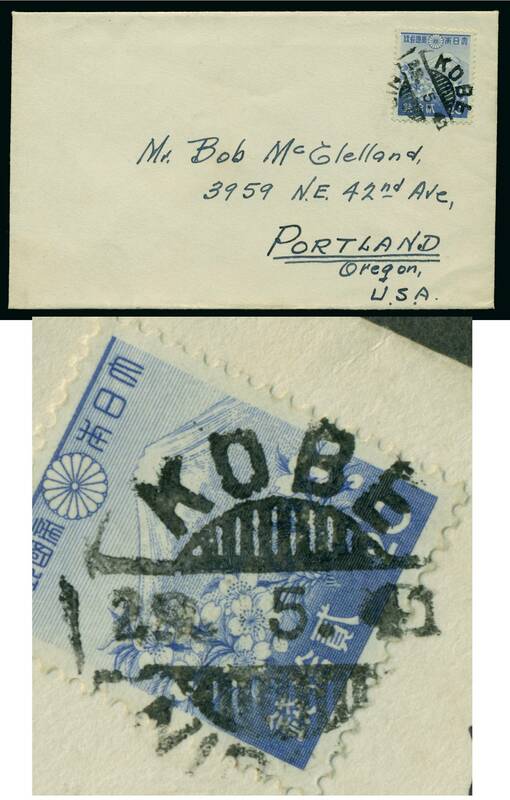 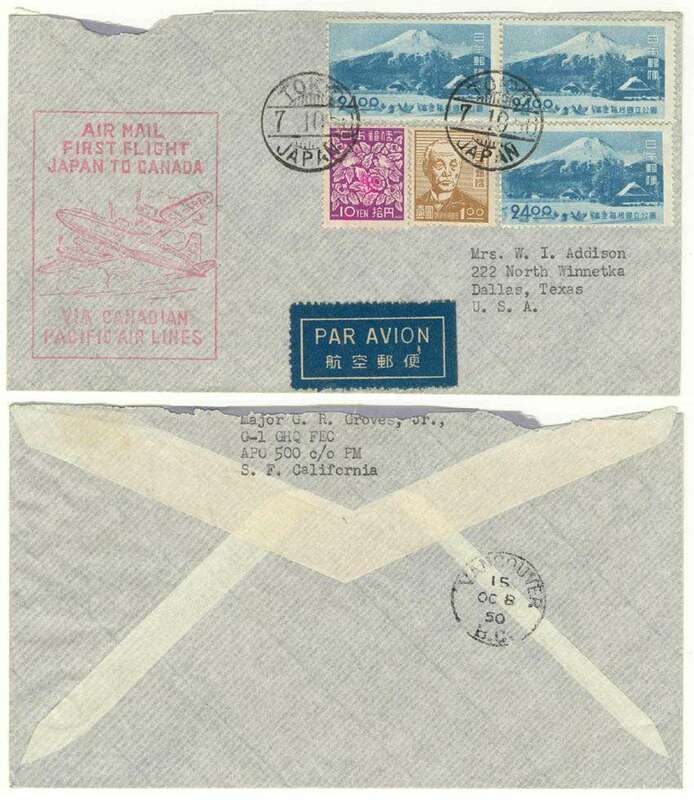 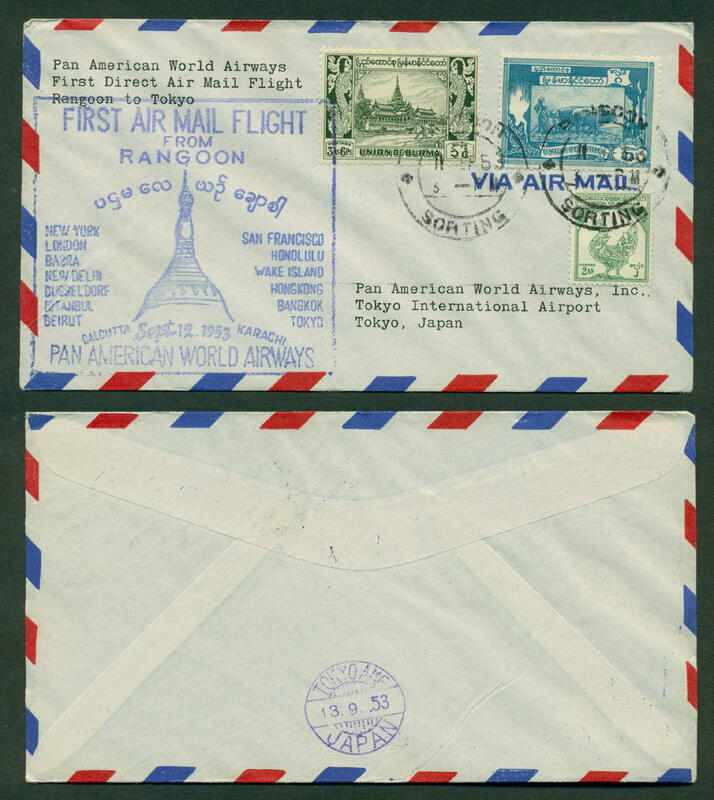 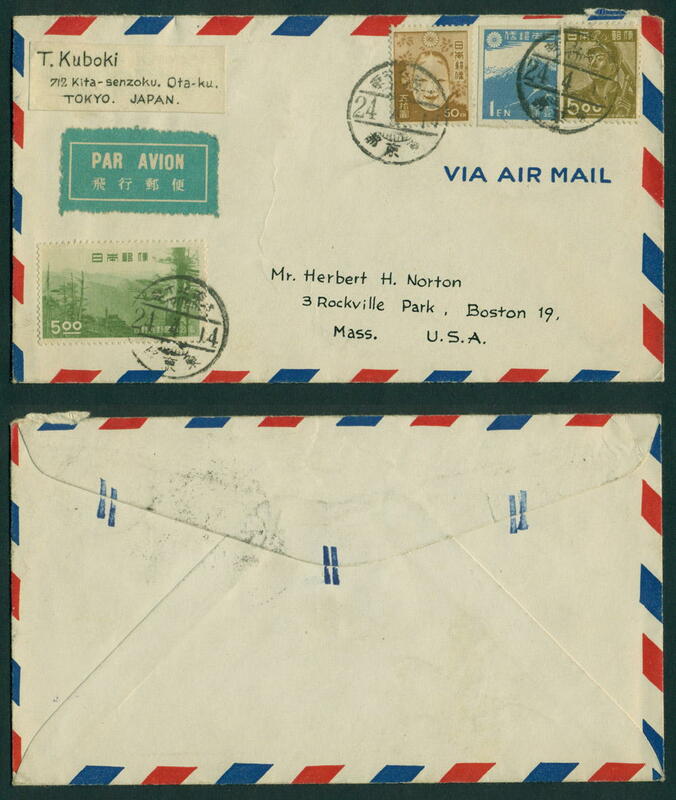 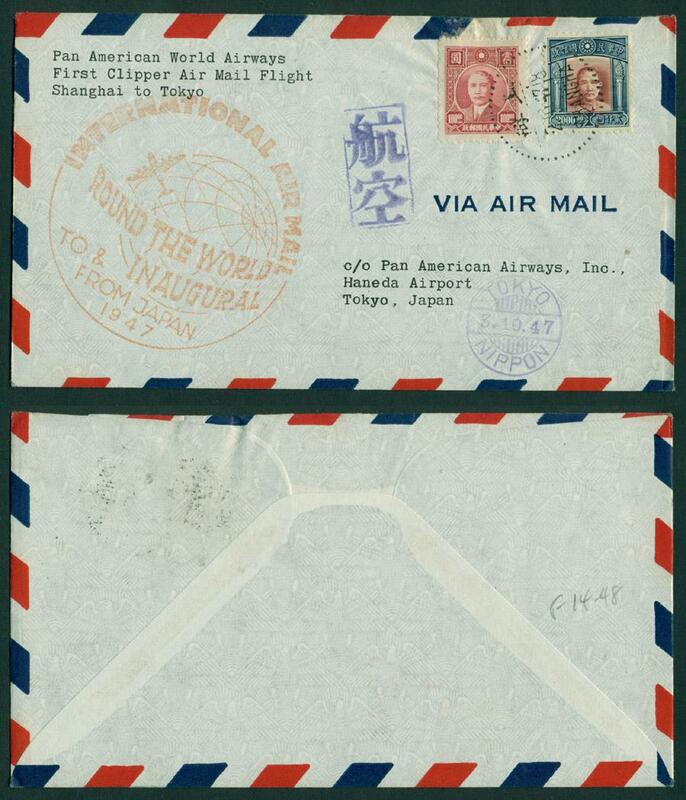 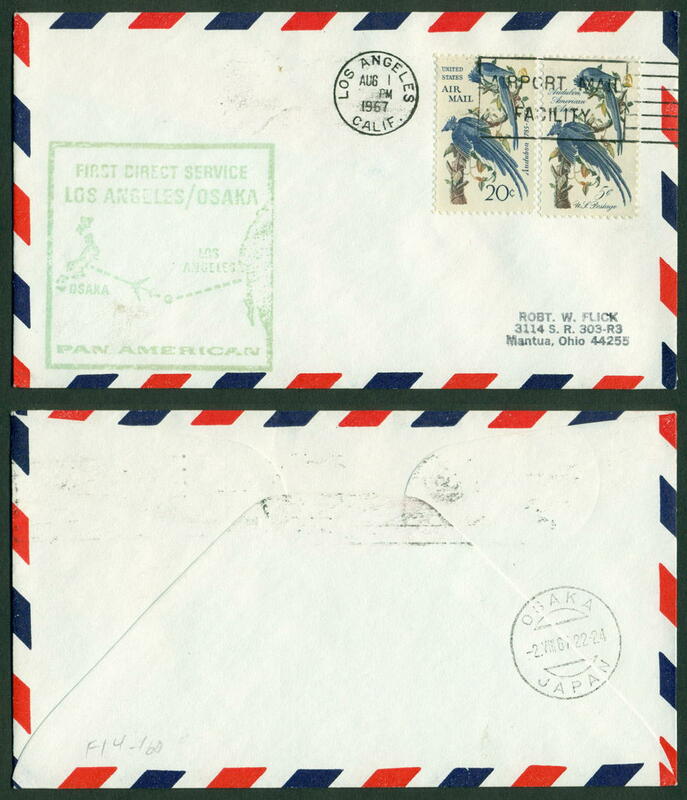 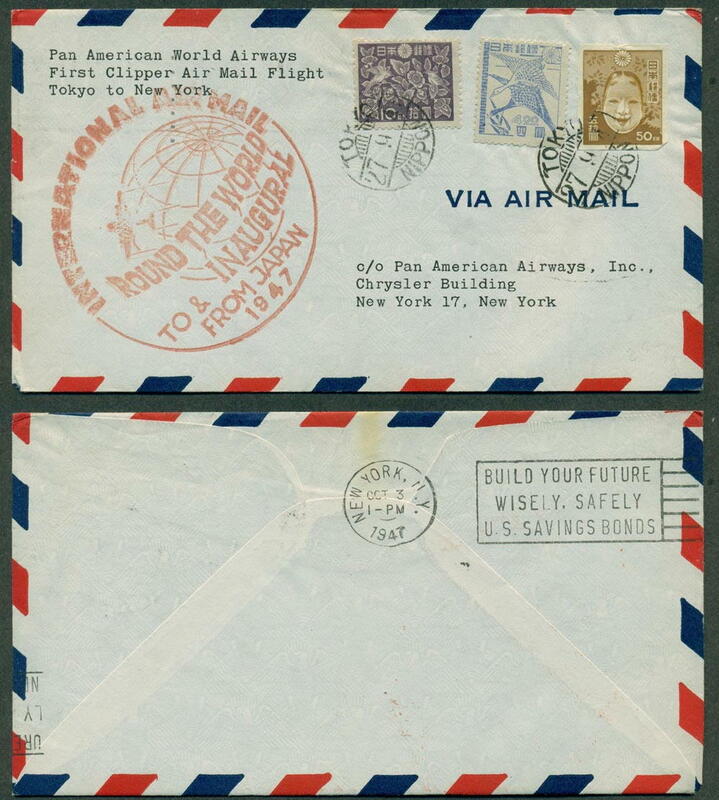 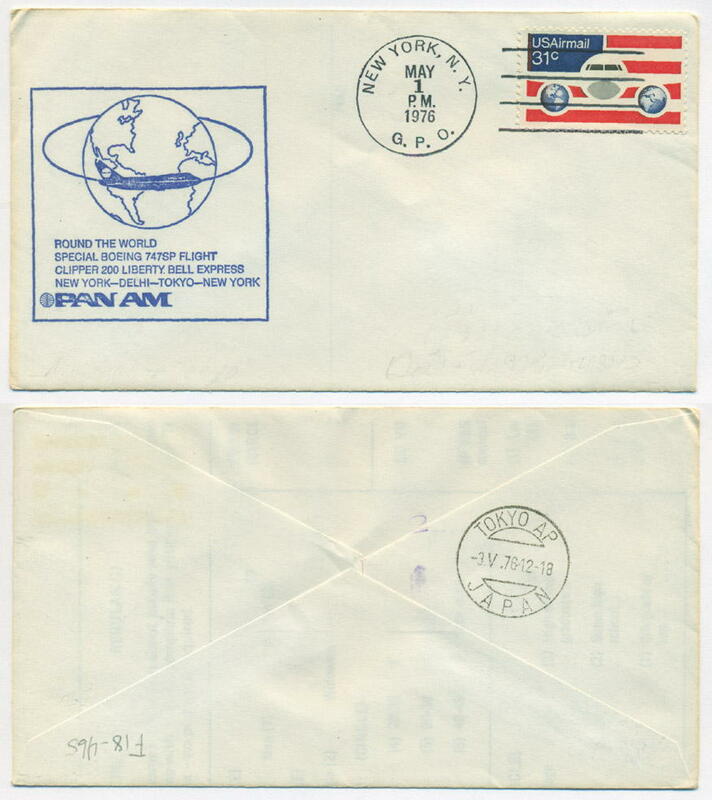 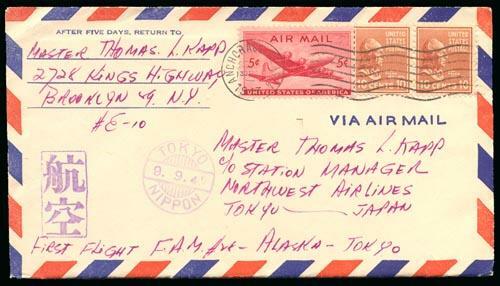 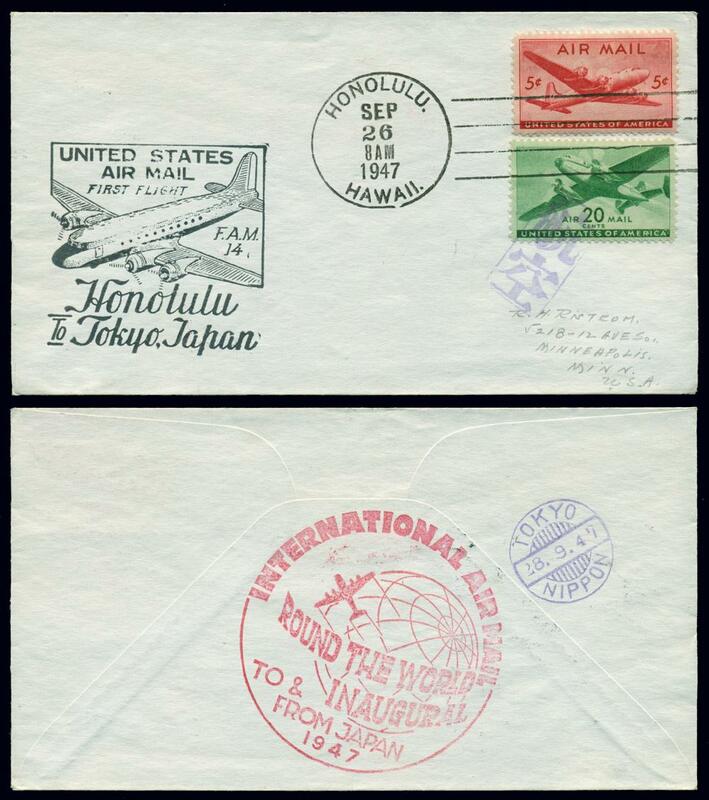 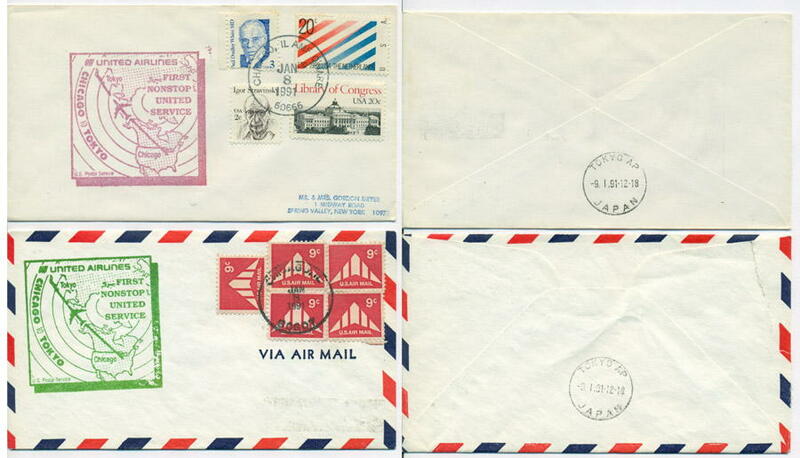 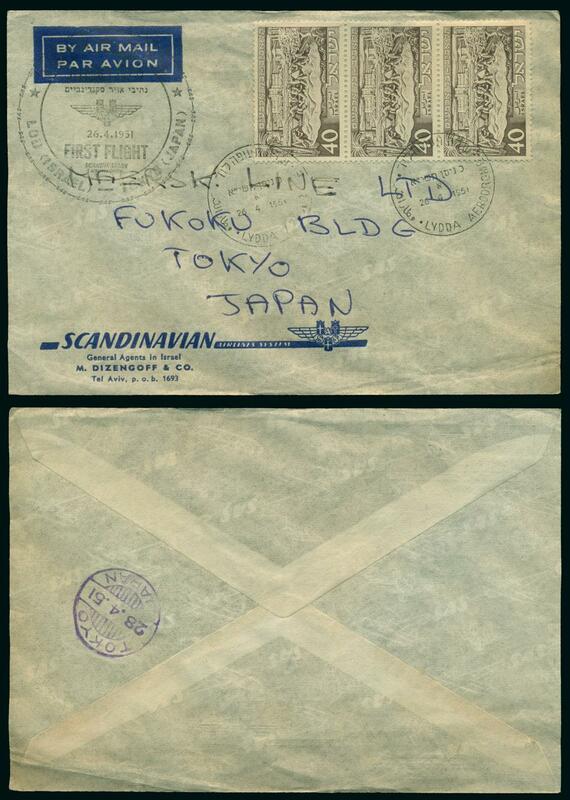 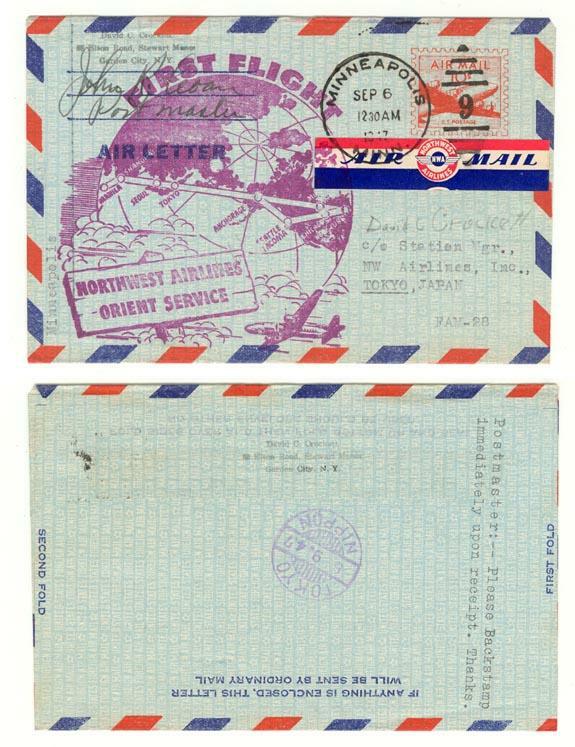 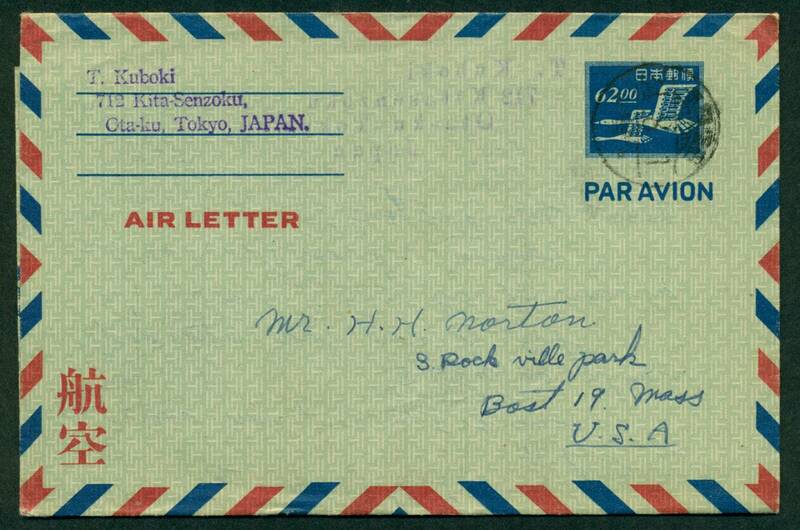 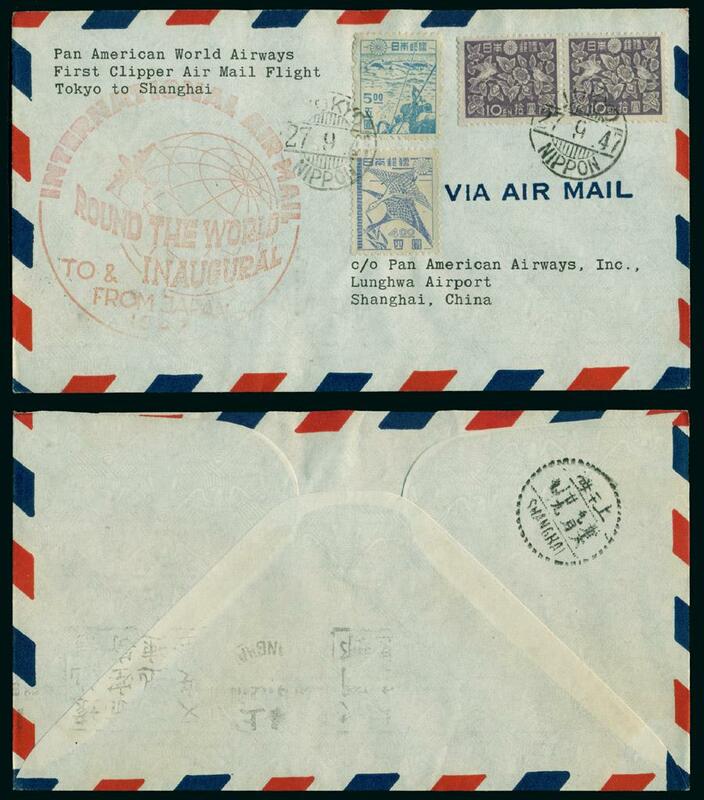 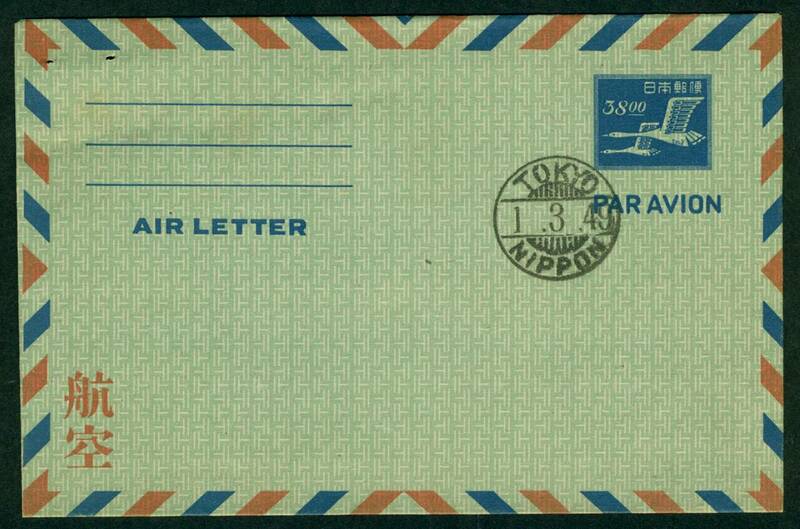 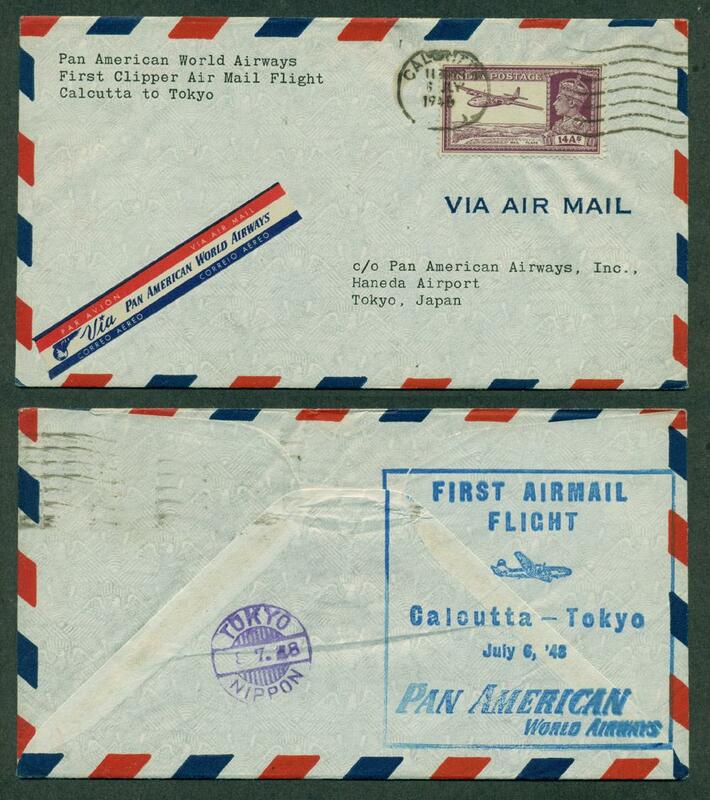 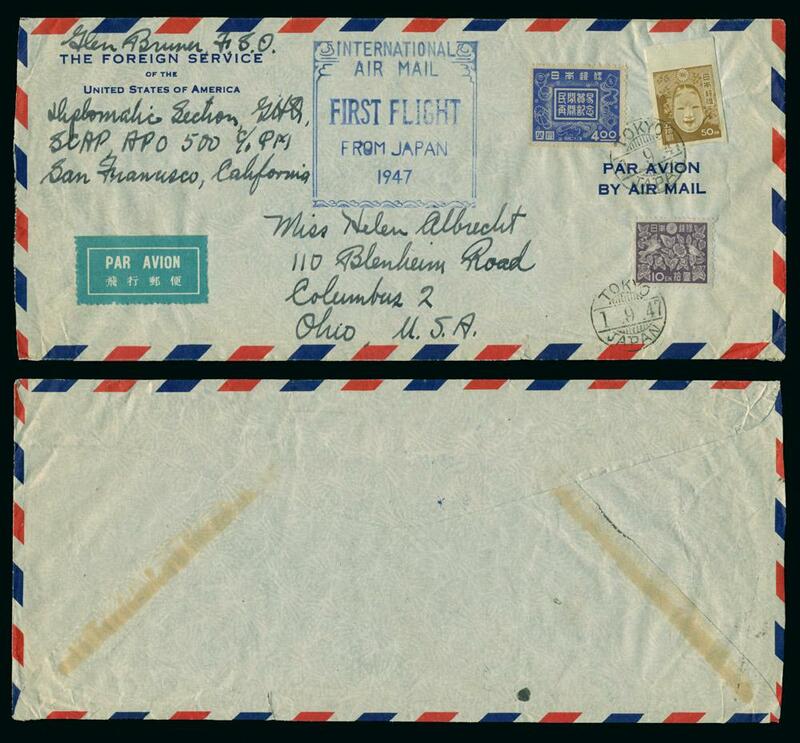 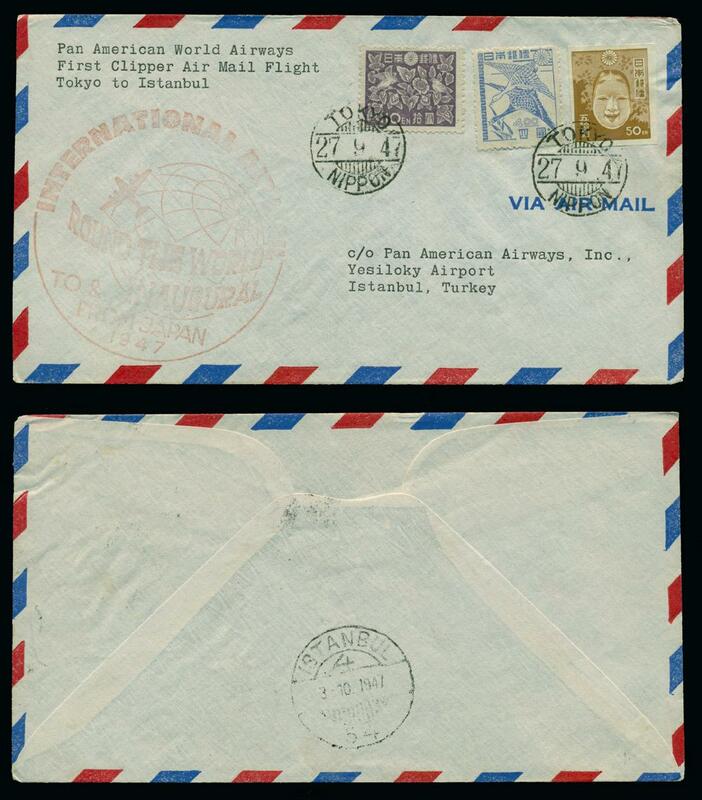 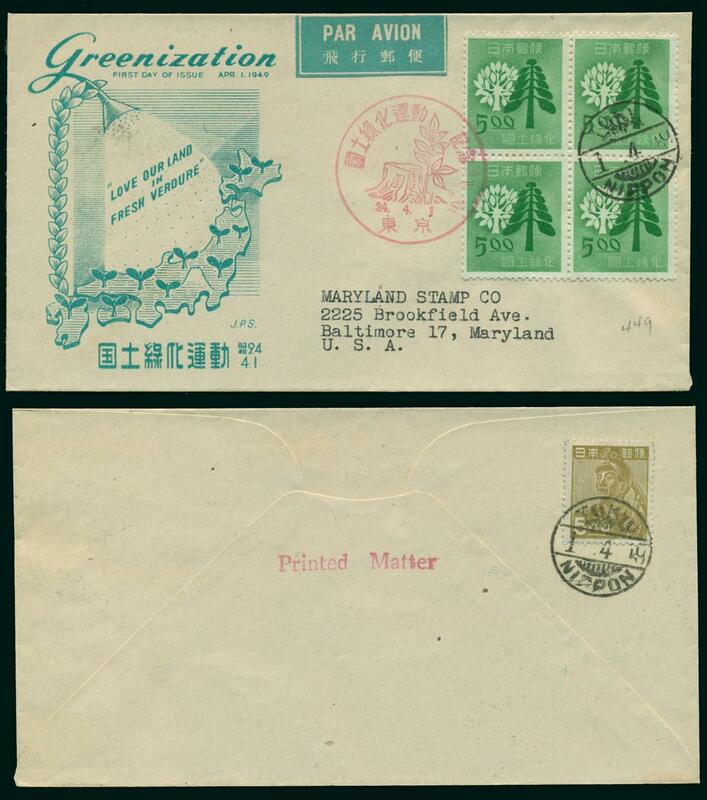 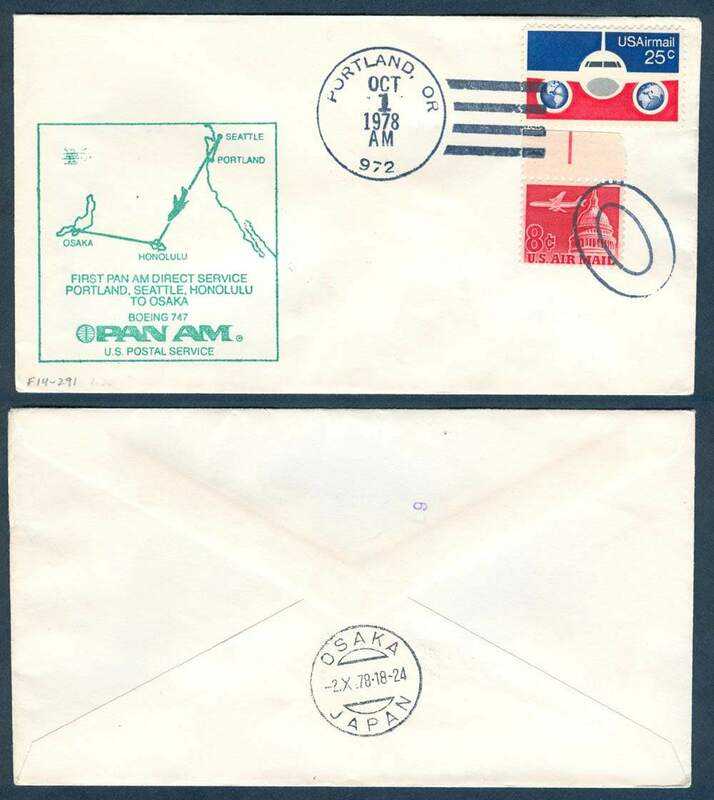 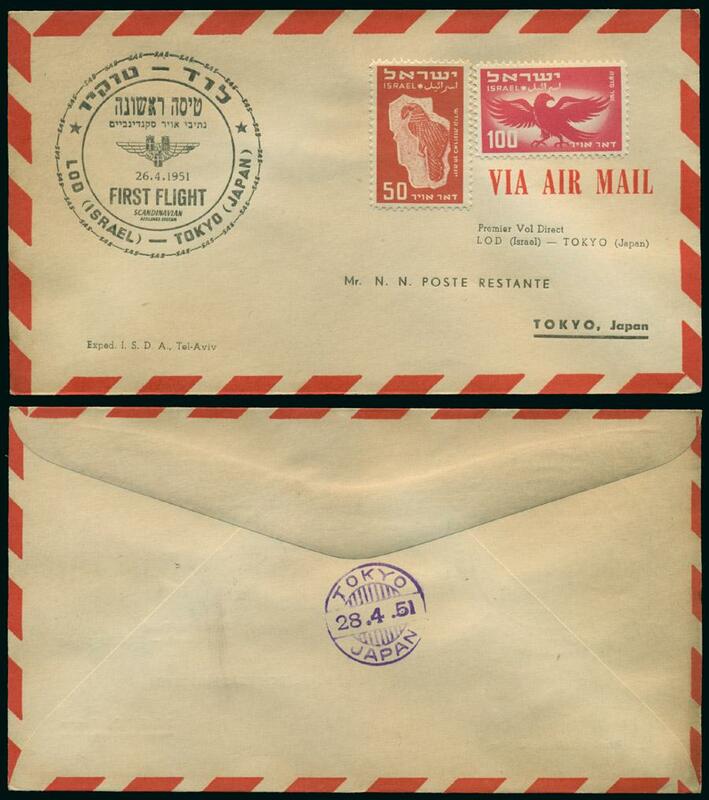 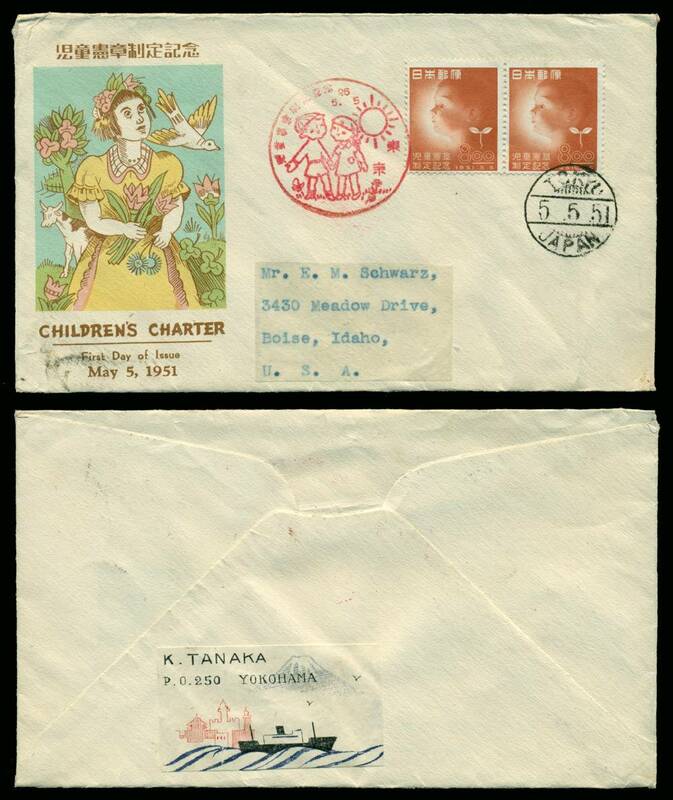 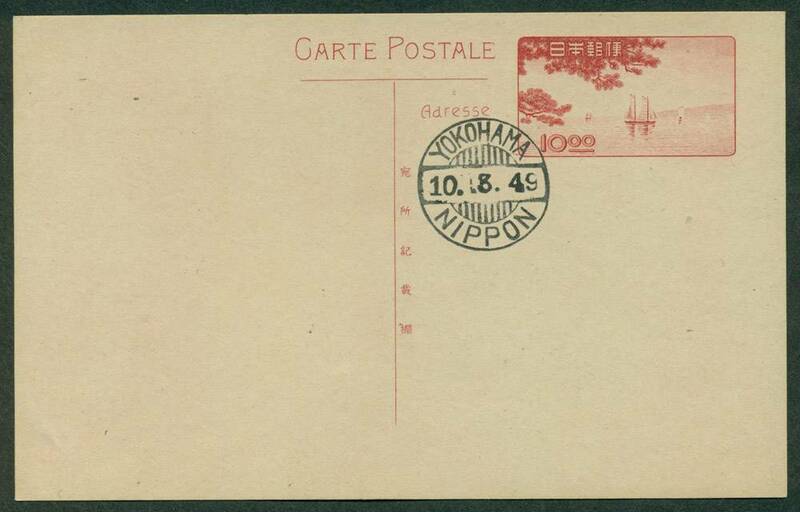 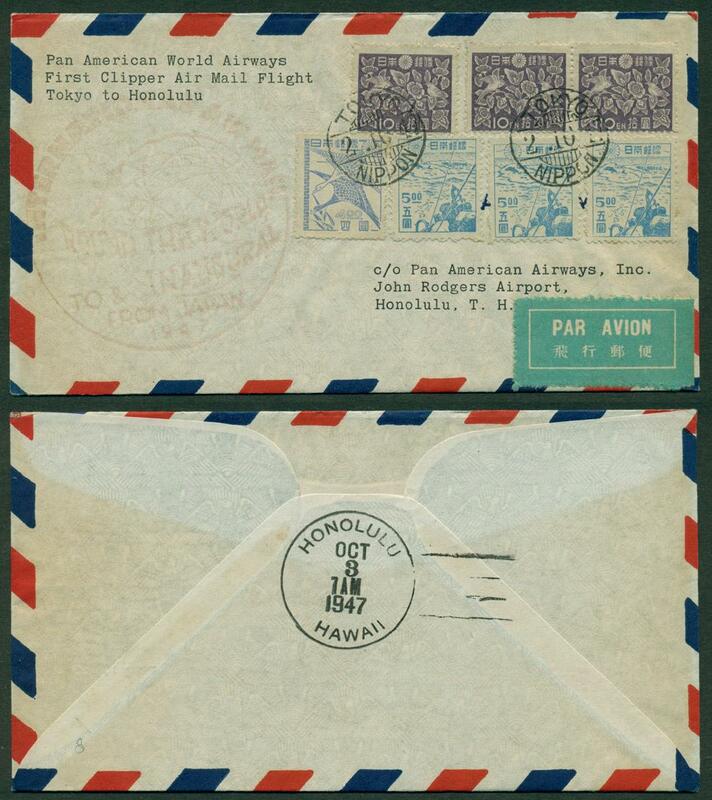 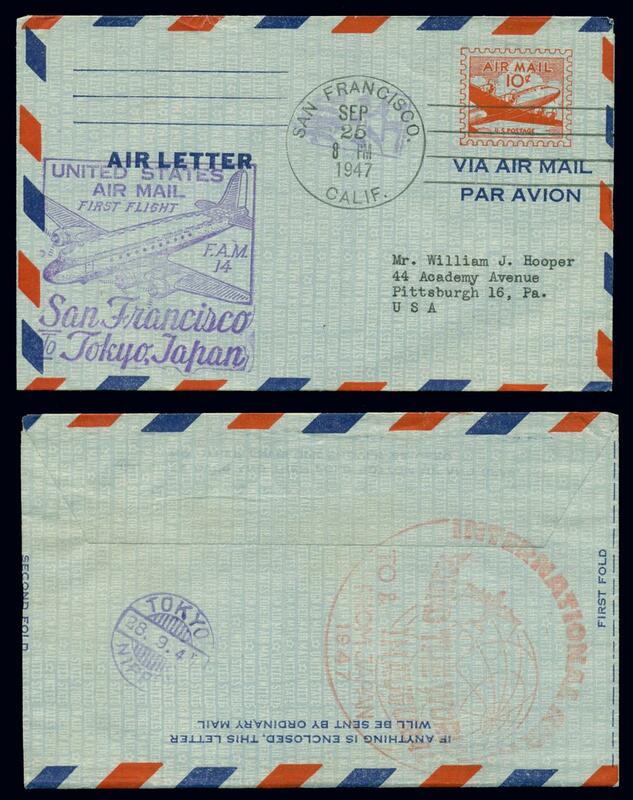 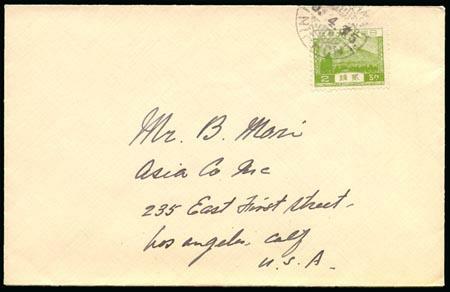 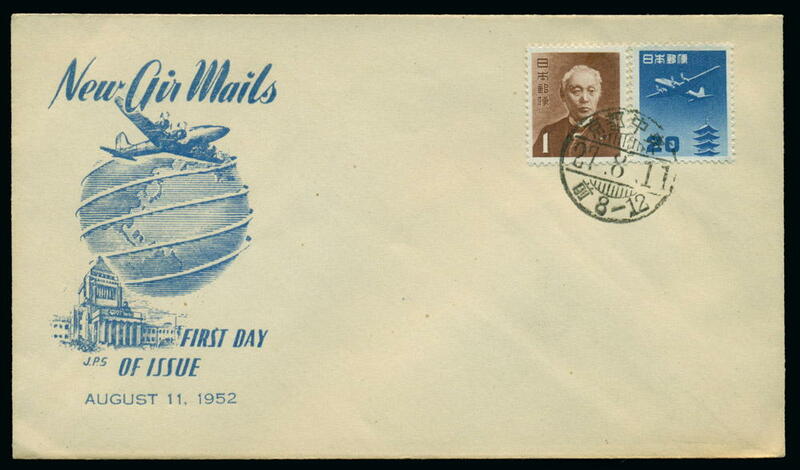 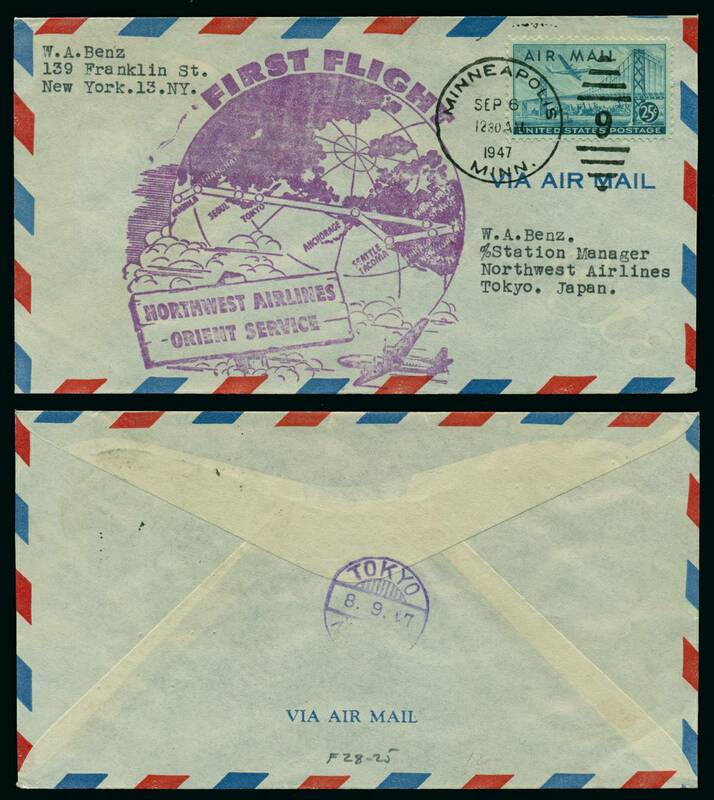 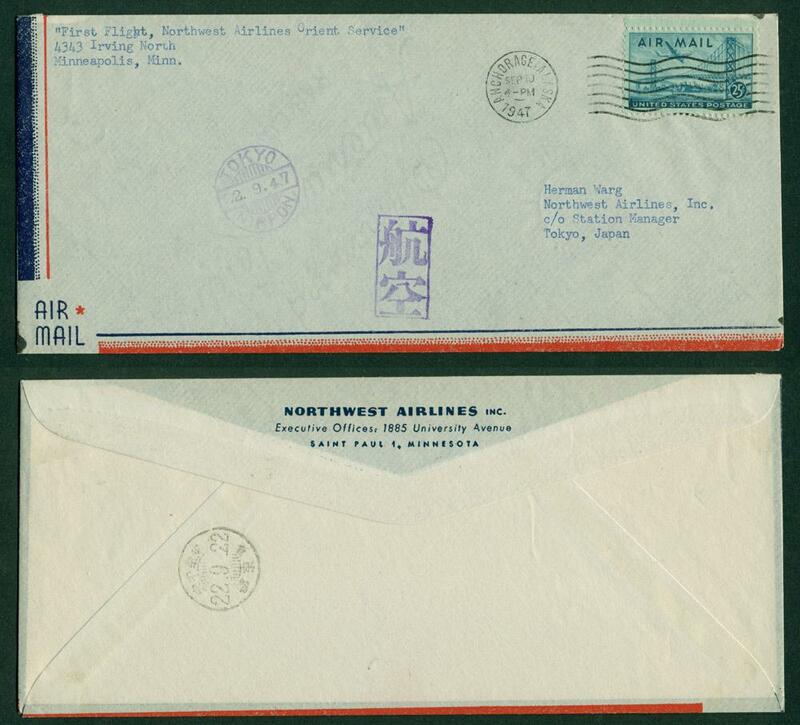 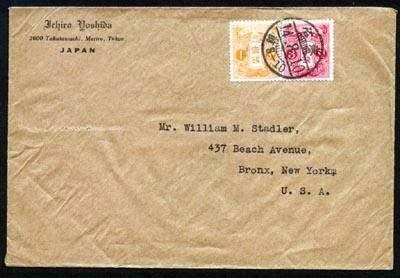 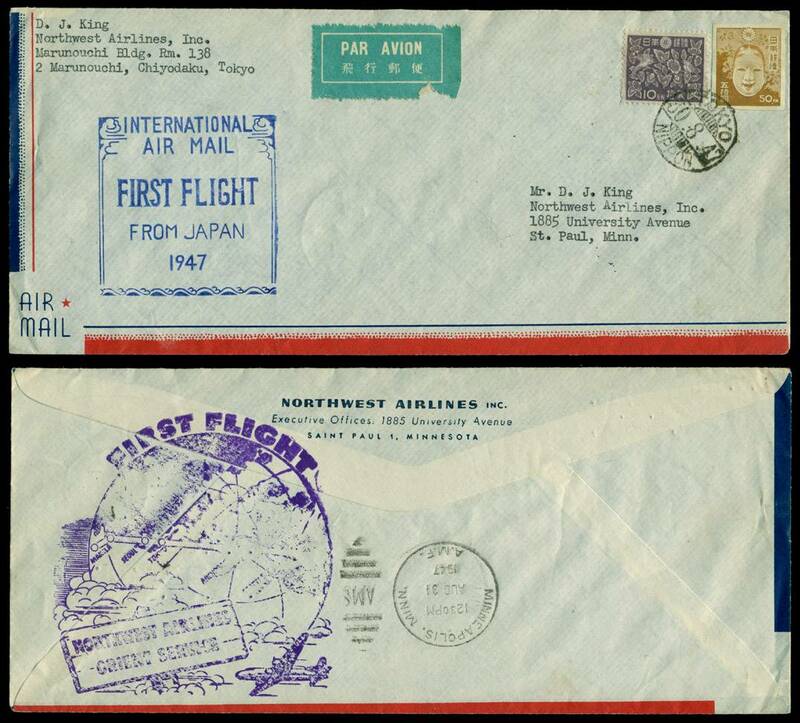 Generally these early outbound covers from Japan to (or via) America will carry some marking indicating the ship that carried that mail. 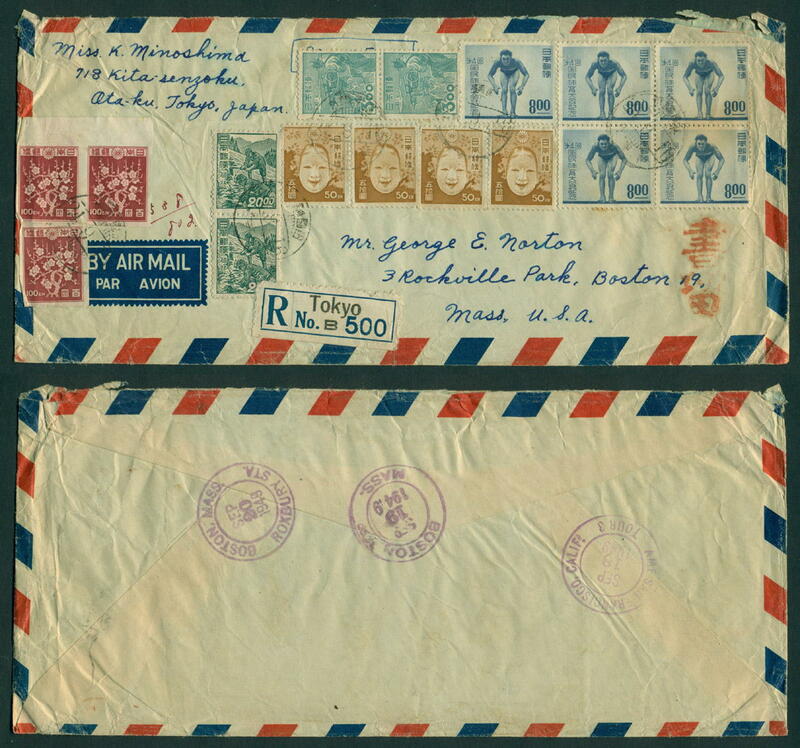 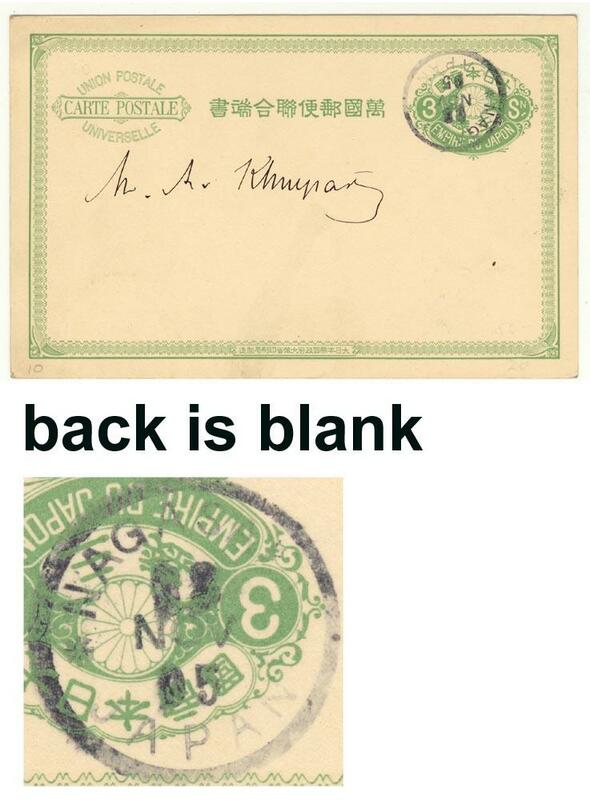 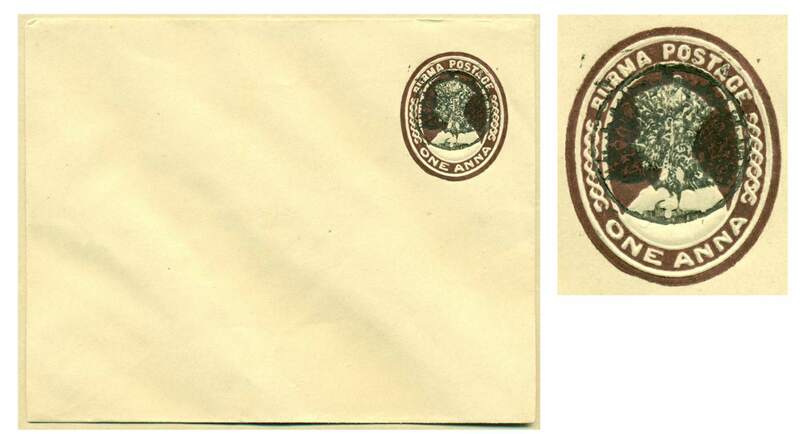 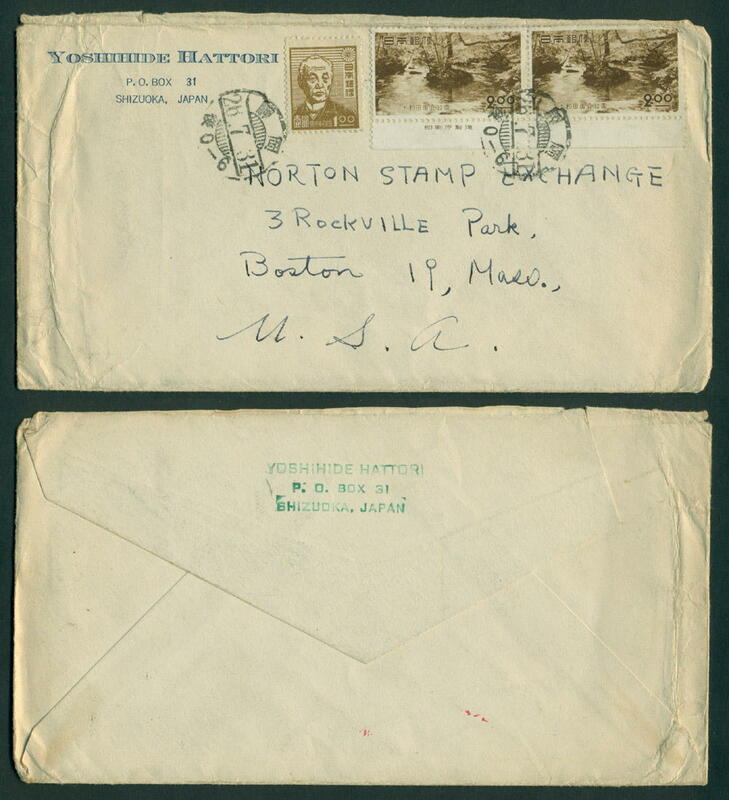 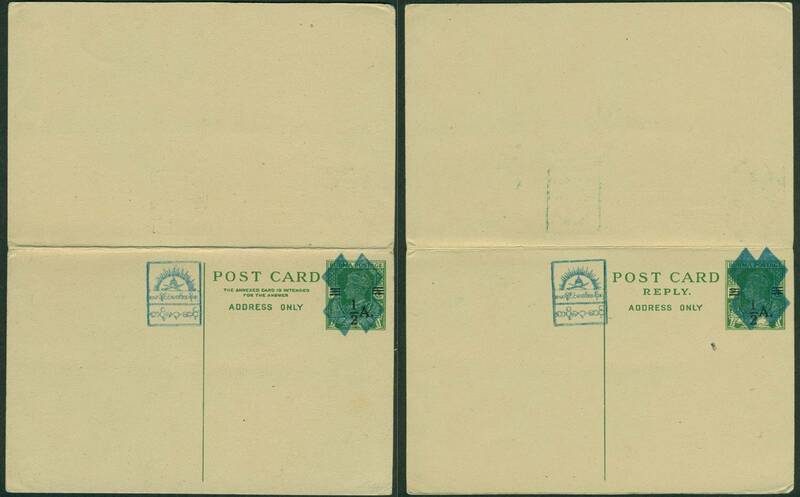 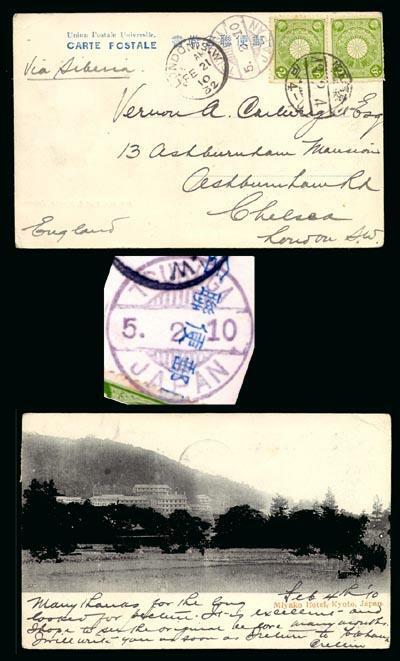 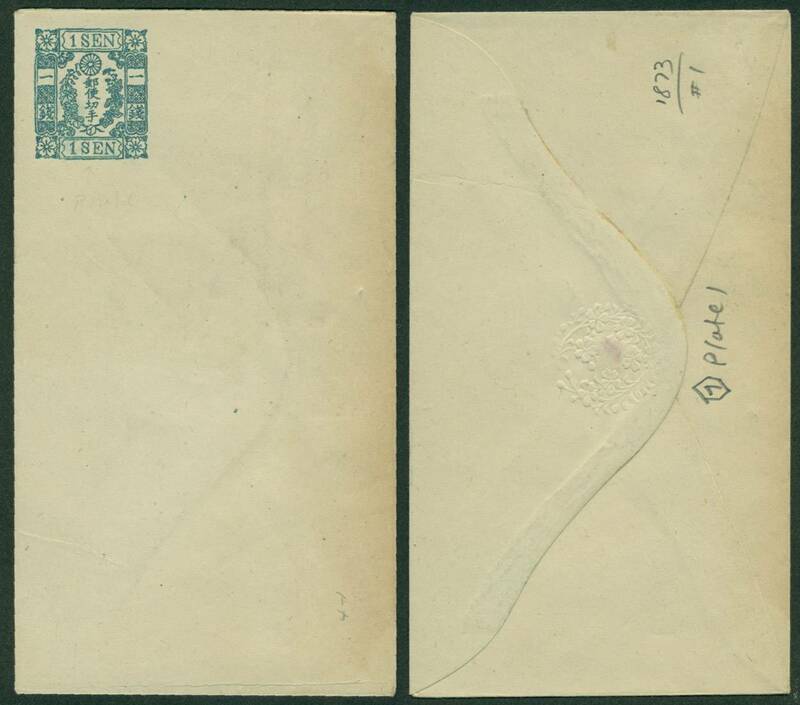 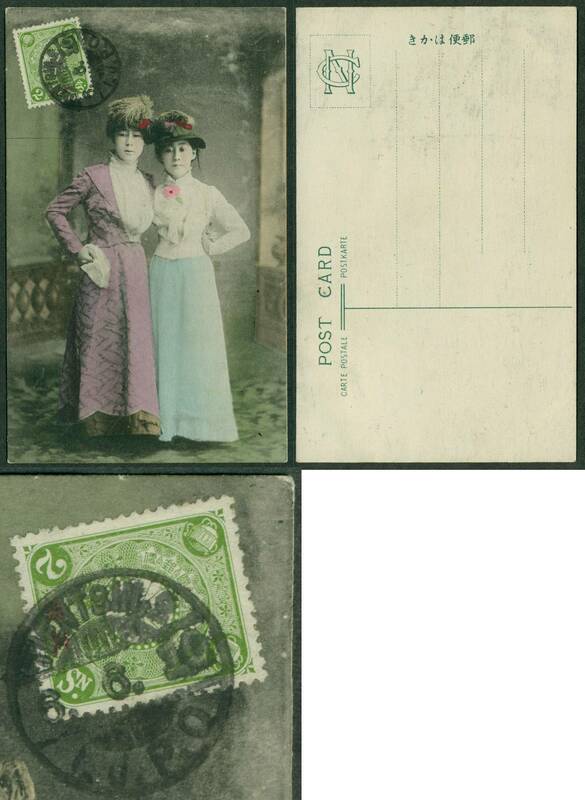 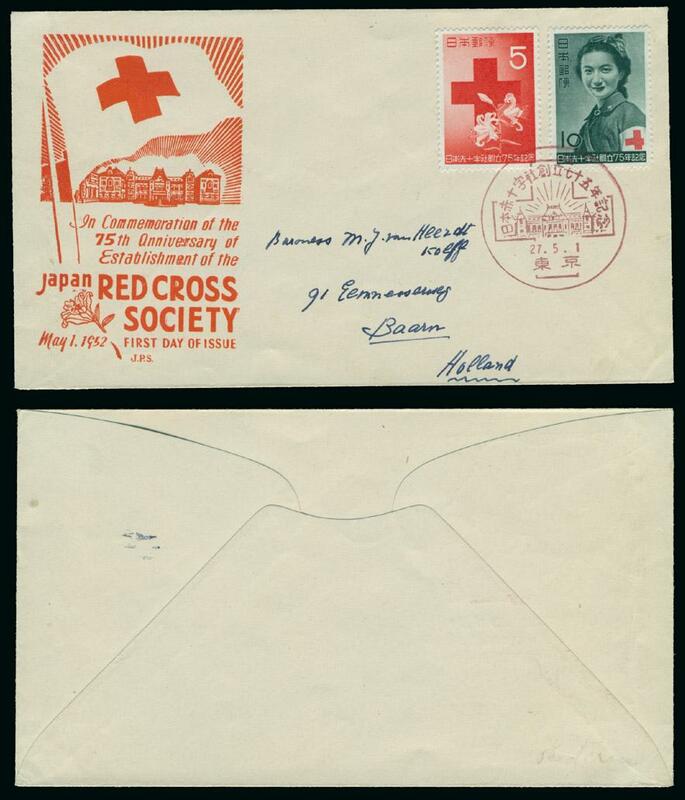 With this resource and minimum amount of additional information found on the letter (cover) it is often possible to date mail during this period. 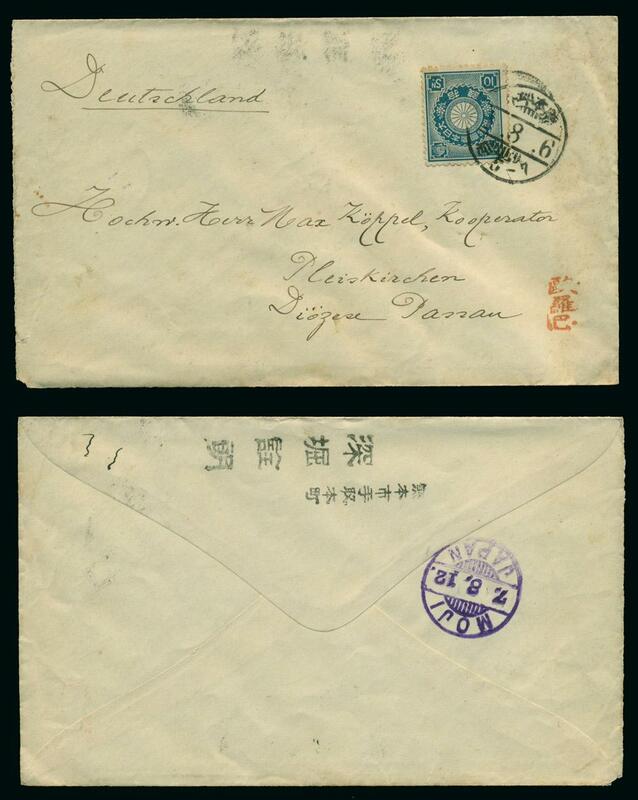 The first ship listed is the Brig Krell which sailed from Hakoodate on September 22, 1858 and the last ship is SS Belgic that departed Yokohama on December 30, 1879. 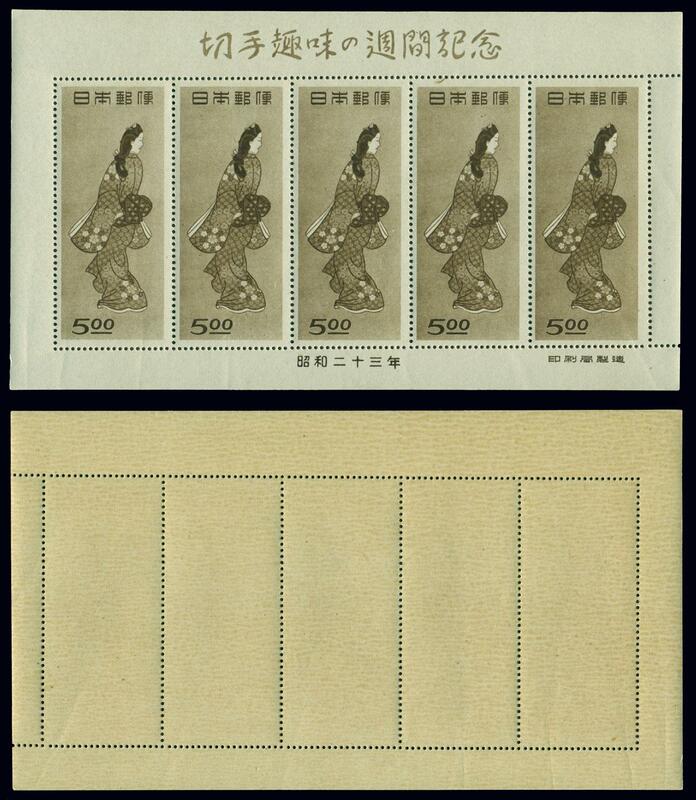 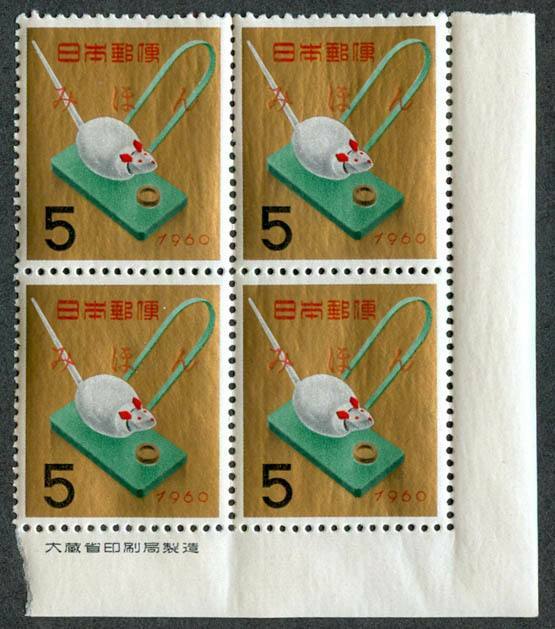 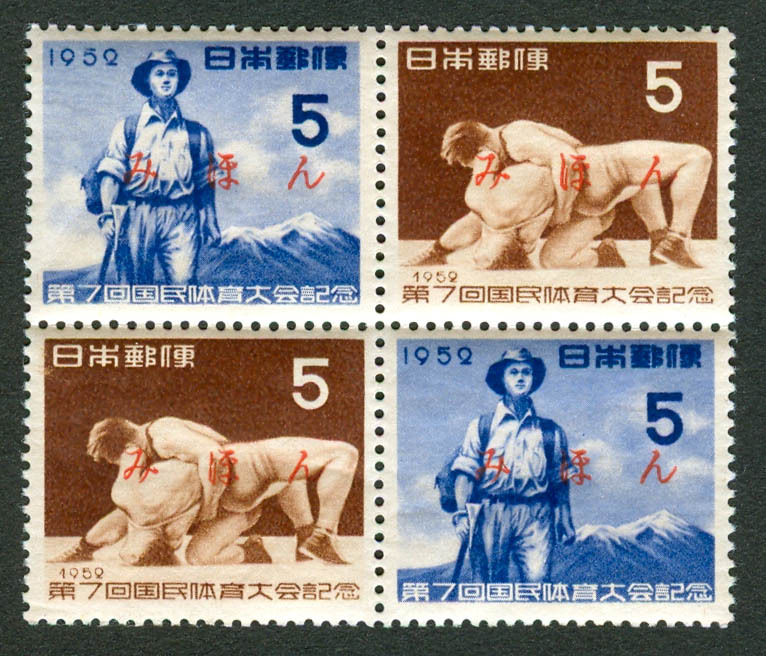 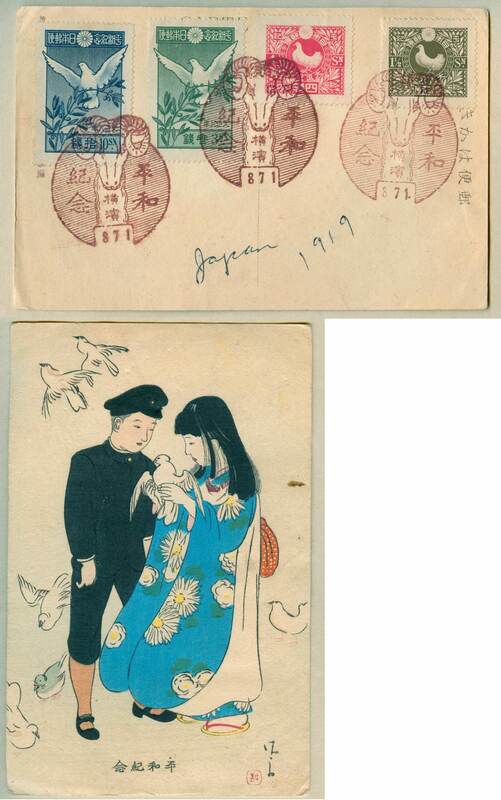 Paintings on Japanese Stamps, I.S.J.P Monograph 5, International Society for Japanese Philately, supplement to Japanese Philately, Volume 27, No. 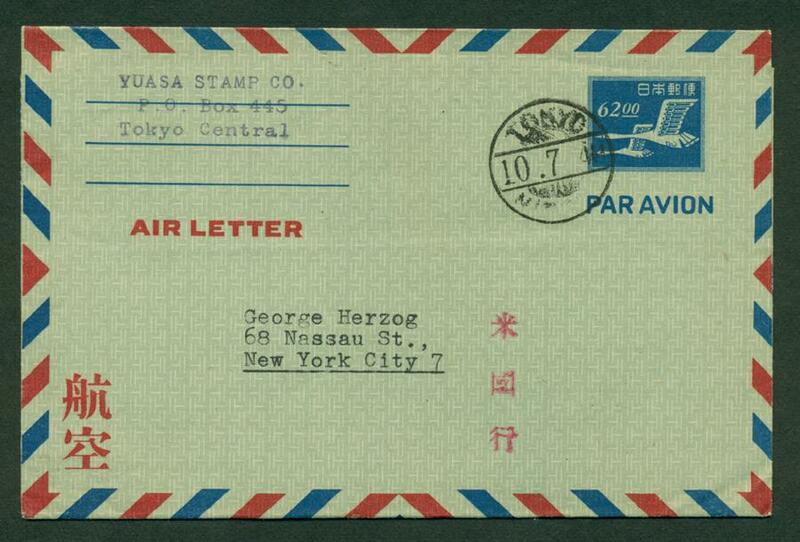 2, April, 1972, stapled wraps, 56 pp. 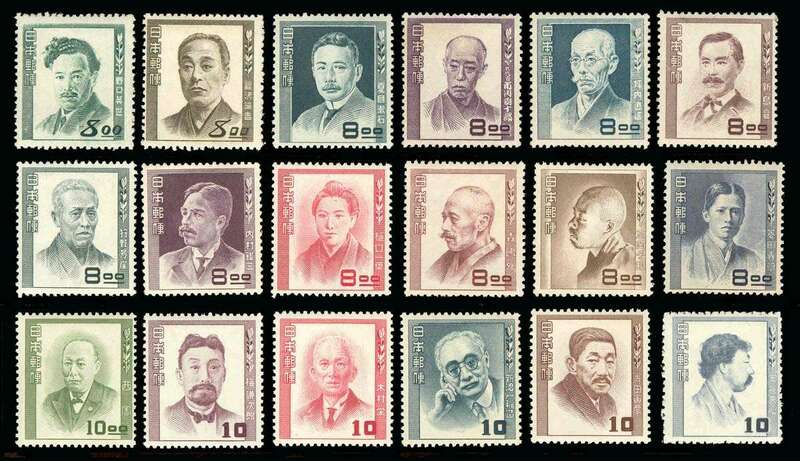 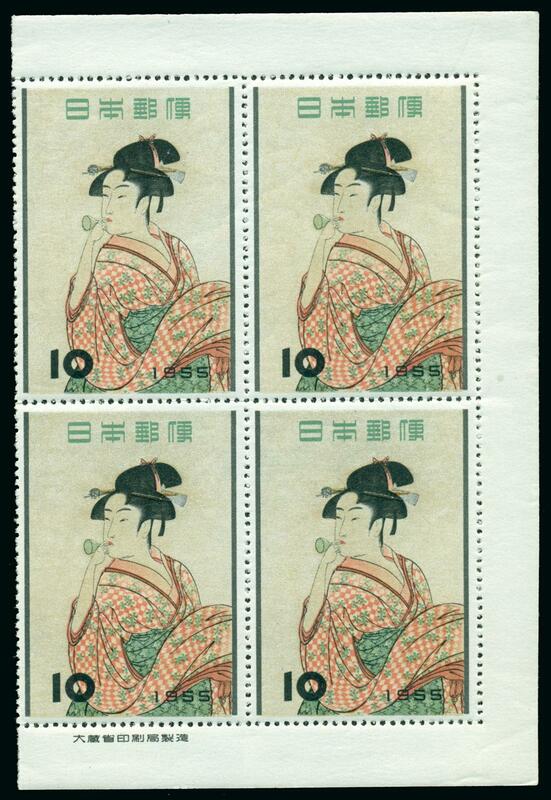 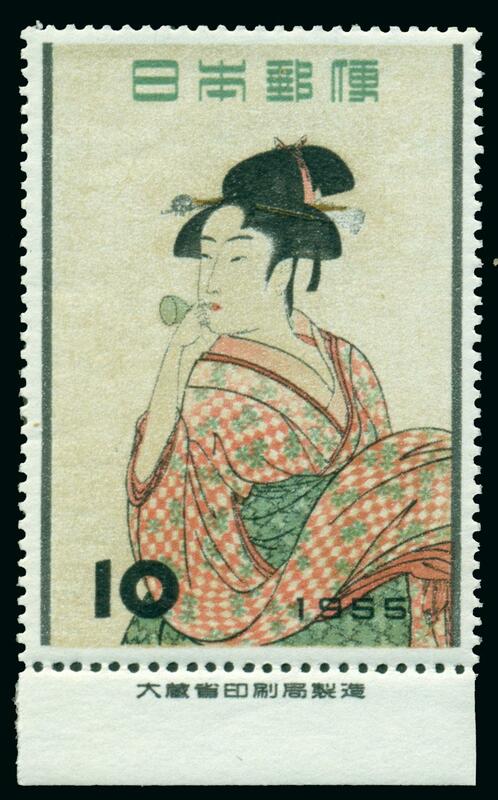 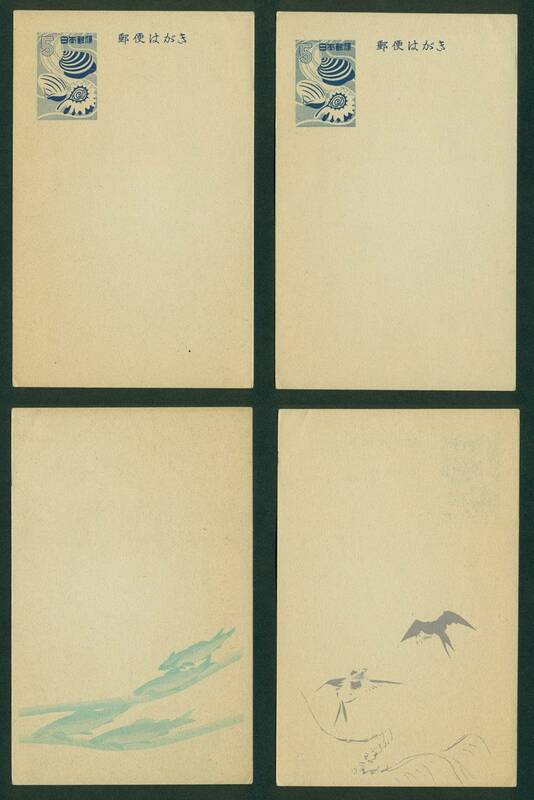 A survey and lising of Japanese painting as reflect on Japanese stamps. 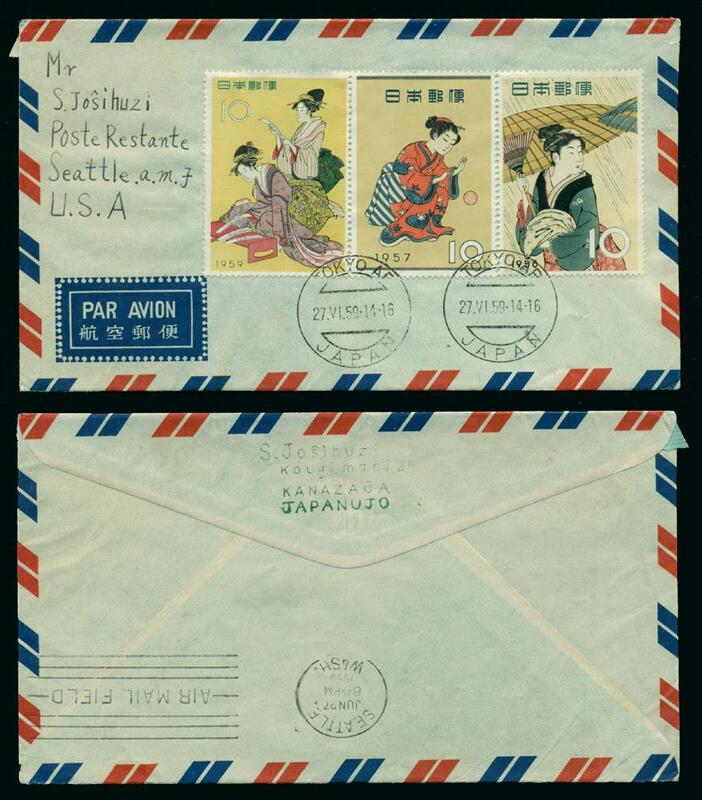 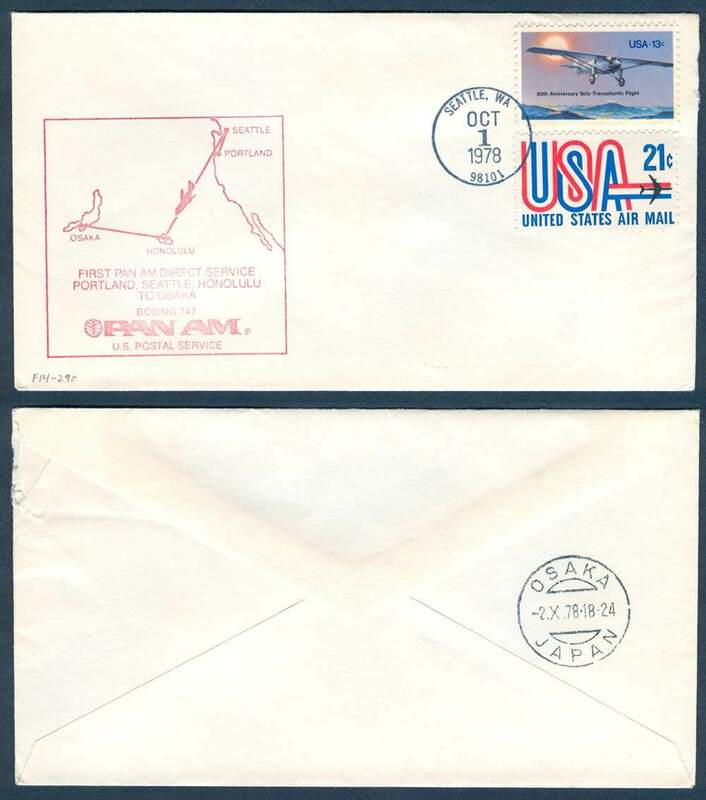 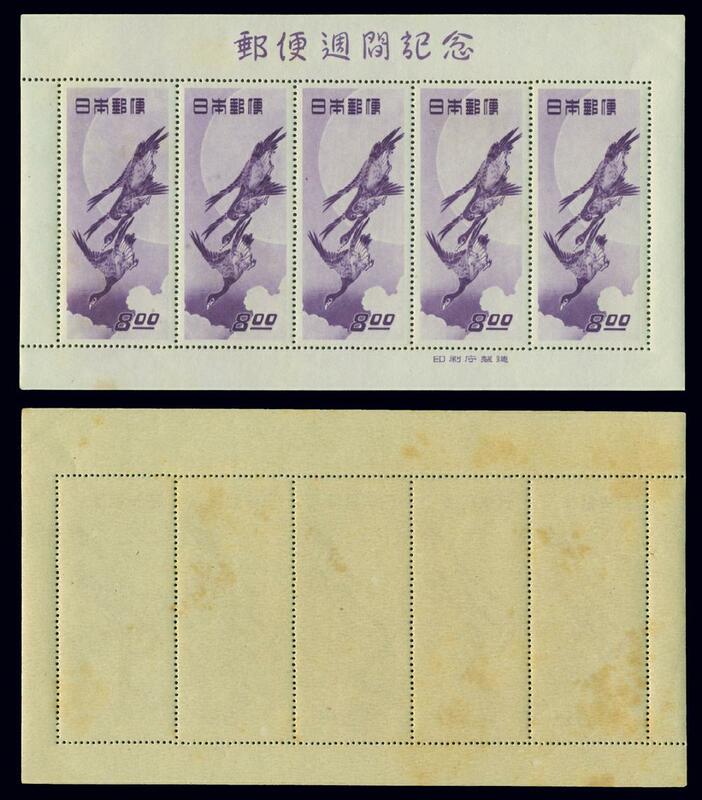 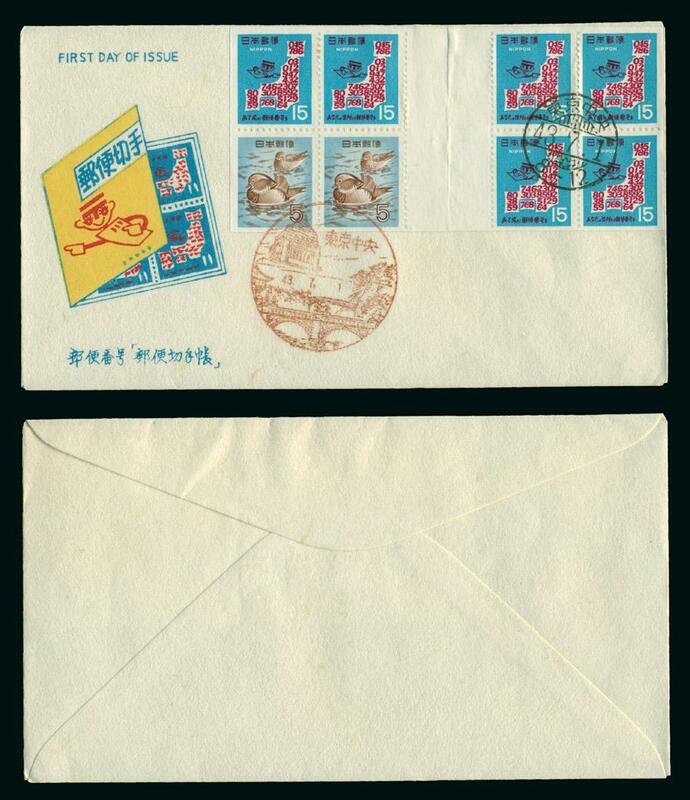 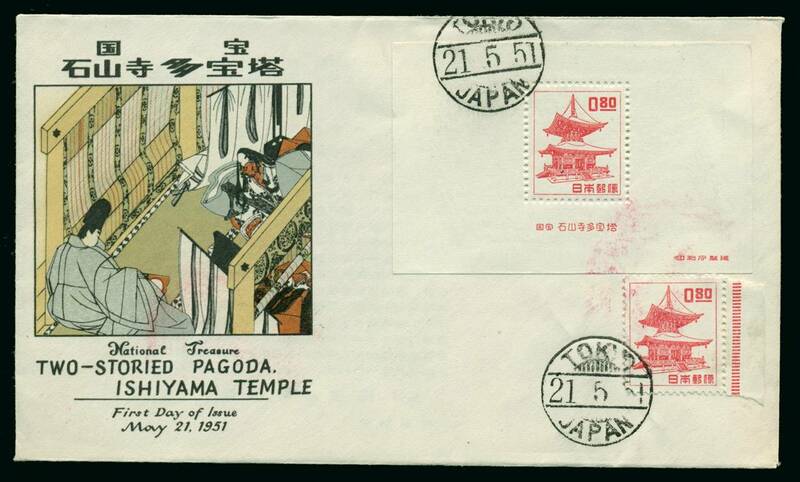 The Roman Letter Postmarks of Japan, I.S.J.P Monograph 7, (Japanese Philately, Vol 34: No 1), Silver Spring, MD, The International Society for Japanese Philately, Inc, February 1979, 4to, paper wraps stable bound, 114 pp. 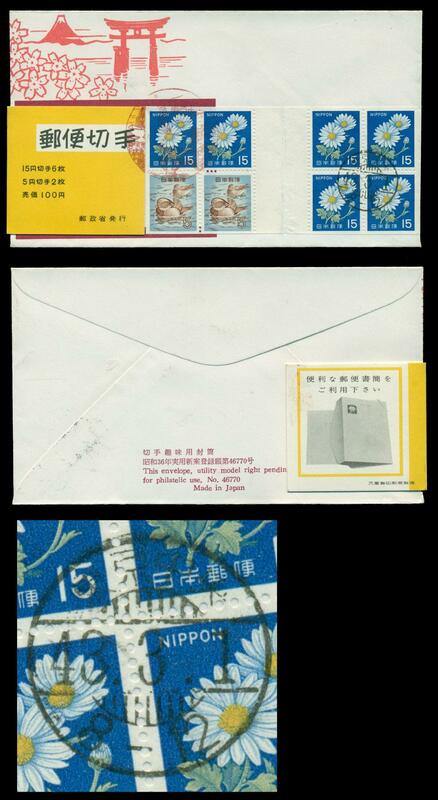 A comprehensive catalogue/study of English language (roman-letter) cancels used in the Japanese postal system. 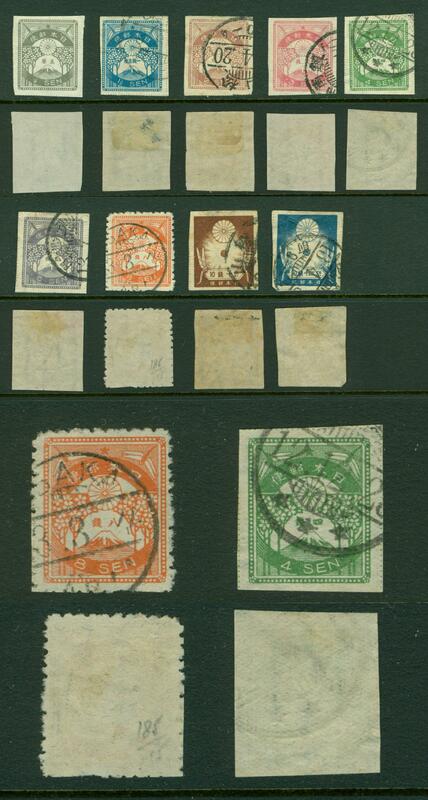 The cancels are categorized by date, type, office and color. 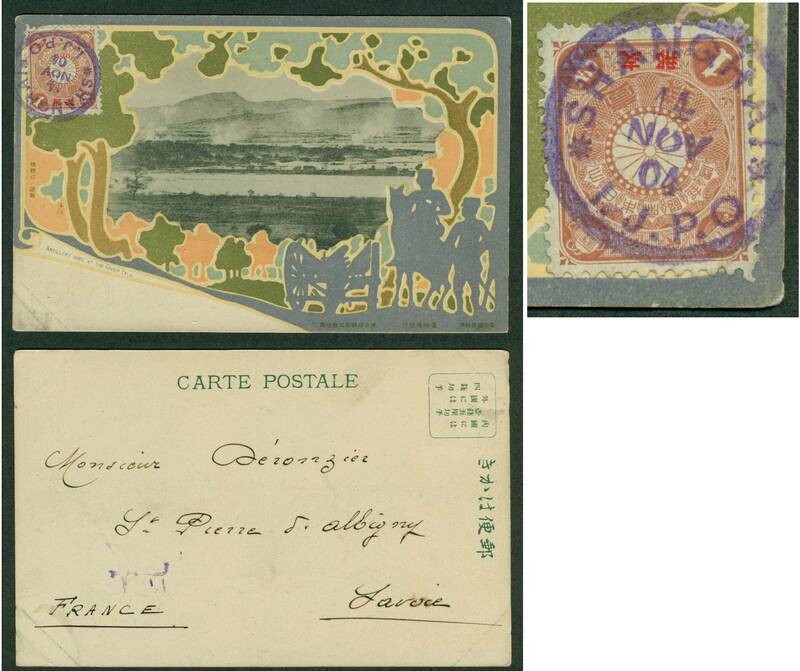 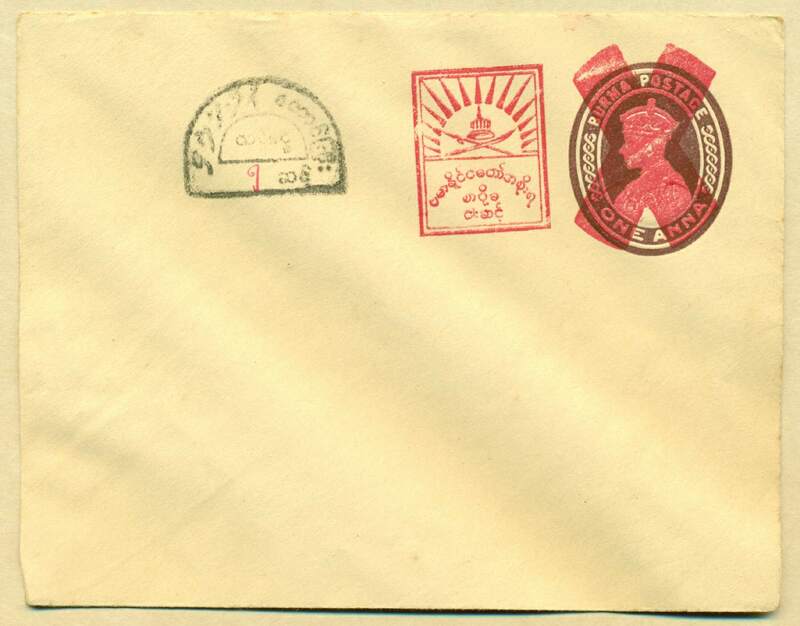 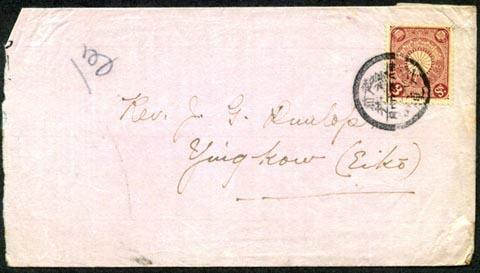 The cancels cover the period from 1875 forward. 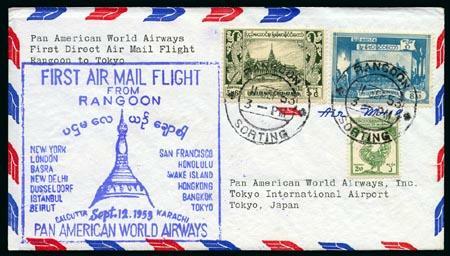 Where known, the earliest and latest use of the cancel are reported. 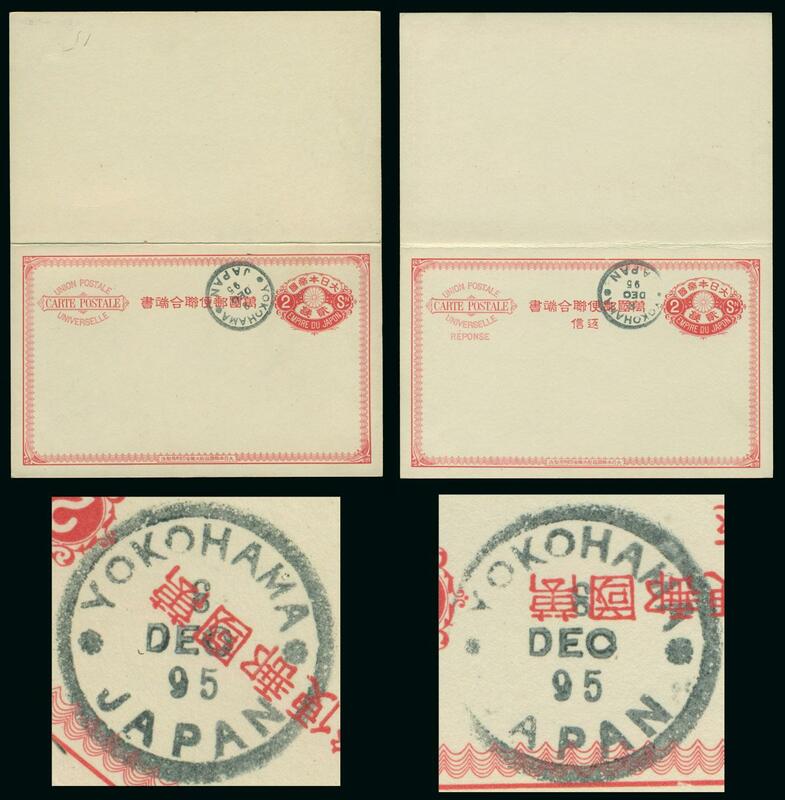 In the very early cancels this information is not actually on the cancel so the information is critical for dating stamps and covers with these cancels. 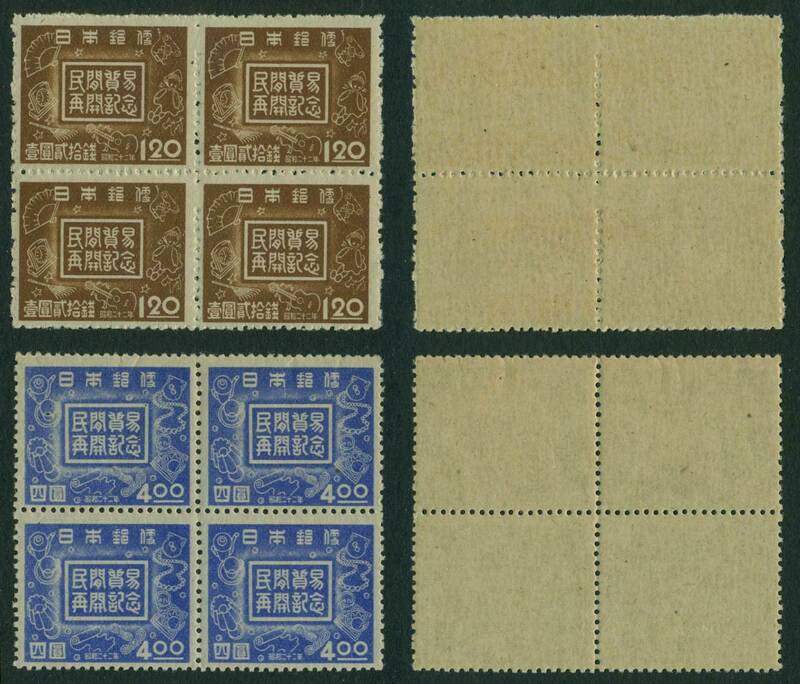 Cancels used in China, Taiwan (Formosa) and Korea are listed as well as the various prefectures of Japan to include Okinawa. 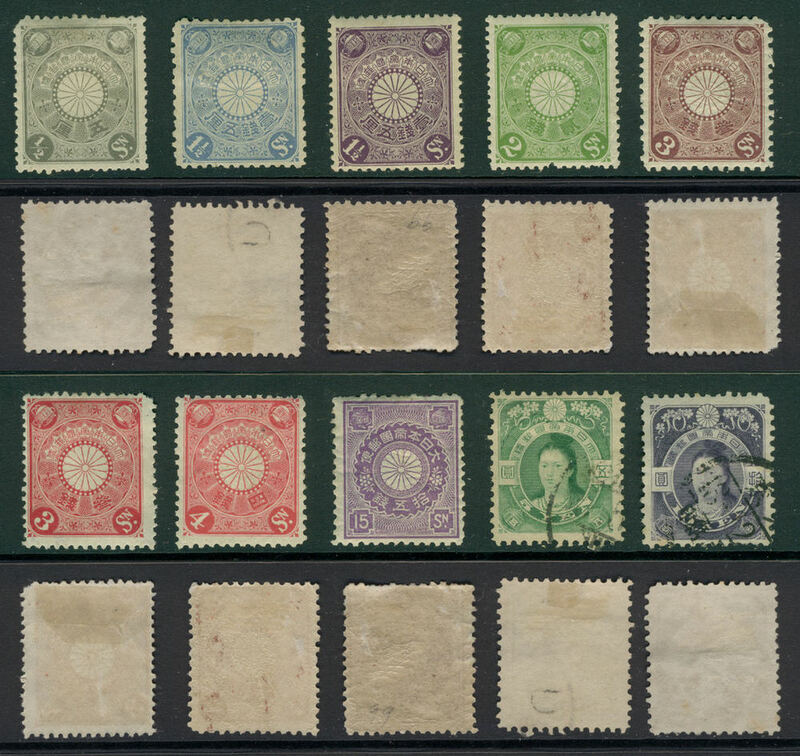 Values or scarcity rating are not assigned in the listings. 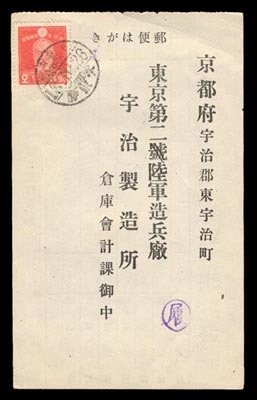 To see the cover and an example of a text page, click here. 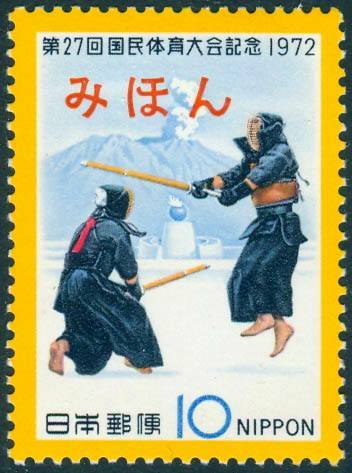 Japans Klassiske Forfalskninger, Norway, Troms Filatelisklubb, Norway, 1981, text in Norwegian with English translation at the back, stiff wraps, 362 pp. 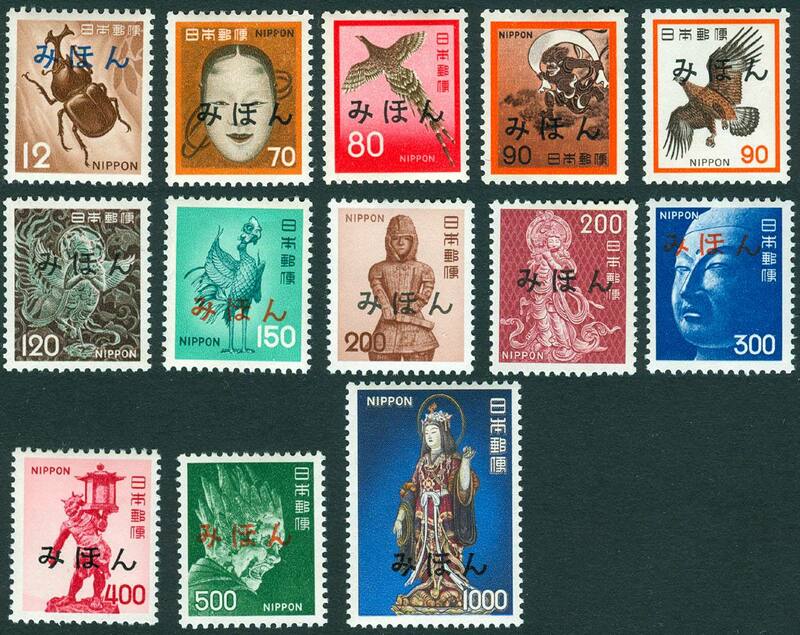 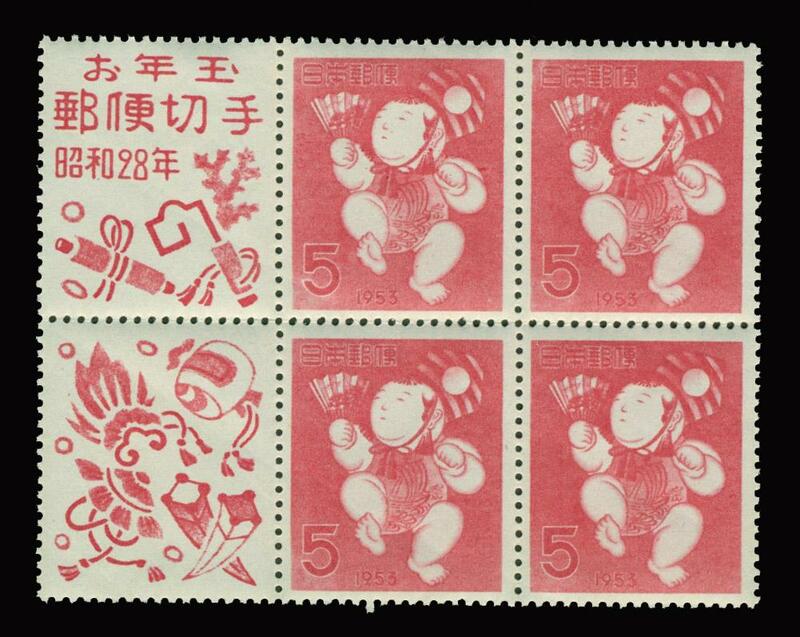 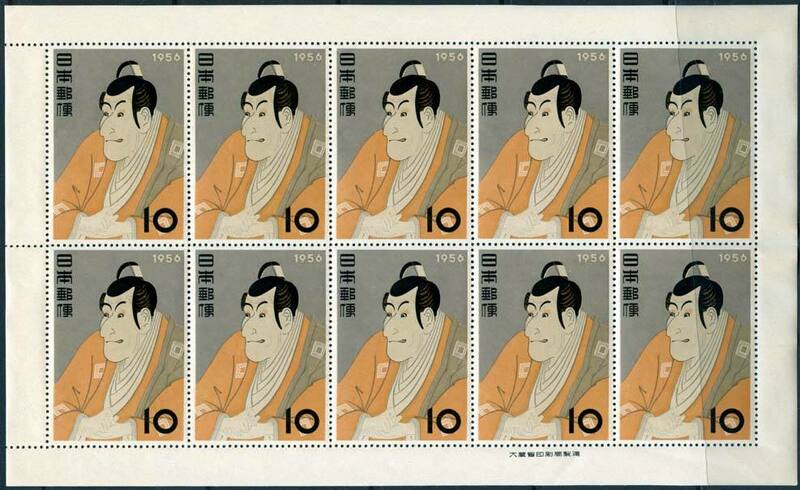 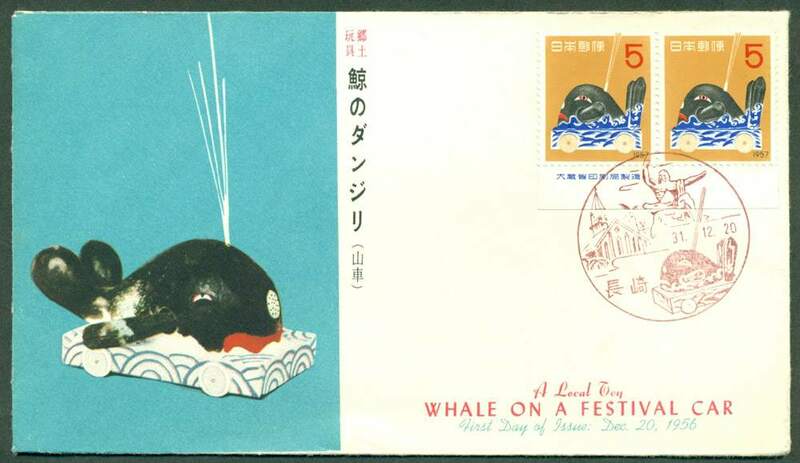 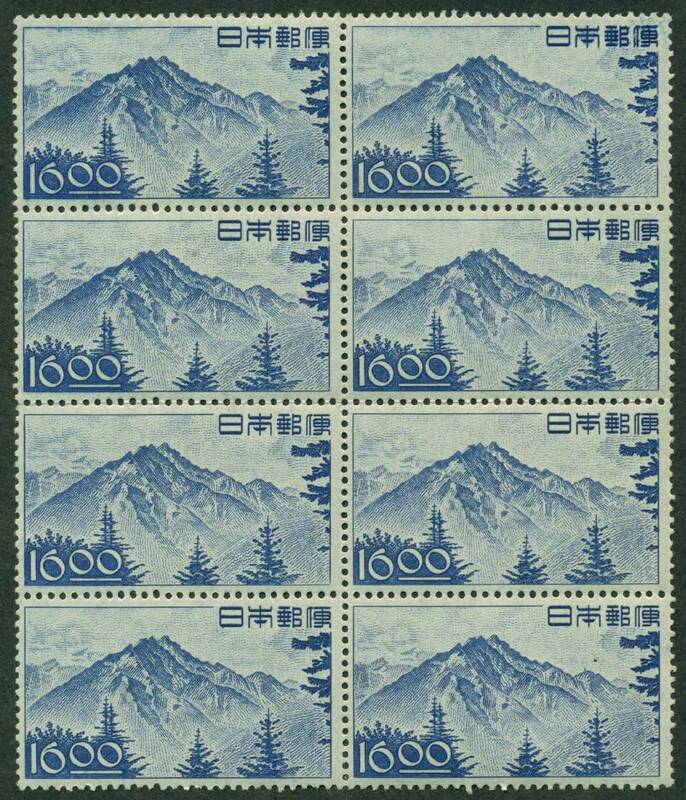 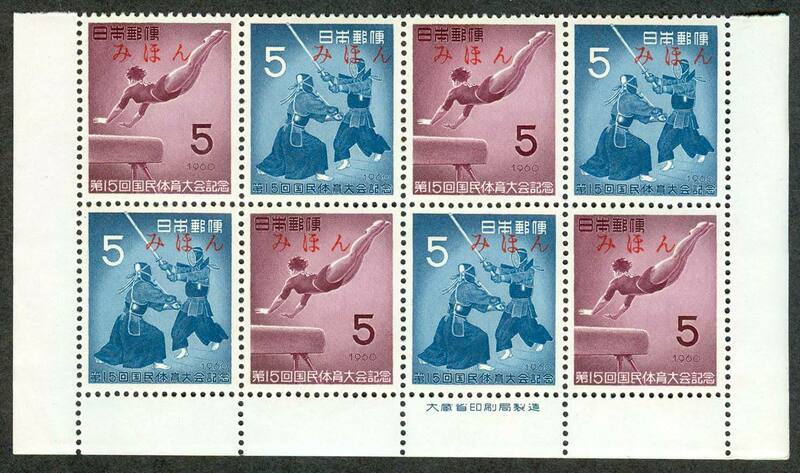 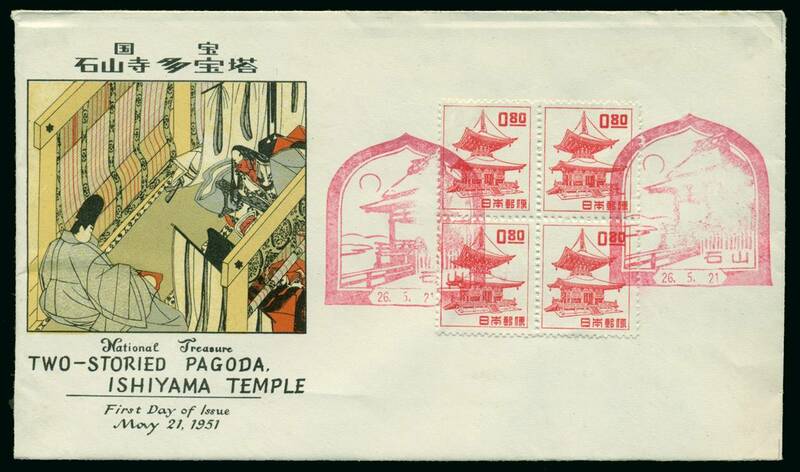 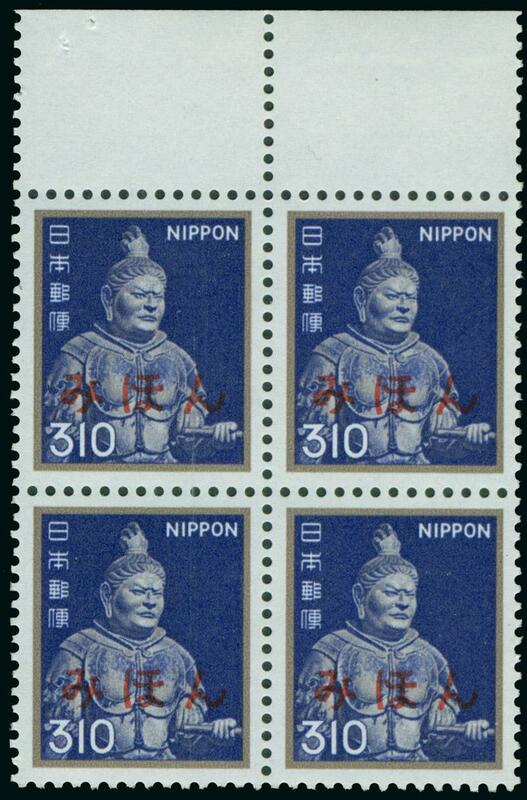 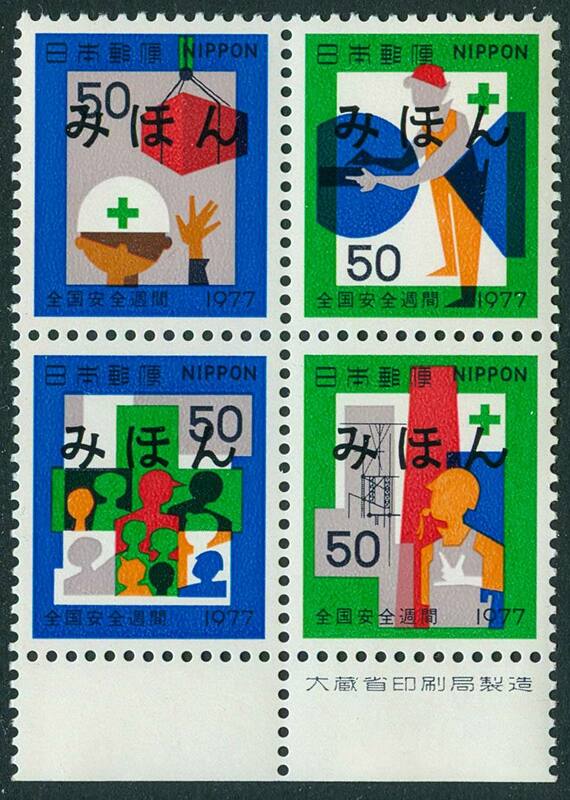 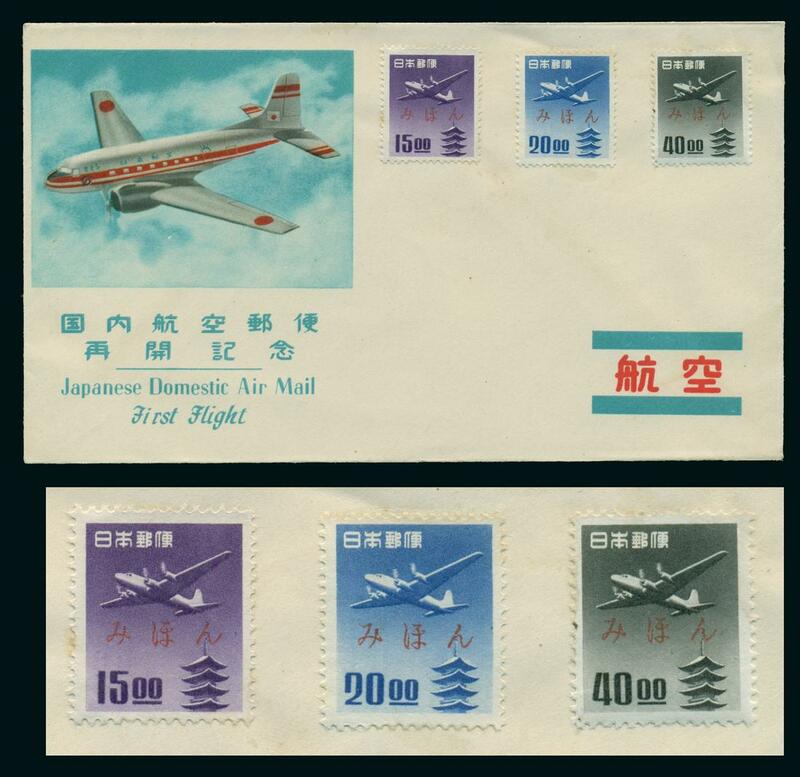 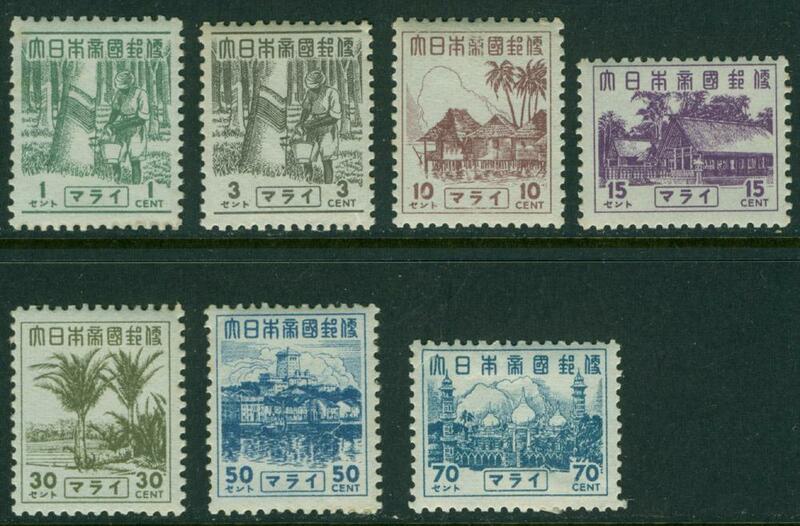 A handbook on the forgeries of the early (classic) Japanese stamps. 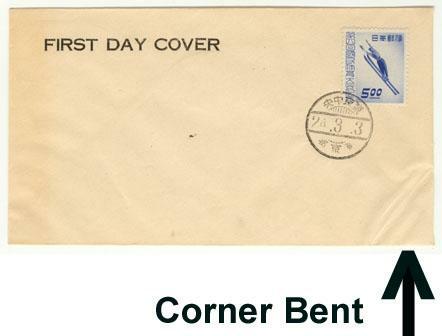 To see the cover, click here. 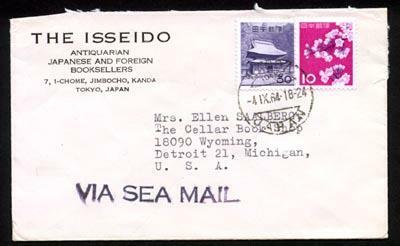 ISBN: 82-990786-0-1. 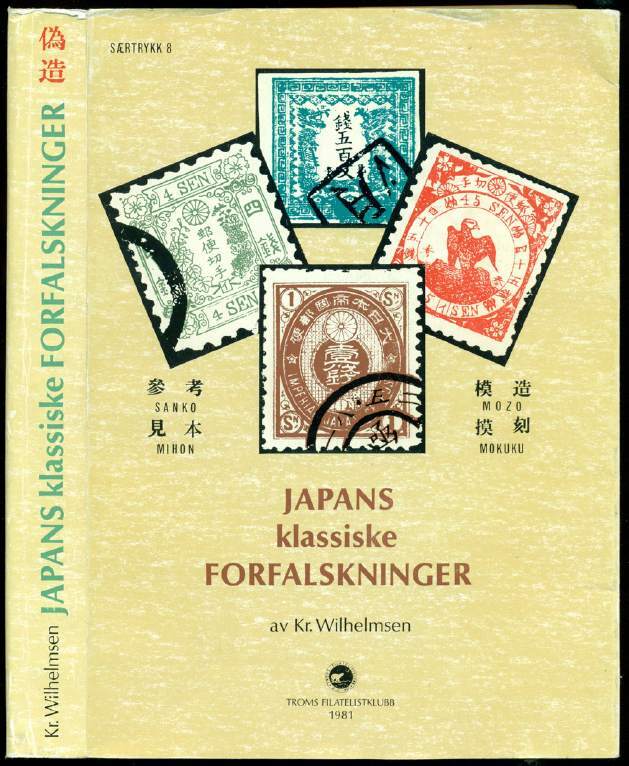 The basic source book is accompanied by a large (8 x 10 inch) plastic spiral bound typed book titled "The English Text of 'Japans Klassiske Forfalskninger' by Kristan Wilhelmsen." 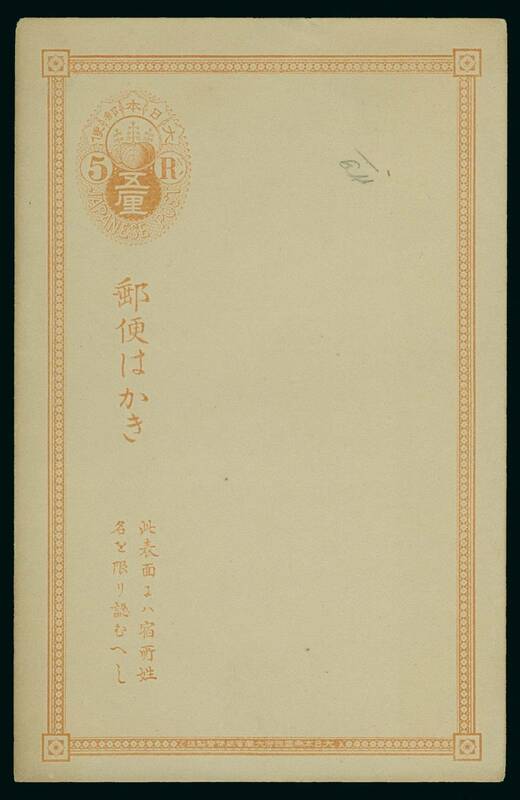 This book appears to be a typed copy of the English translation found at the rear of the source book. 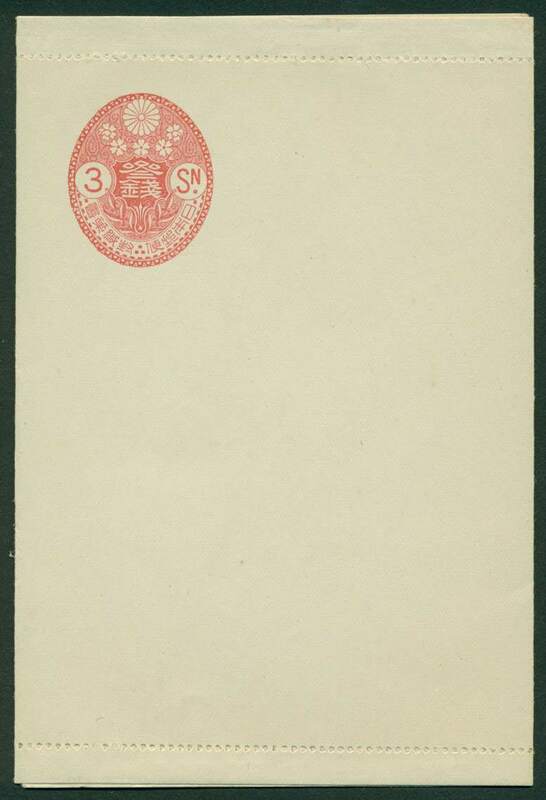 However, there is a least one "Ed. 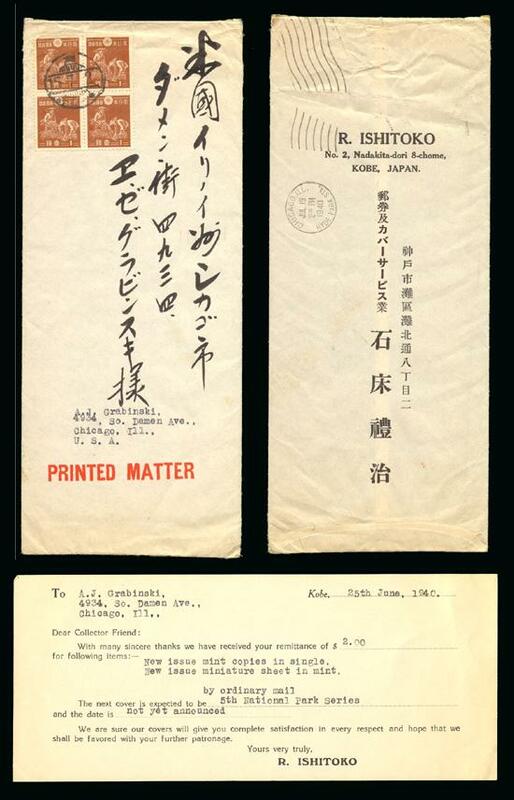 Note" in this typed book not found in the translation in the source book. 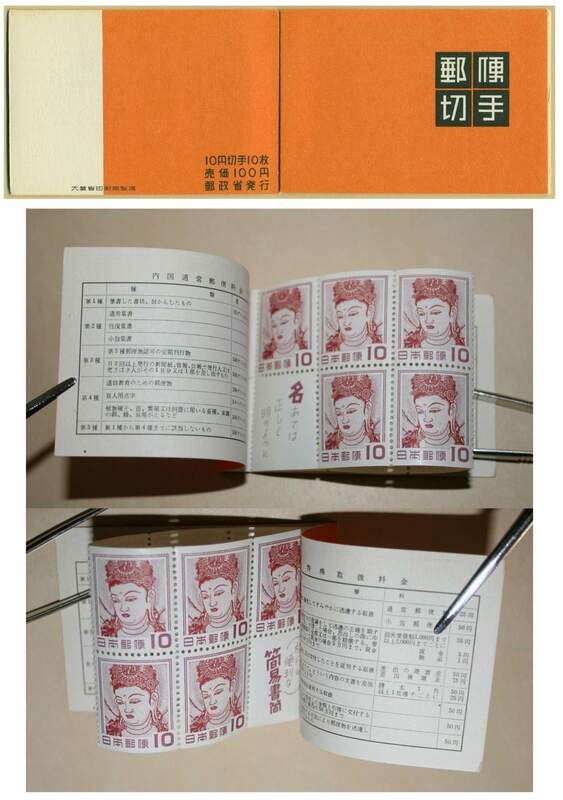 This book is a useful tool as you can use it alongside the source book rather than flipping back an forth between the text and the translation at the rear of the book. 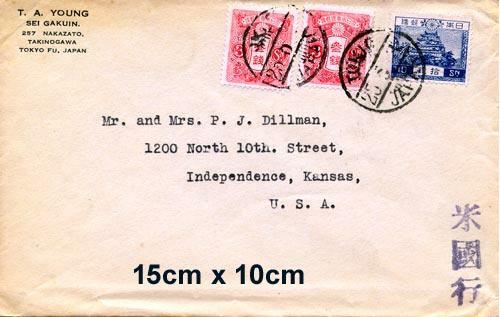 Heavy books (2 pounds packed) and postage outside the US will be quoted based upon the destination. 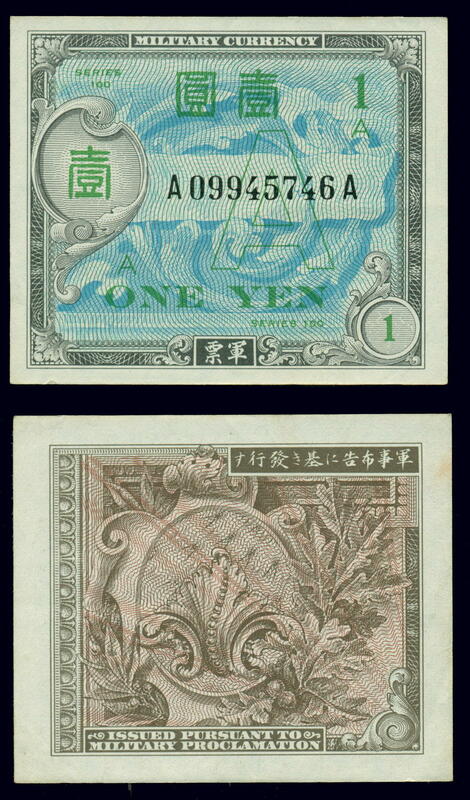 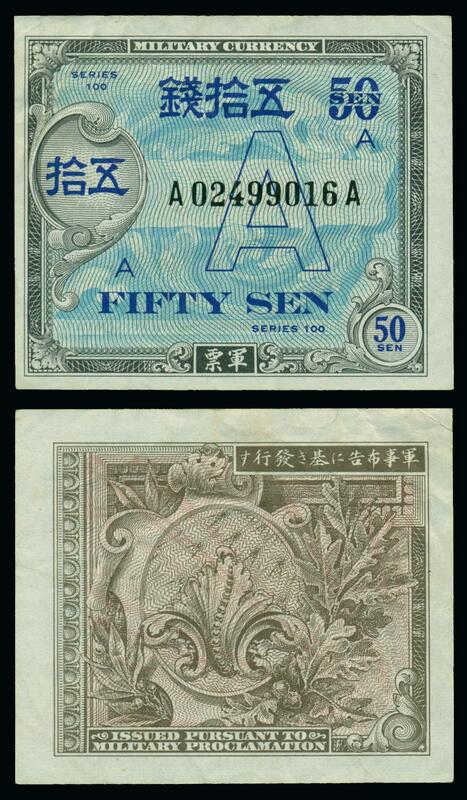 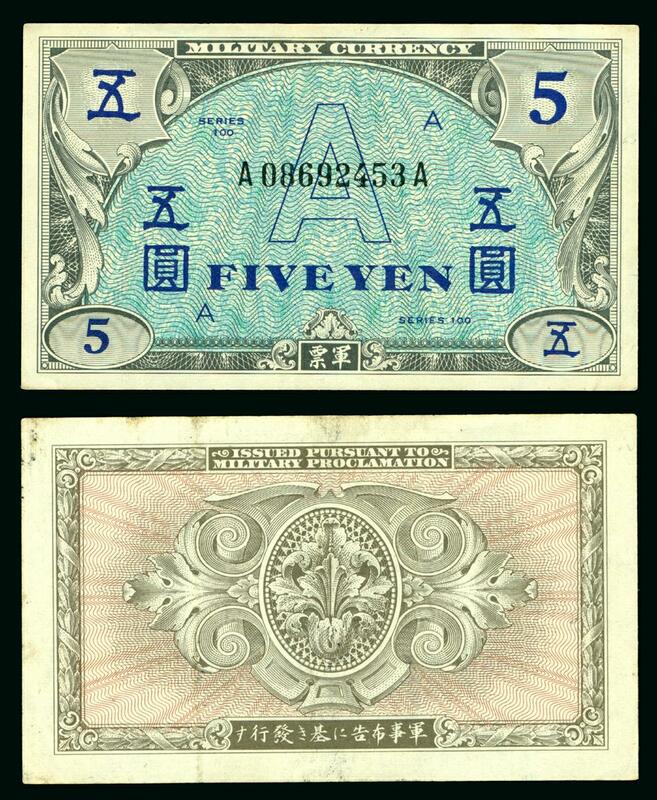 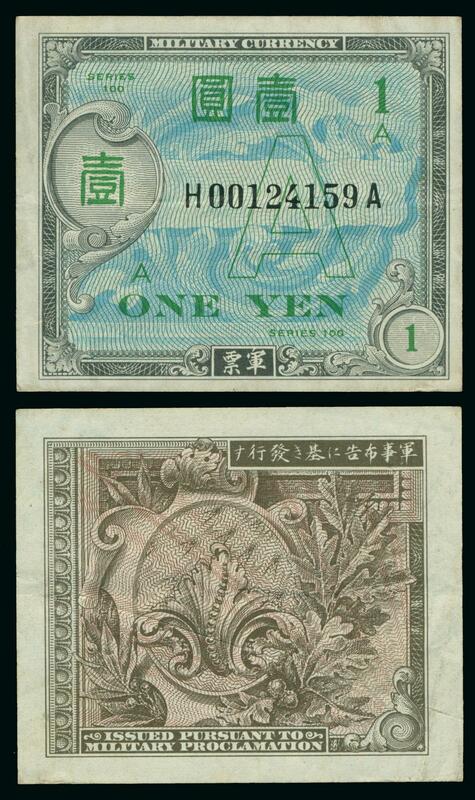 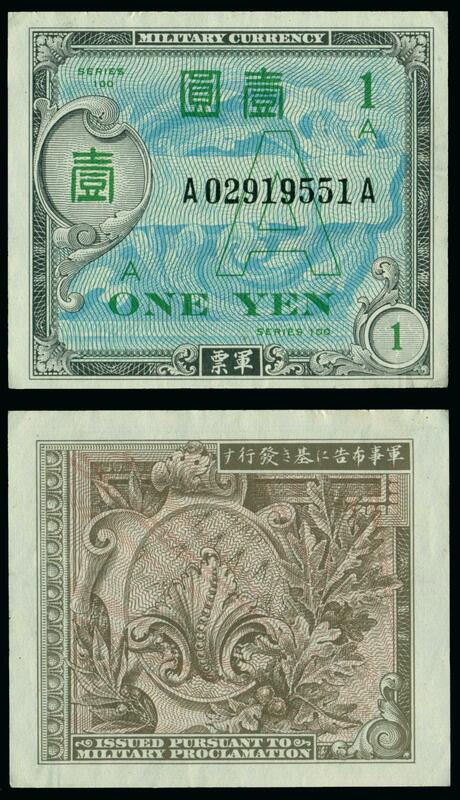 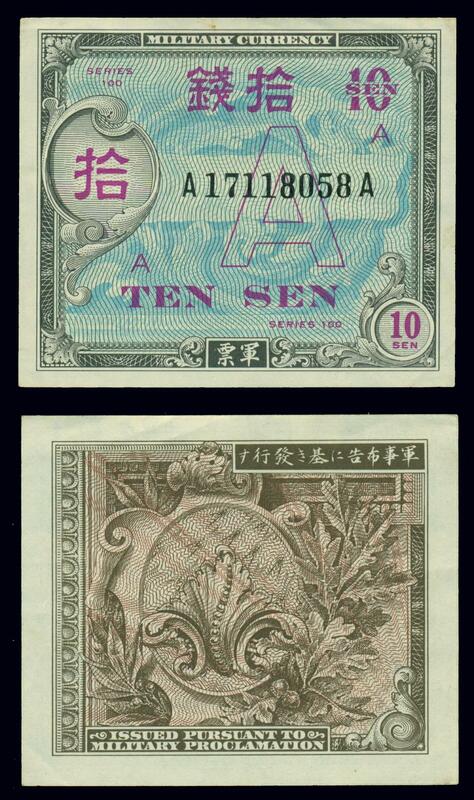 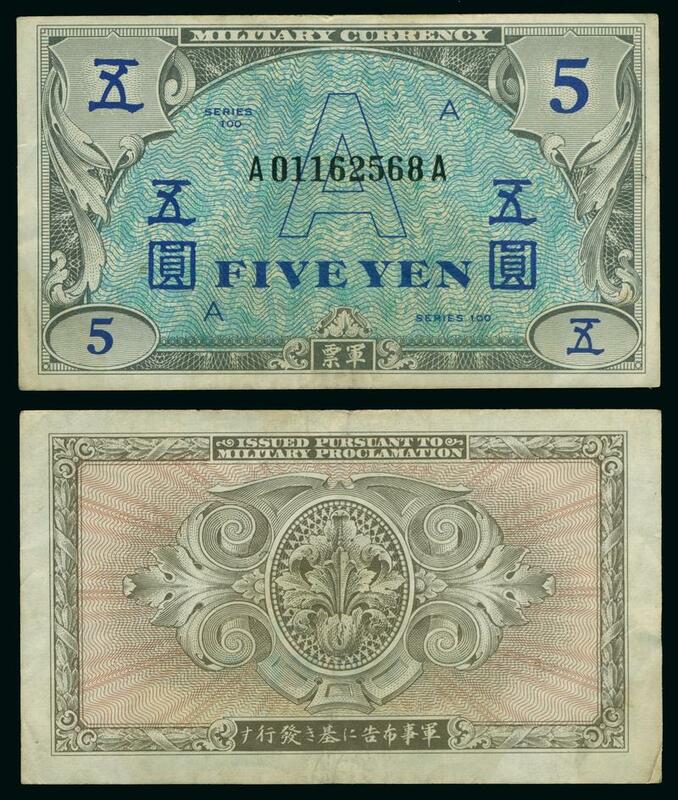 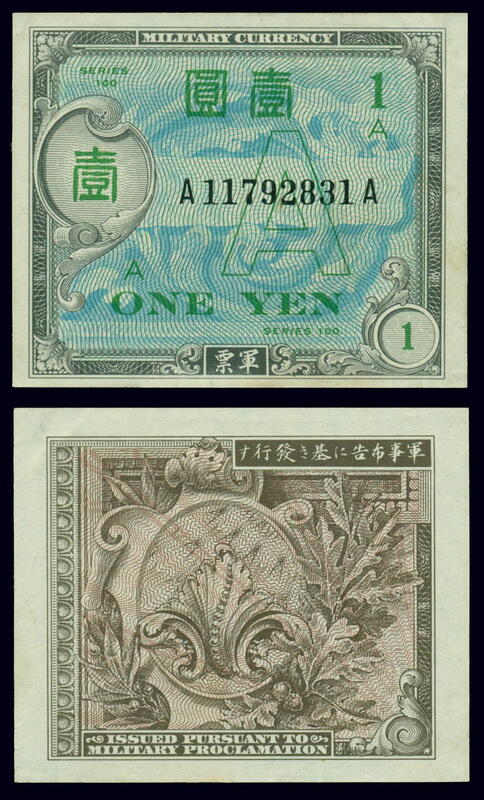 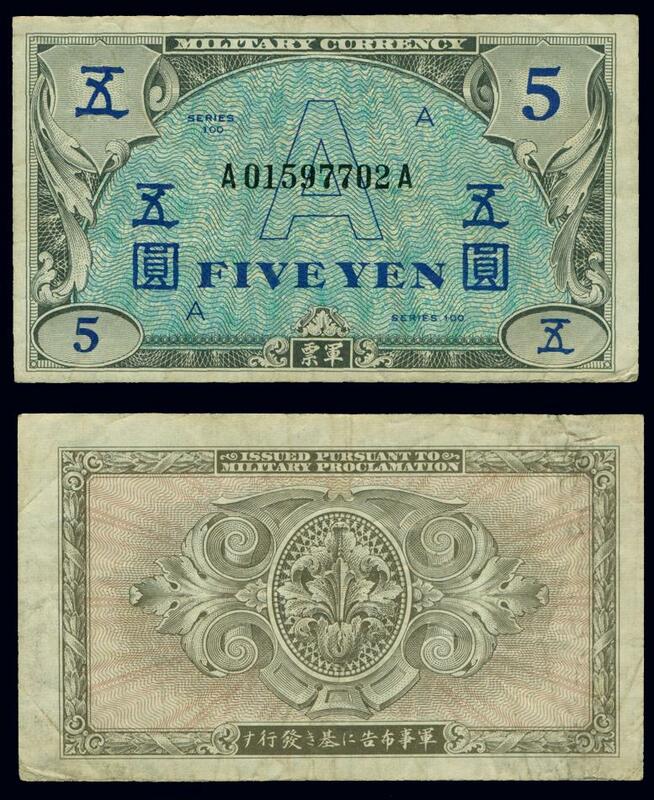 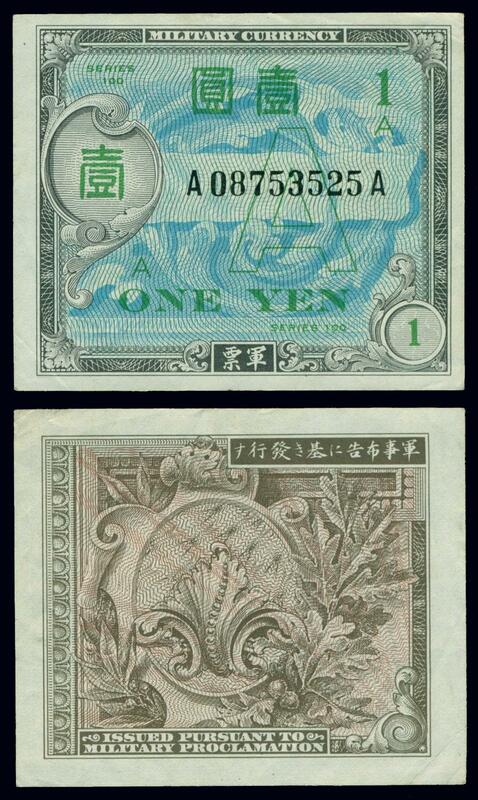 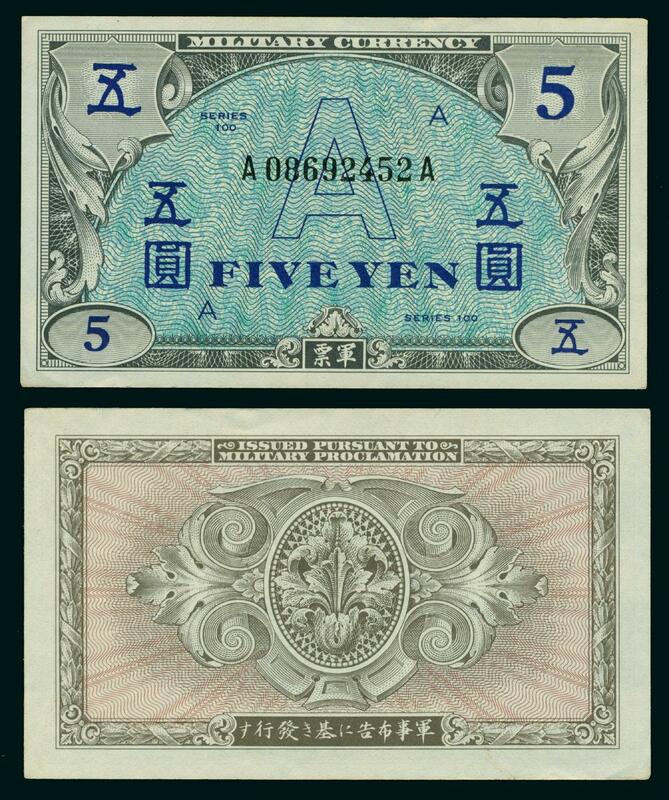 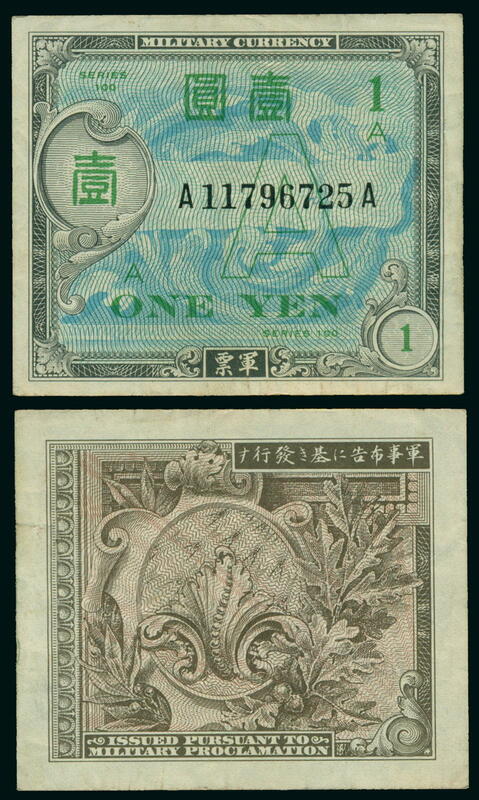 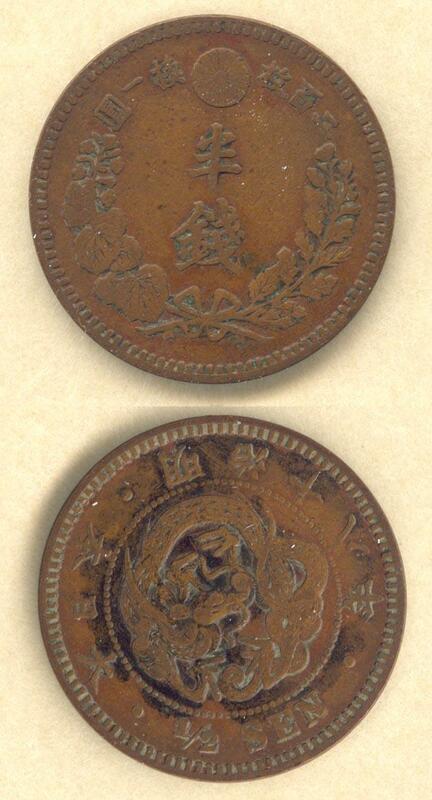 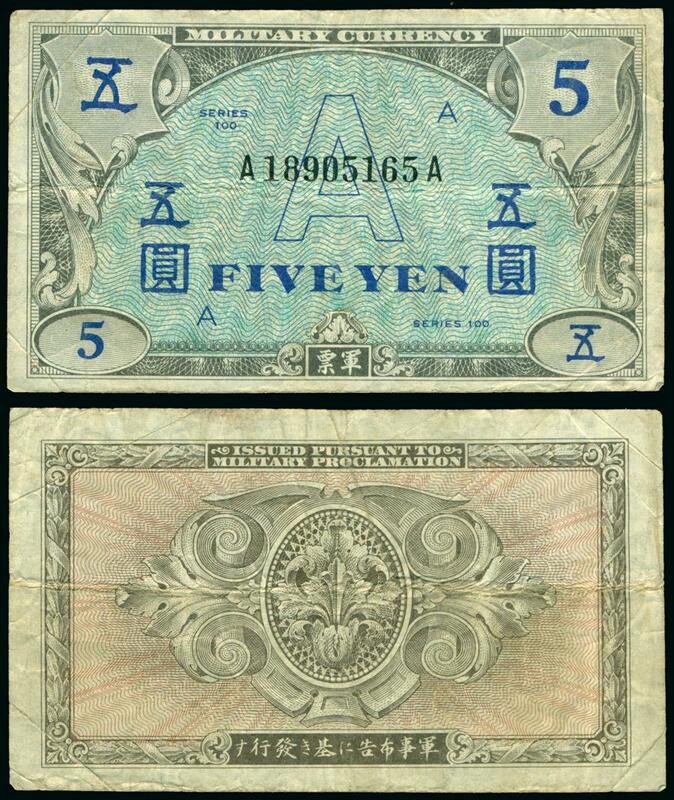 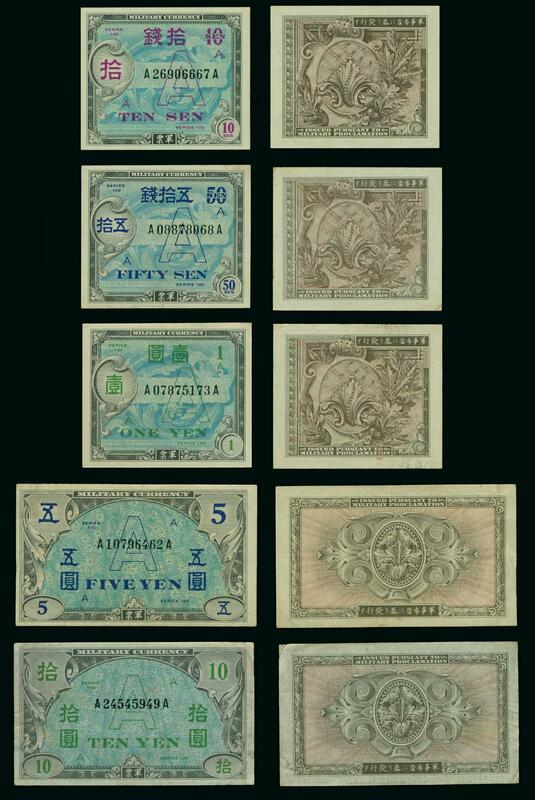 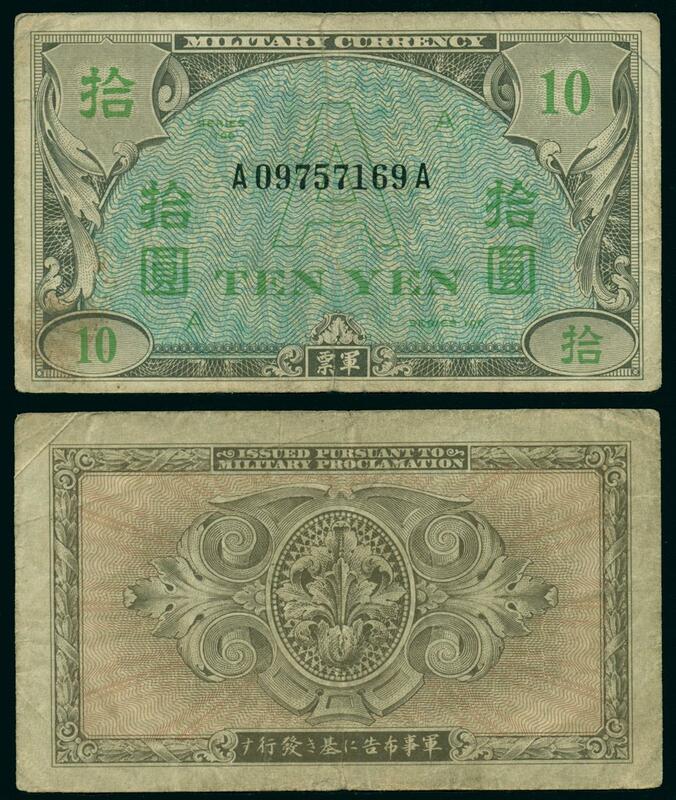 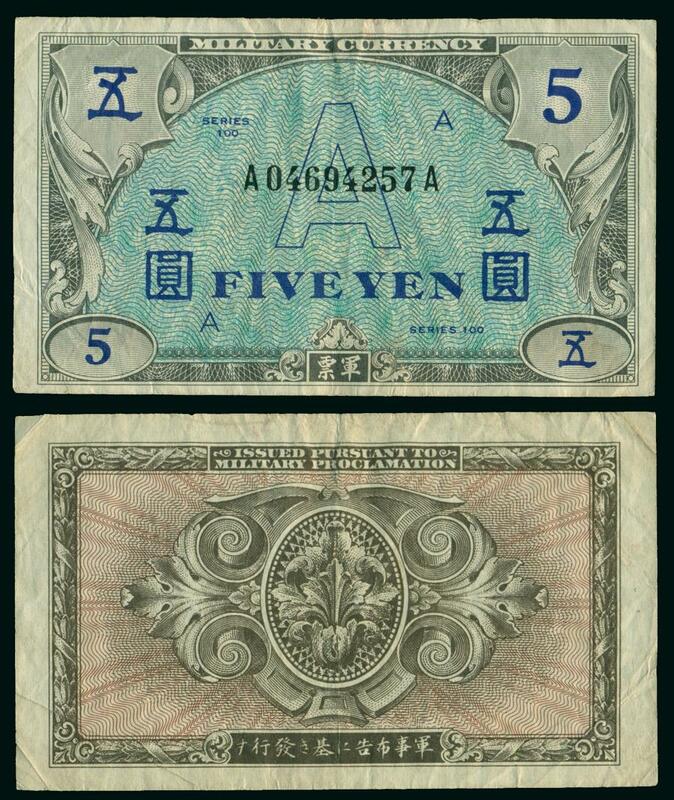 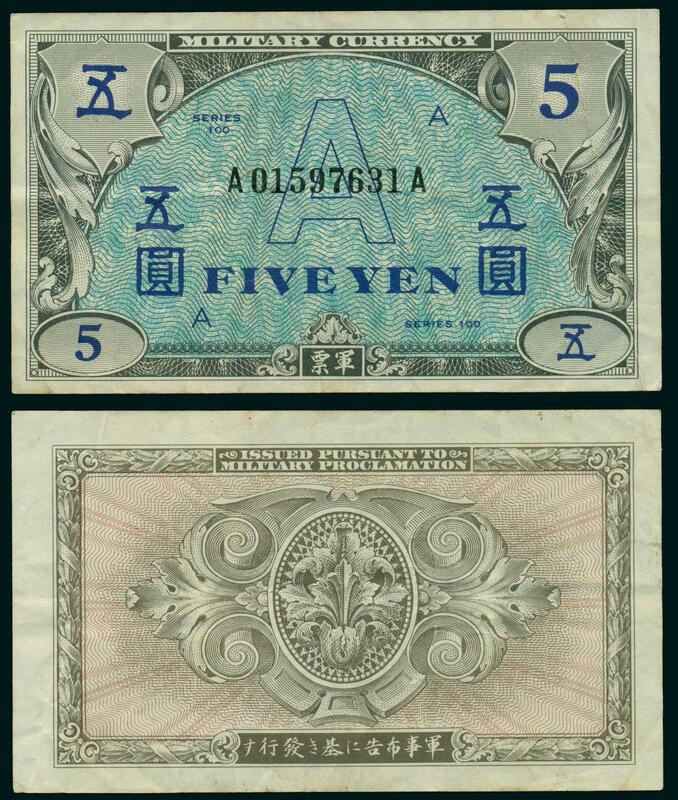 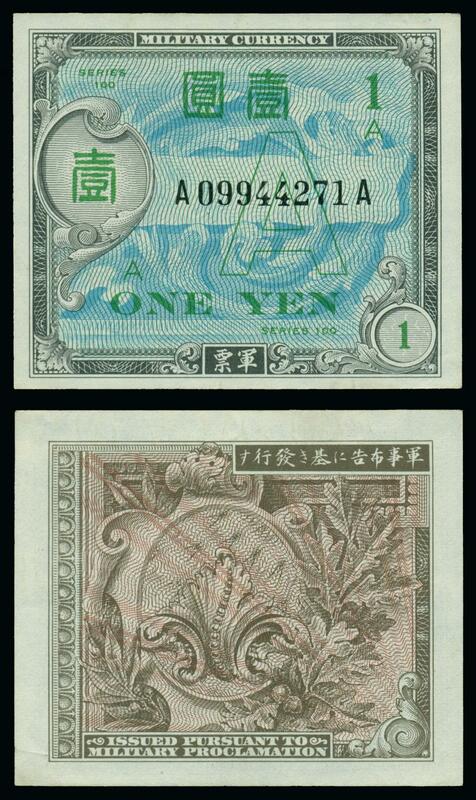 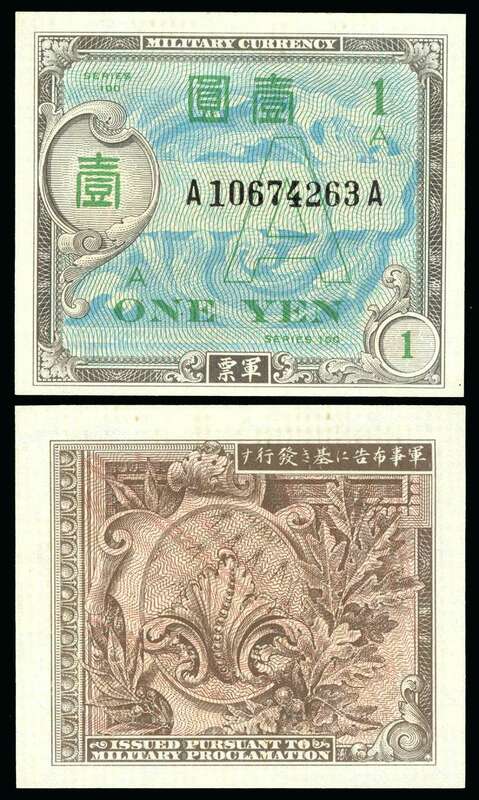 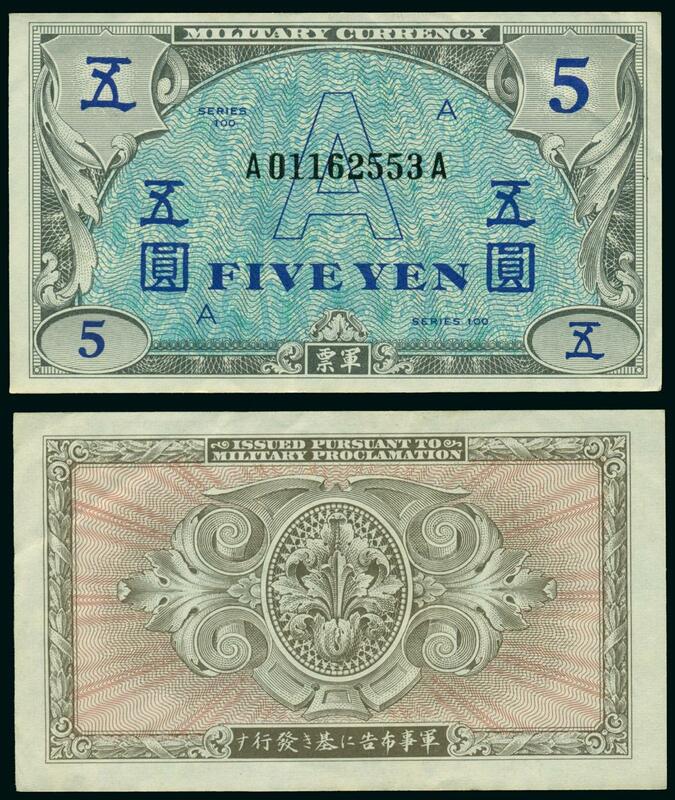 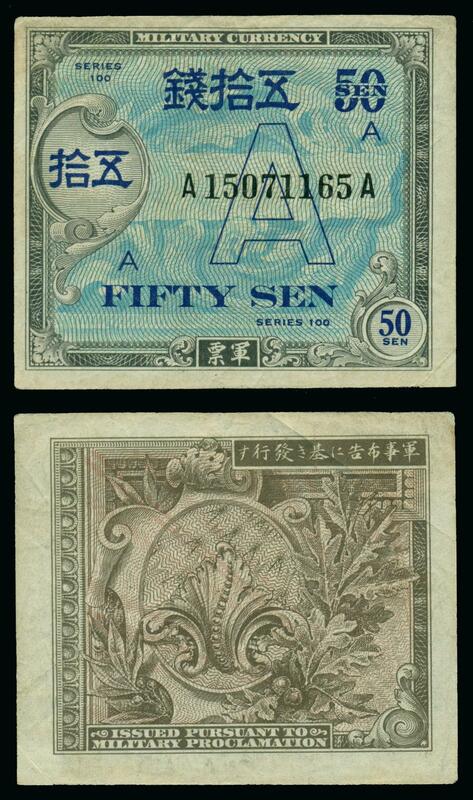 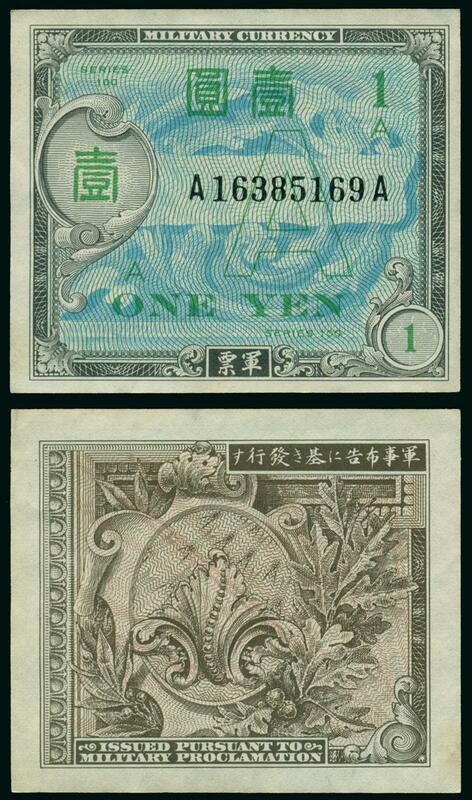 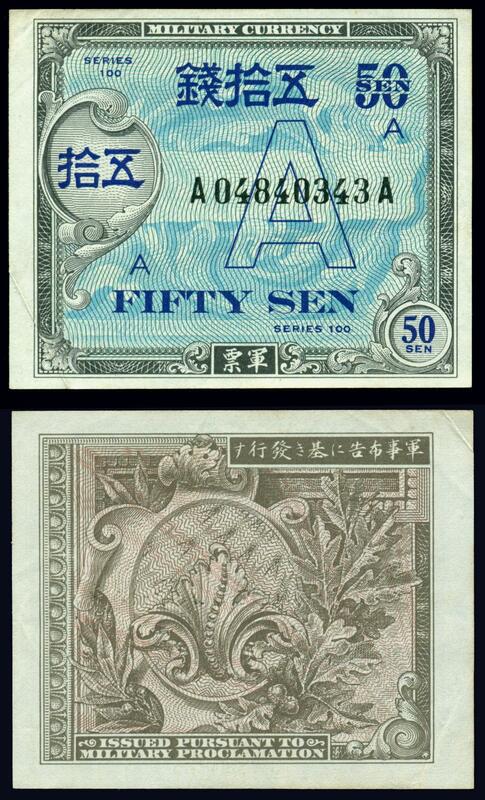 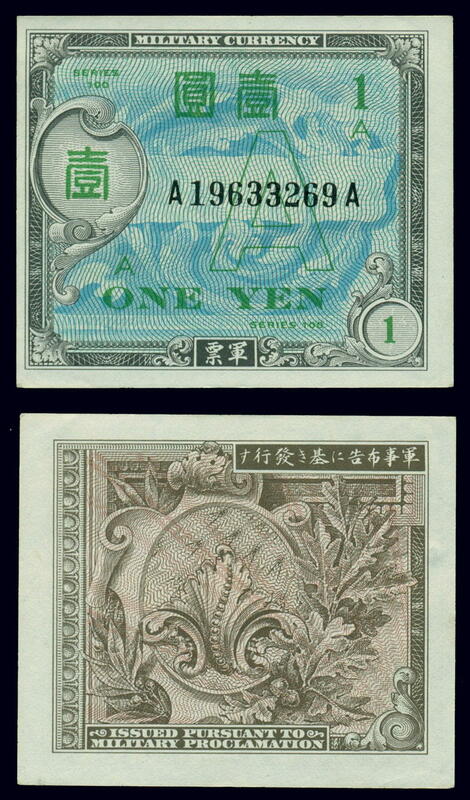 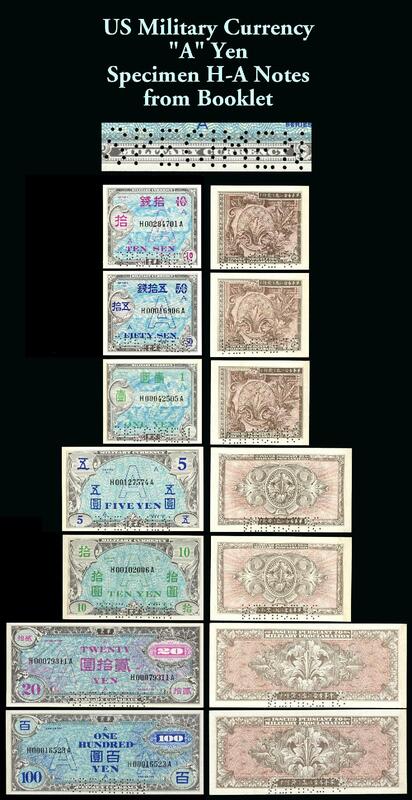 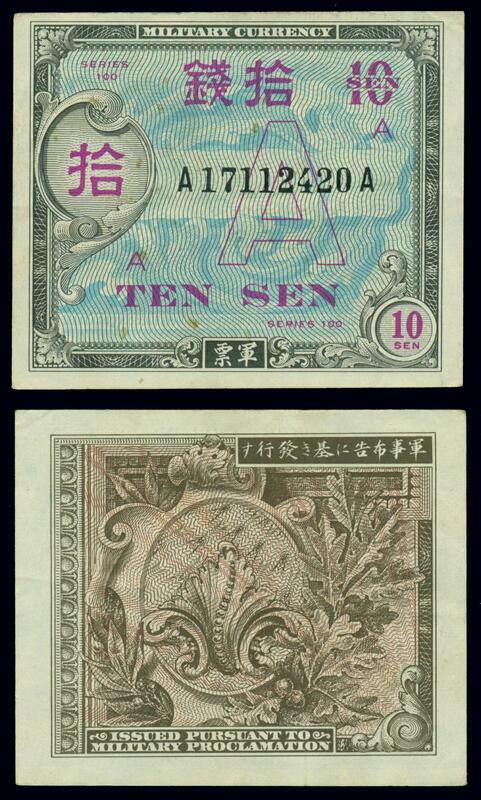 Specimens of "A" Yen  (all 7 denominations). 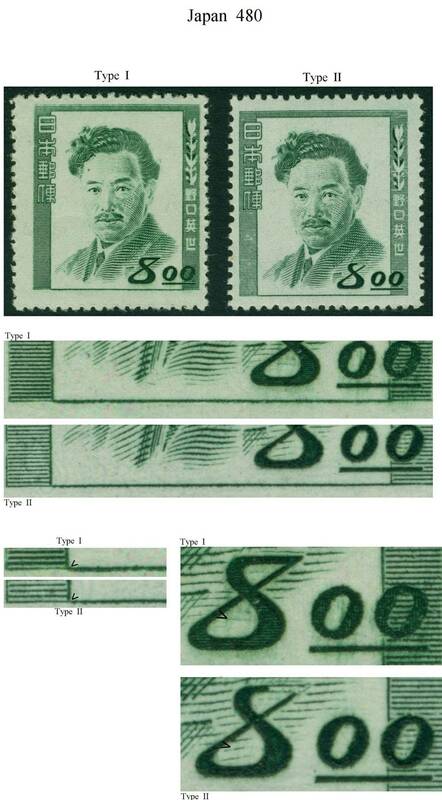 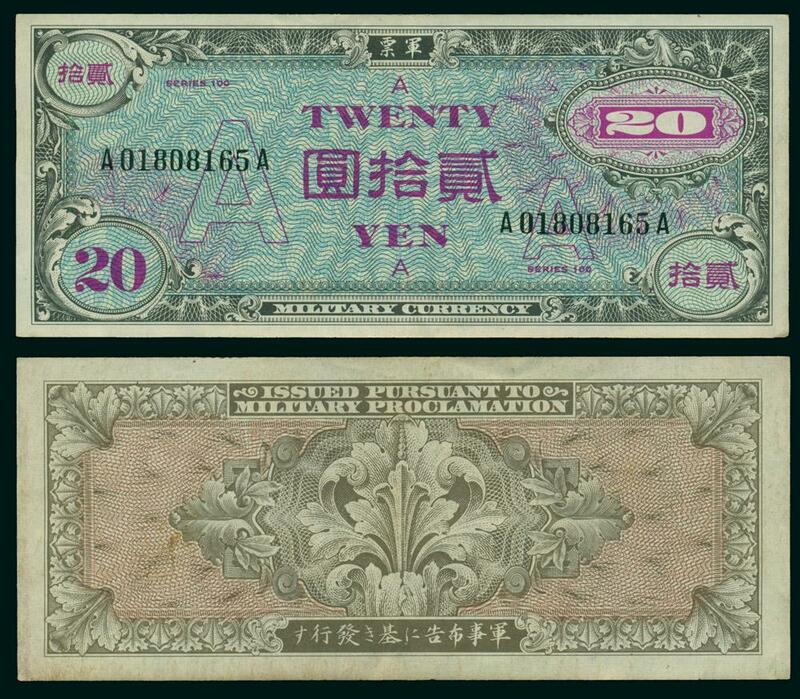 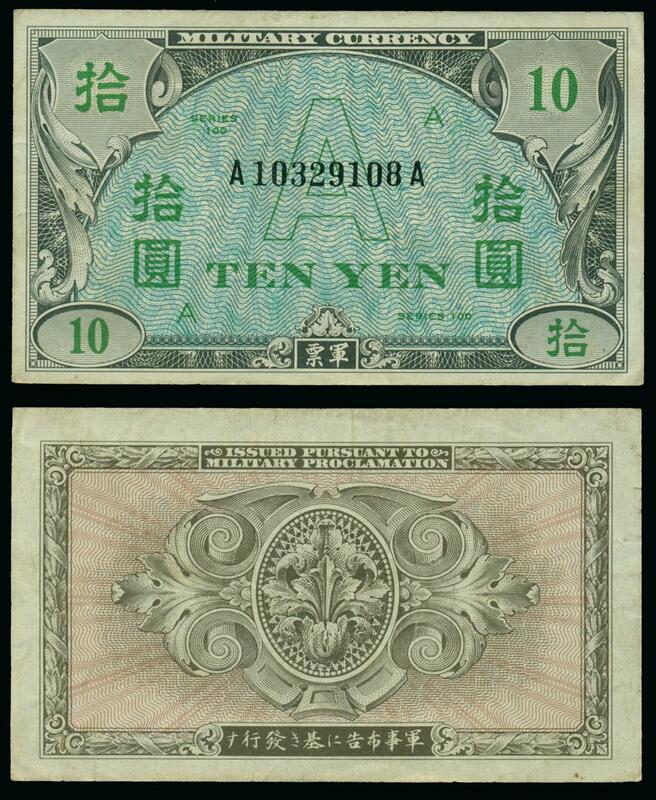 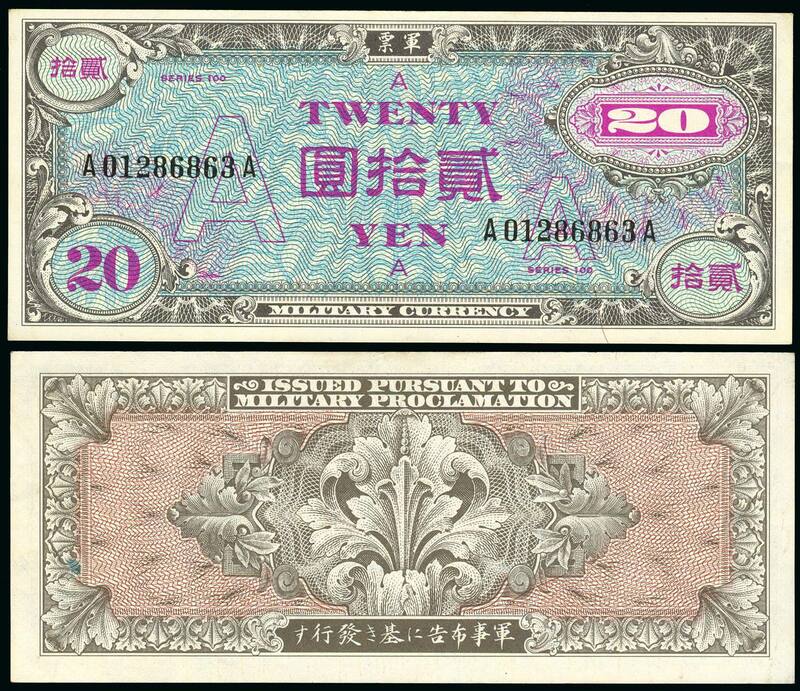 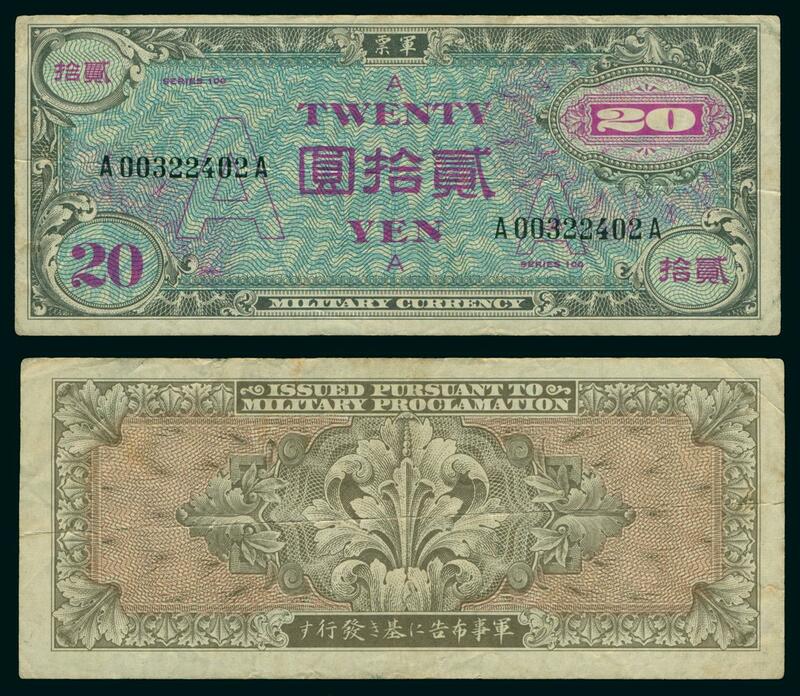 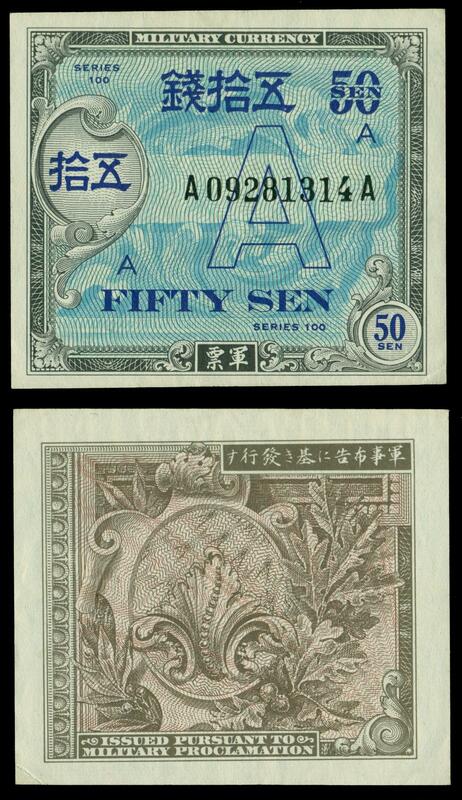 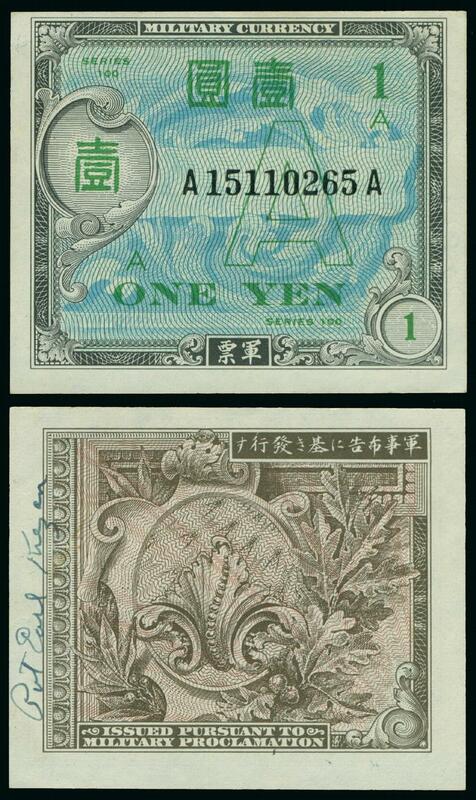 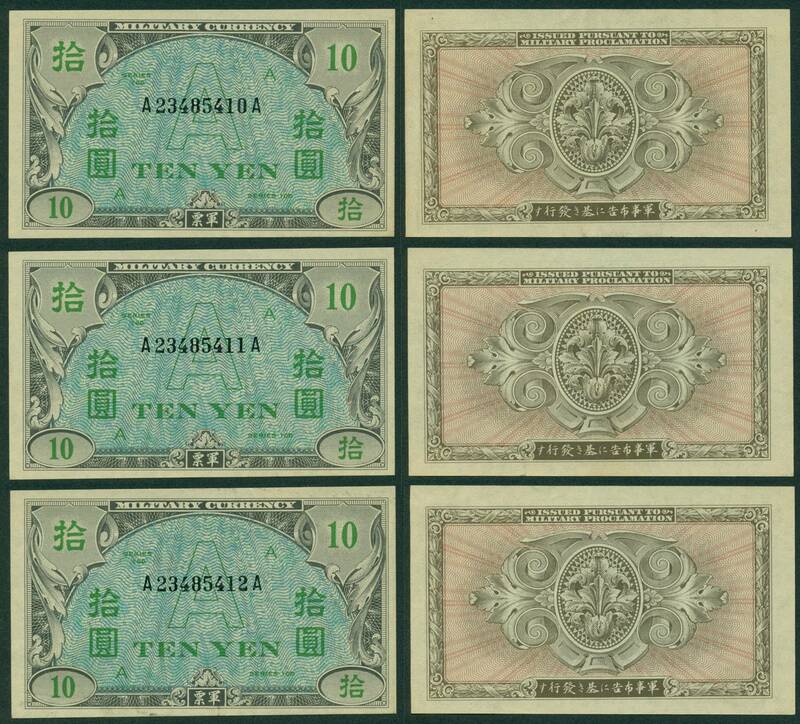 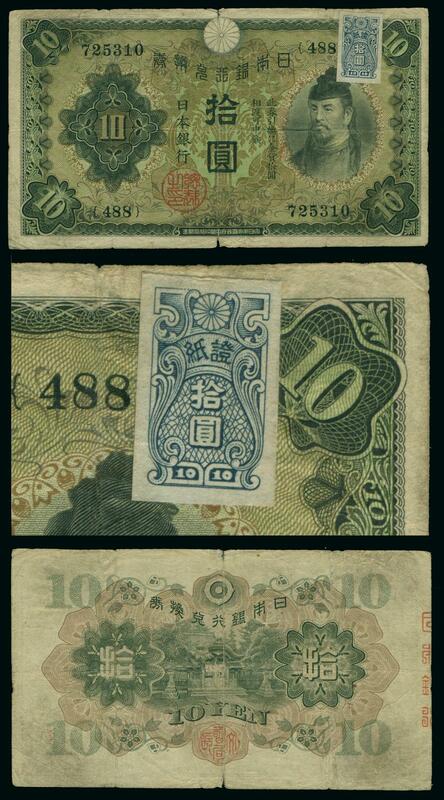 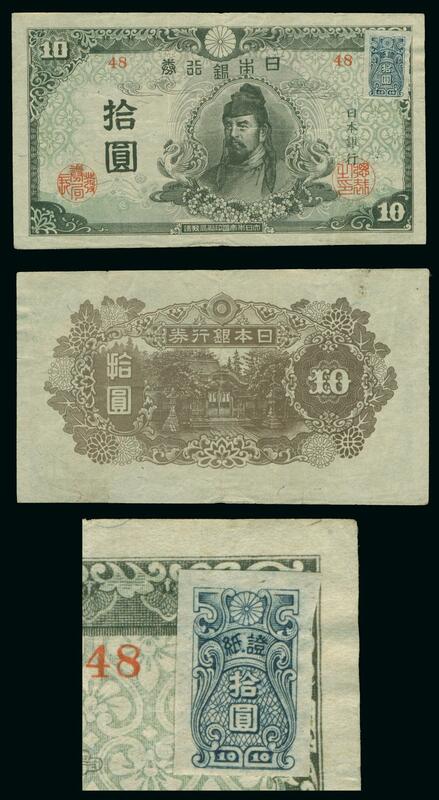 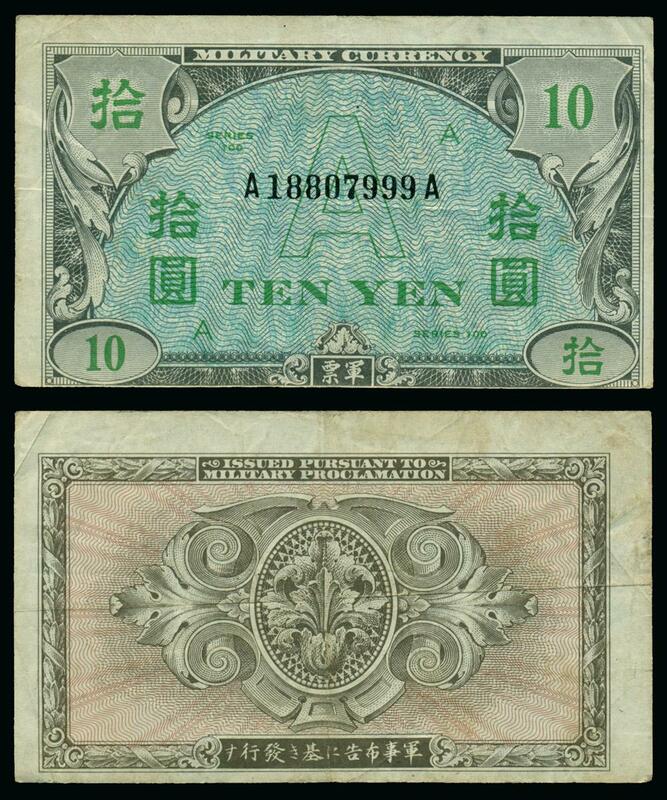 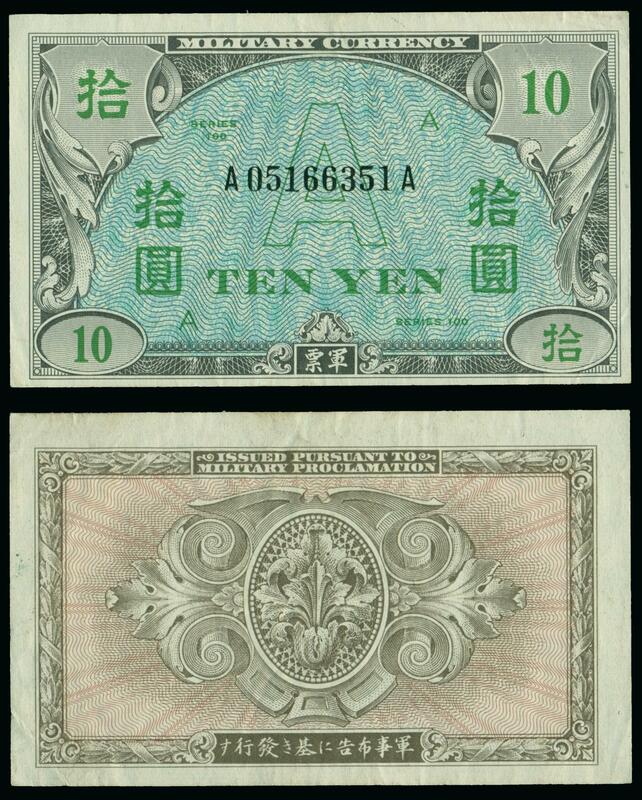 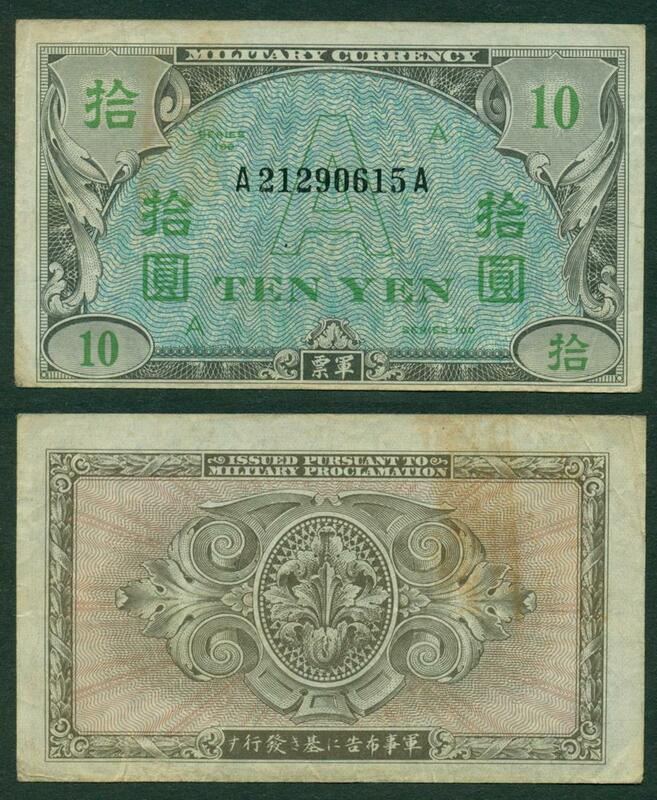 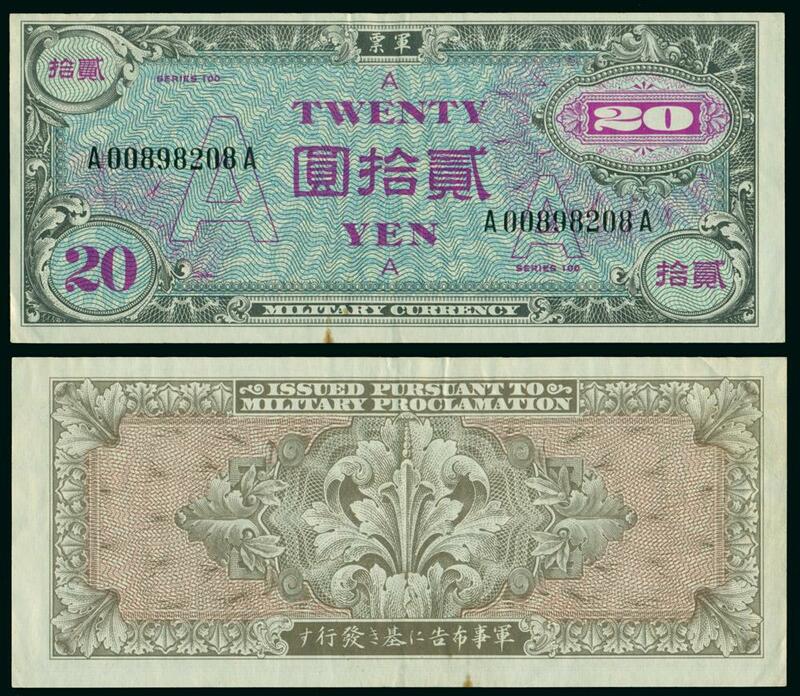 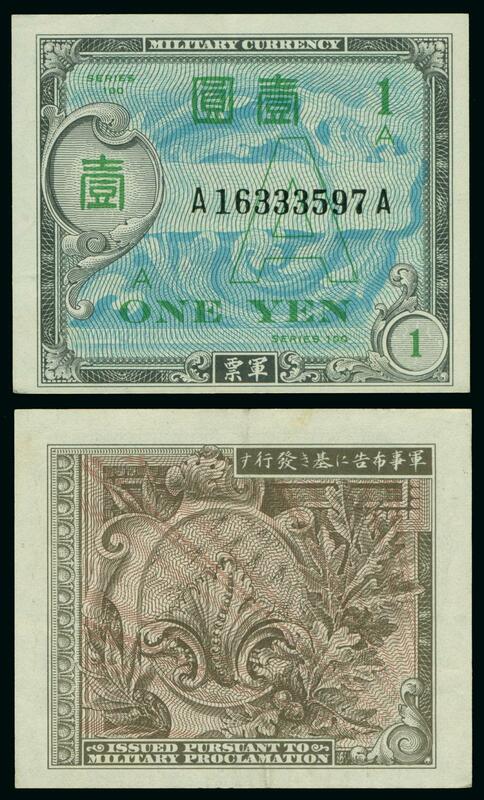 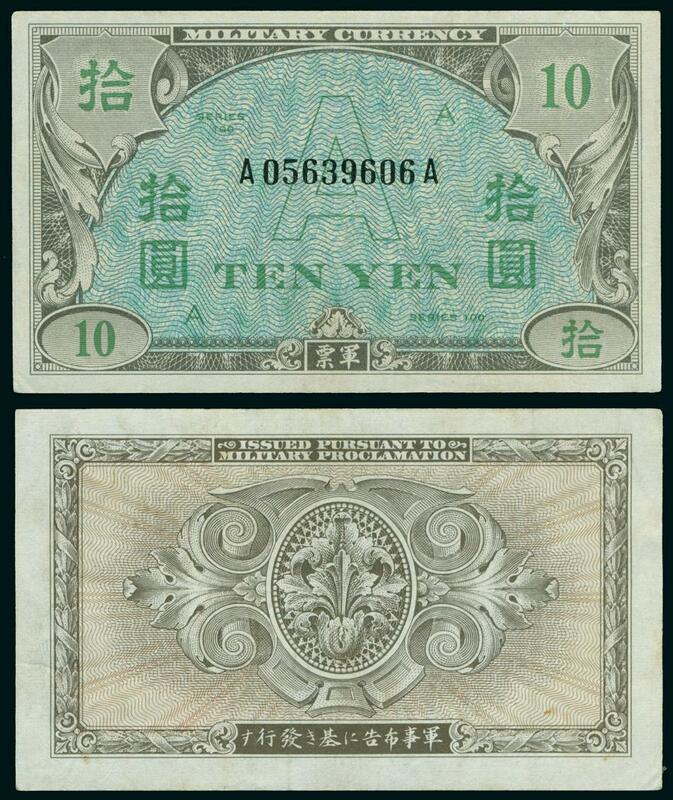 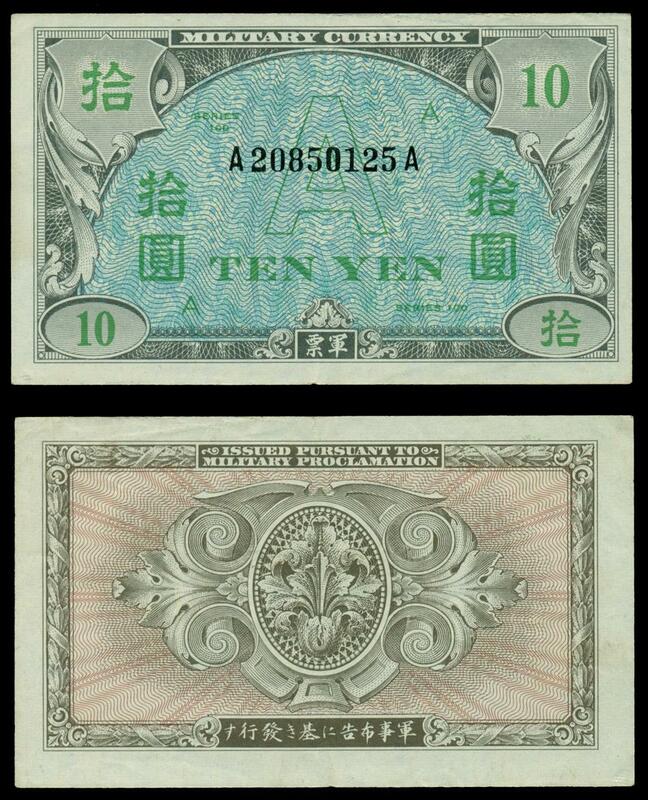 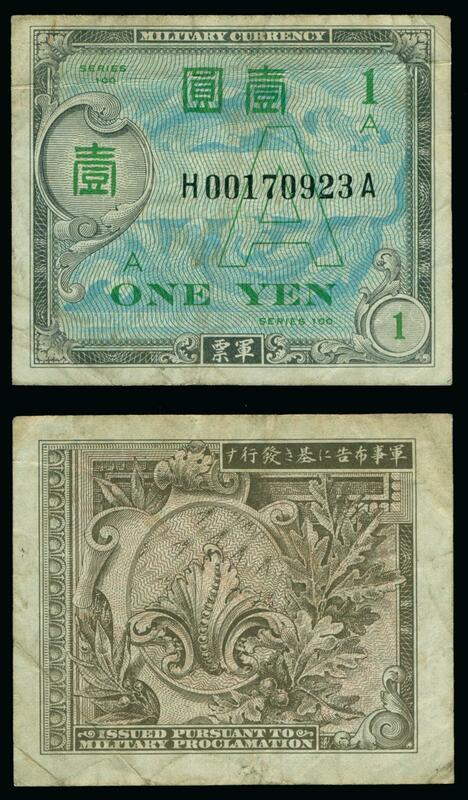 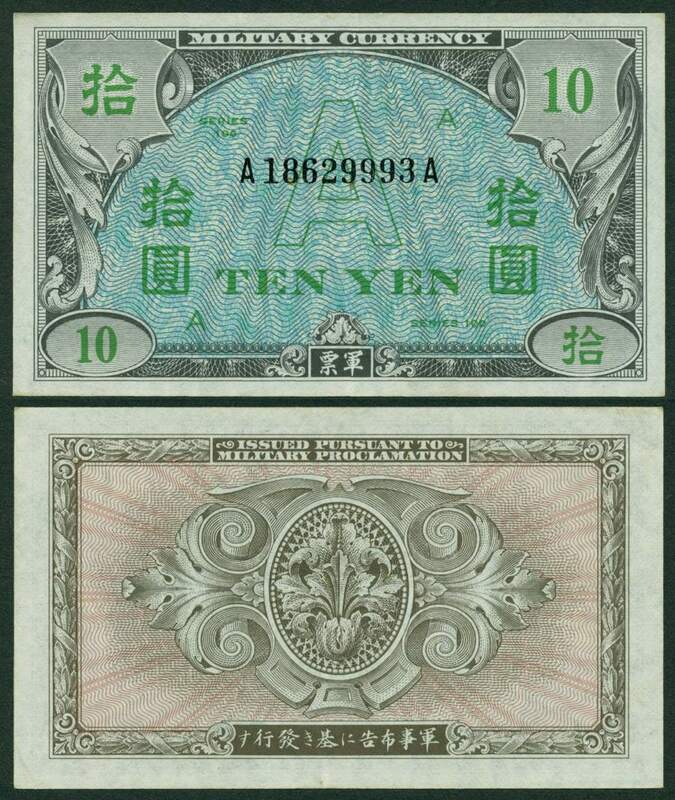 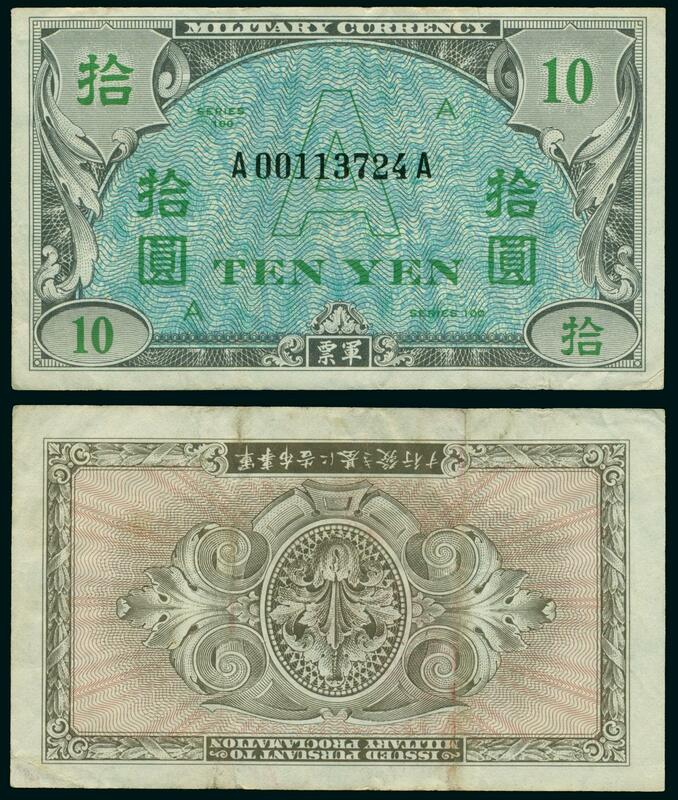 use on pre-WWII Japanese bank notes, 10y, 100y, 200y and 1000y - all specimens. 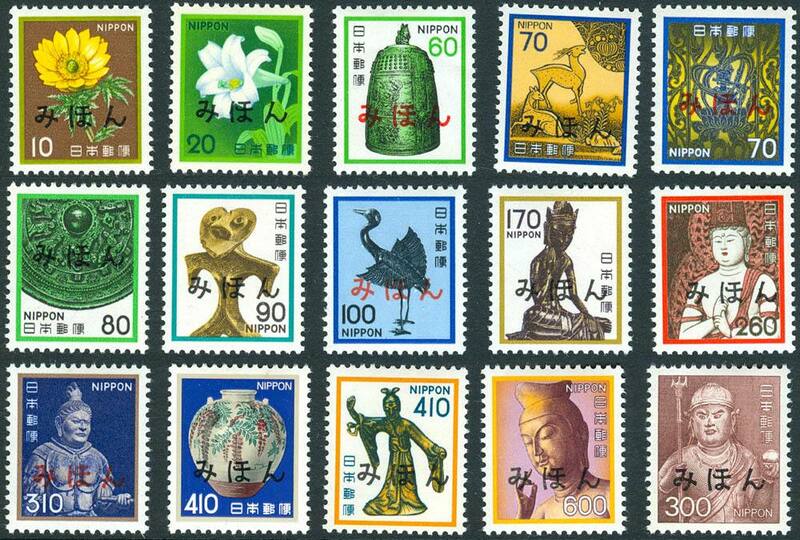 Korea and other Far East countries. 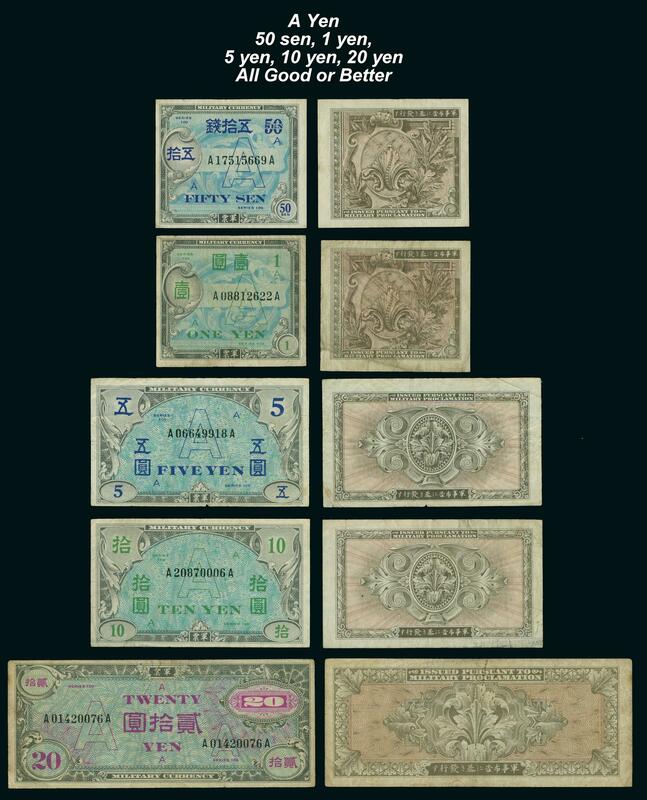 If you have material to sell lets talk. 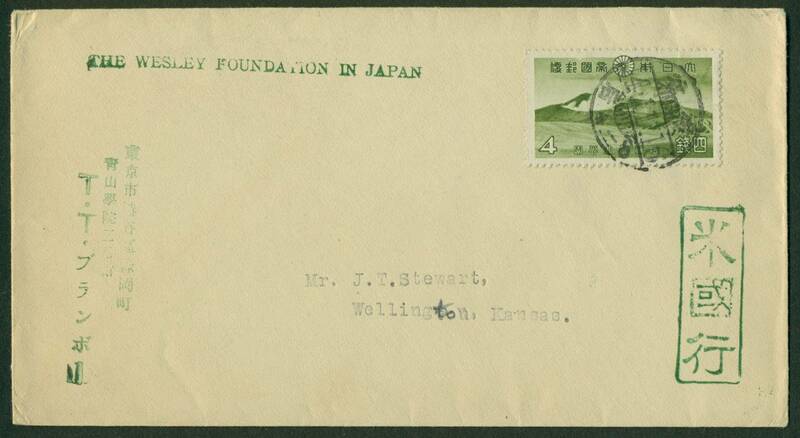 Click here for lithographs and books regarding the Perry Expedition to Japan and Okinawa (1852-4).